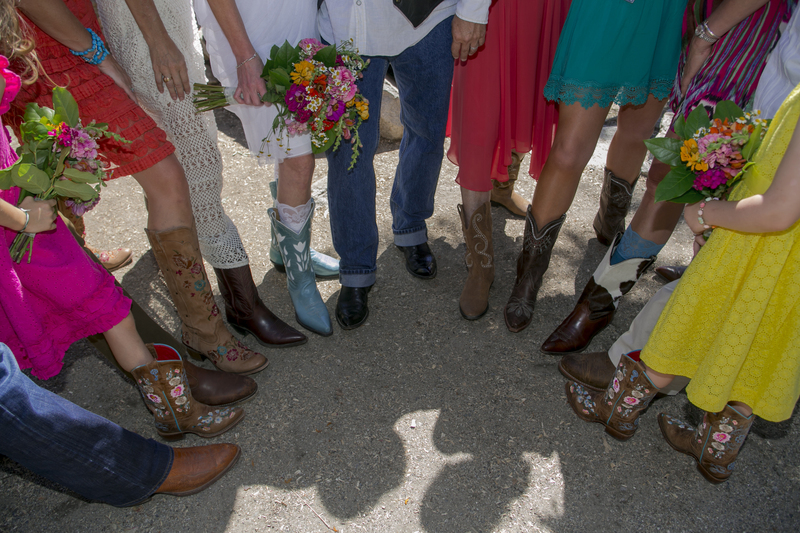 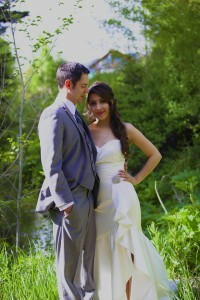 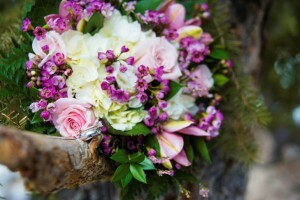 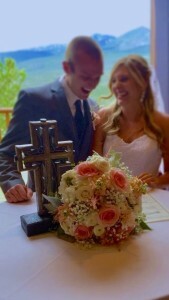 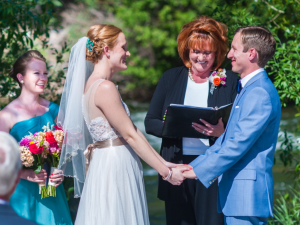 UTAH Weddings: Call, text or email for open dates! From the moment I sent that first email, until our last communication, she was completely professional, clear, and kind. 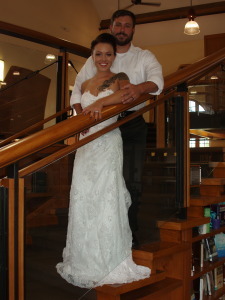 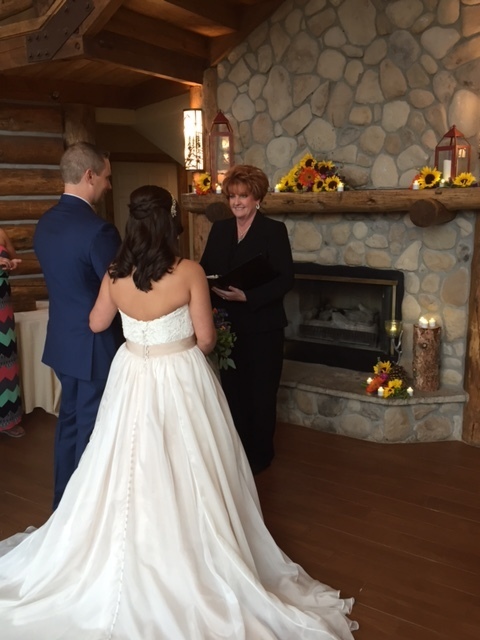 My new husband and I loved the service she was able to provide for us. 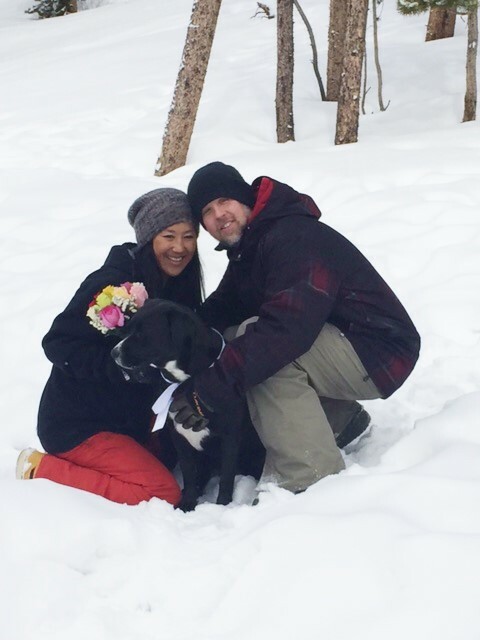 We are so thankful and grateful that we found her. I cannot say enough good things about Julie and her service. 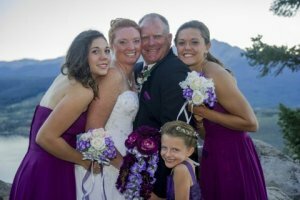 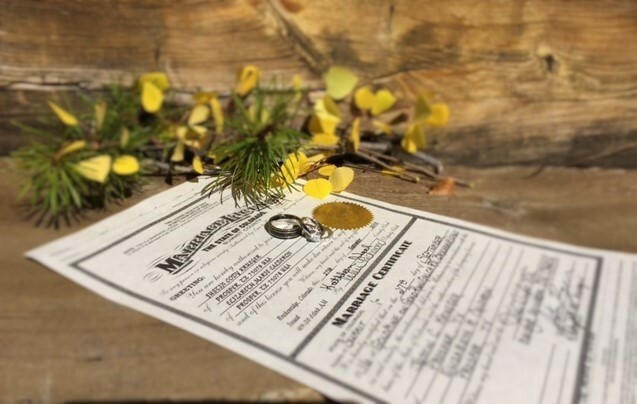 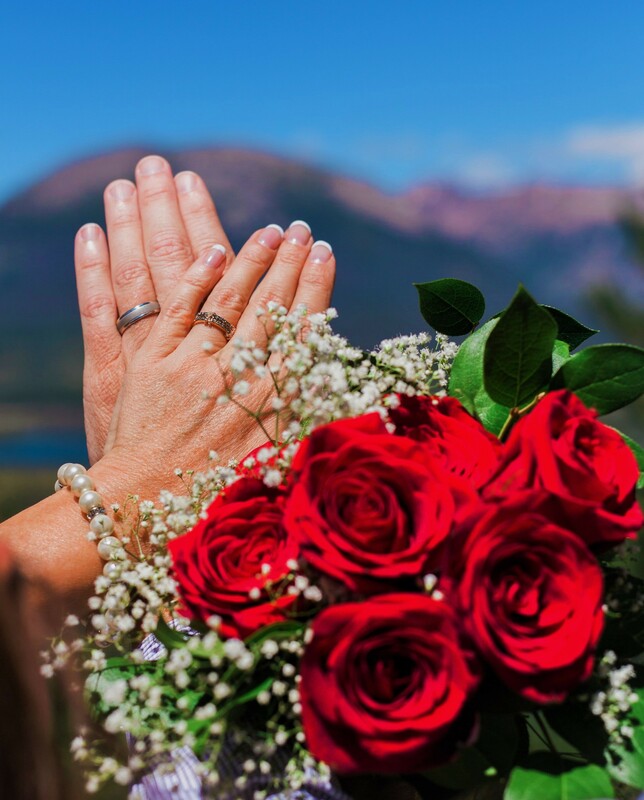 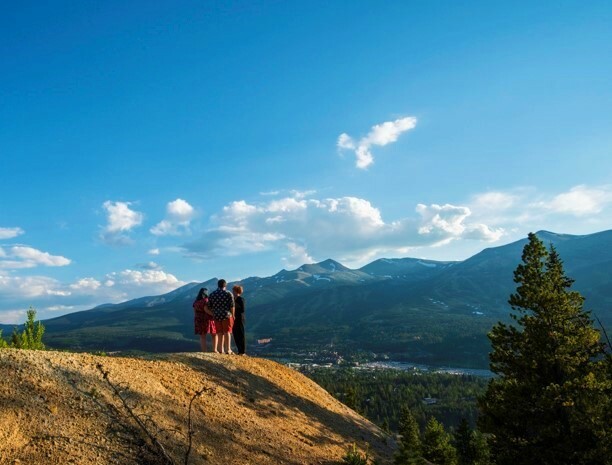 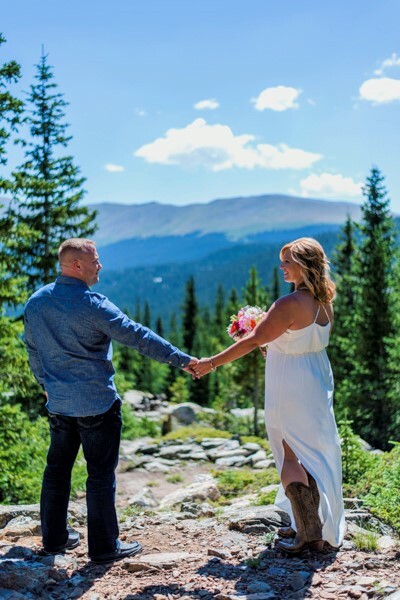 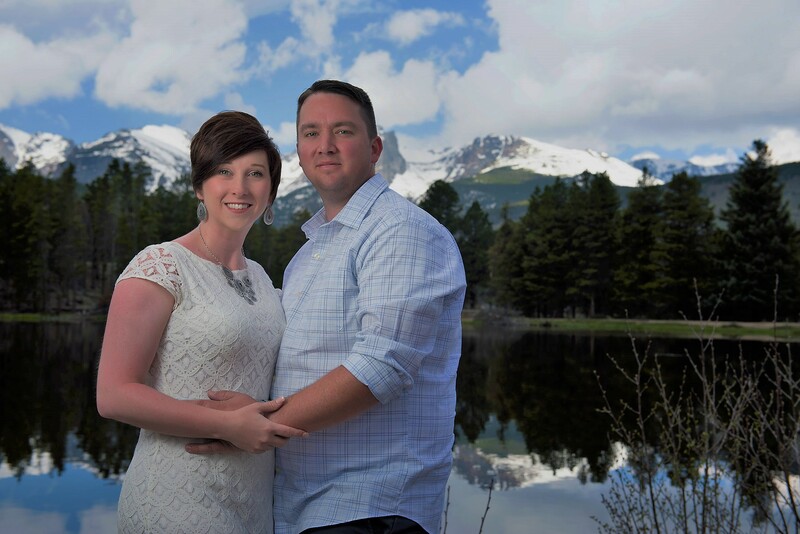 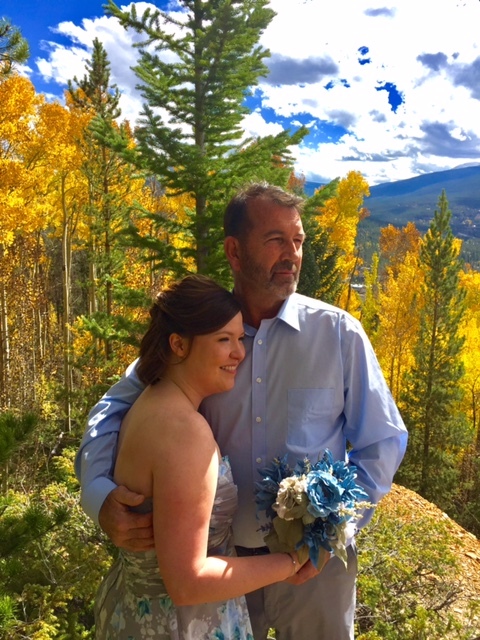 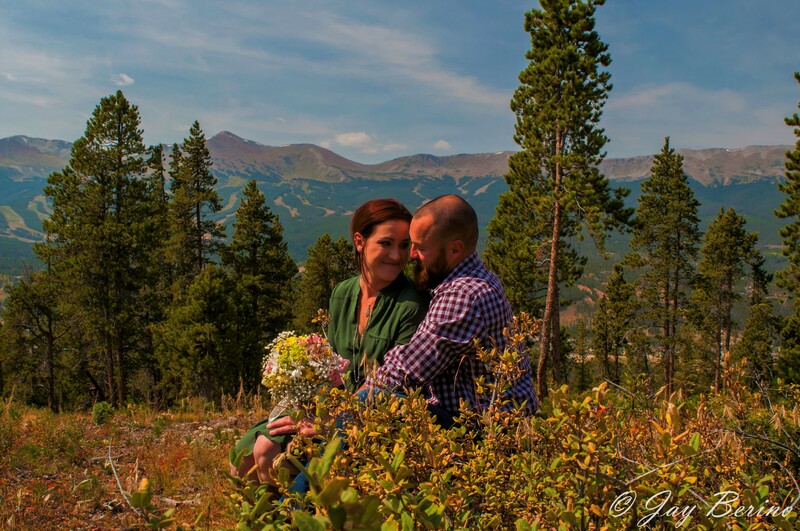 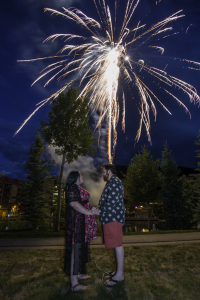 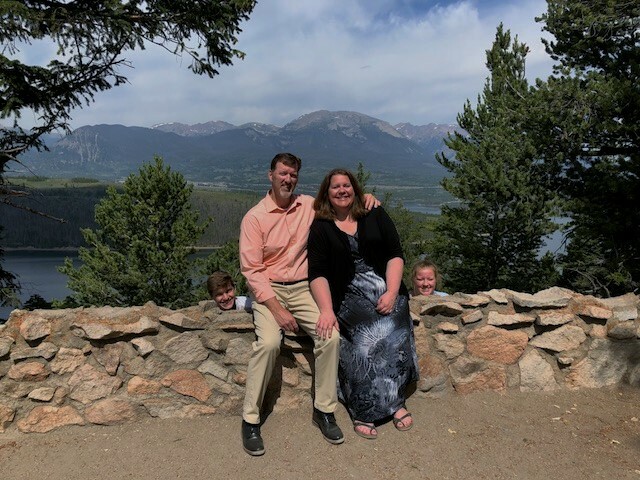 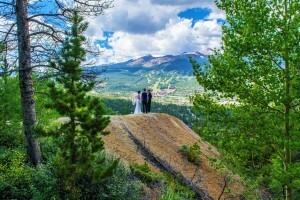 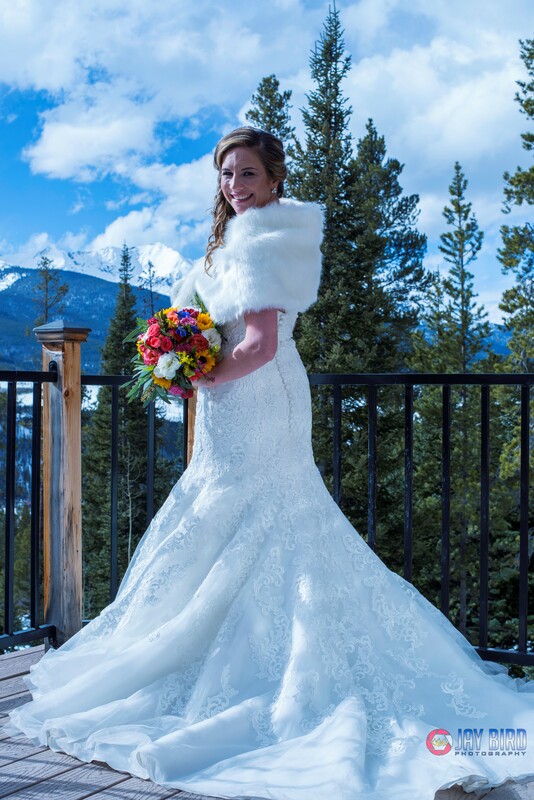 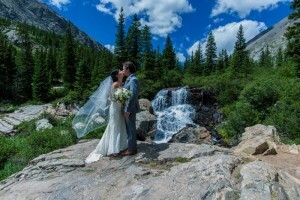 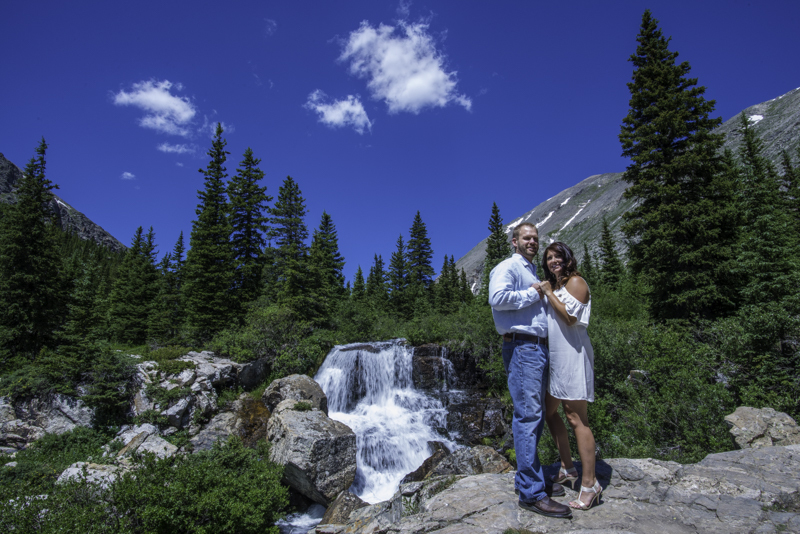 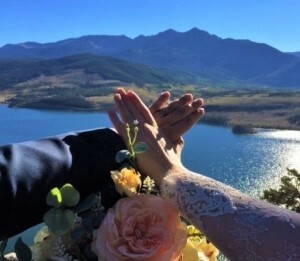 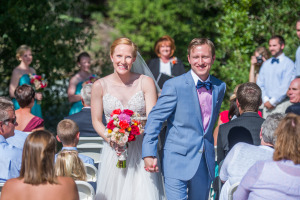 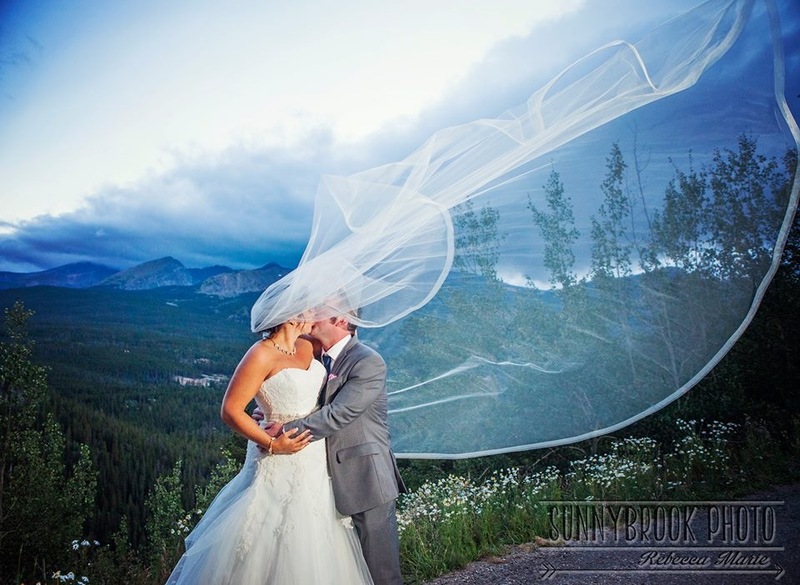 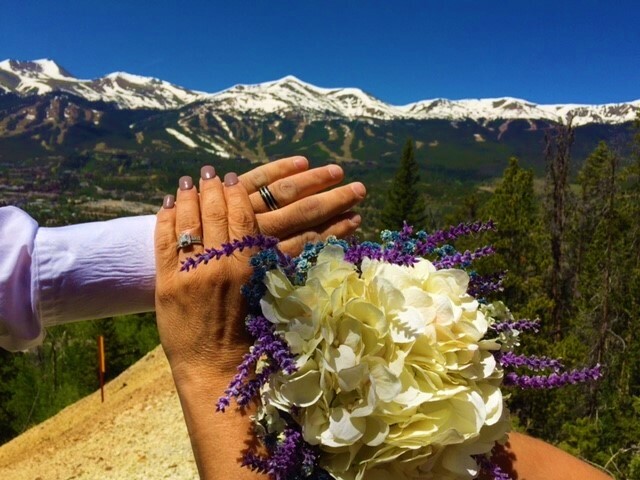 If you’re looking to get married in Breckenridge or the surrounding area, and you’re wanting someone who will truly care about you and help you feel special, check Julie out. Trust me, you will not be disappointed. 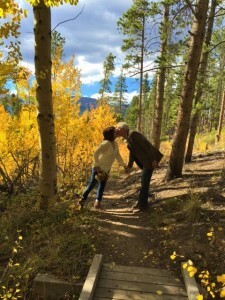 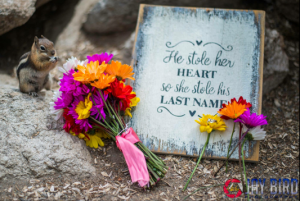 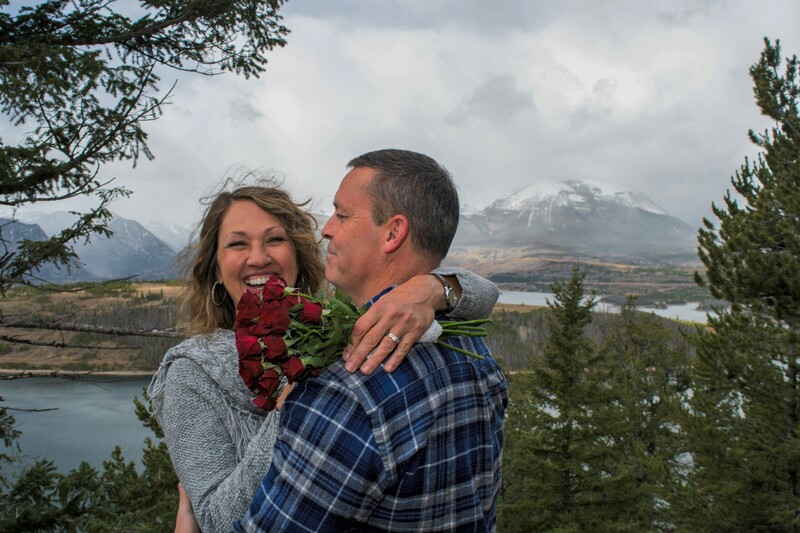 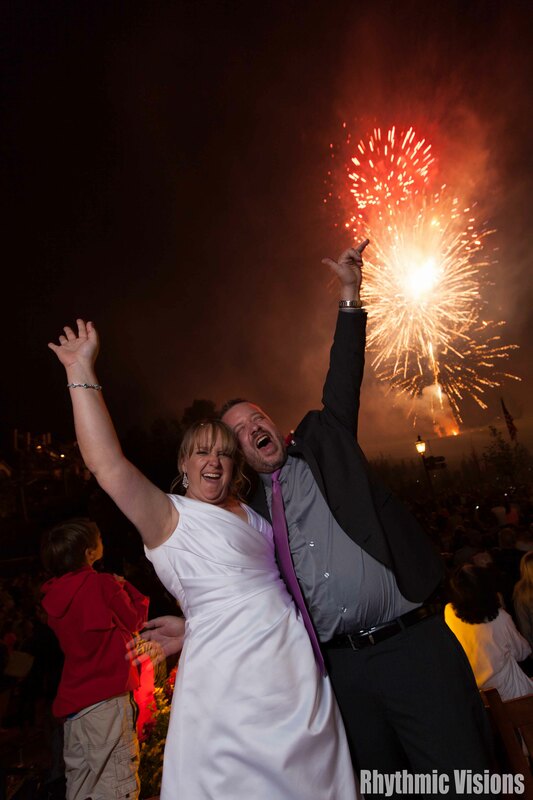 Response from Julie: “Cindy and Rick, I was absolutely delighted to help Rick plan EVERYTHING….. from the date of the proposal…… to the photographer who was on-site to catch the surprise proposal…… to the timing of the ceremony……. 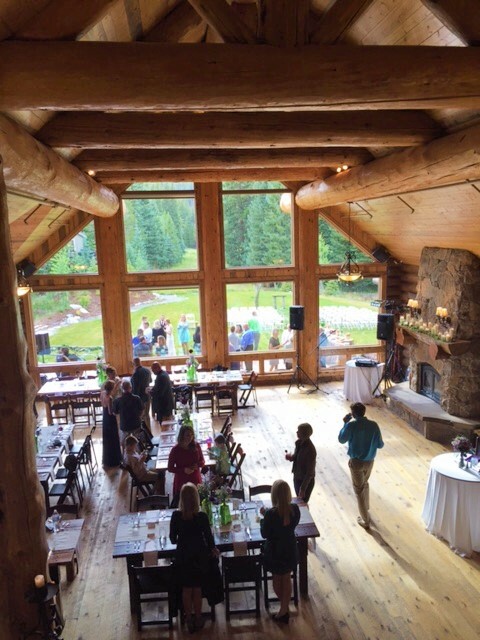 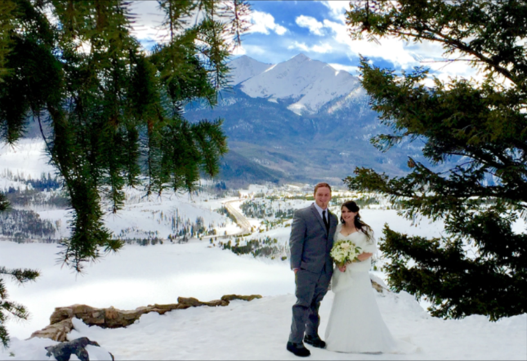 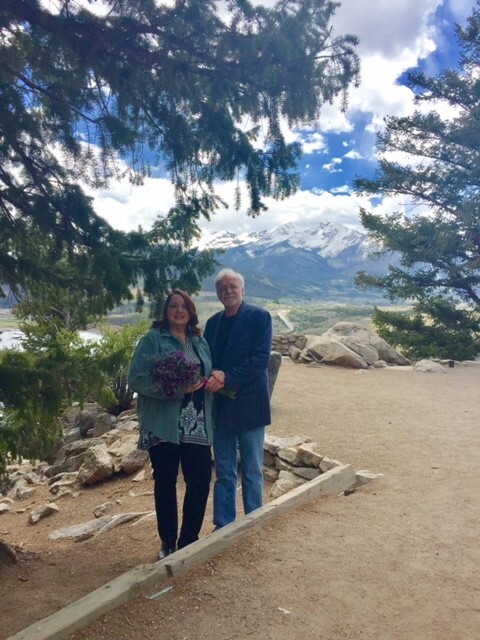 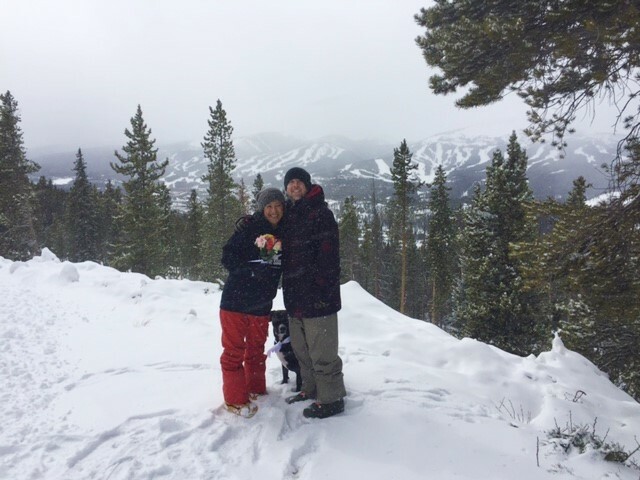 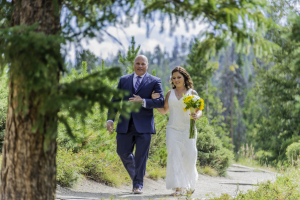 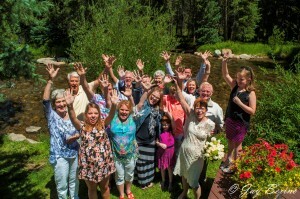 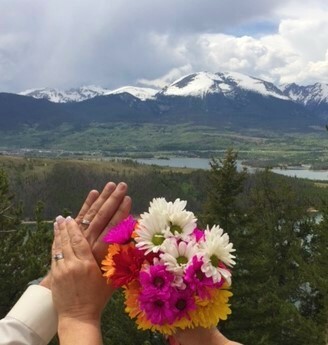 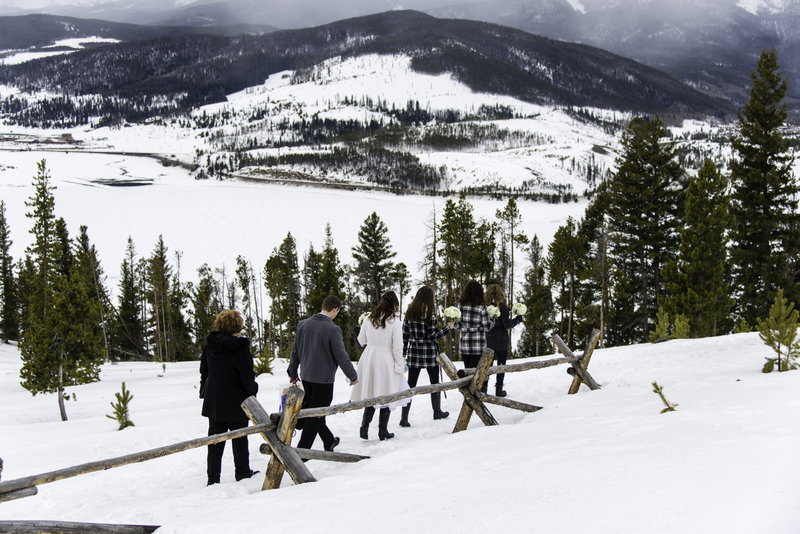 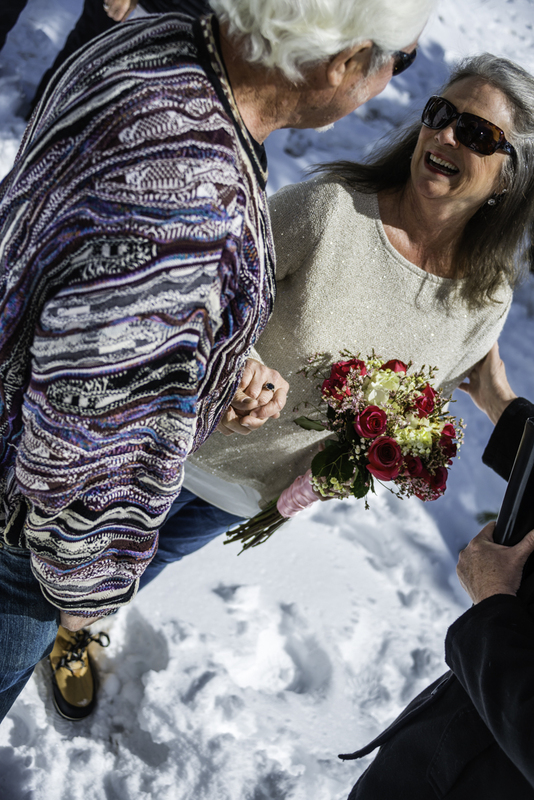 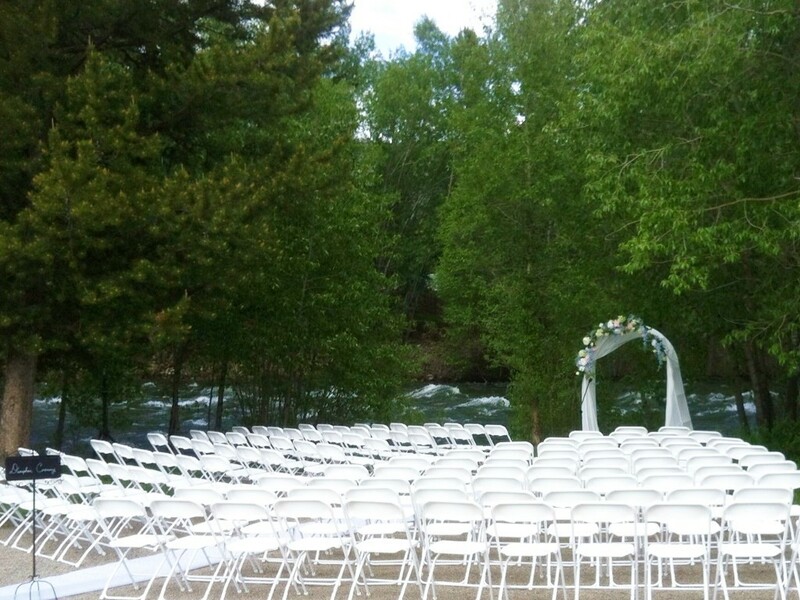 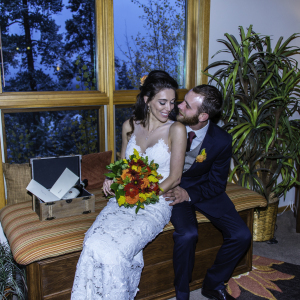 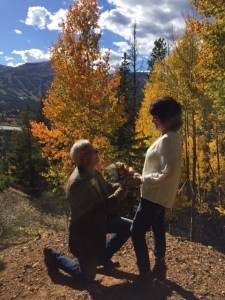 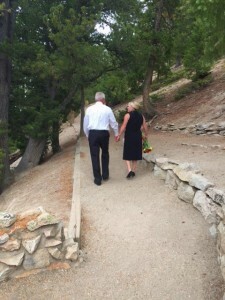 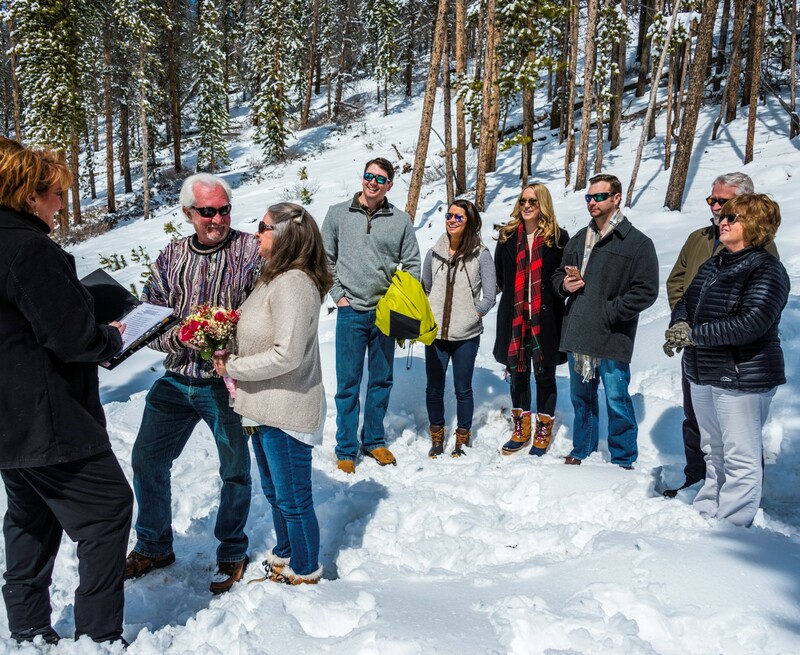 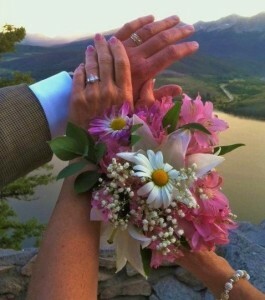 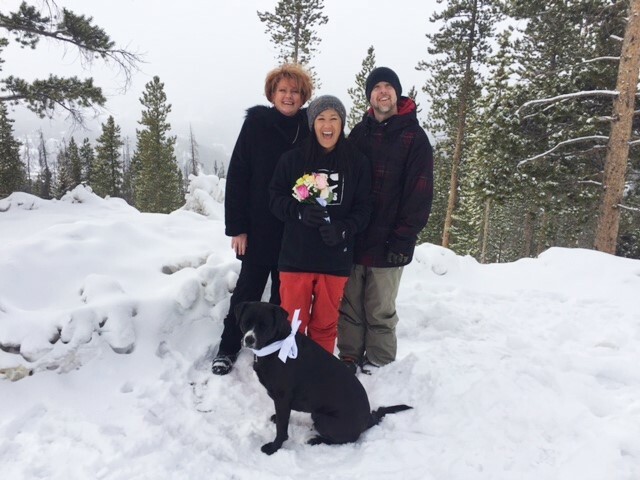 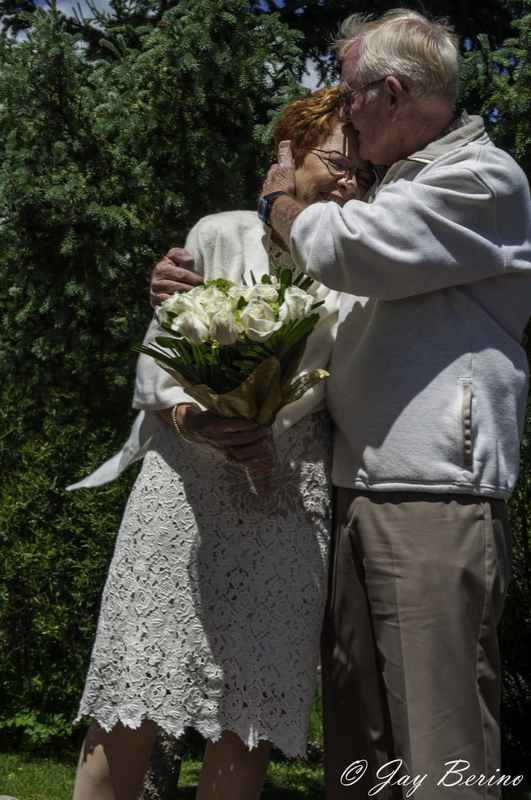 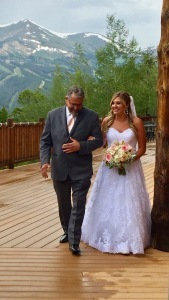 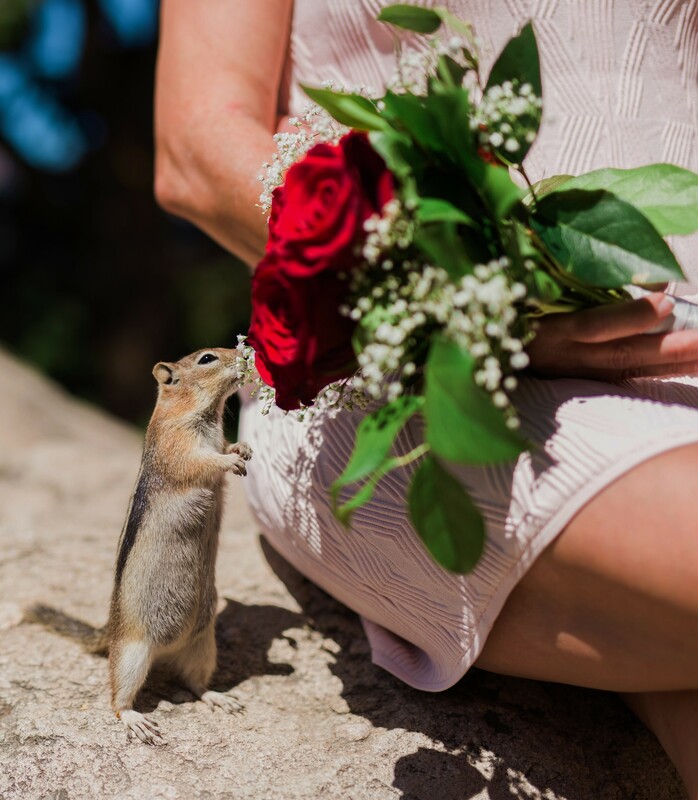 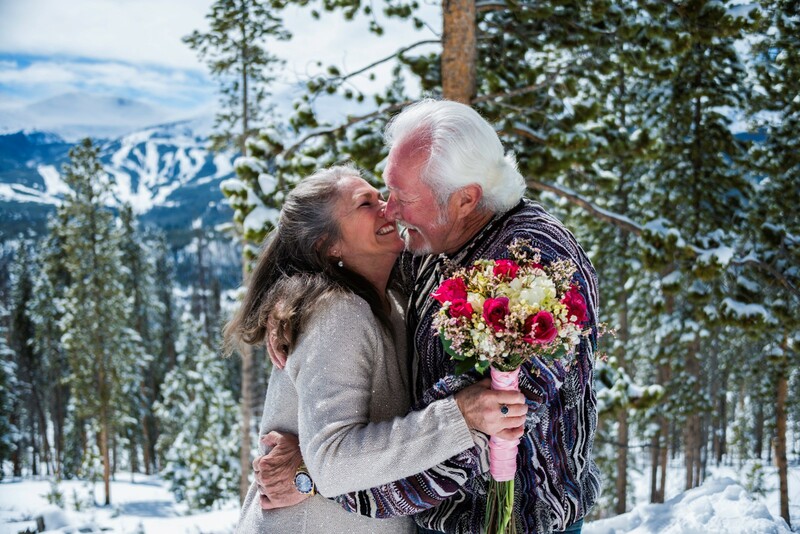 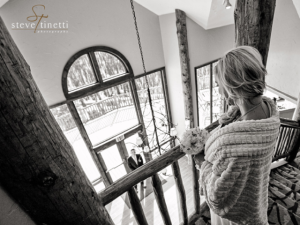 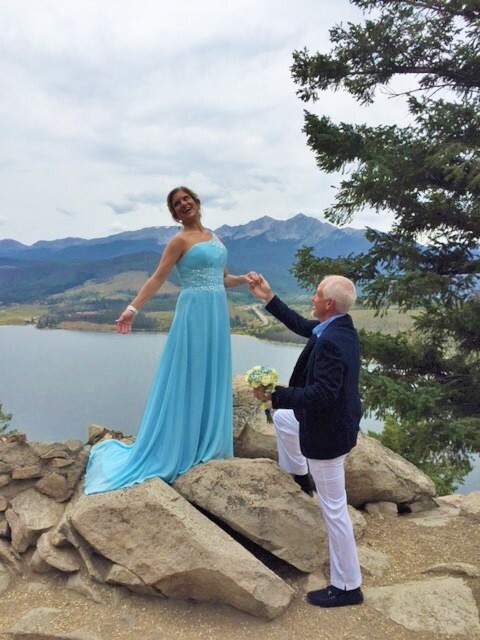 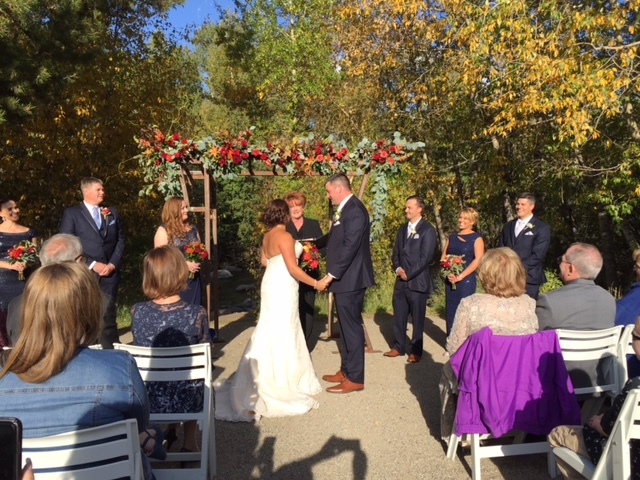 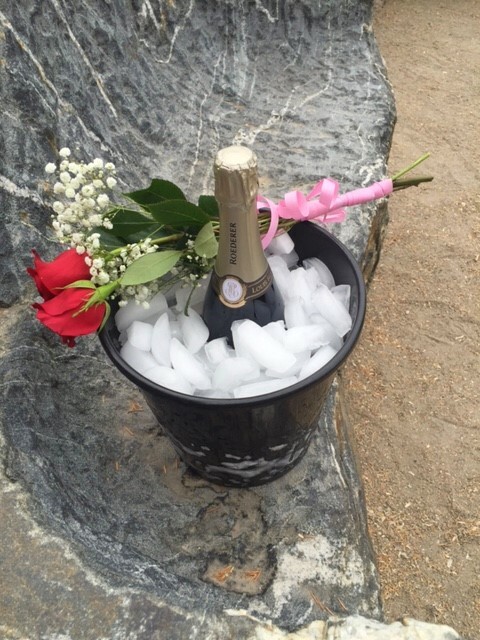 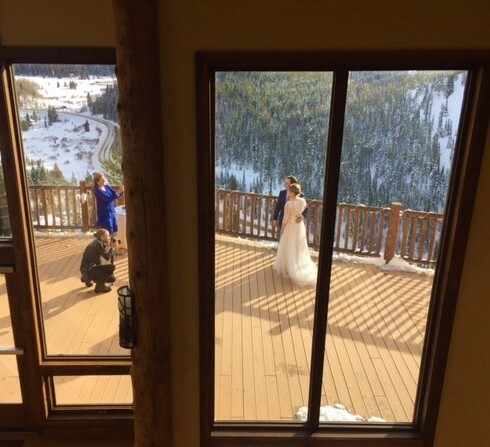 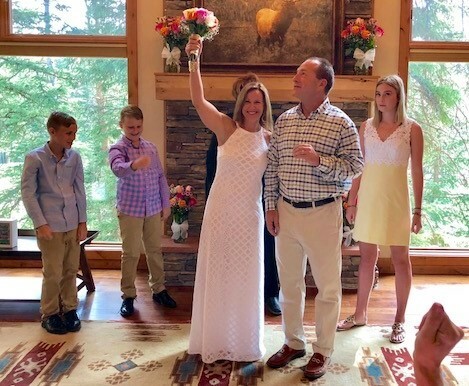 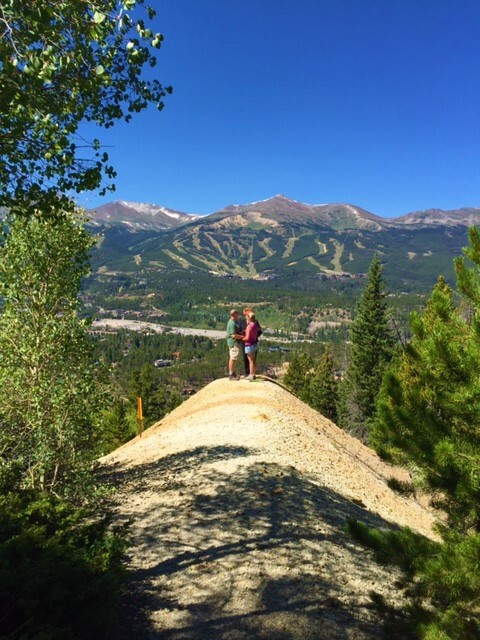 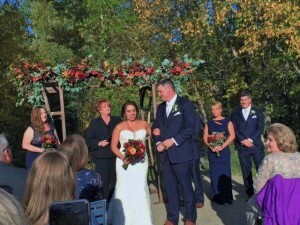 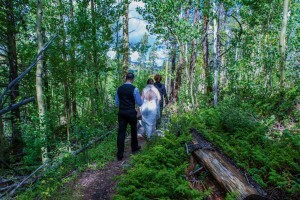 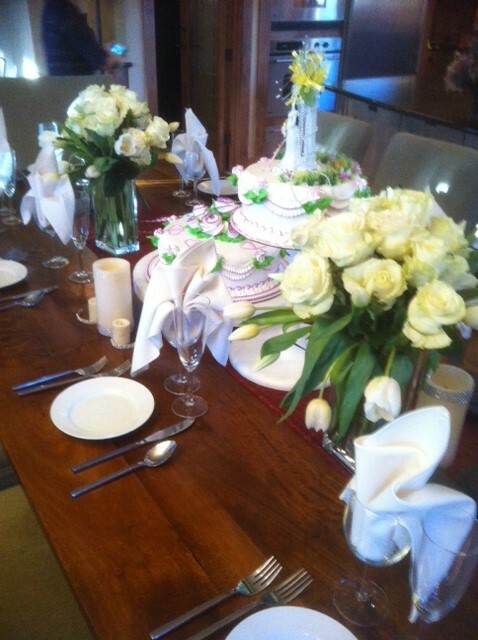 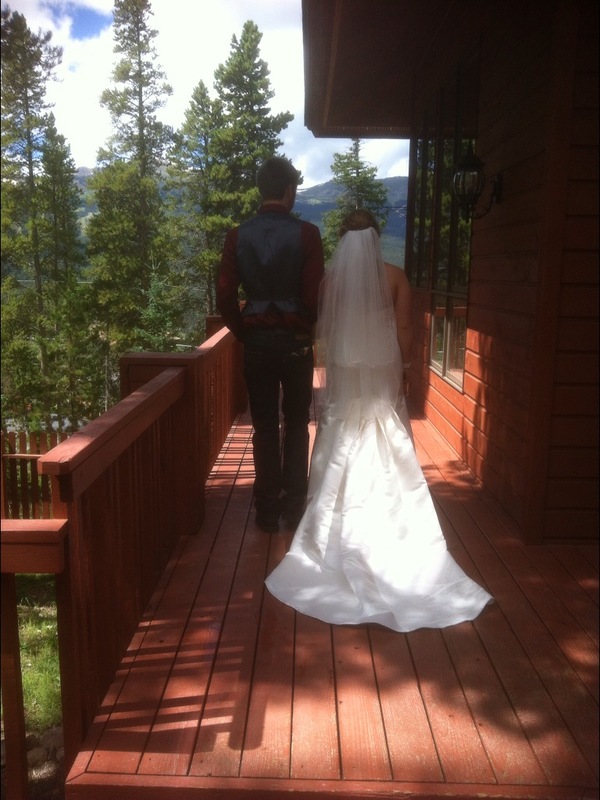 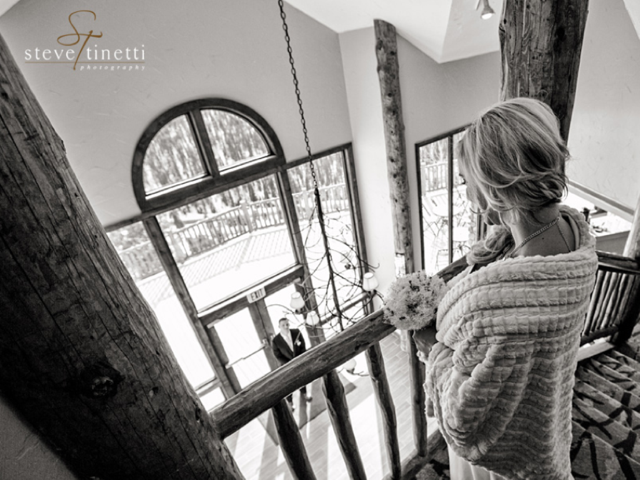 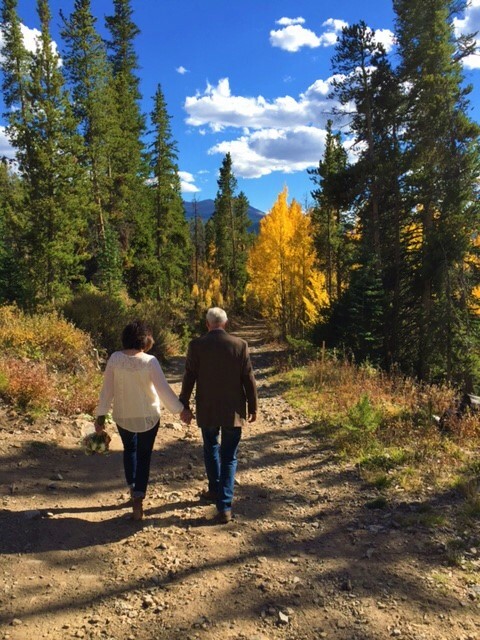 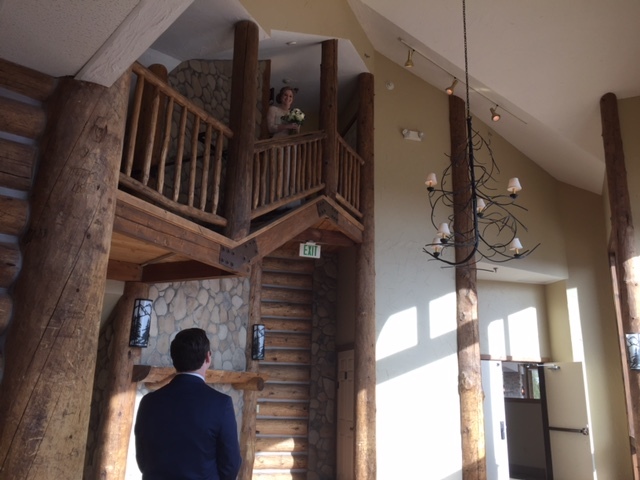 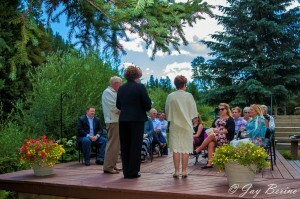 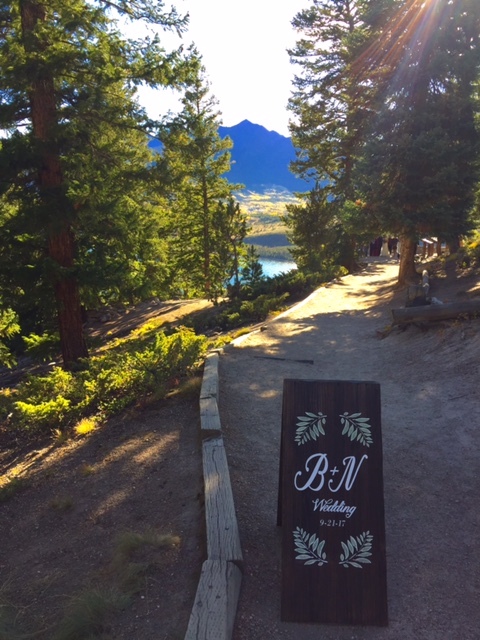 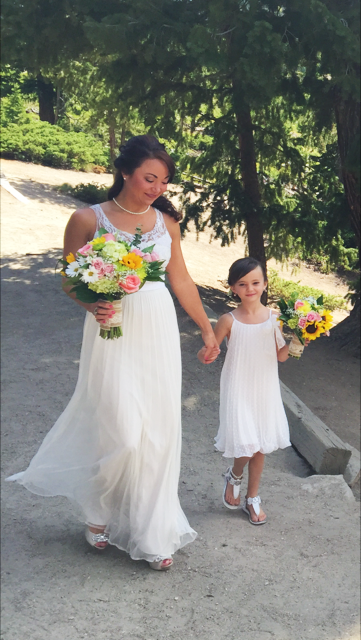 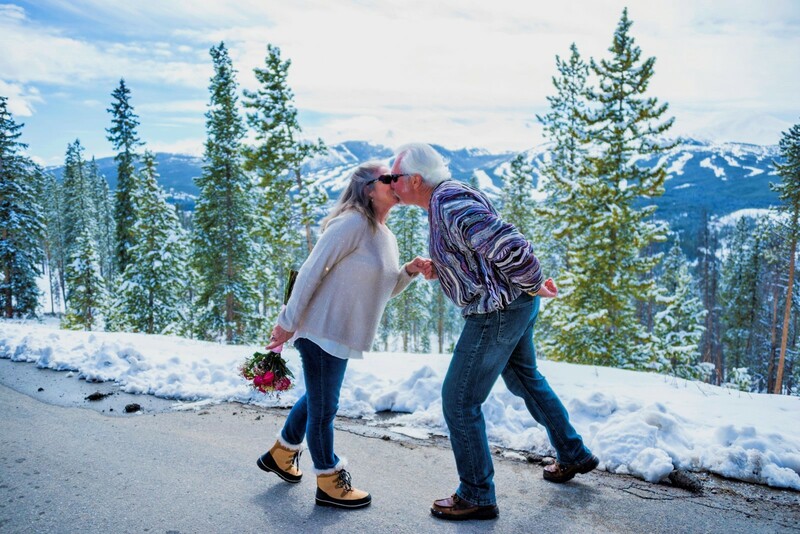 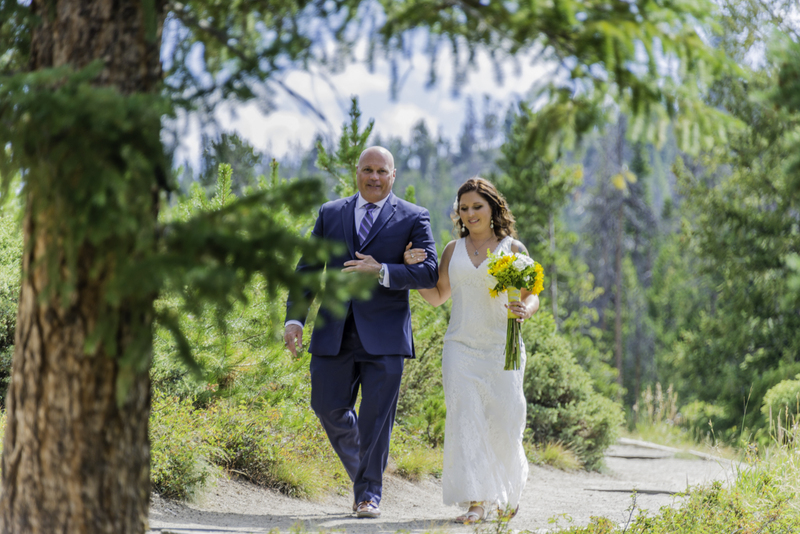 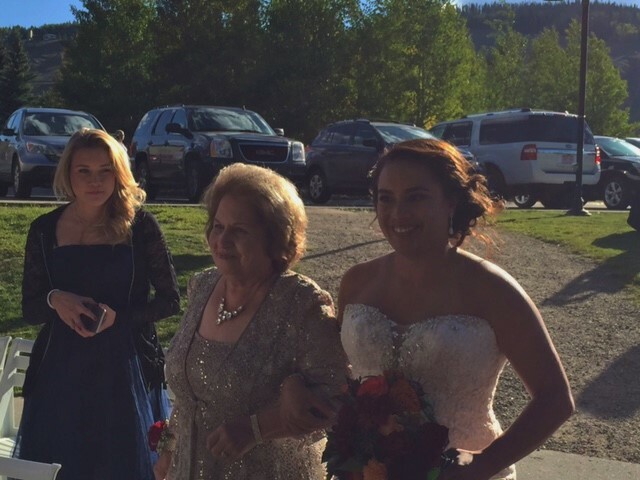 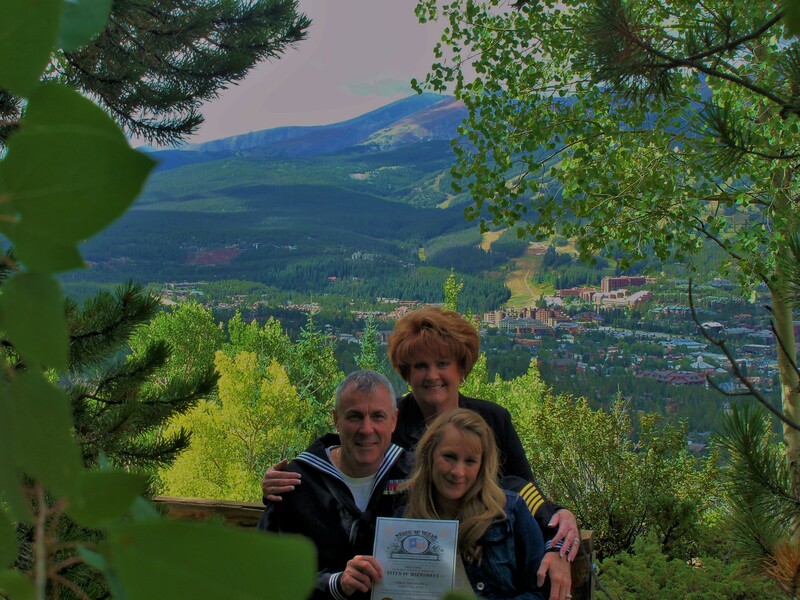 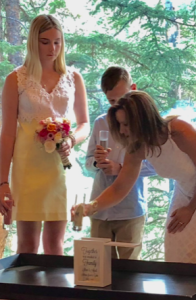 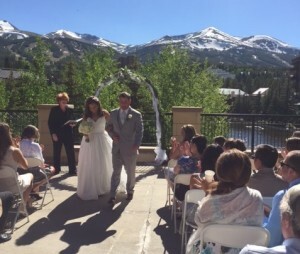 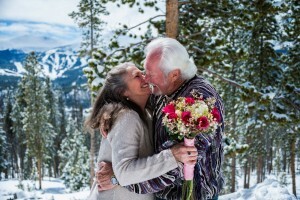 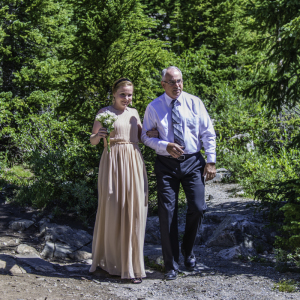 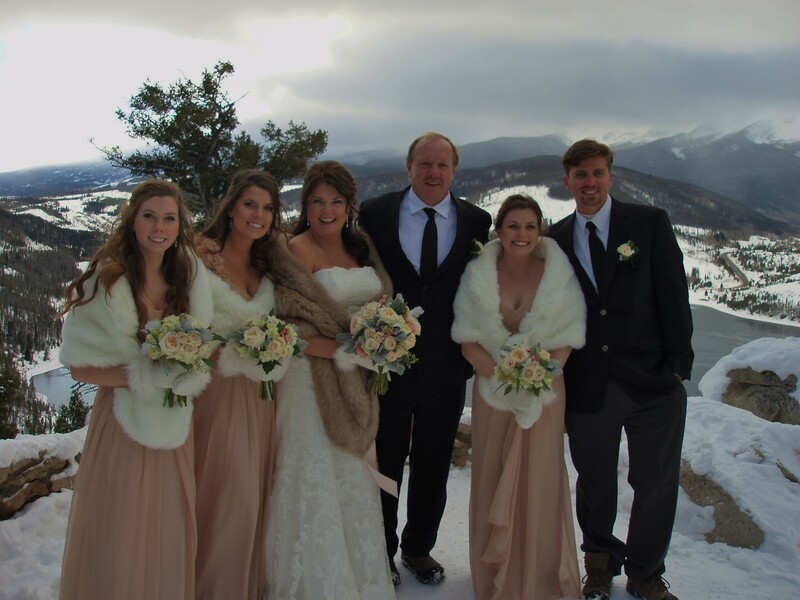 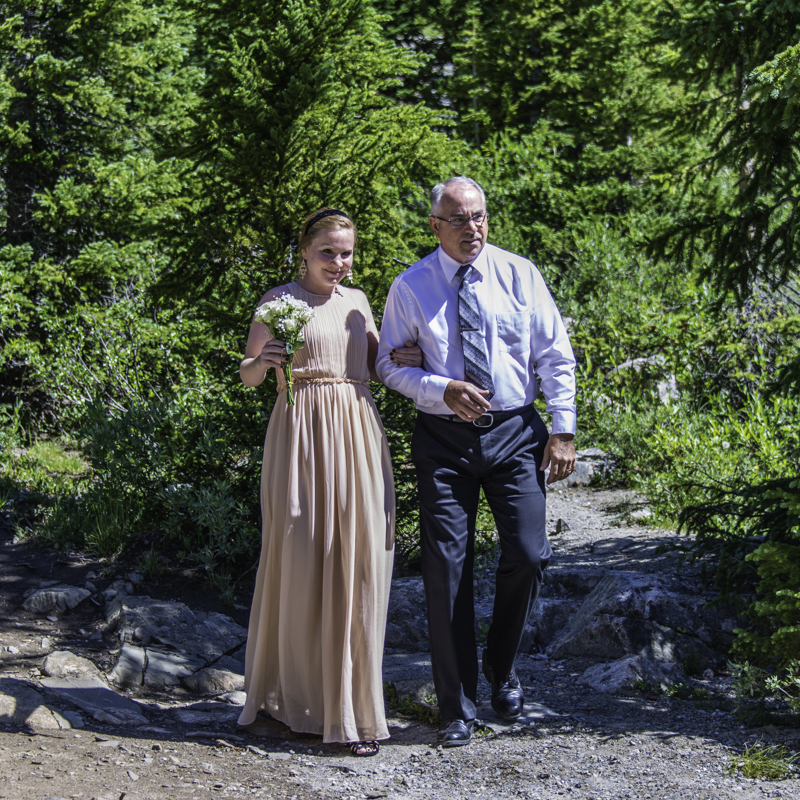 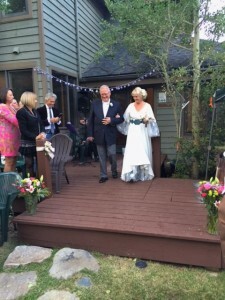 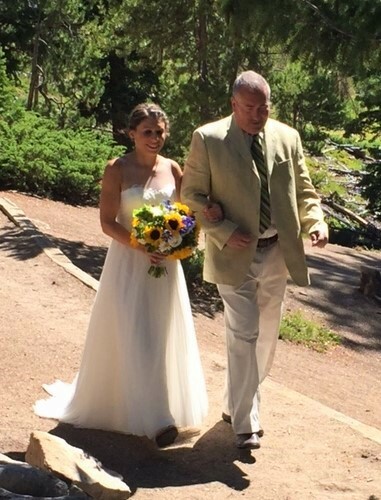 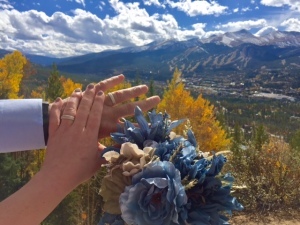 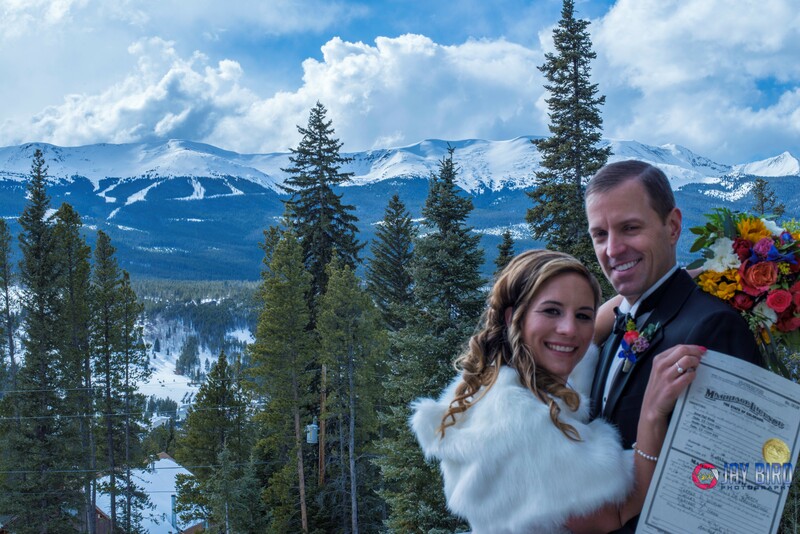 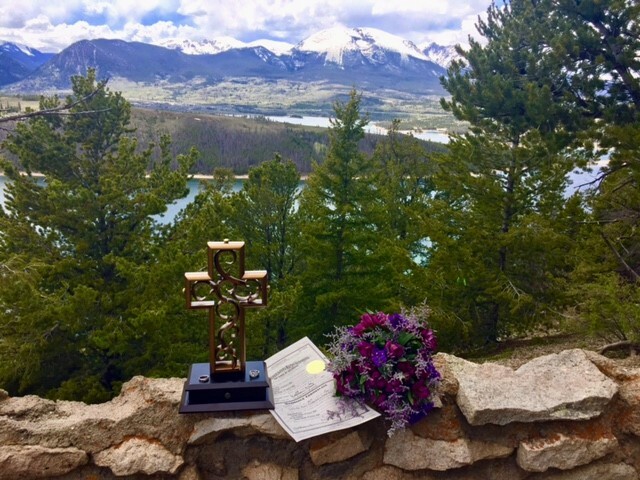 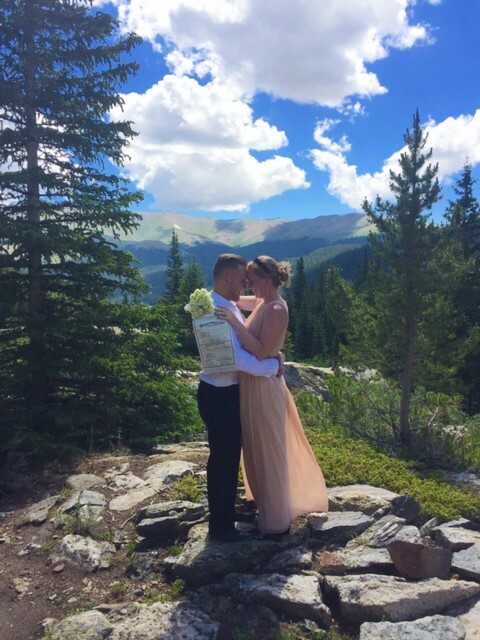 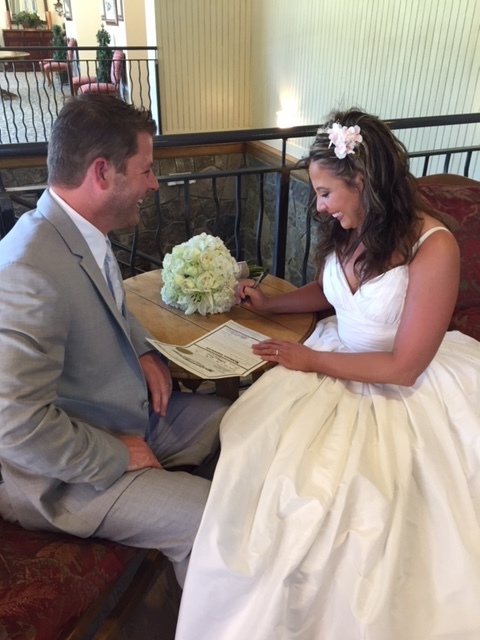 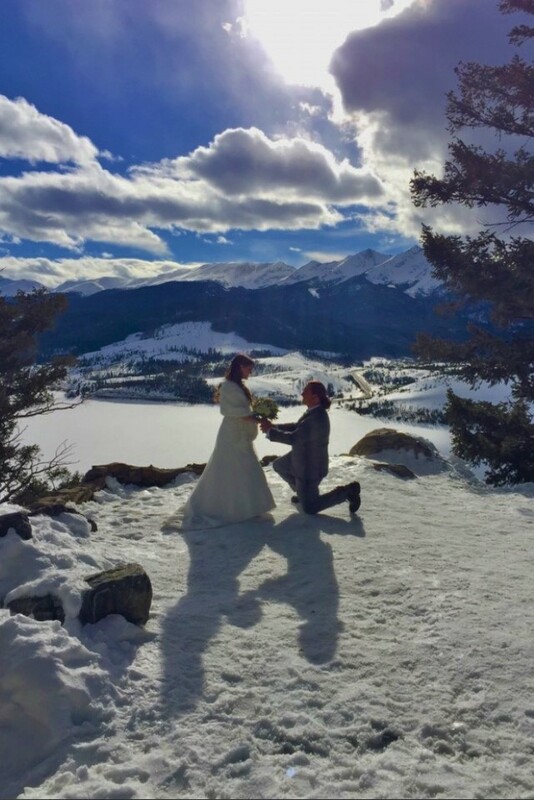 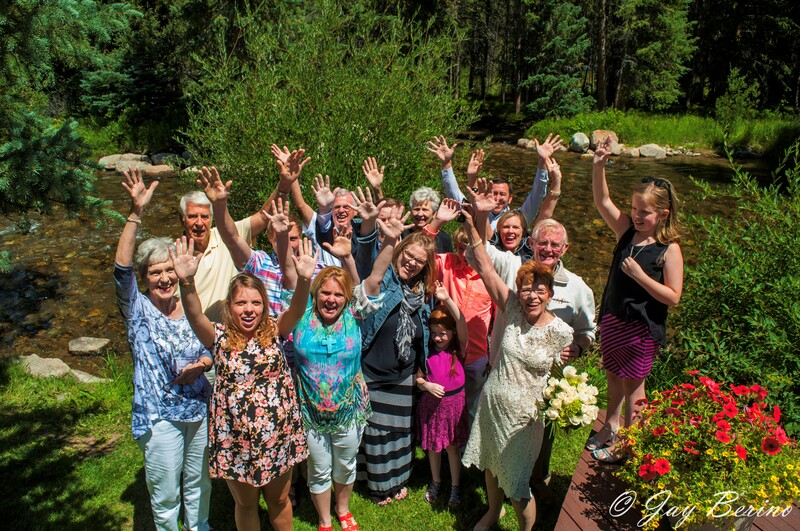 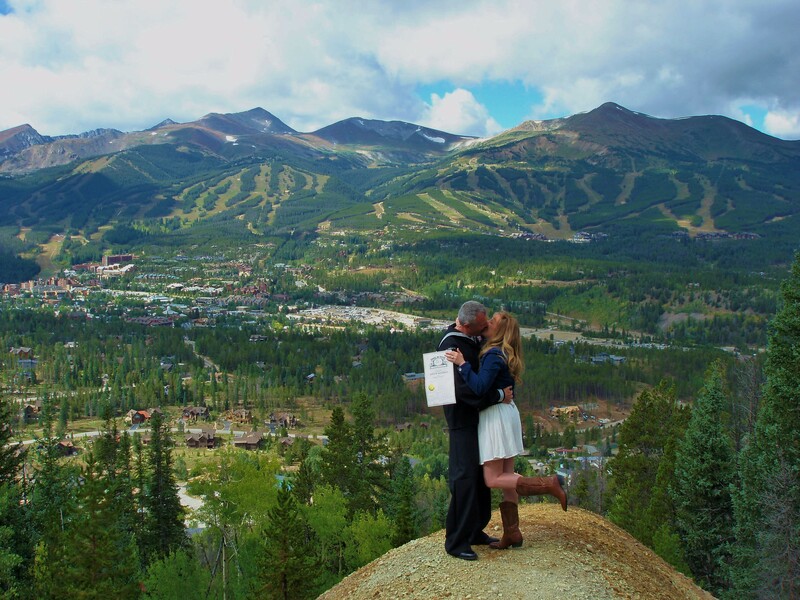 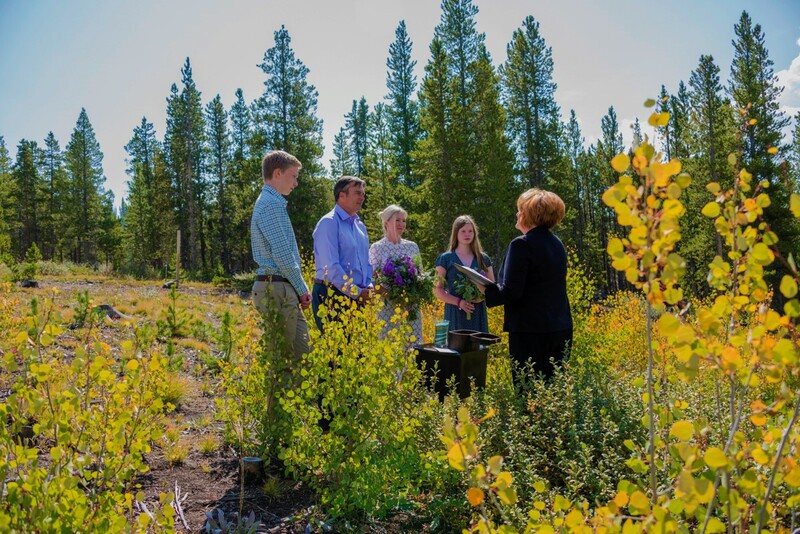 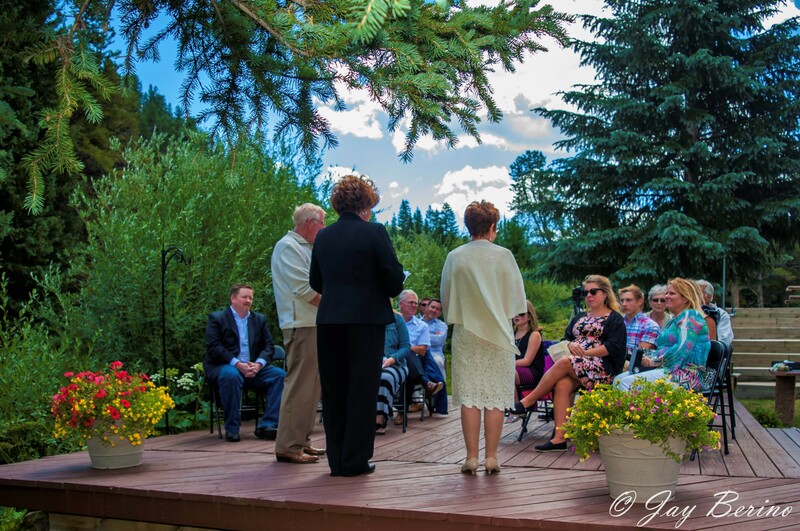 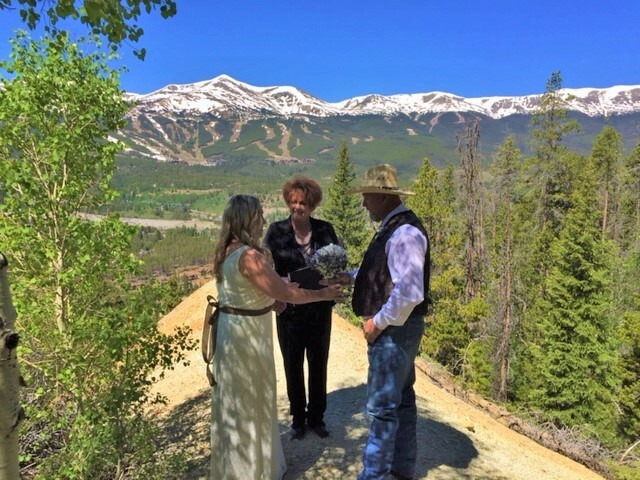 to the location for the ceremony……to the floral bouquet…….. and even to the most romantic wedding dinner restaurant in Breckenridge! 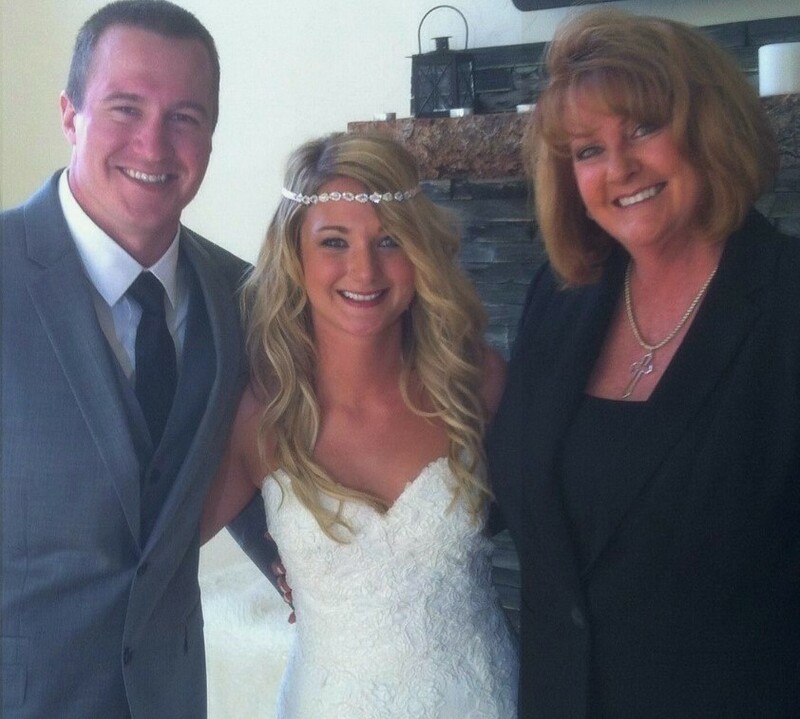 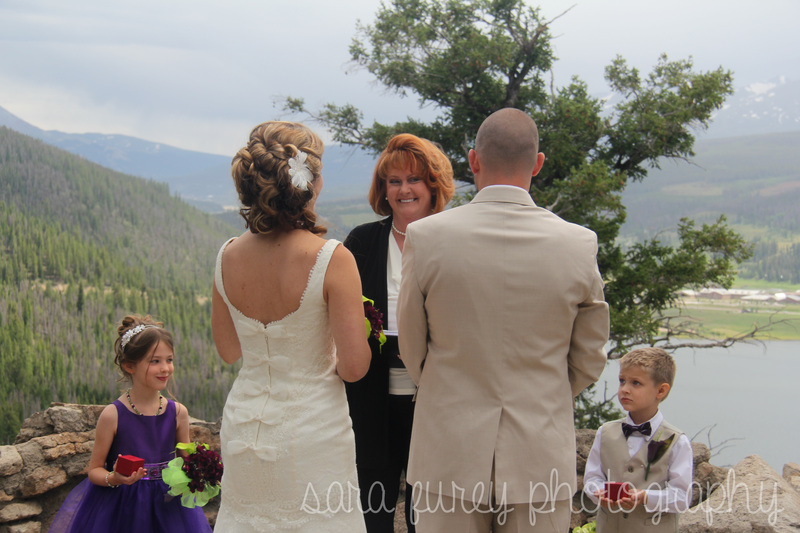 Bonus: read what the bride’s mother had to say, below! “Dr. Julie is just the best! We contacted Julie a week before our wedding, we don’t know how she fit us in, but she did. 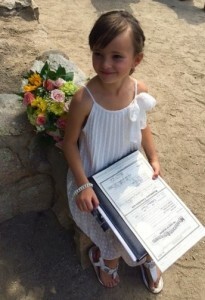 She is the most organized person we know, so professional, thoughtful and caring. 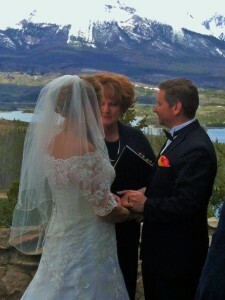 Julie treated us like we had been friends for years and that our wedding was just as important to her as it was to us. 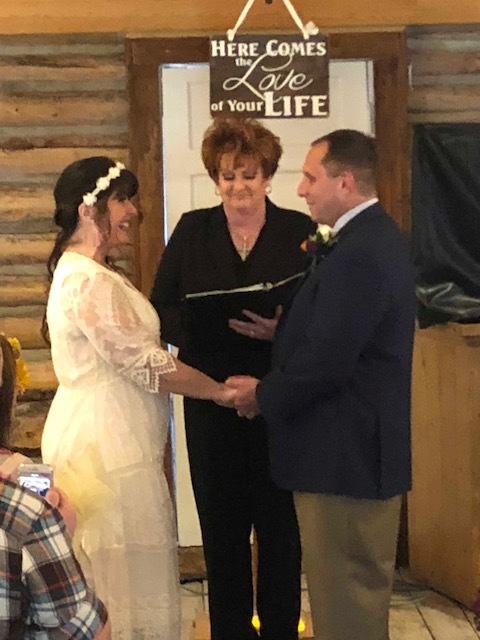 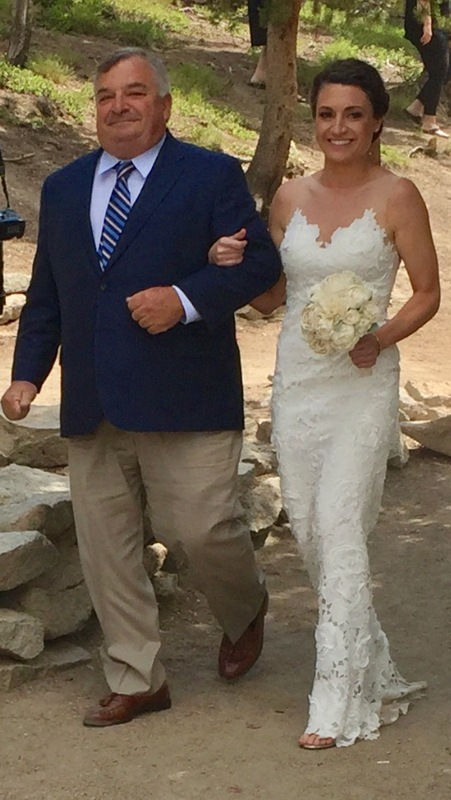 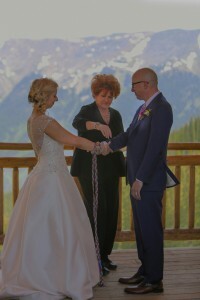 Everybody at our wedding could not say enough great things about our ceremony, and that was all because of what Dr. Julie Wright-Kile can do. 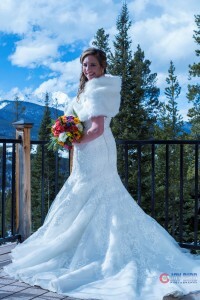 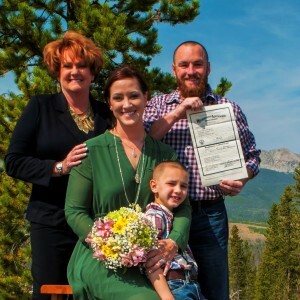 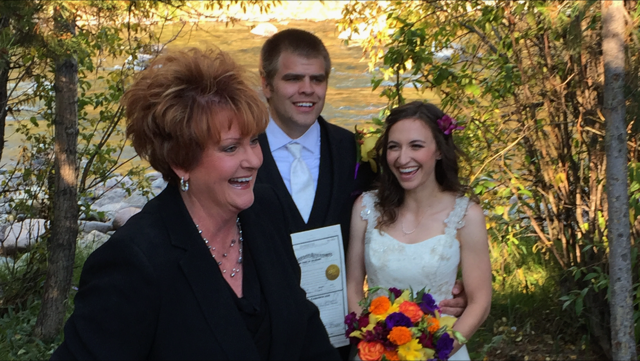 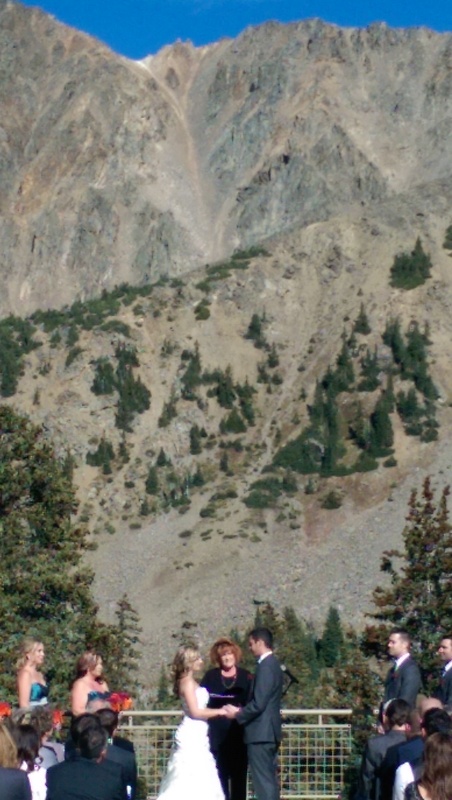 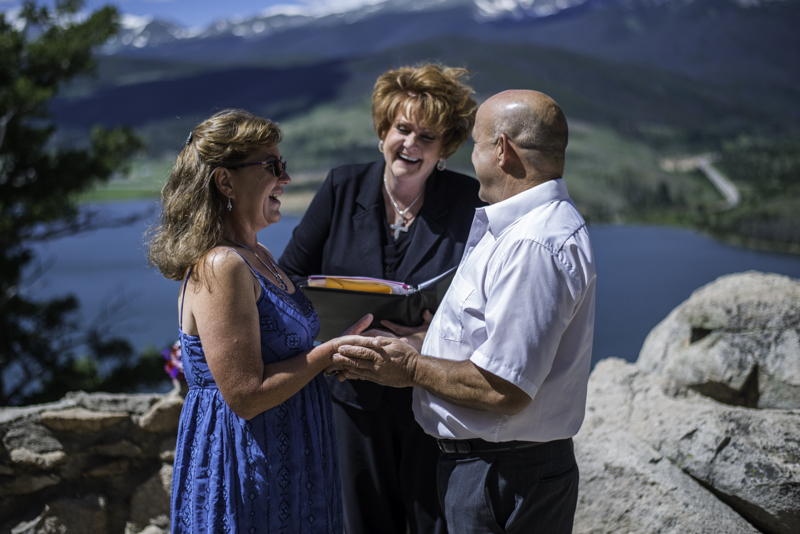 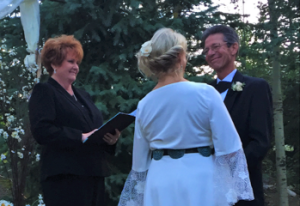 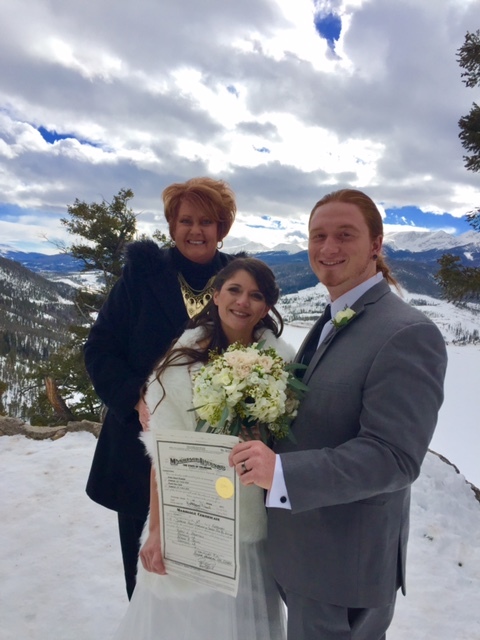 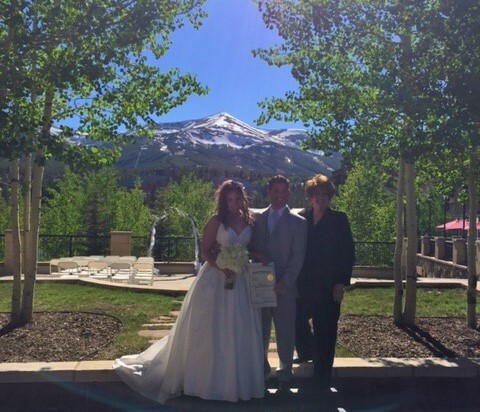 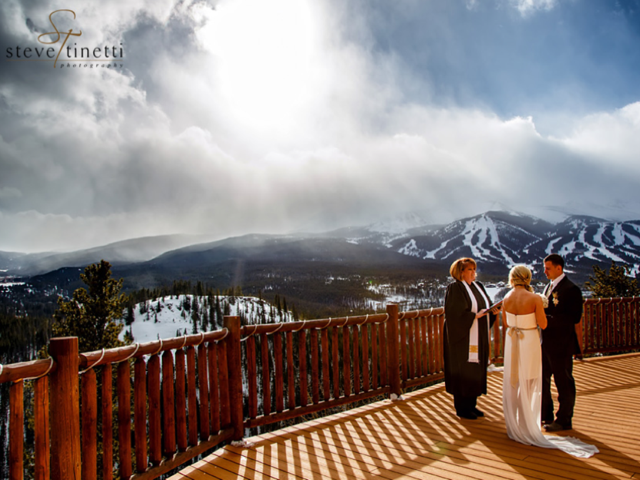 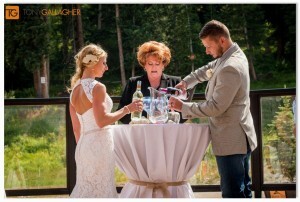 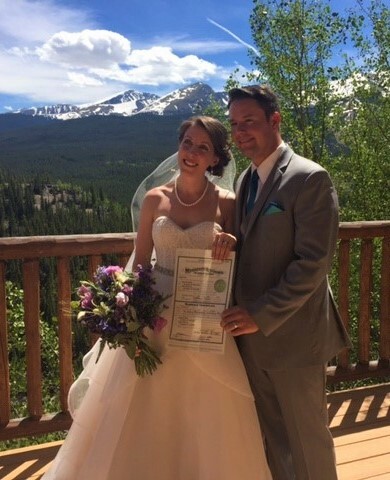 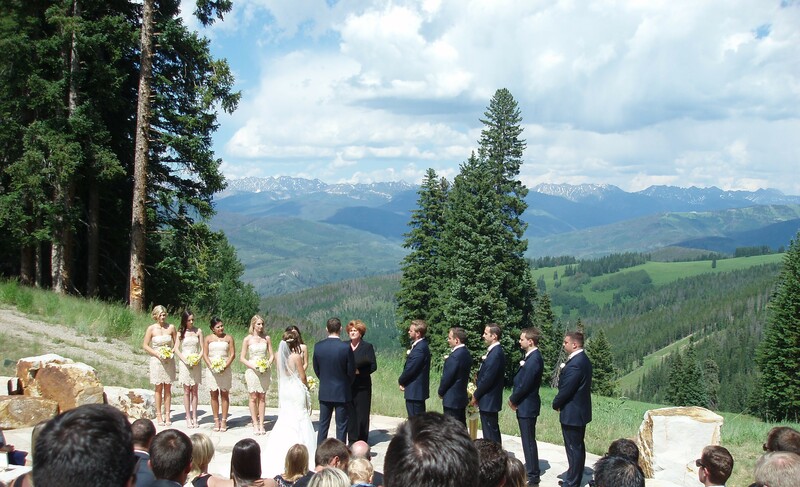 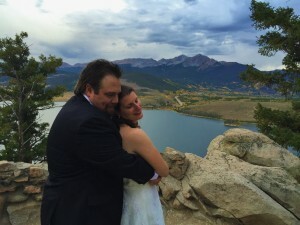 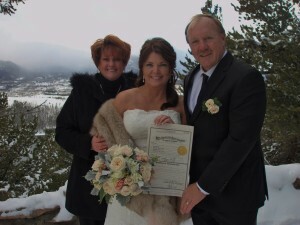 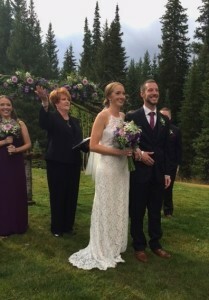 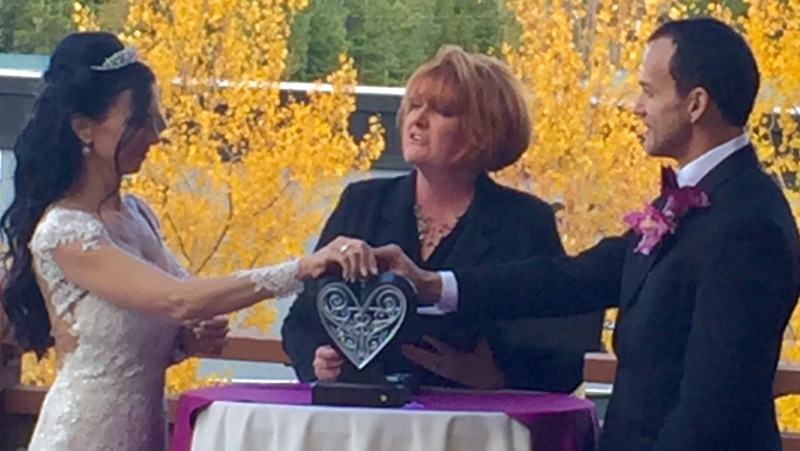 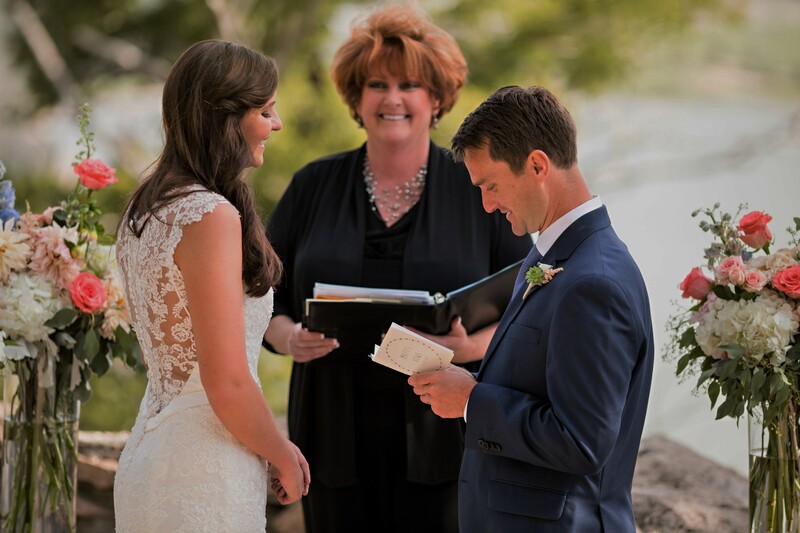 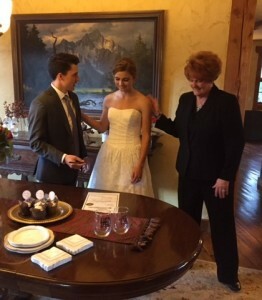 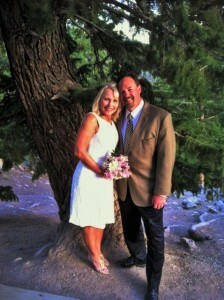 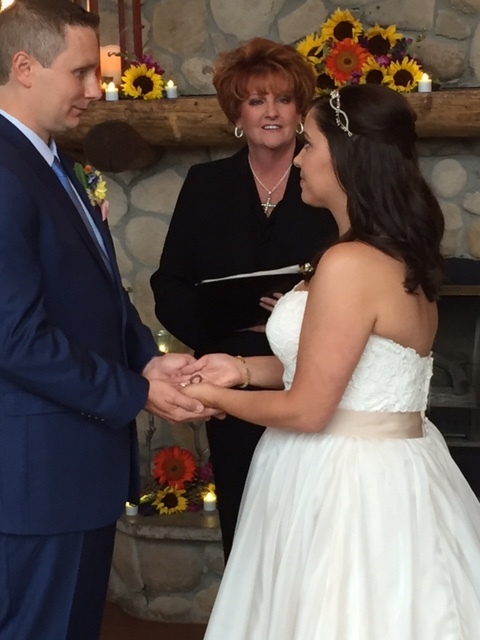 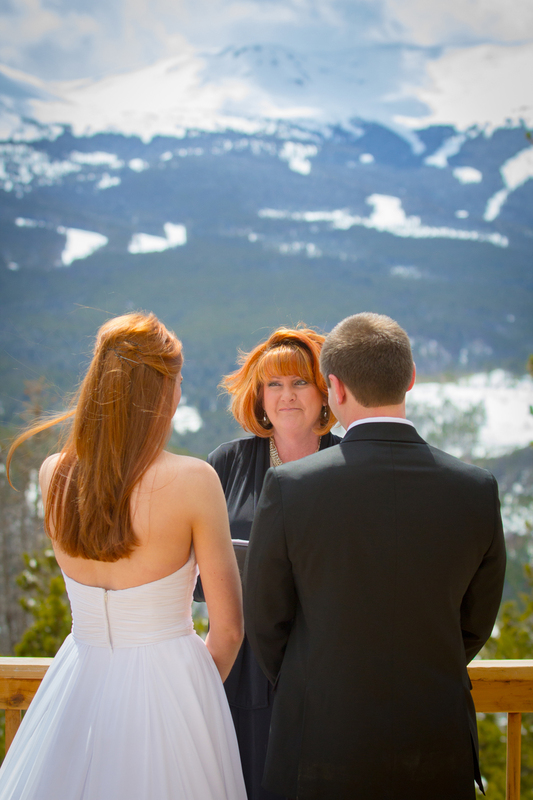 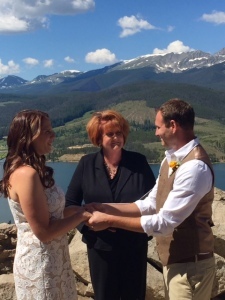 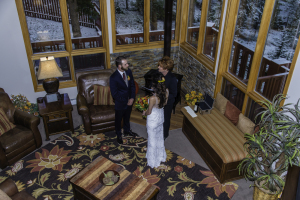 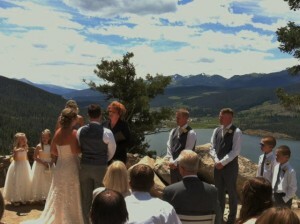 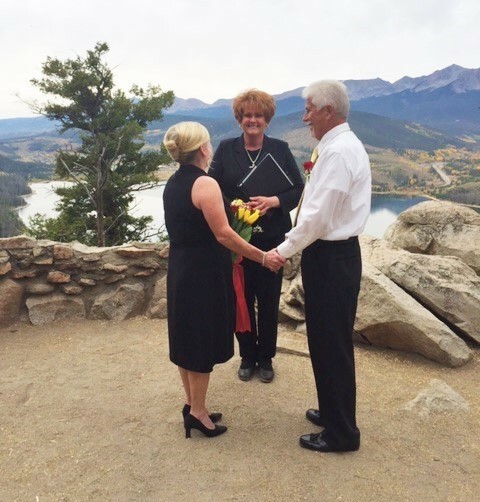 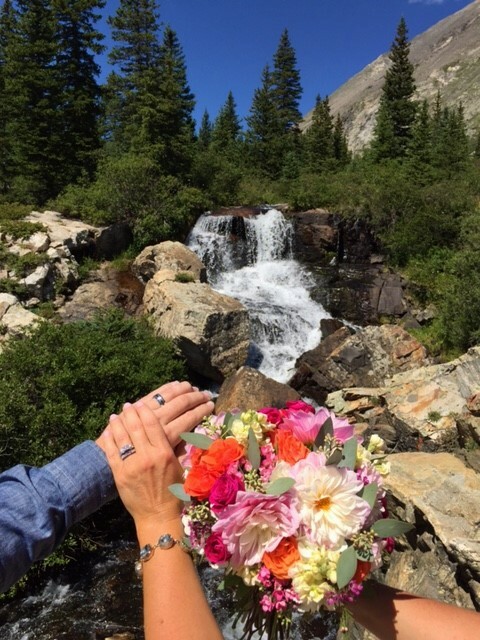 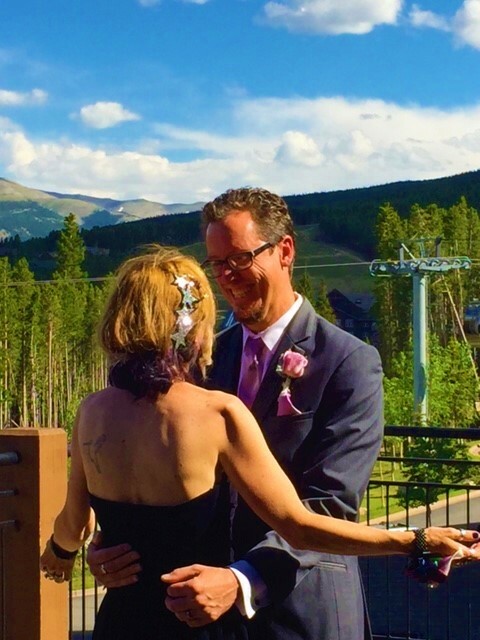 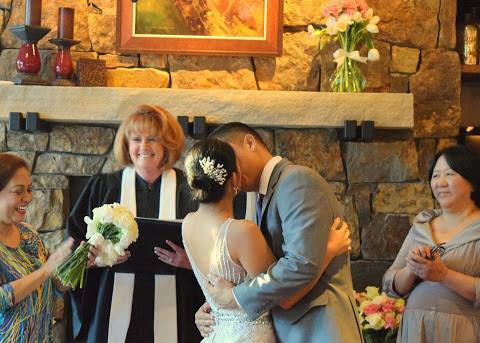 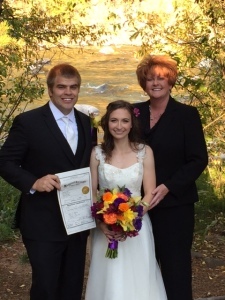 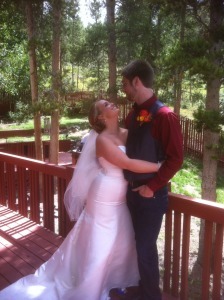 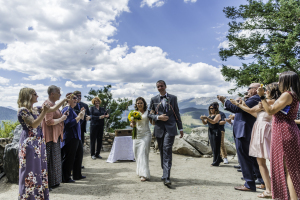 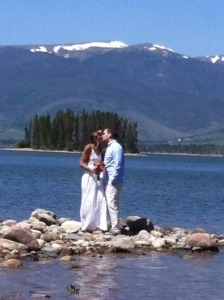 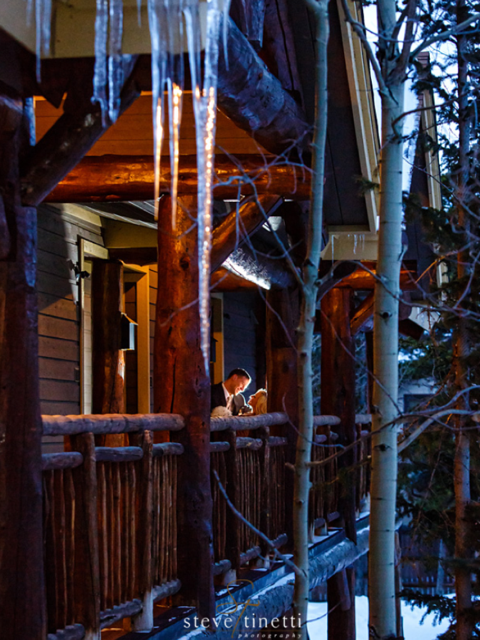 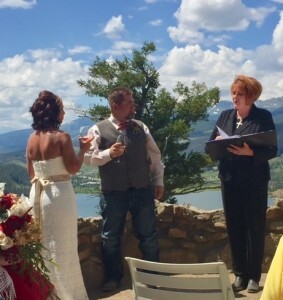 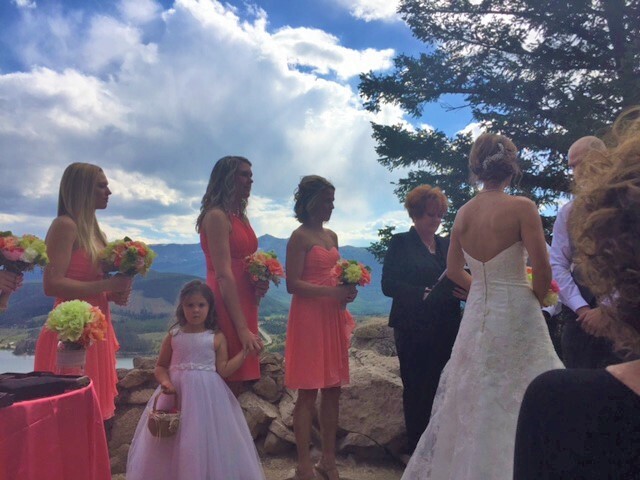 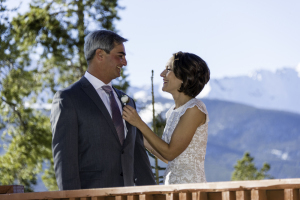 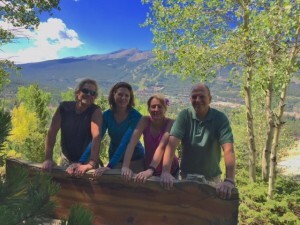 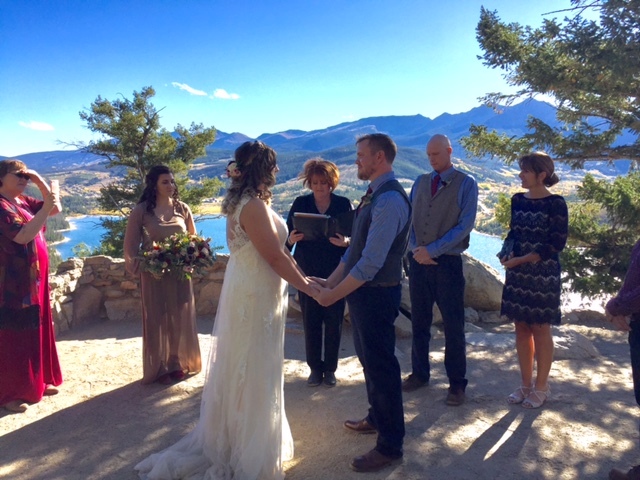 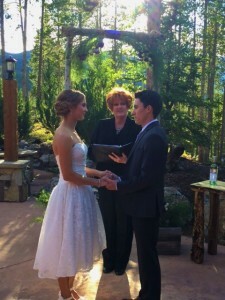 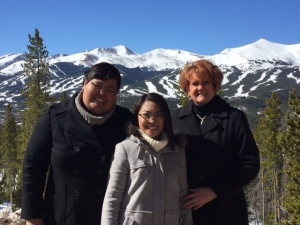 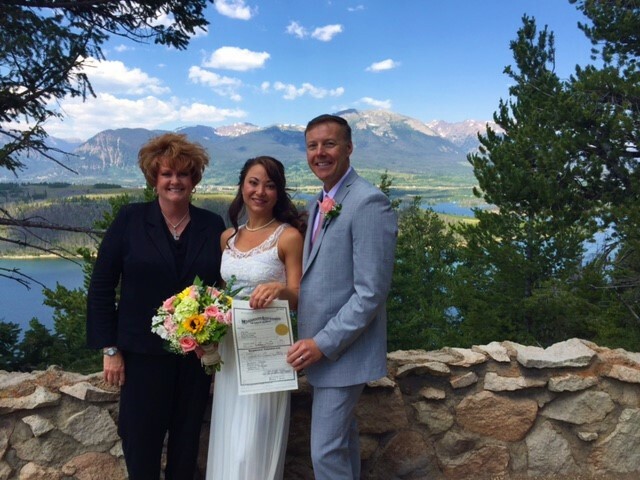 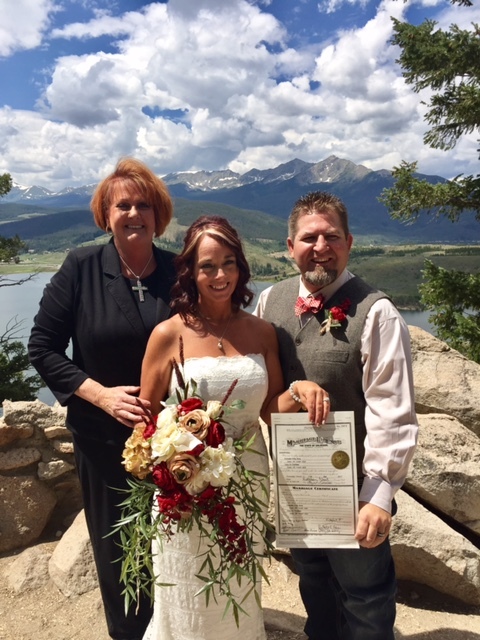 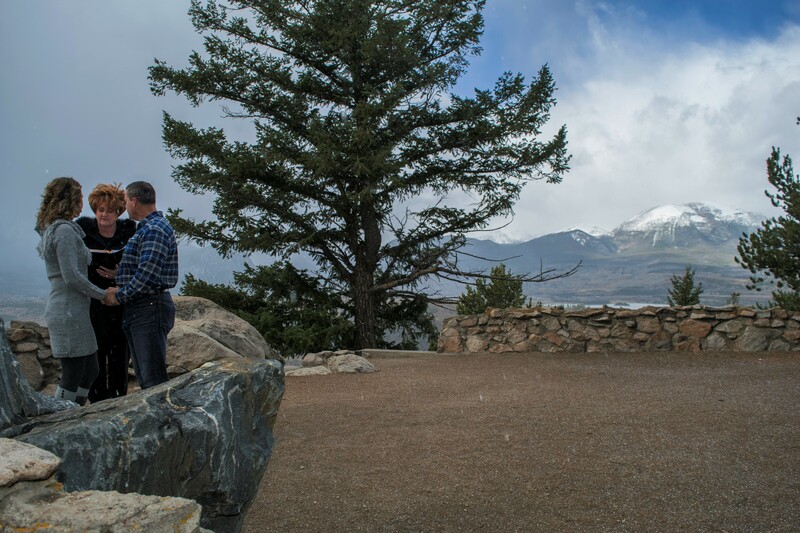 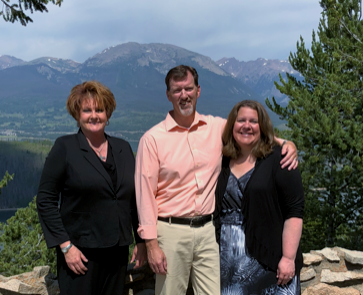 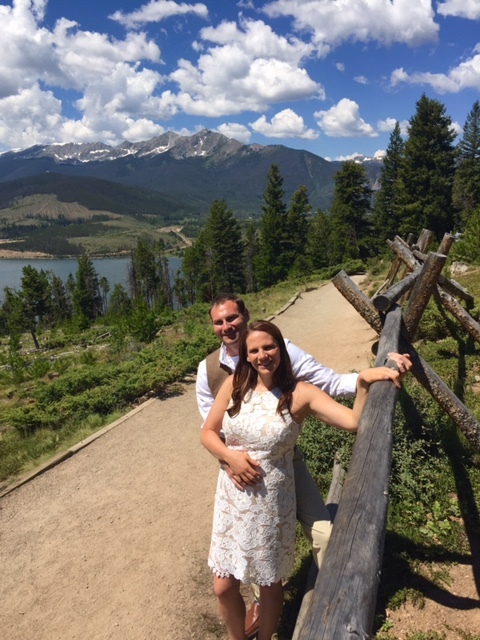 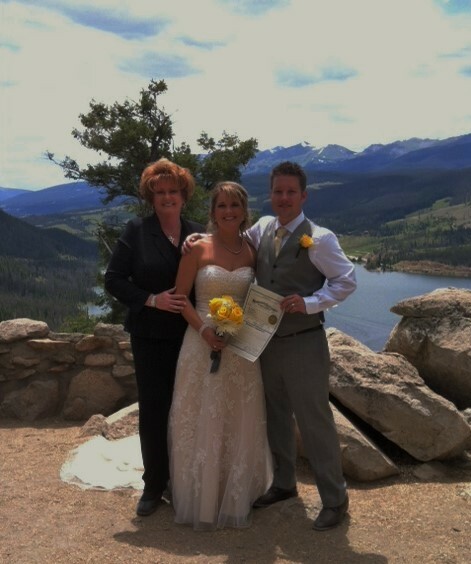 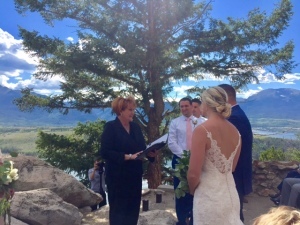 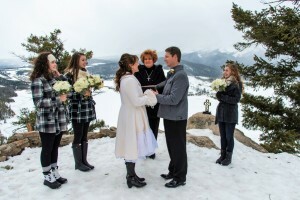 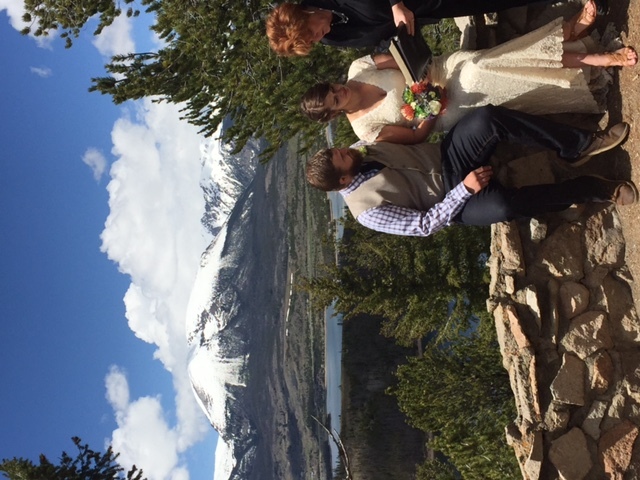 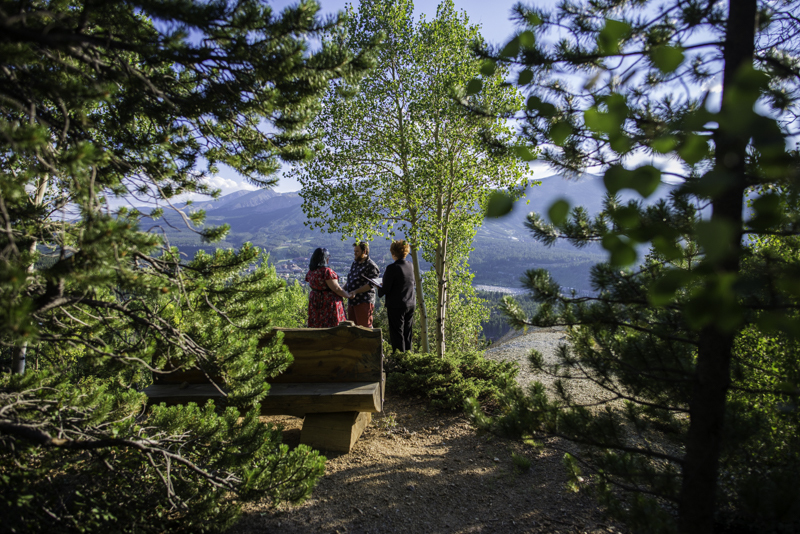 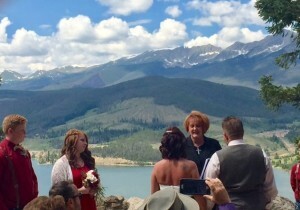 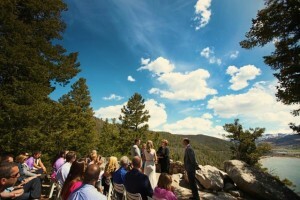 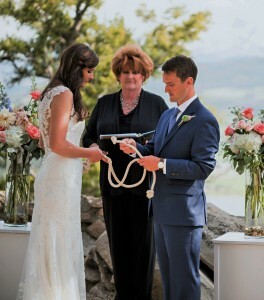 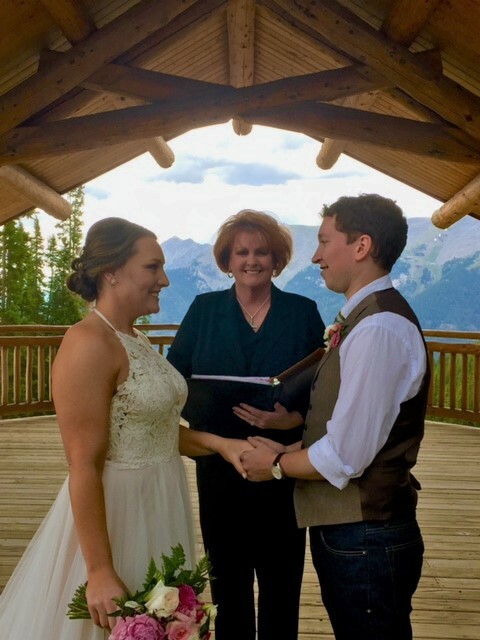 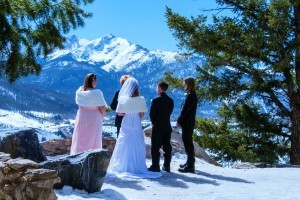 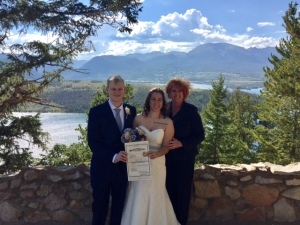 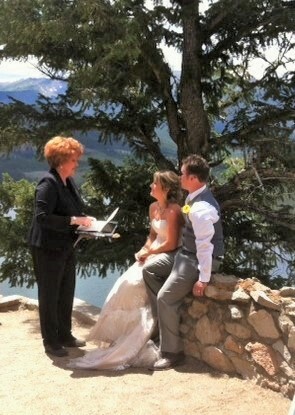 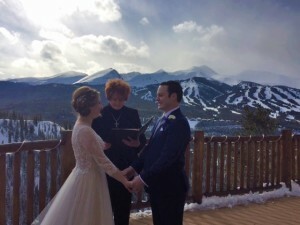 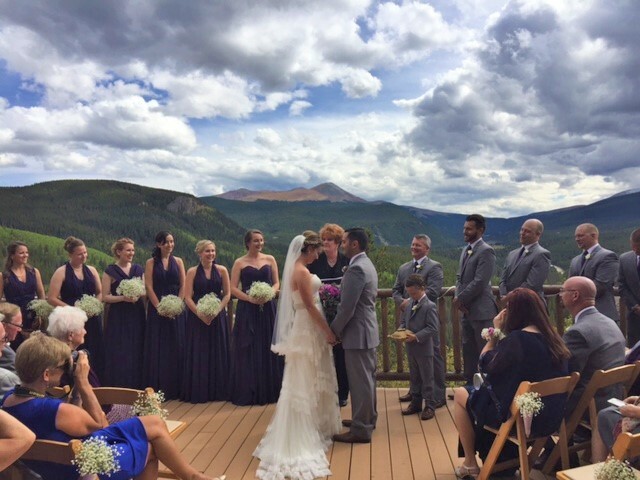 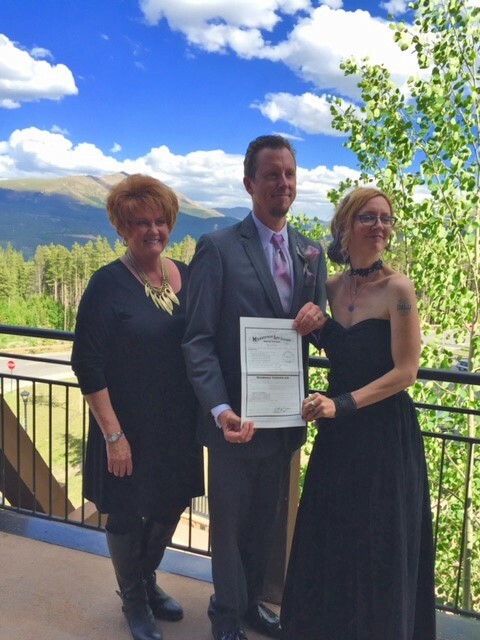 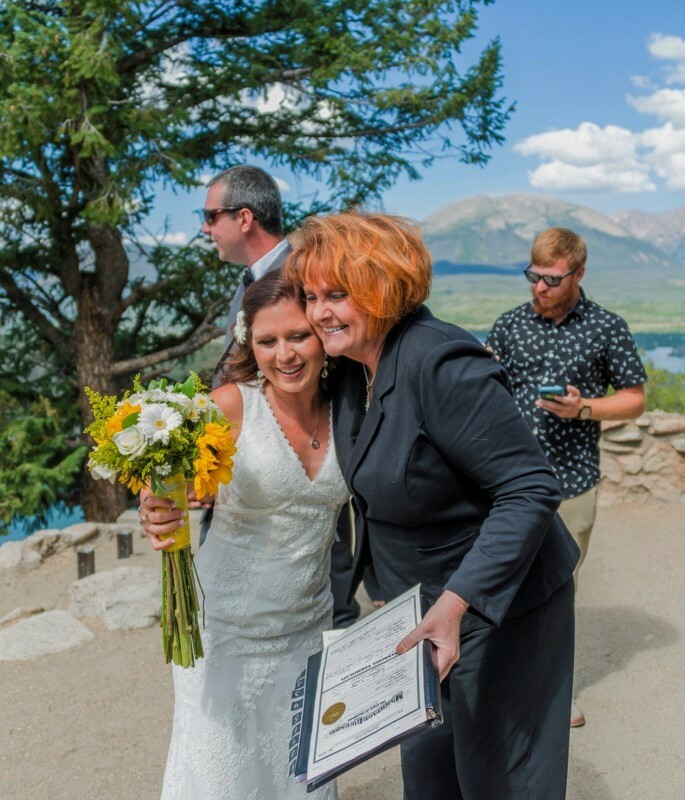 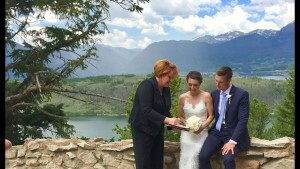 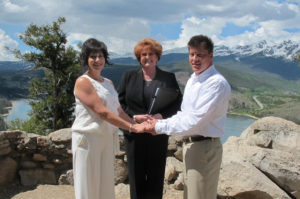 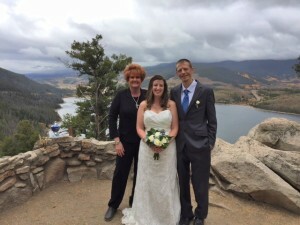 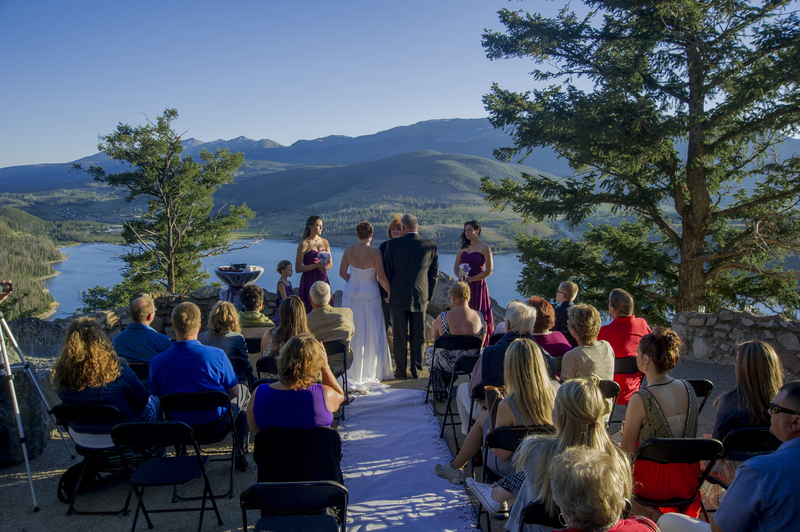 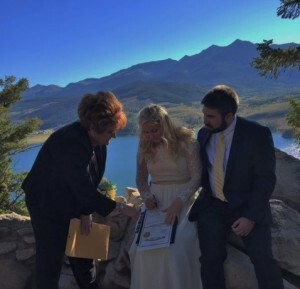 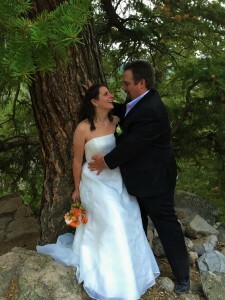 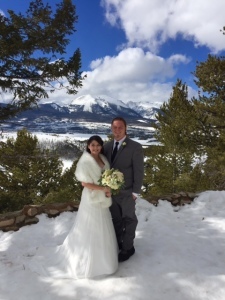 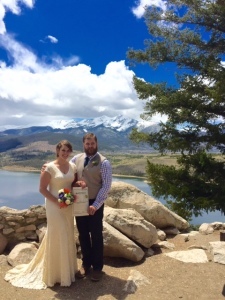 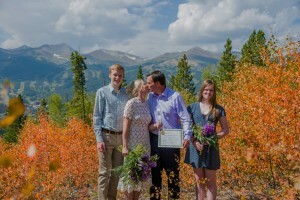 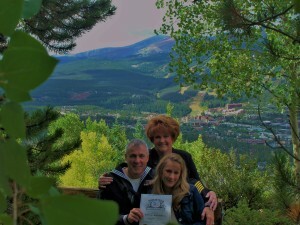 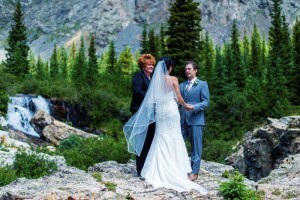 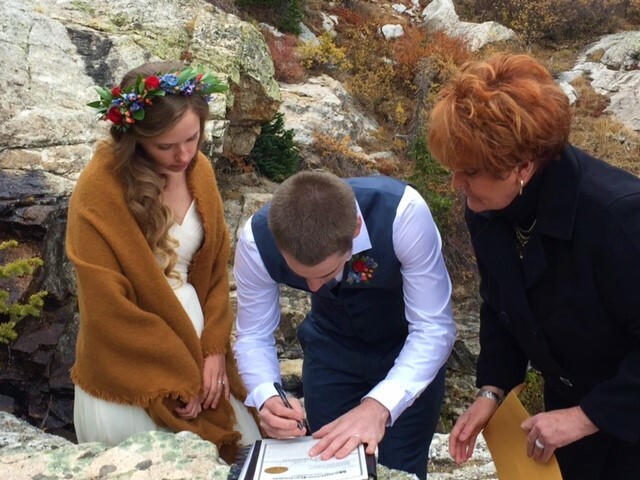 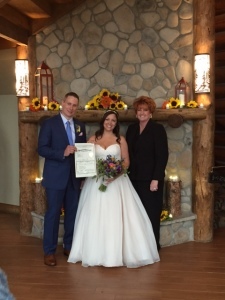 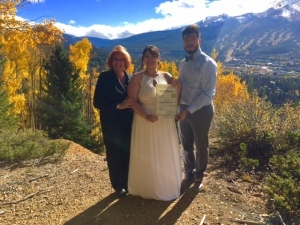 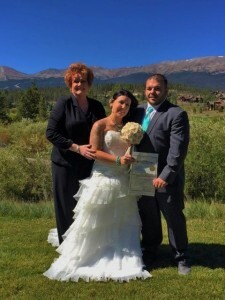 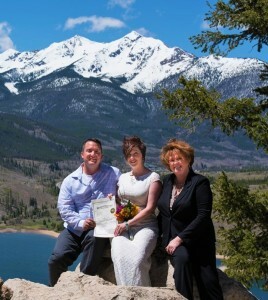 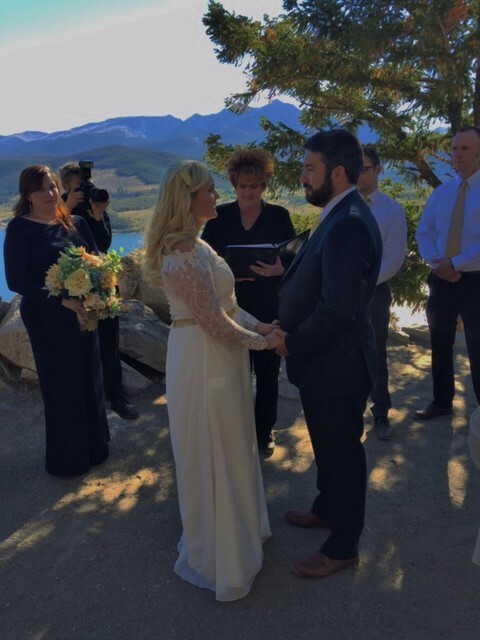 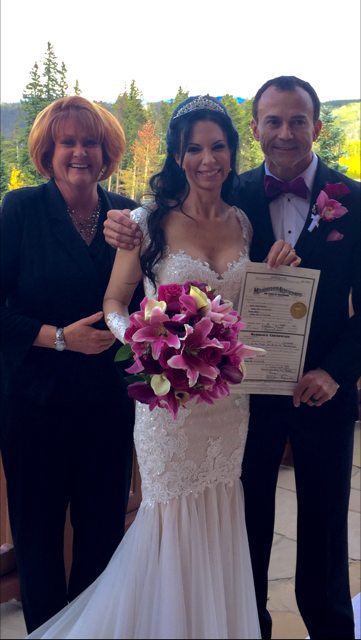 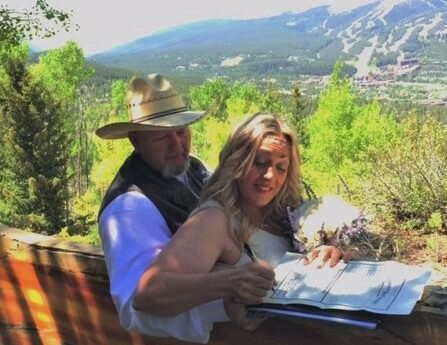 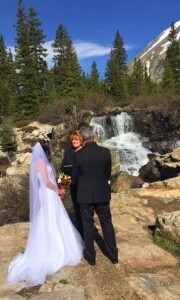 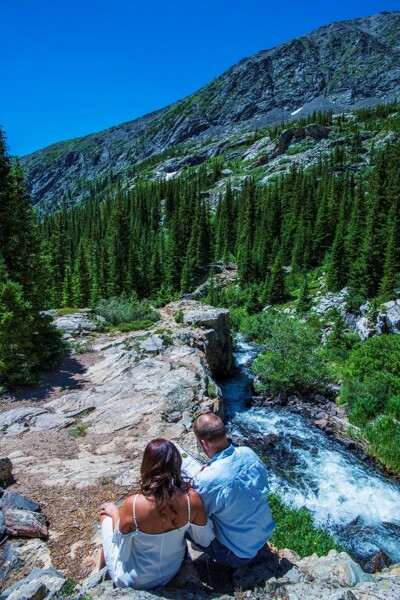 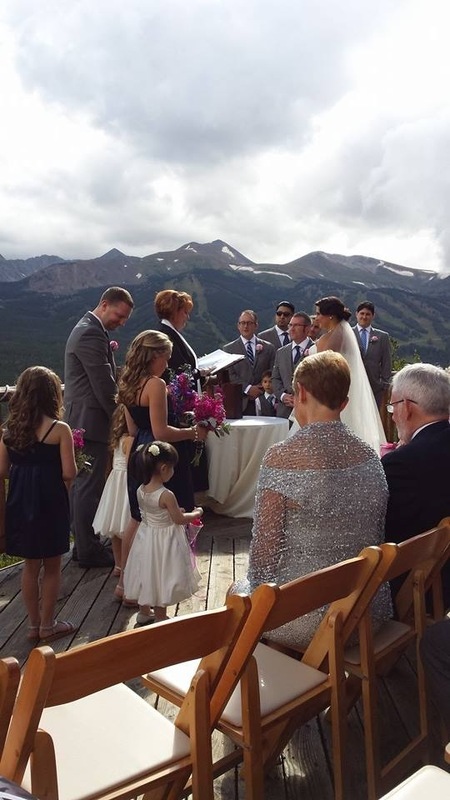 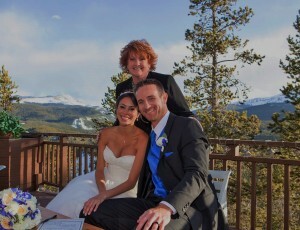 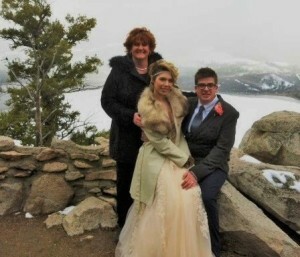 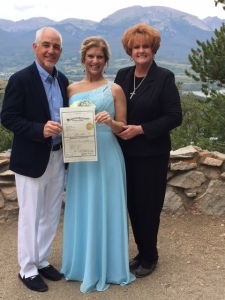 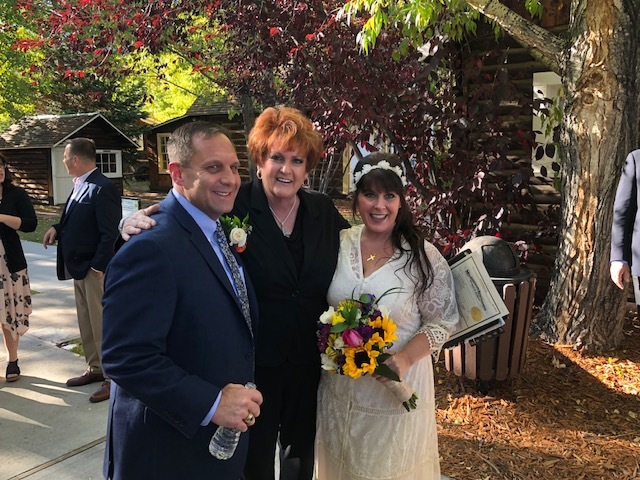 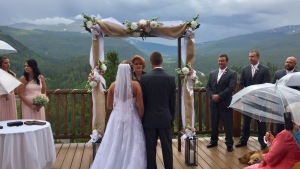 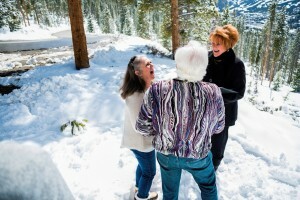 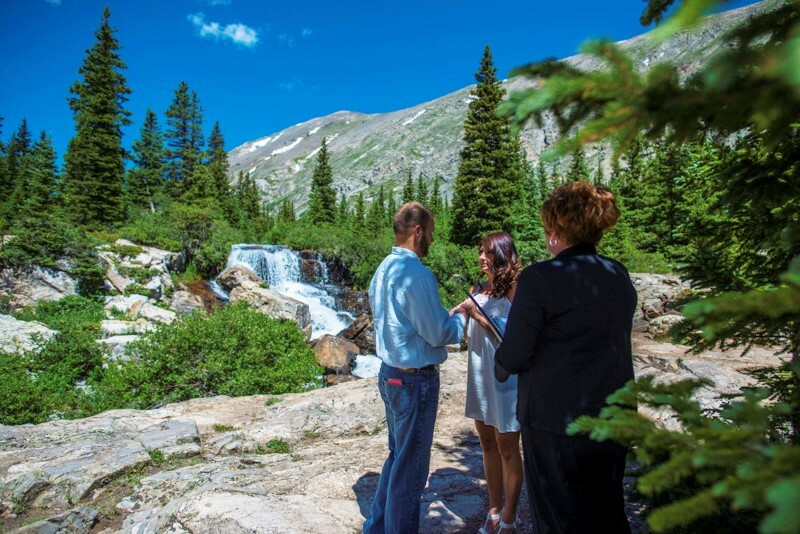 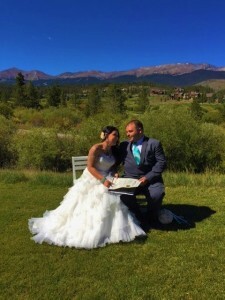 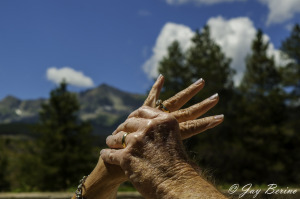 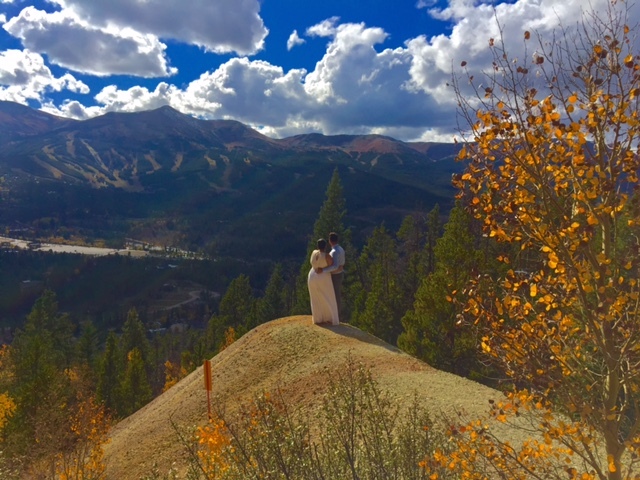 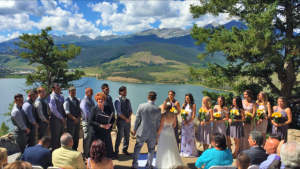 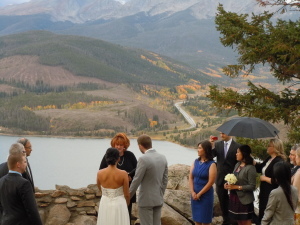 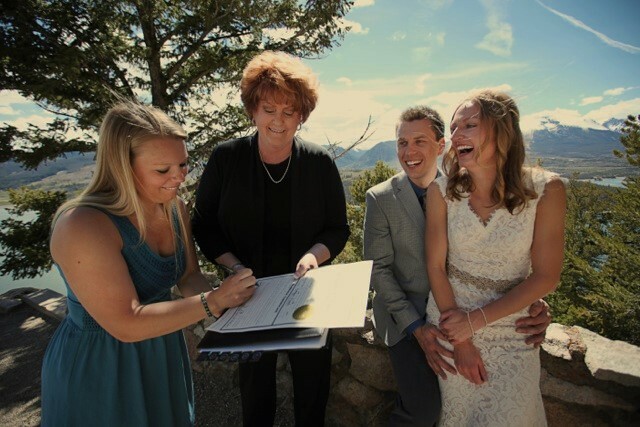 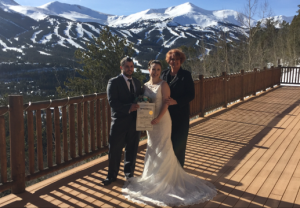 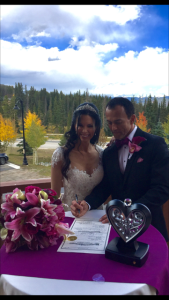 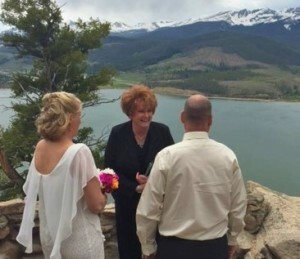 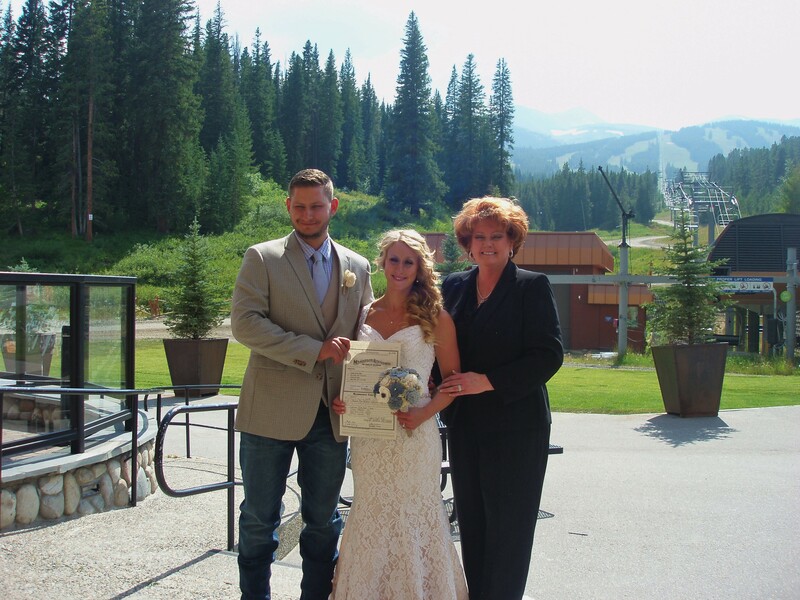 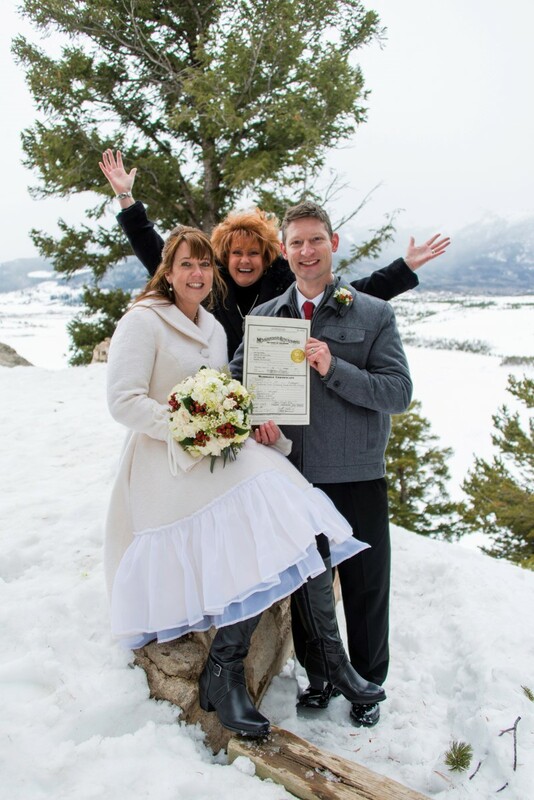 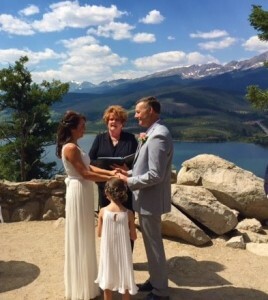 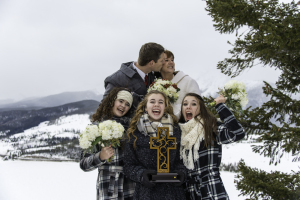 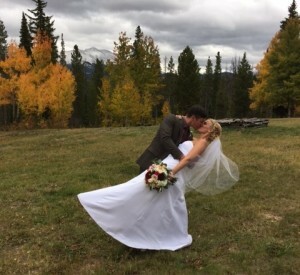 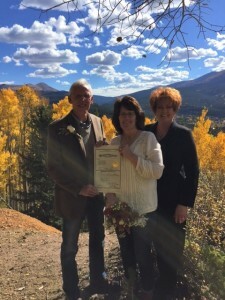 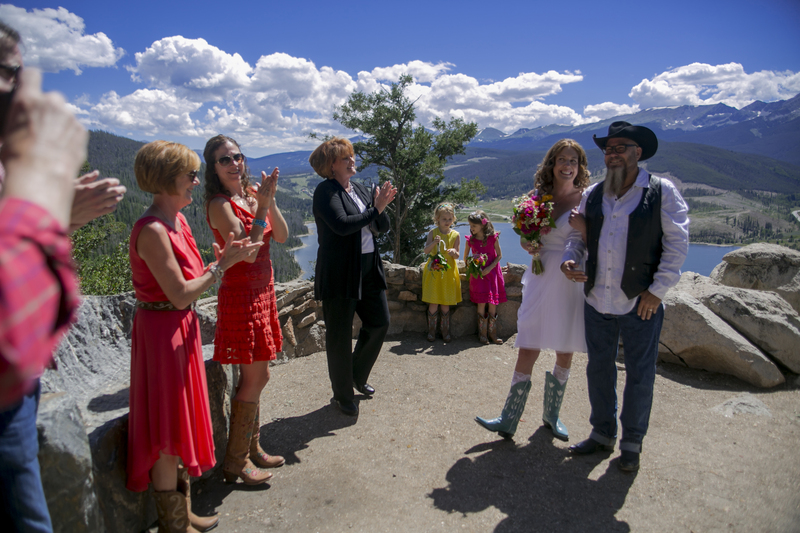 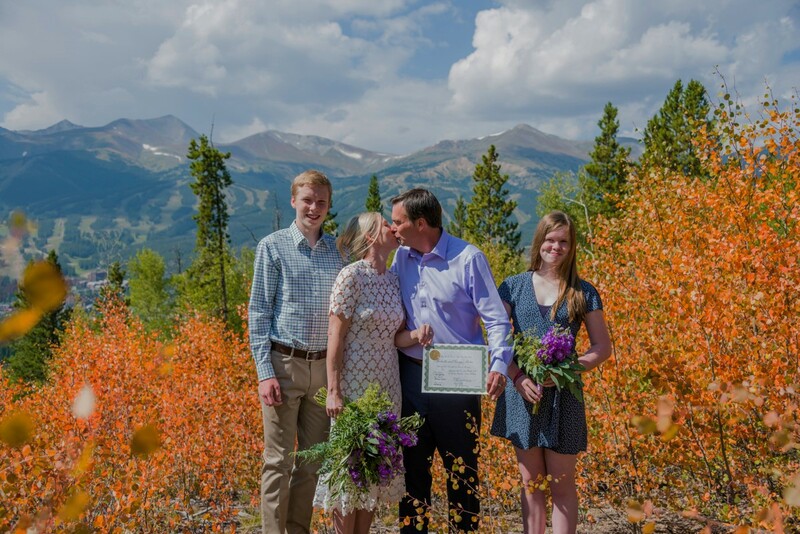 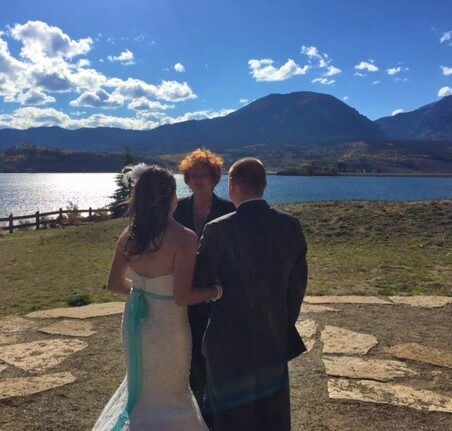 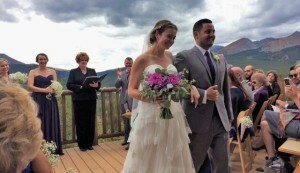 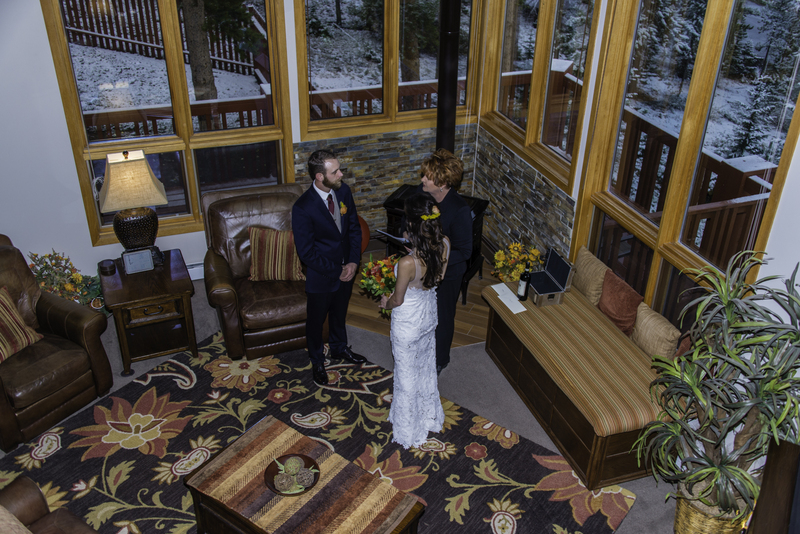 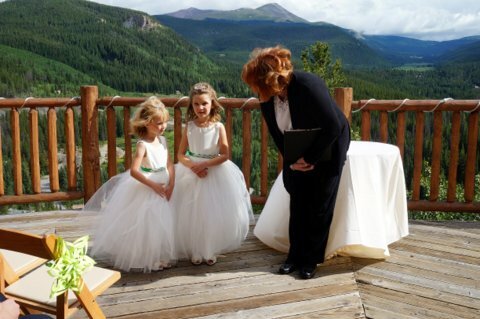 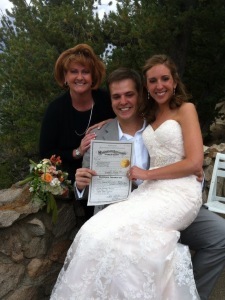 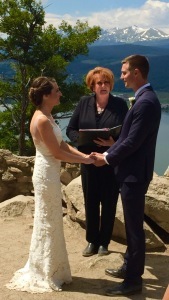 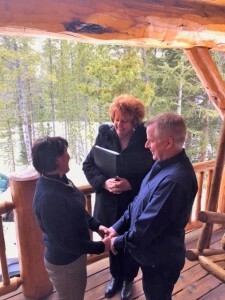 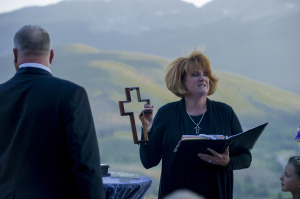 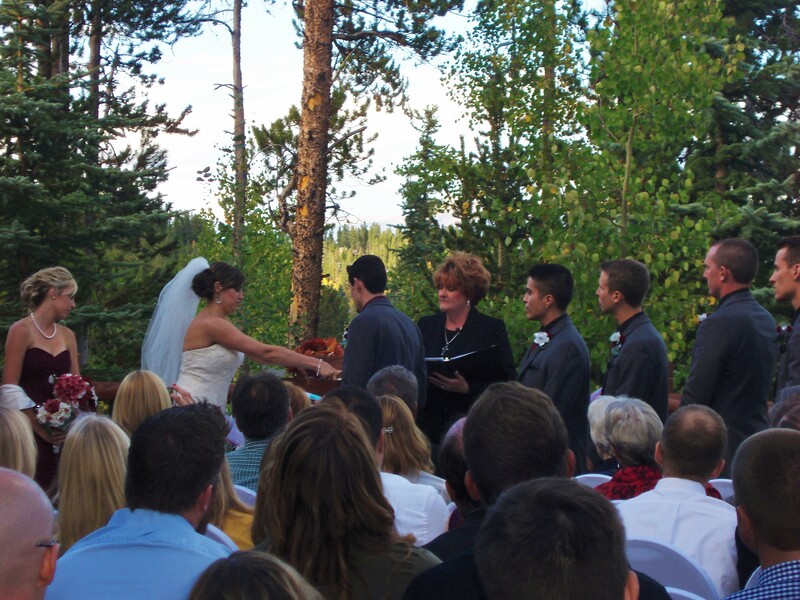 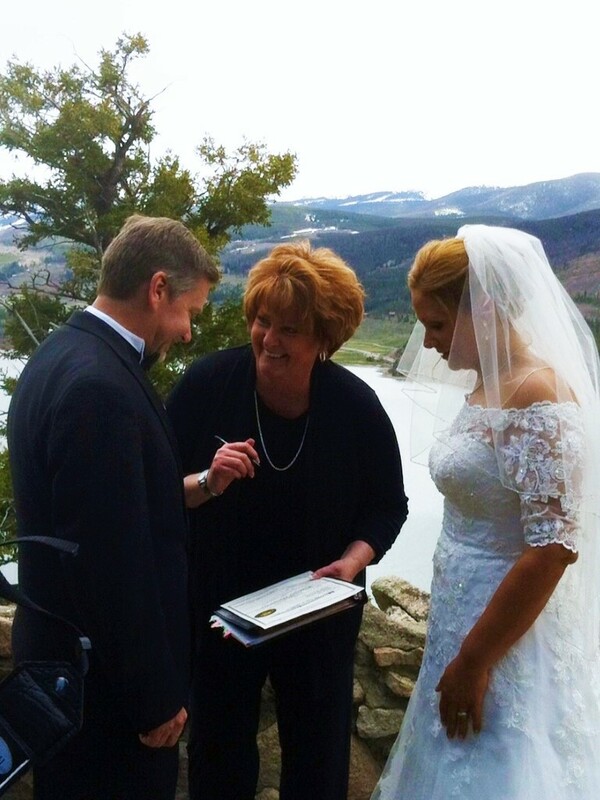 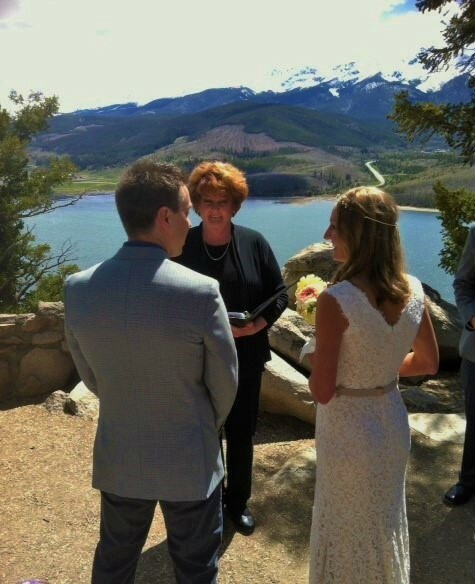 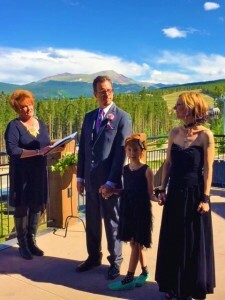 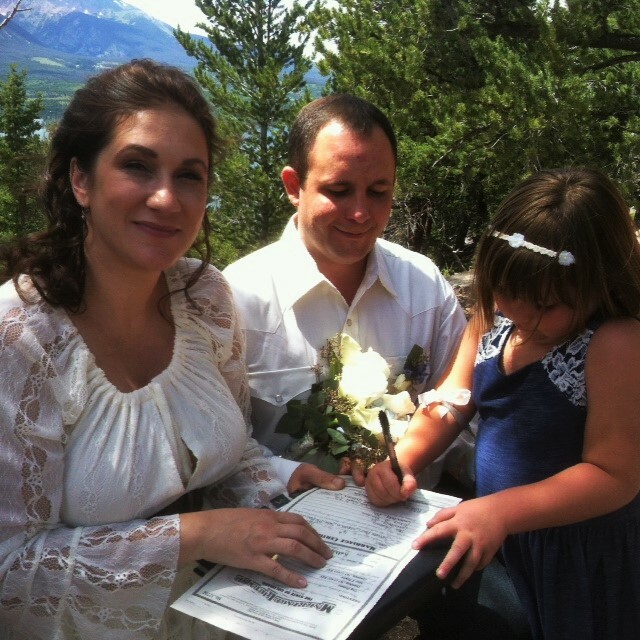 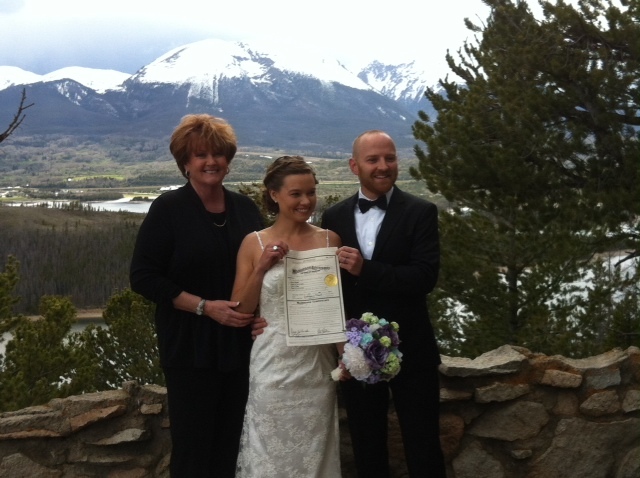 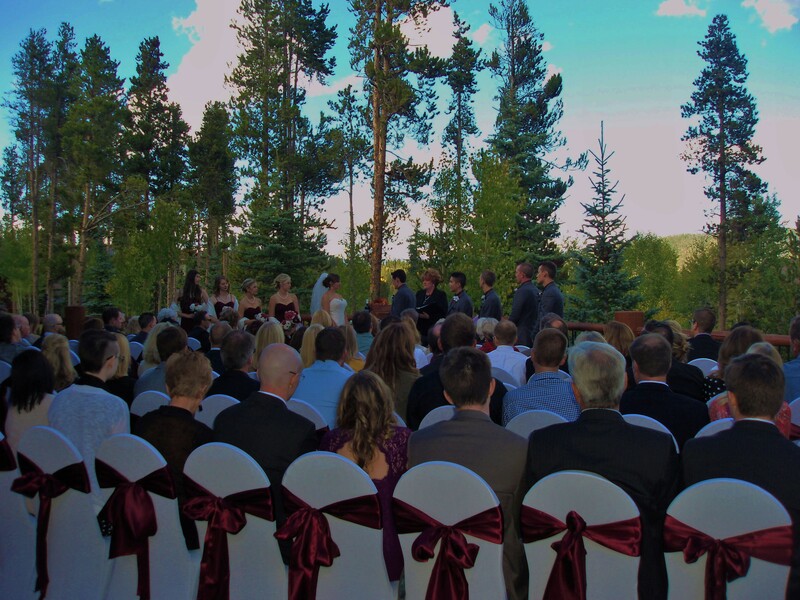 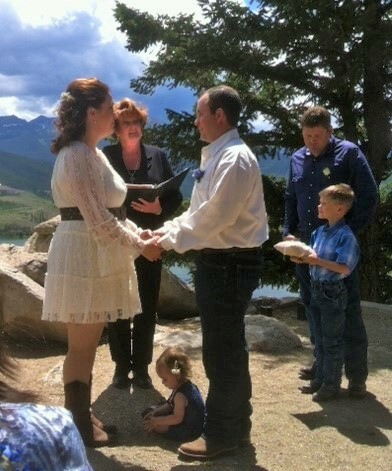 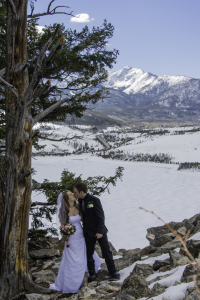 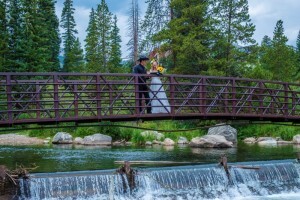 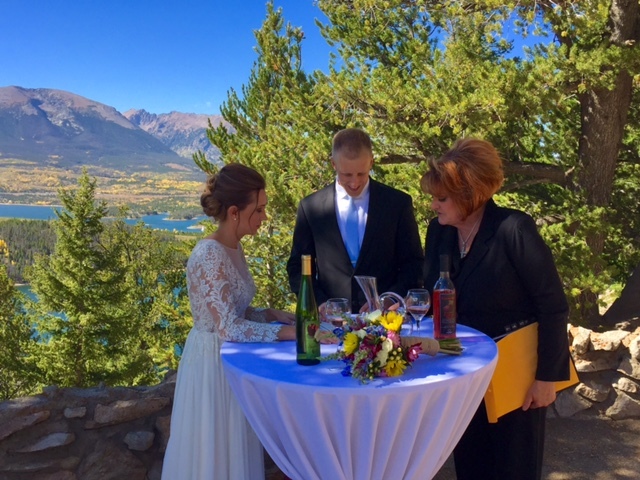 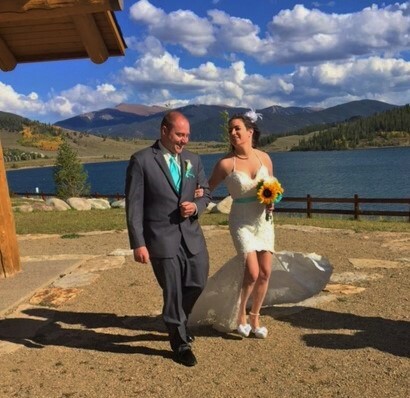 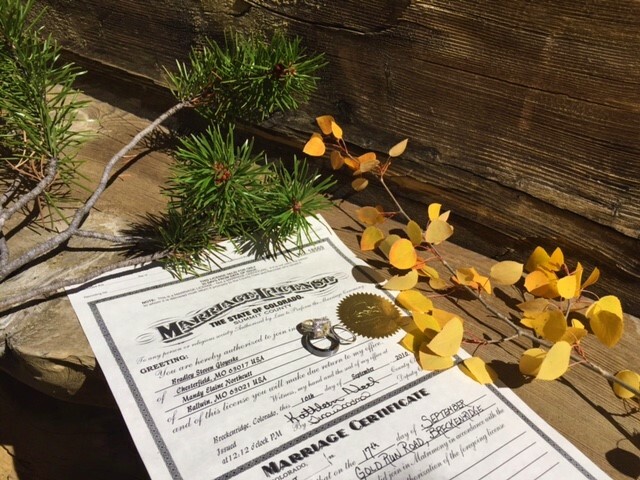 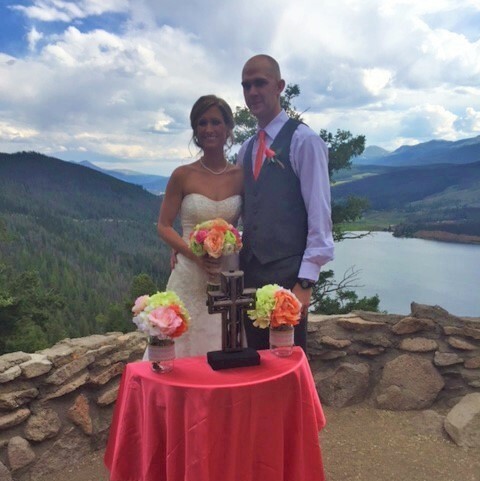 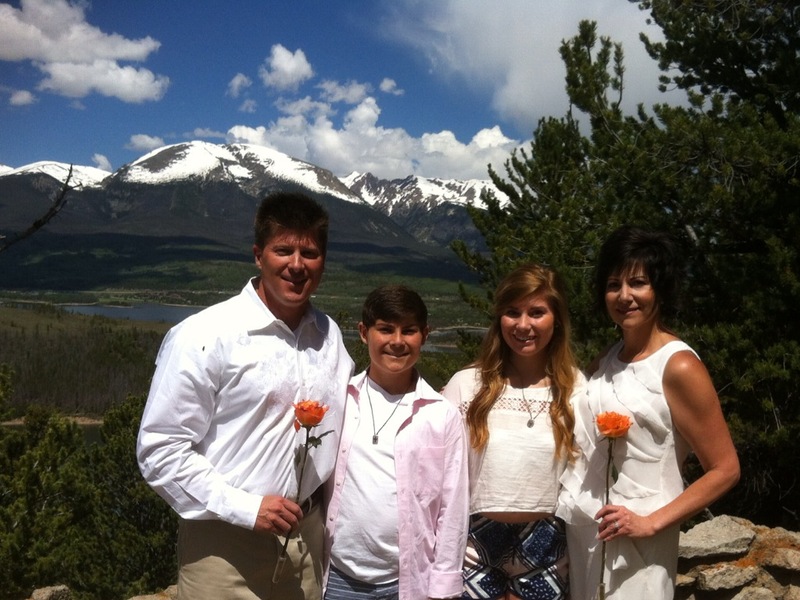 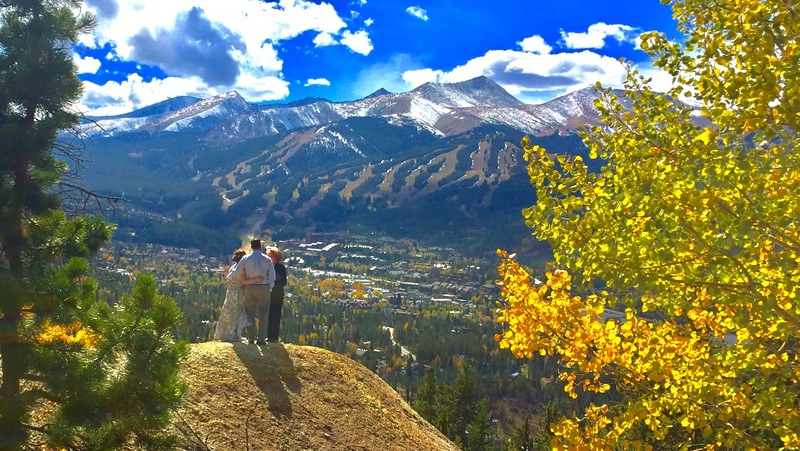 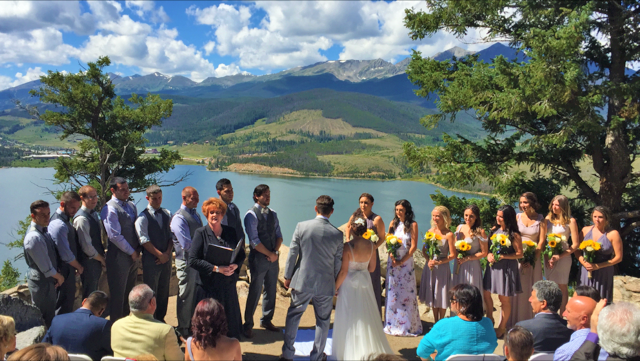 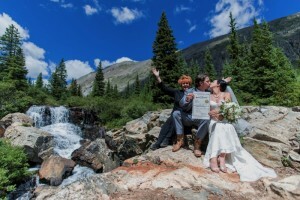 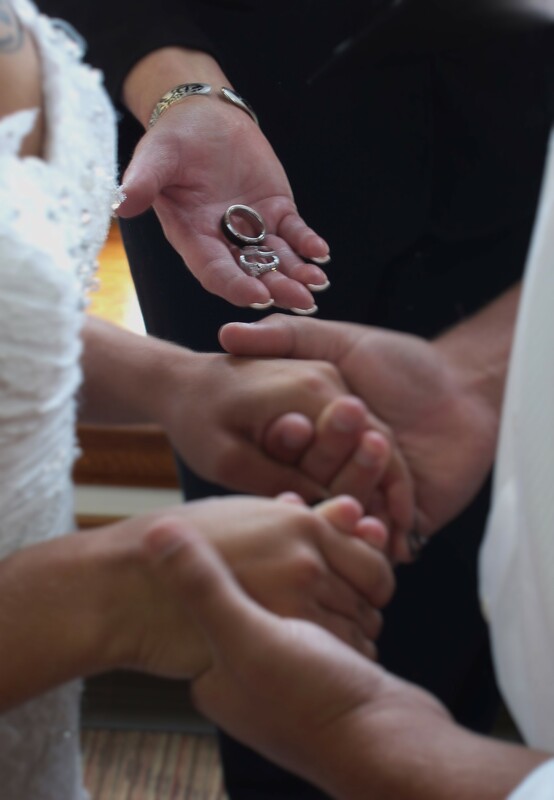 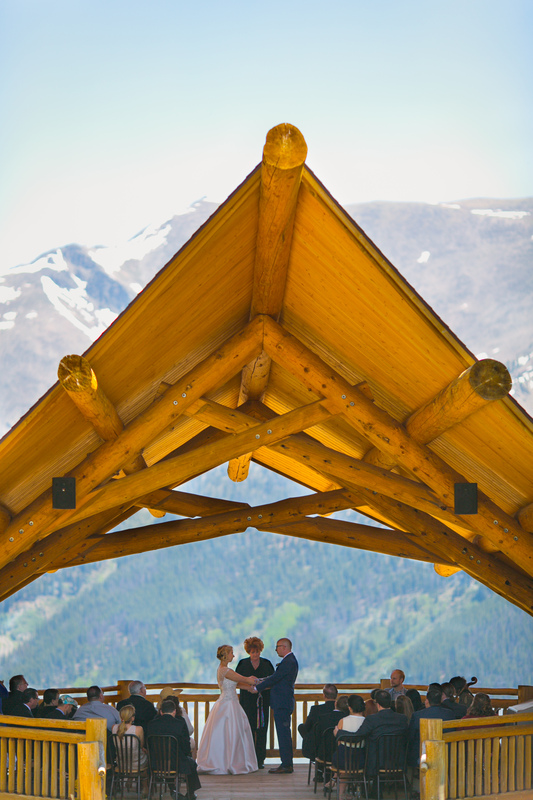 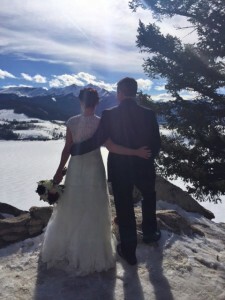 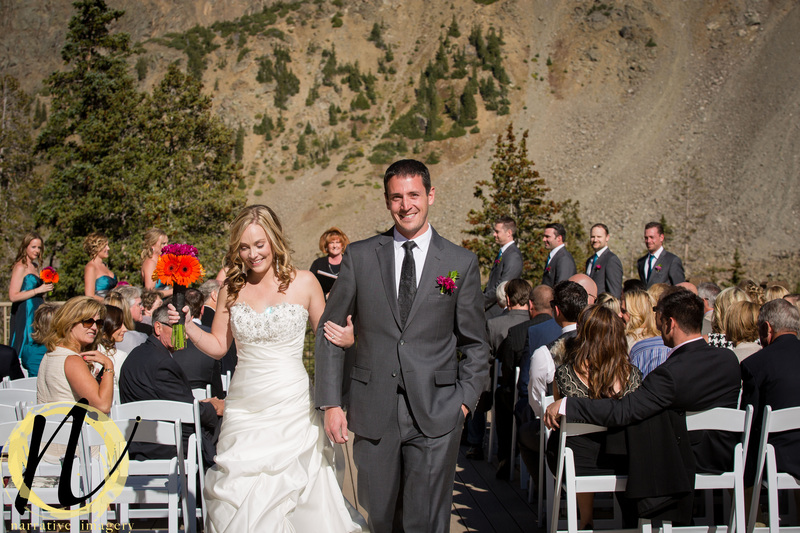 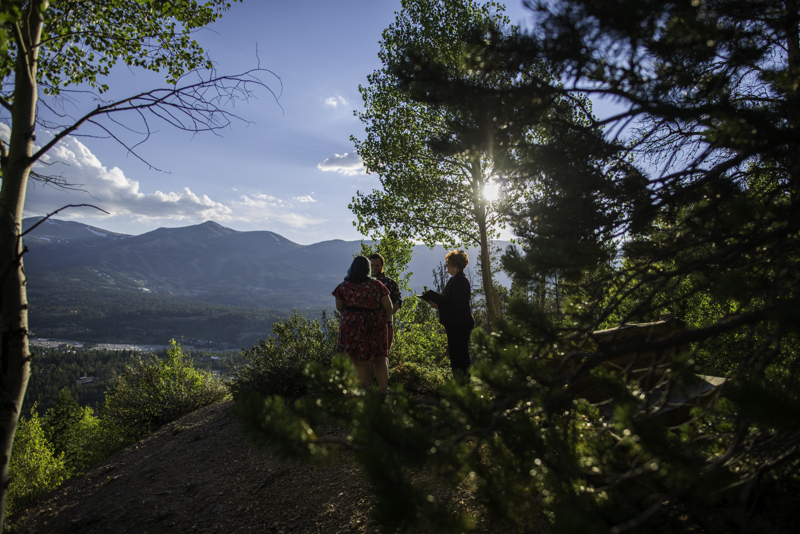 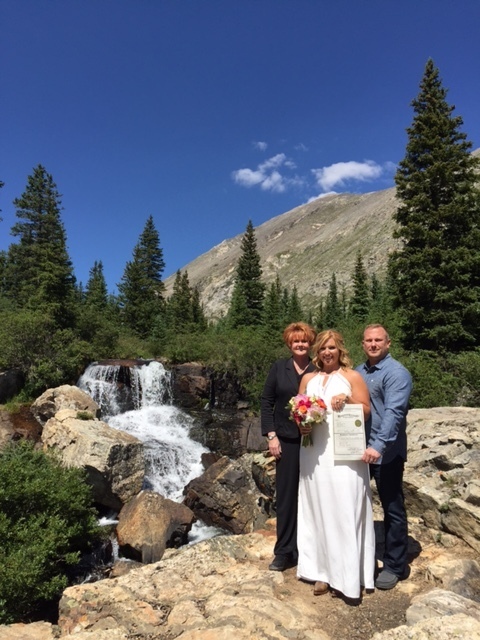 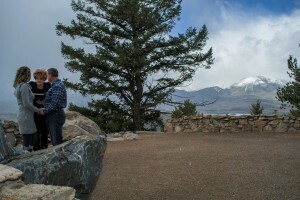 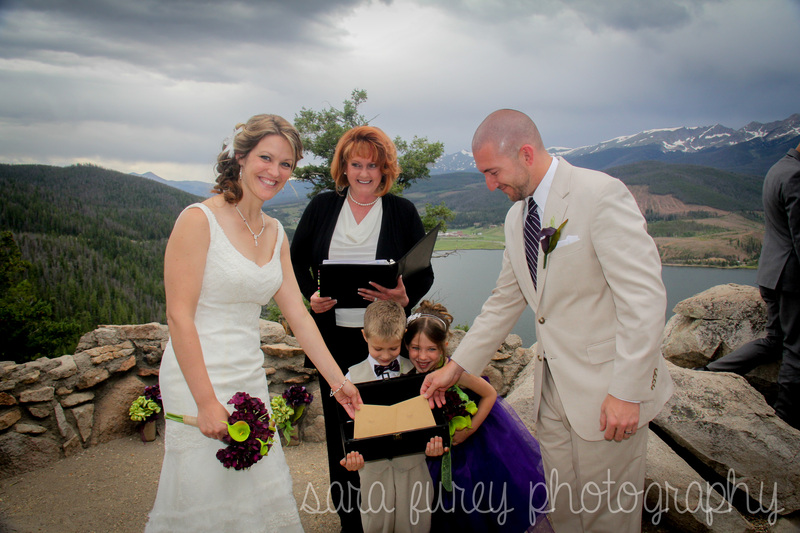 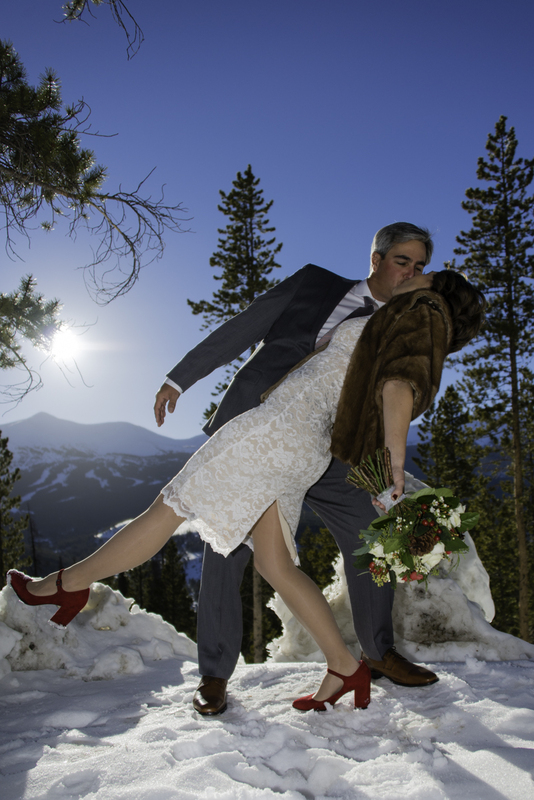 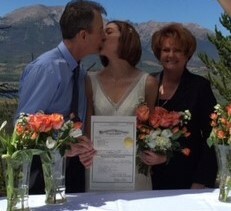 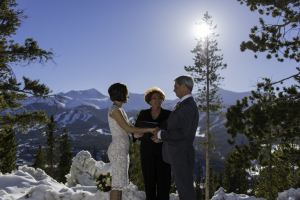 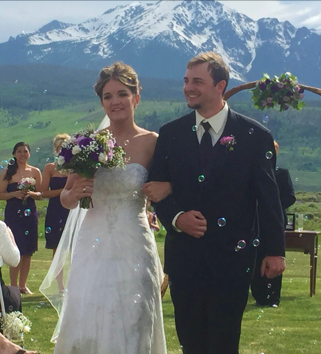 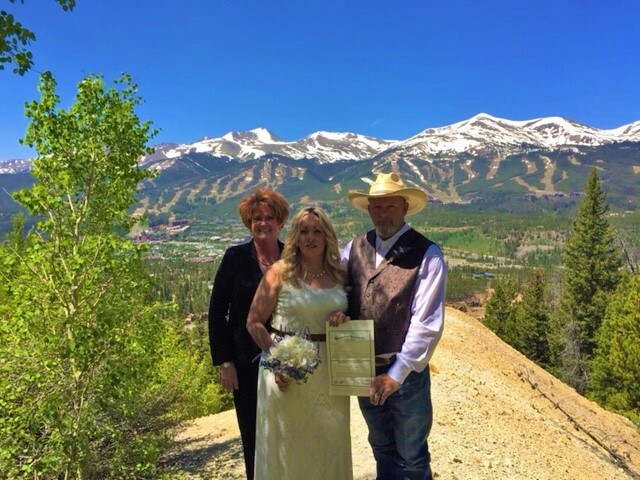 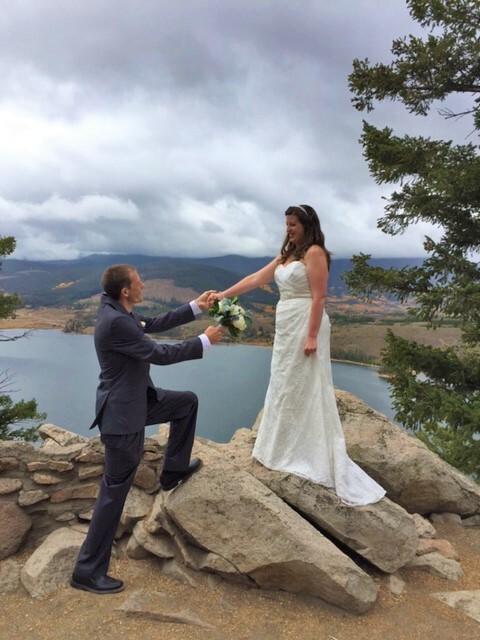 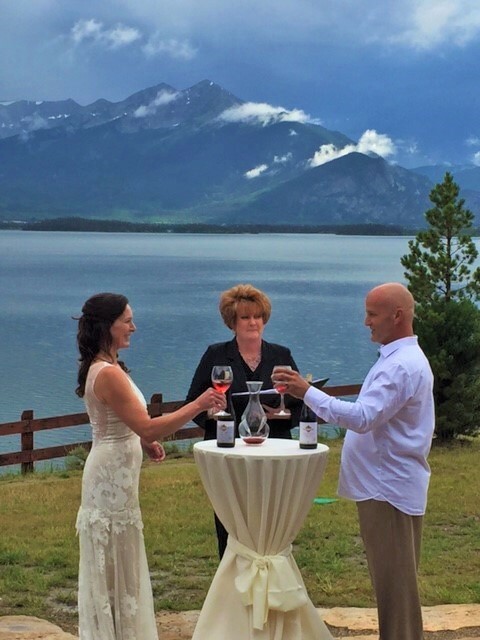 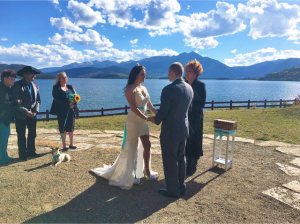 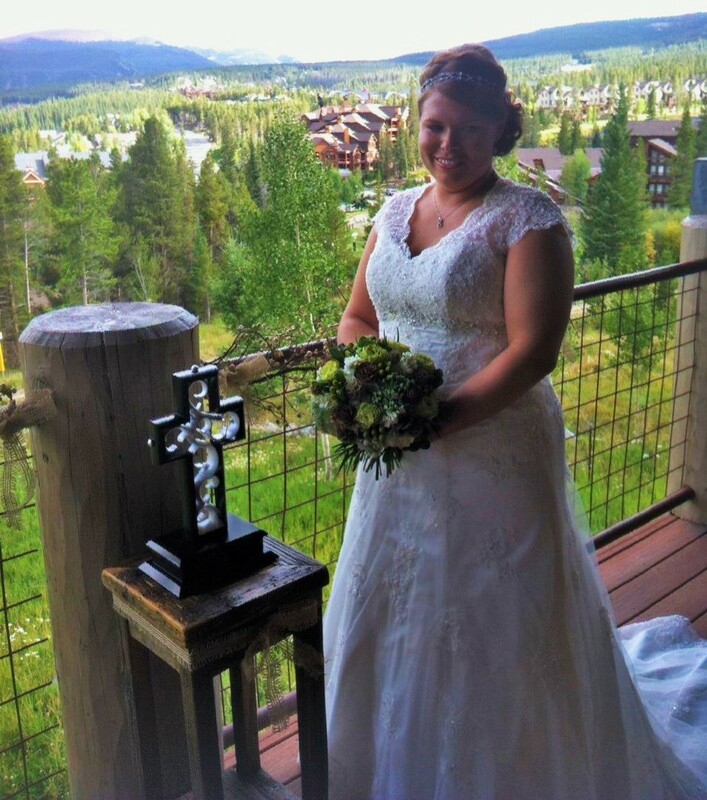 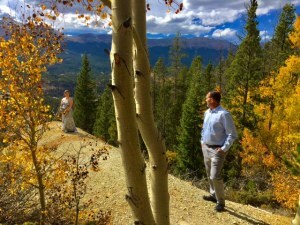 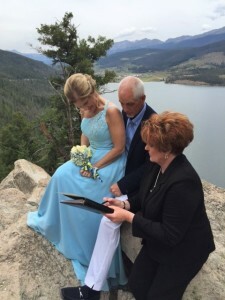 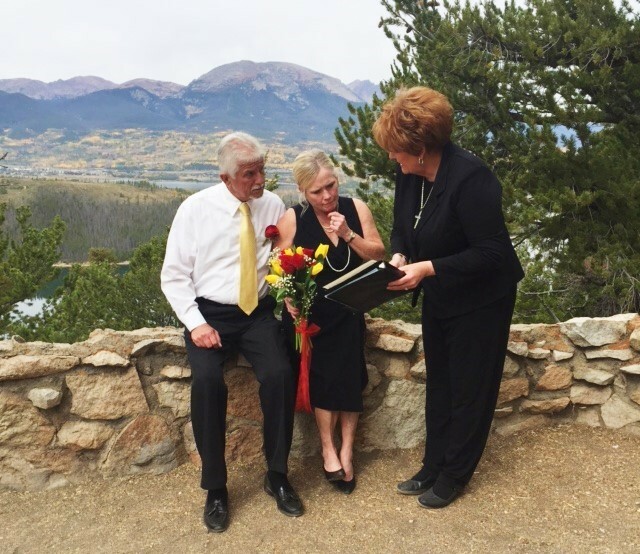 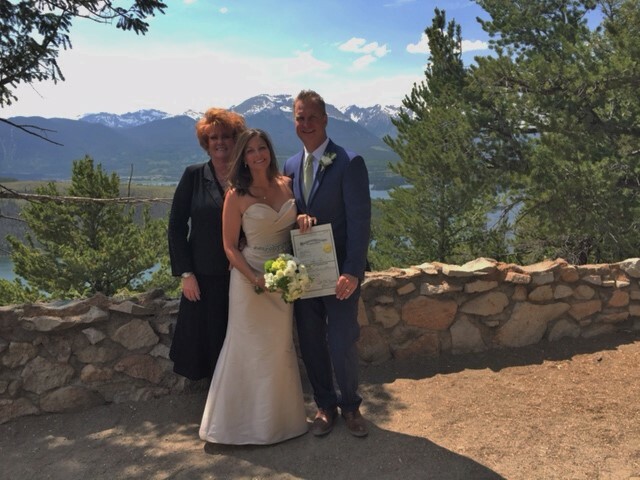 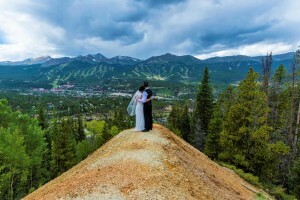 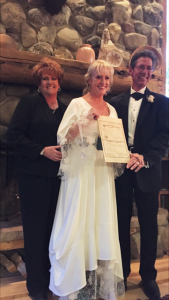 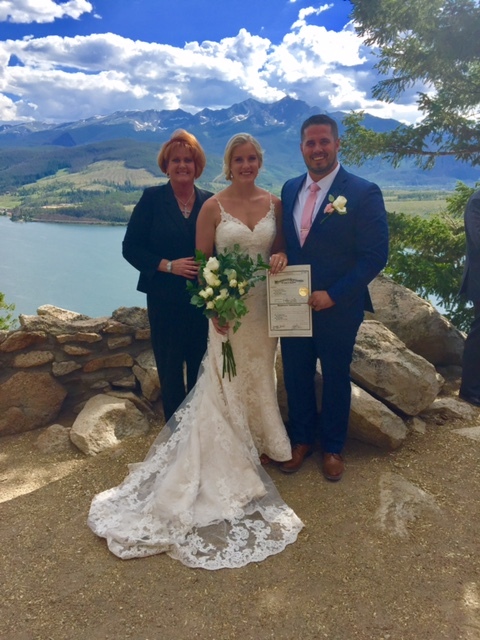 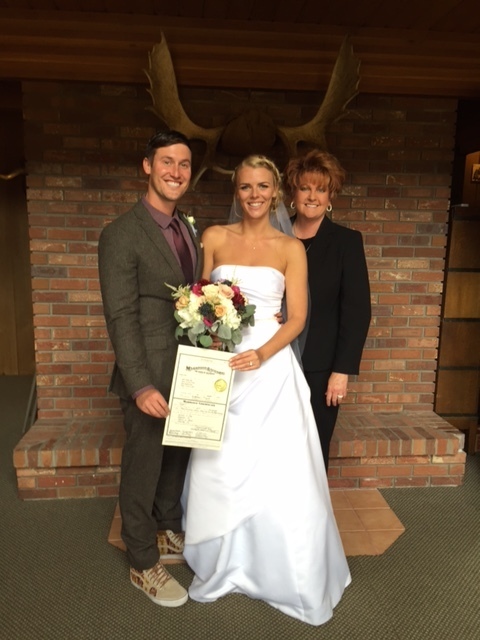 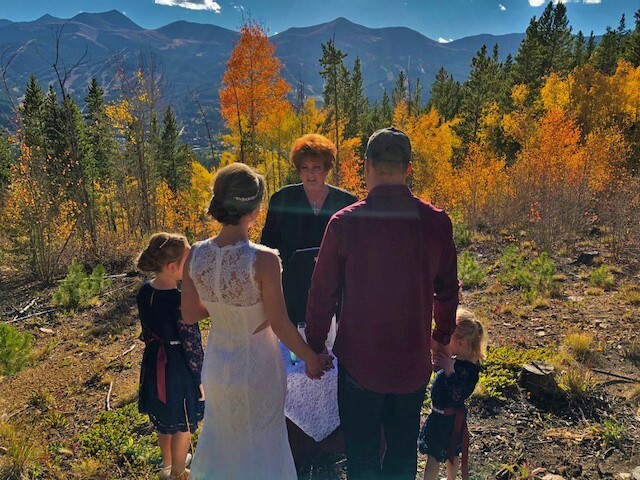 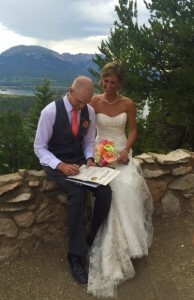 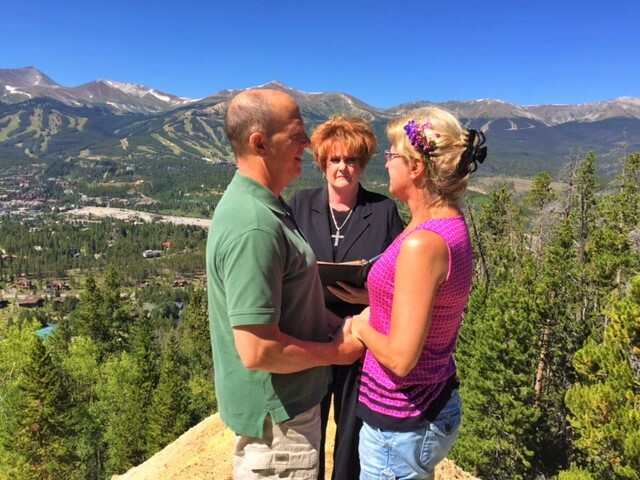 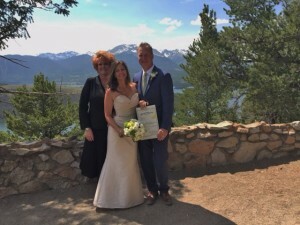 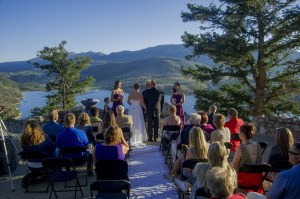 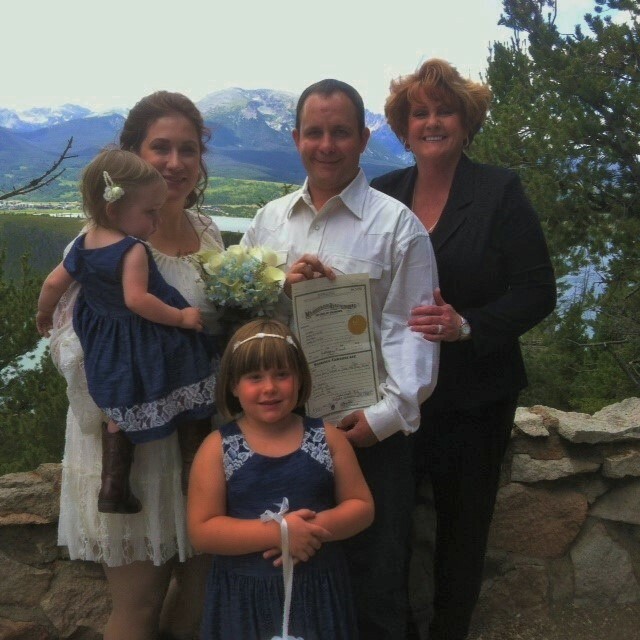 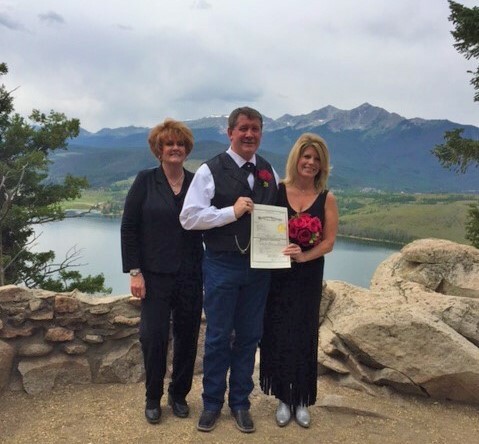 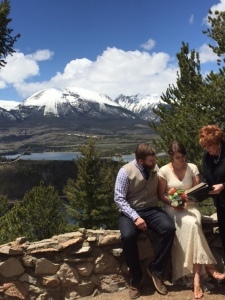 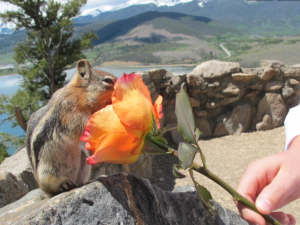 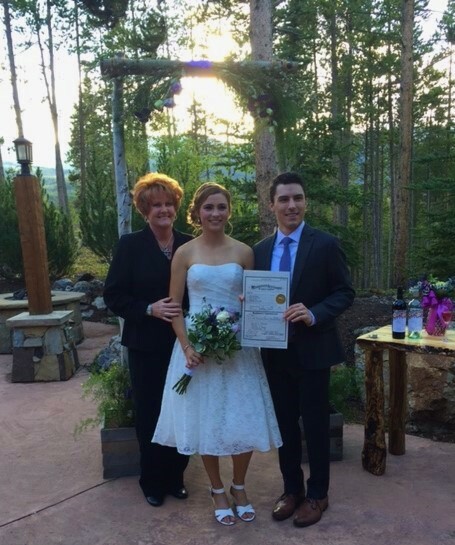 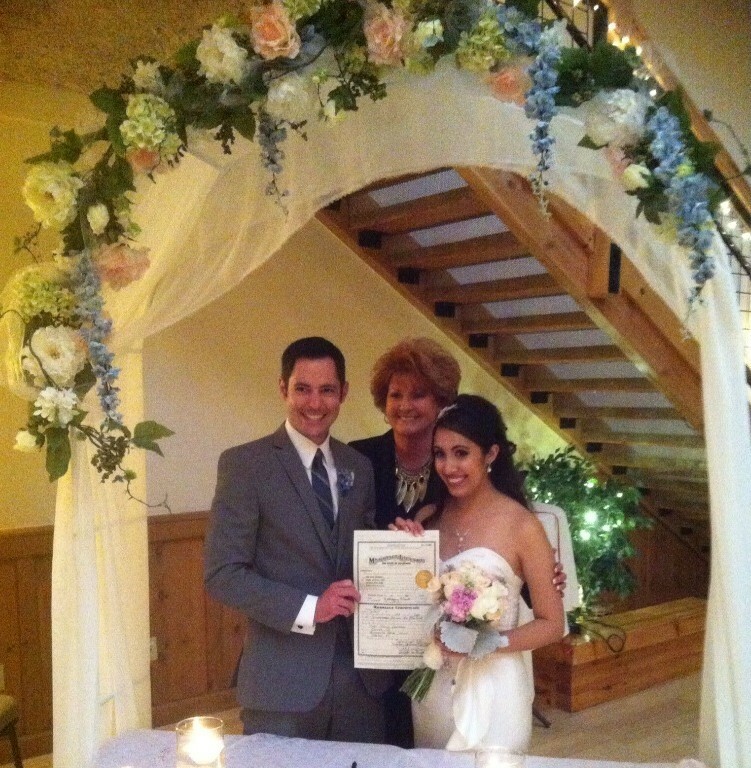 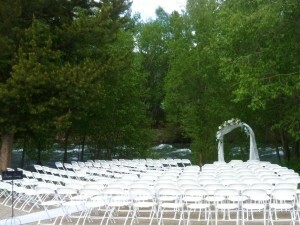 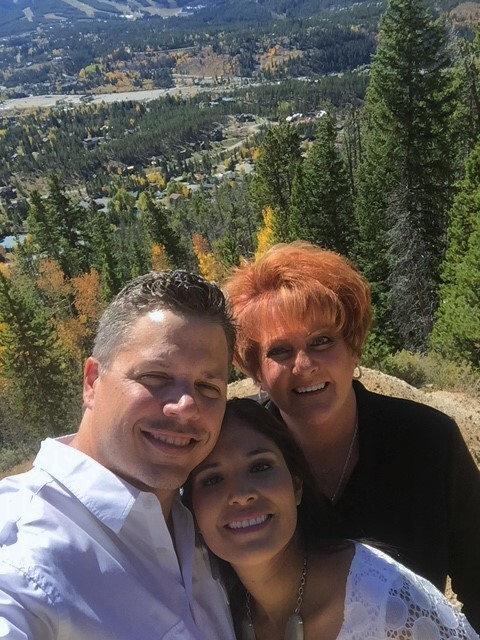 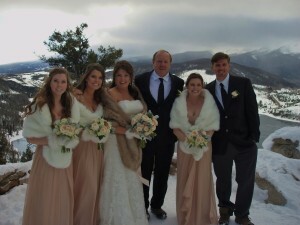 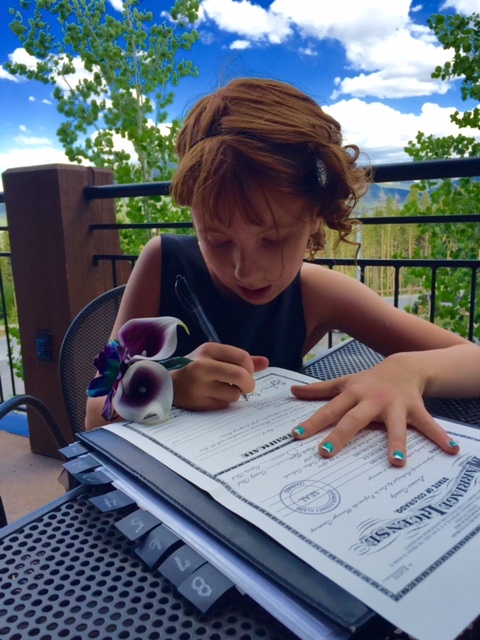 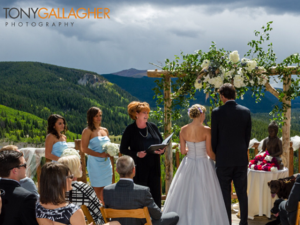 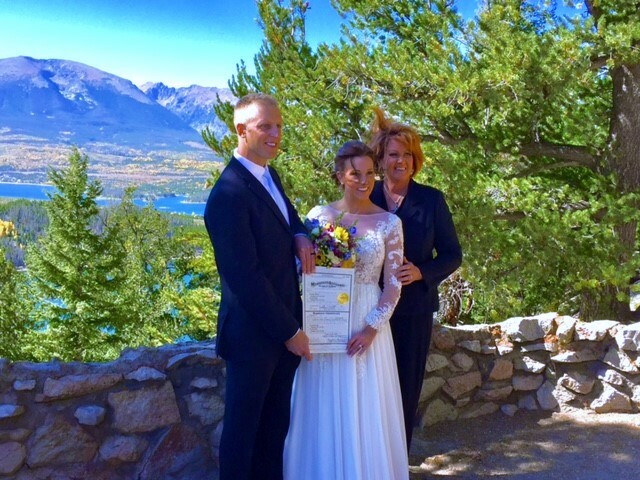 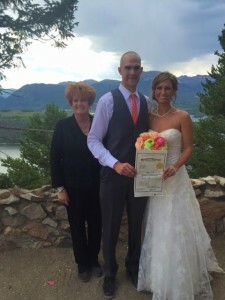 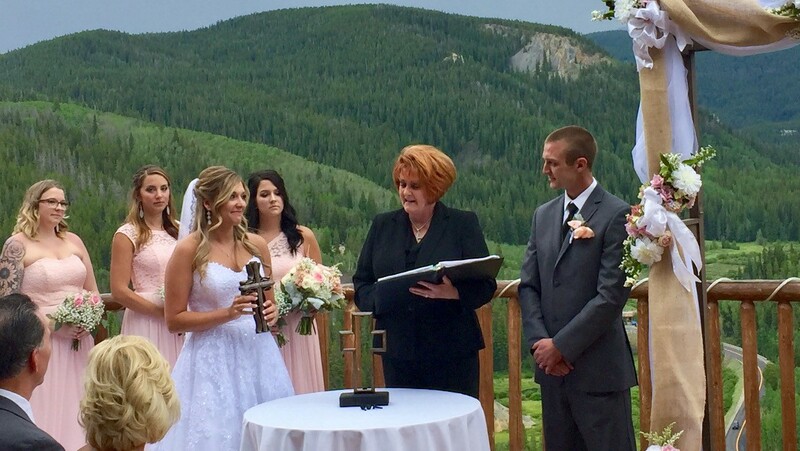 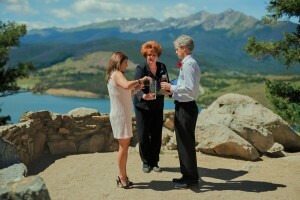 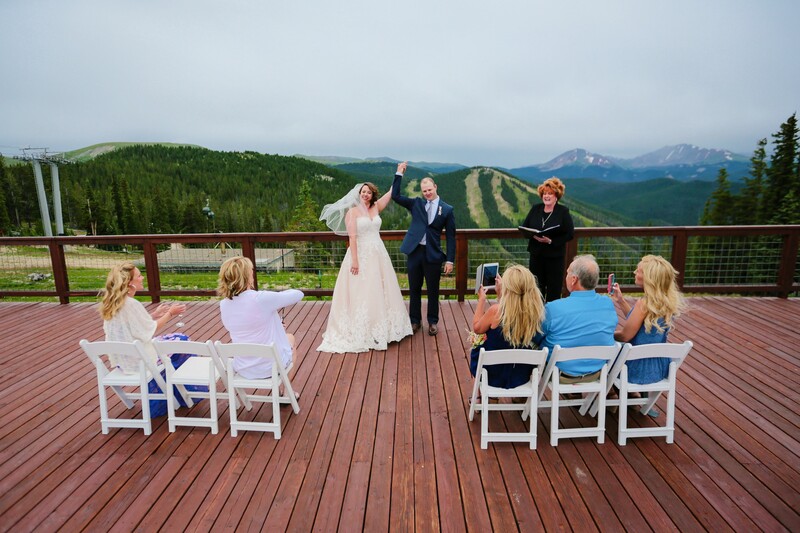 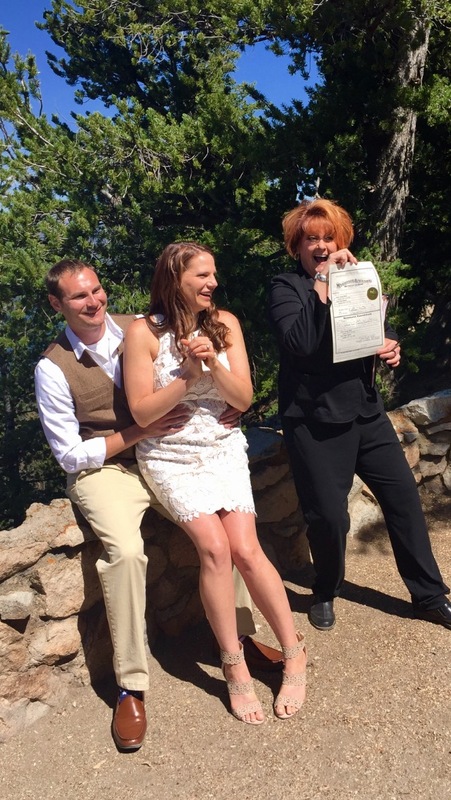 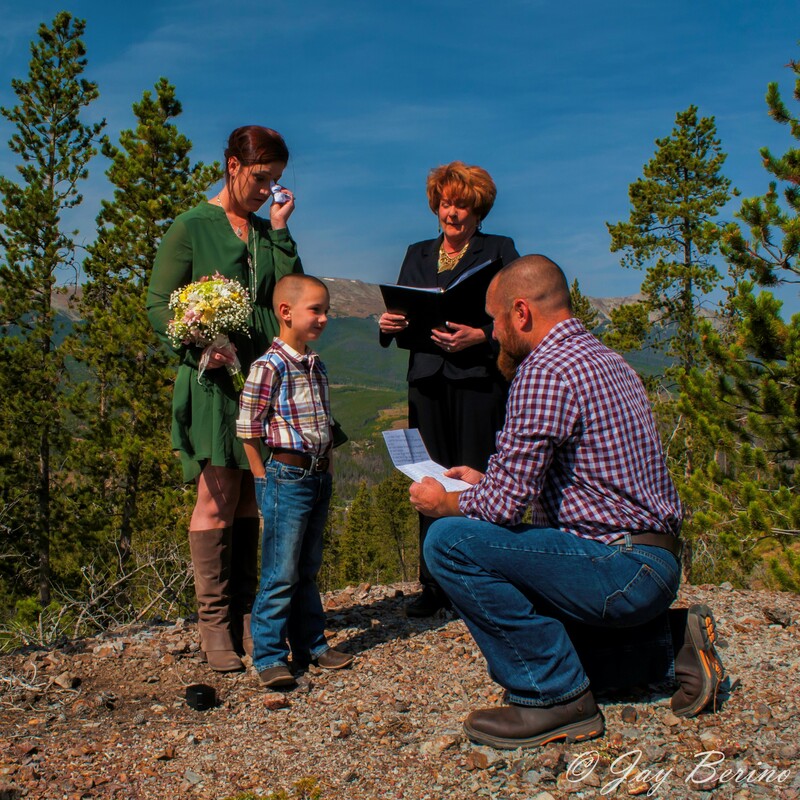 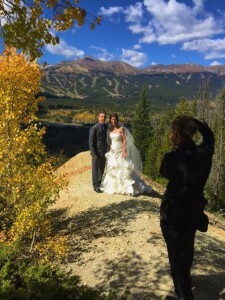 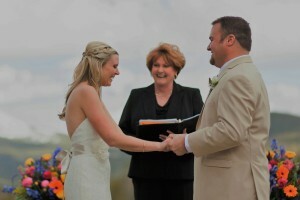 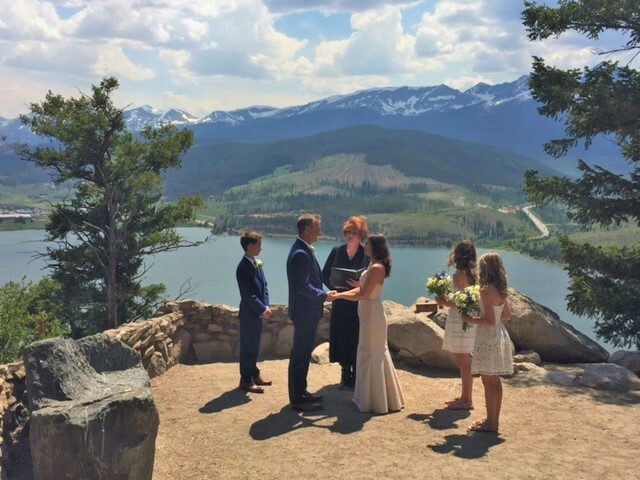 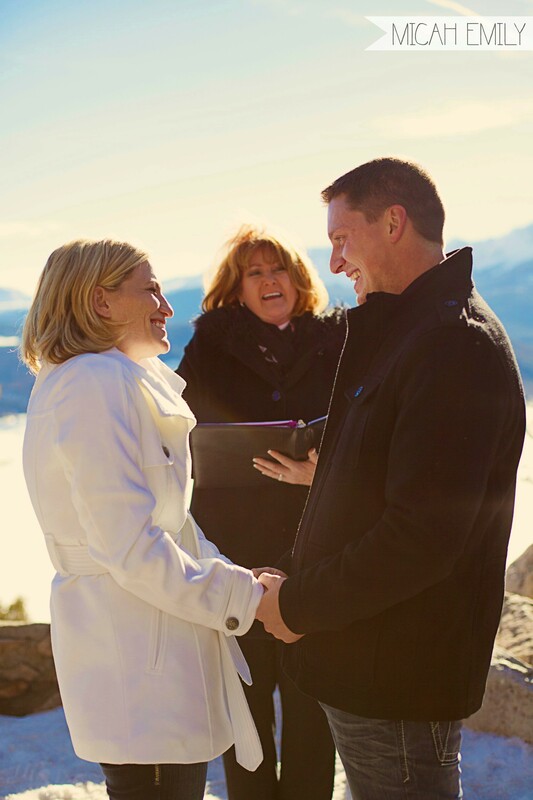 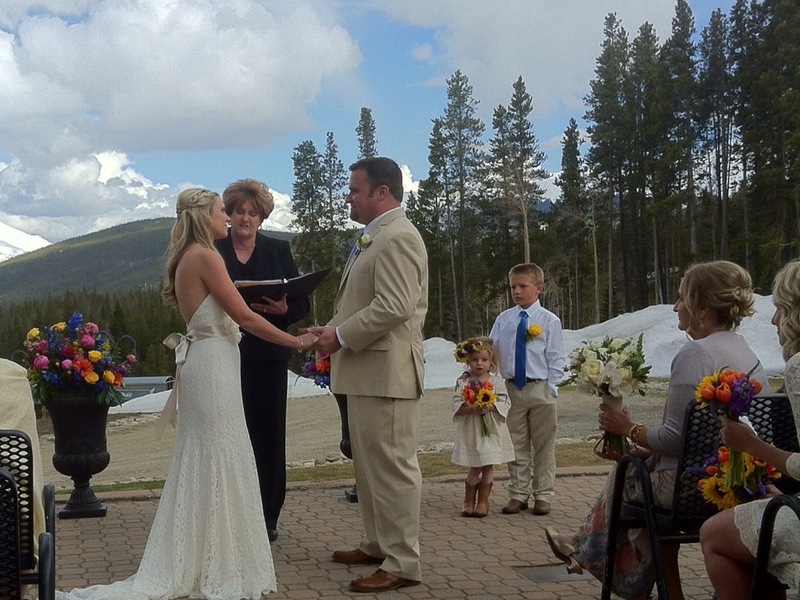 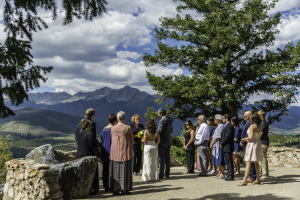 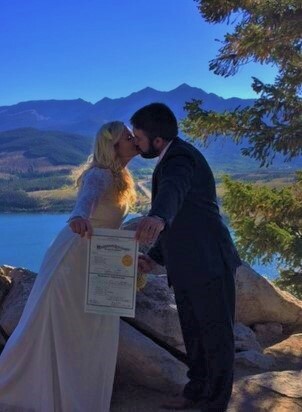 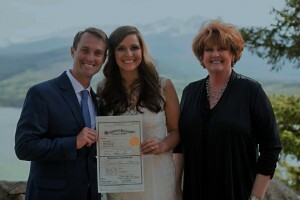 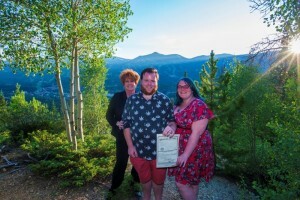 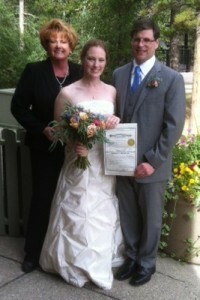 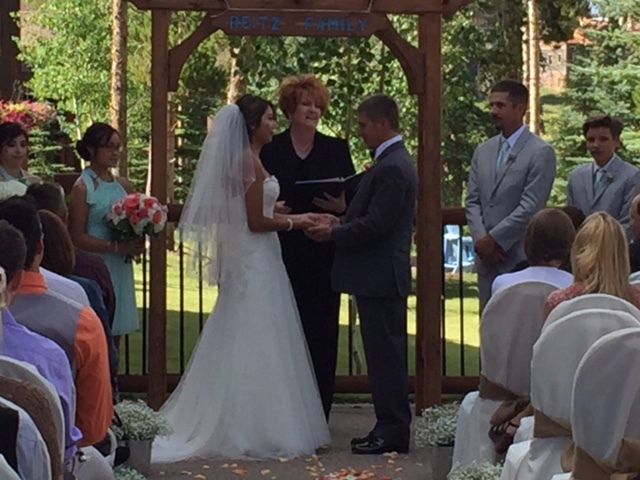 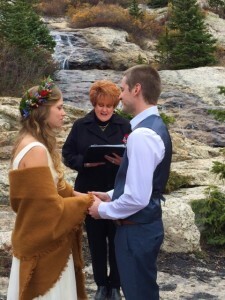 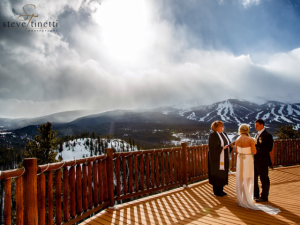 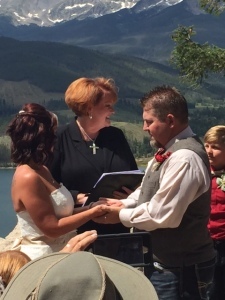 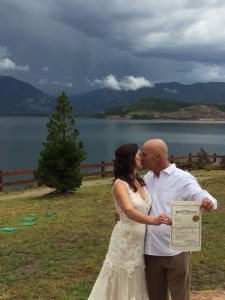 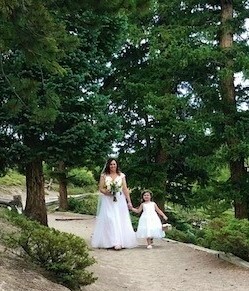 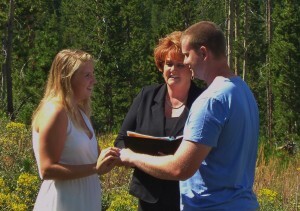 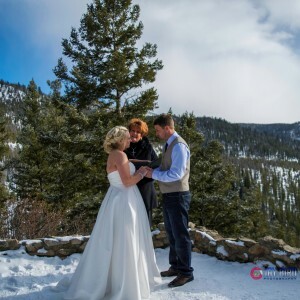 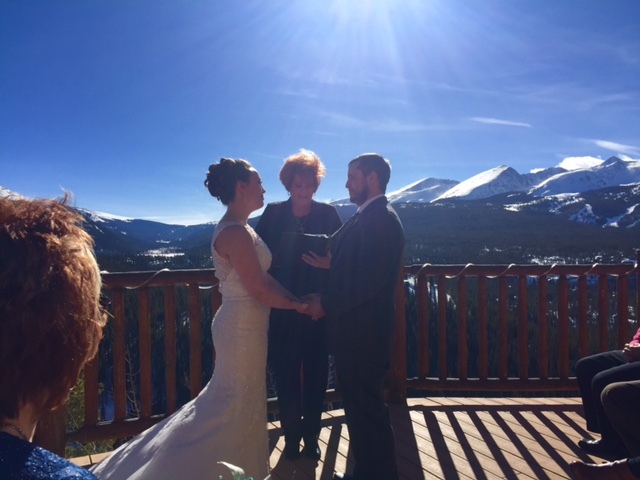 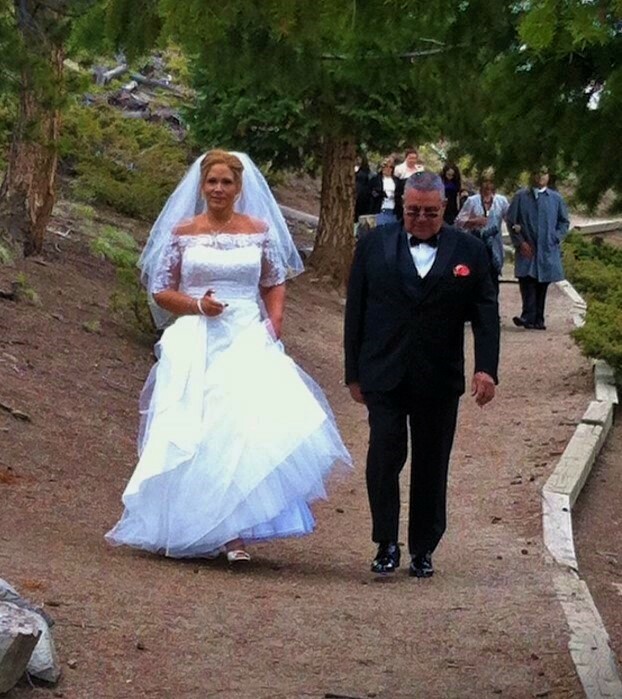 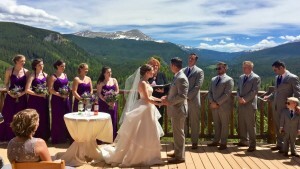 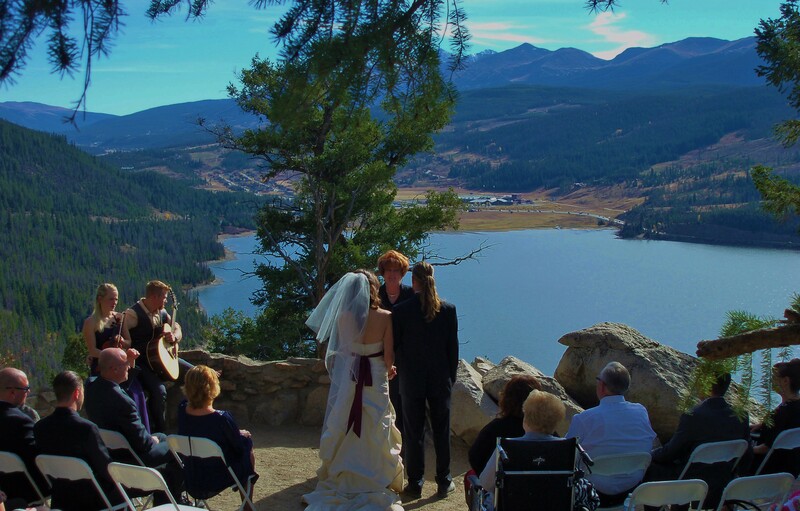 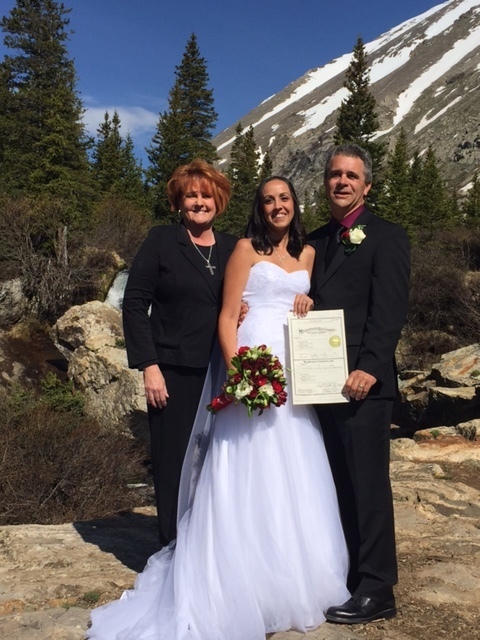 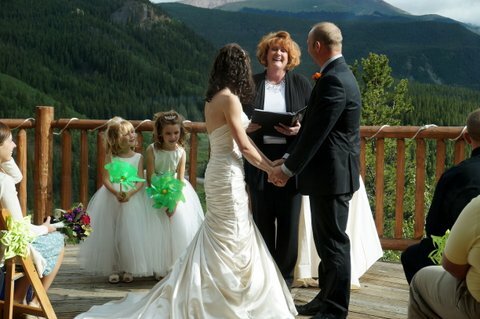 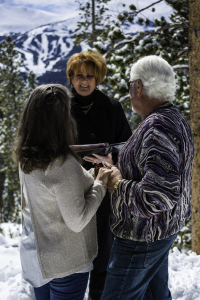 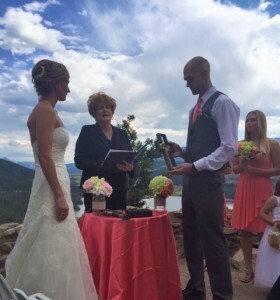 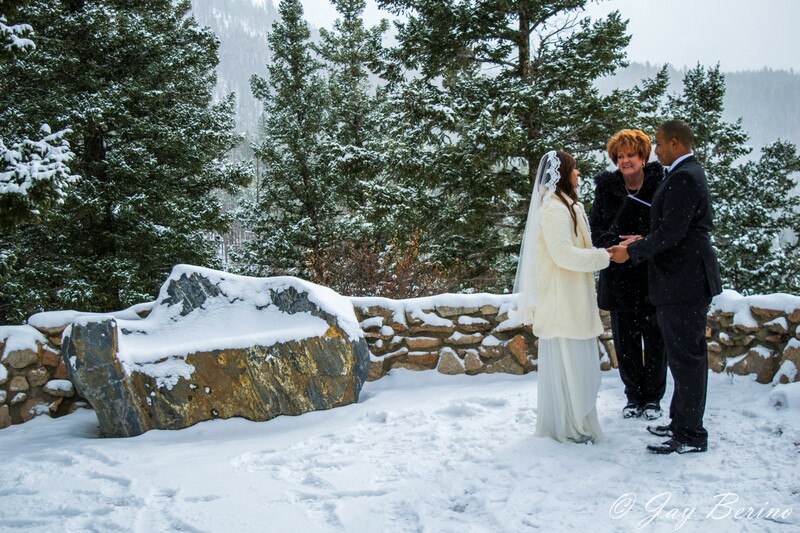 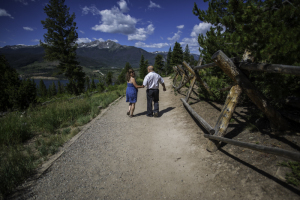 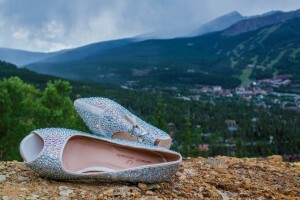 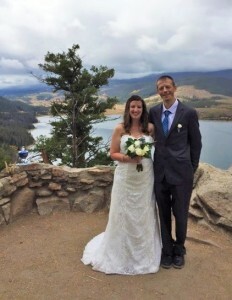 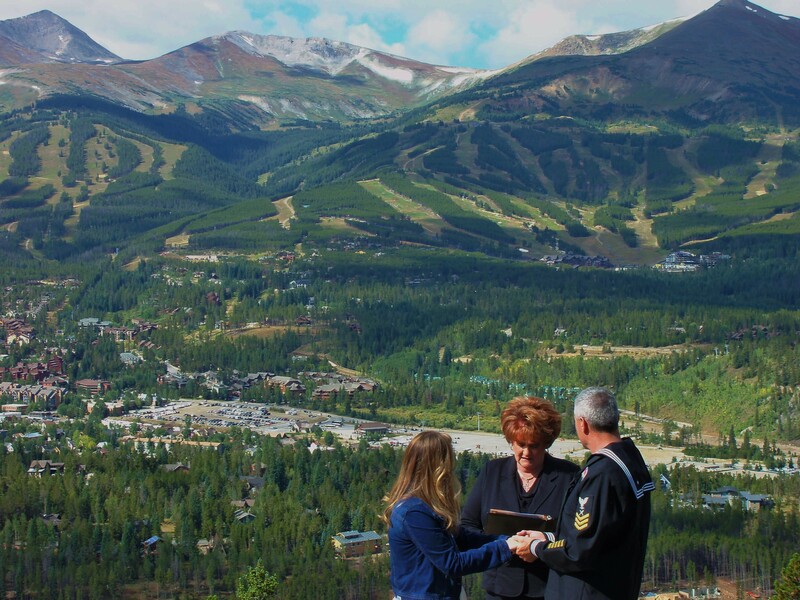 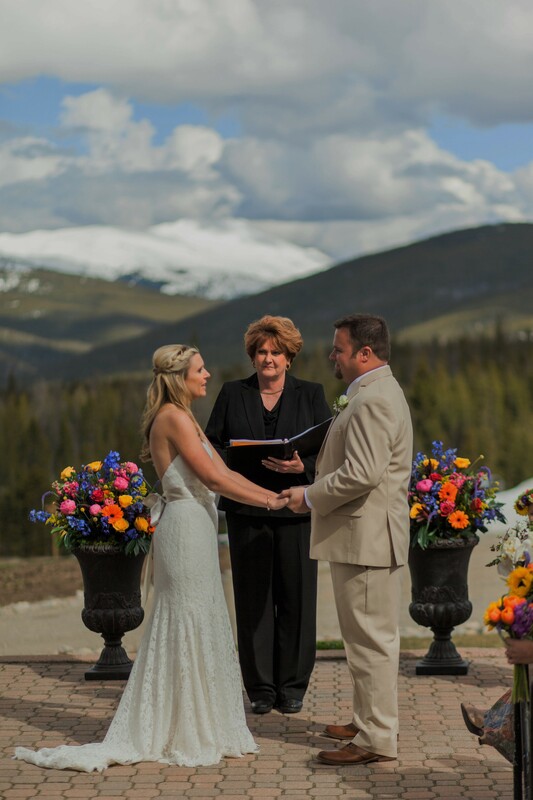 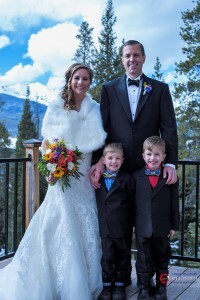 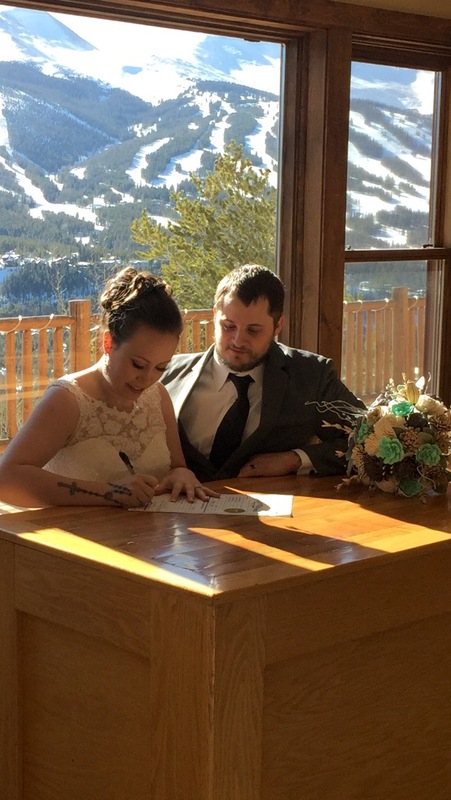 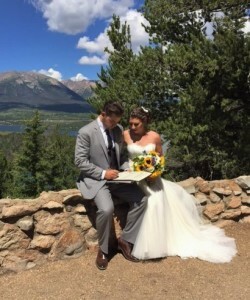 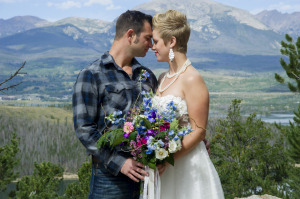 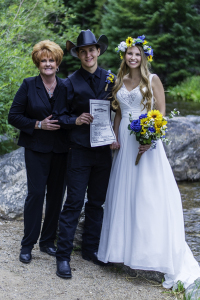 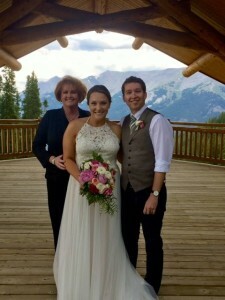 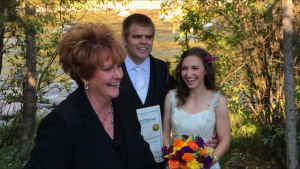 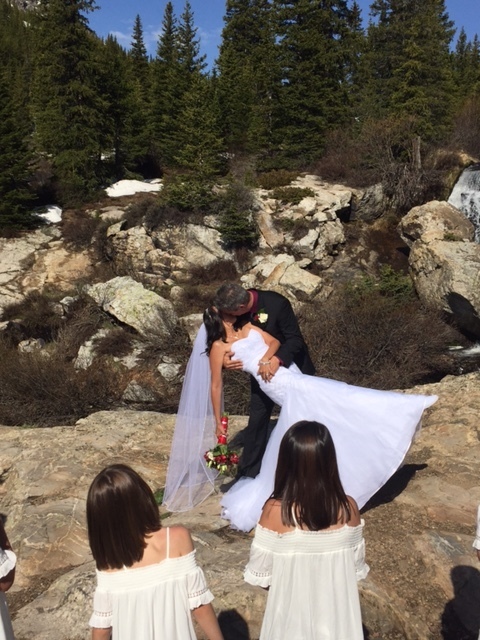 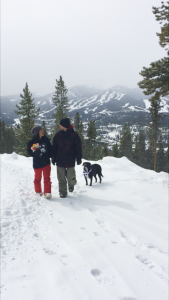 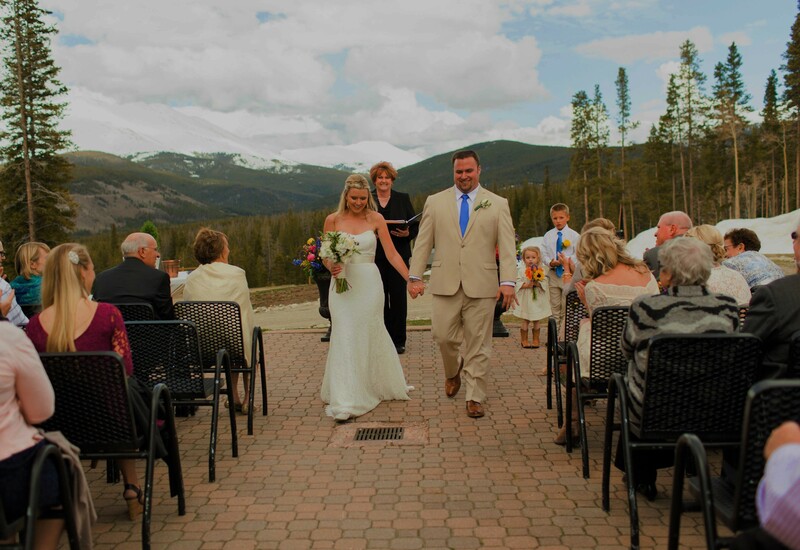 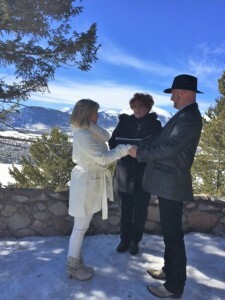 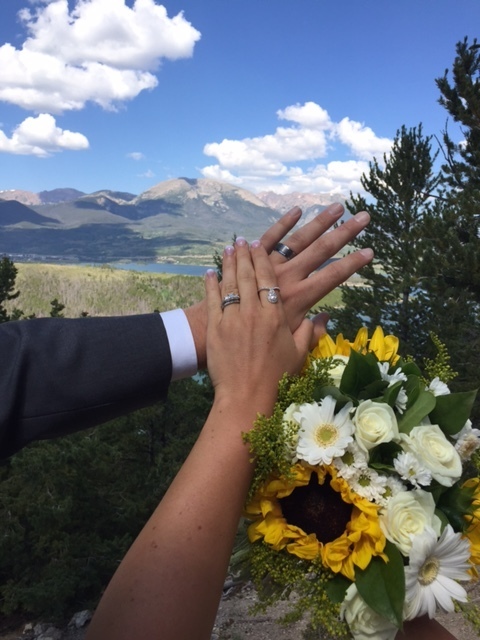 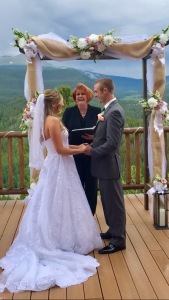 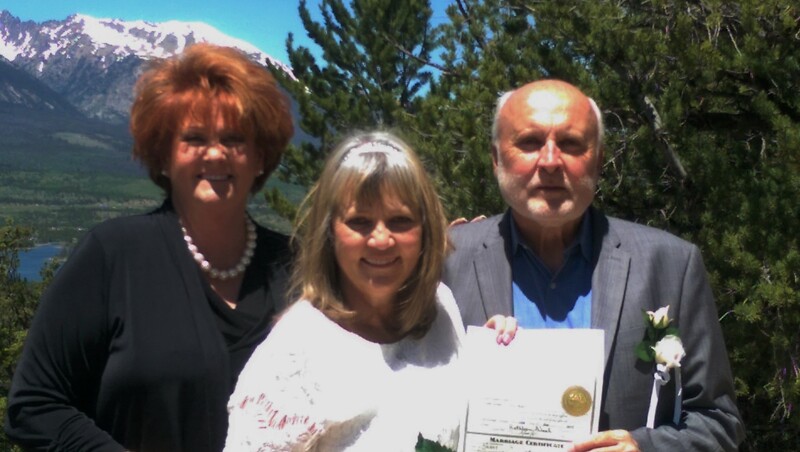 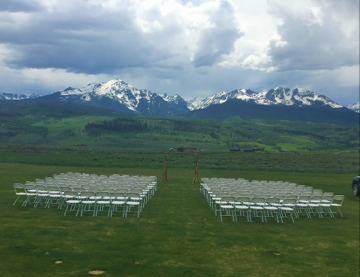 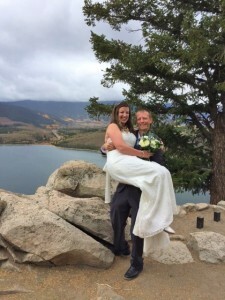 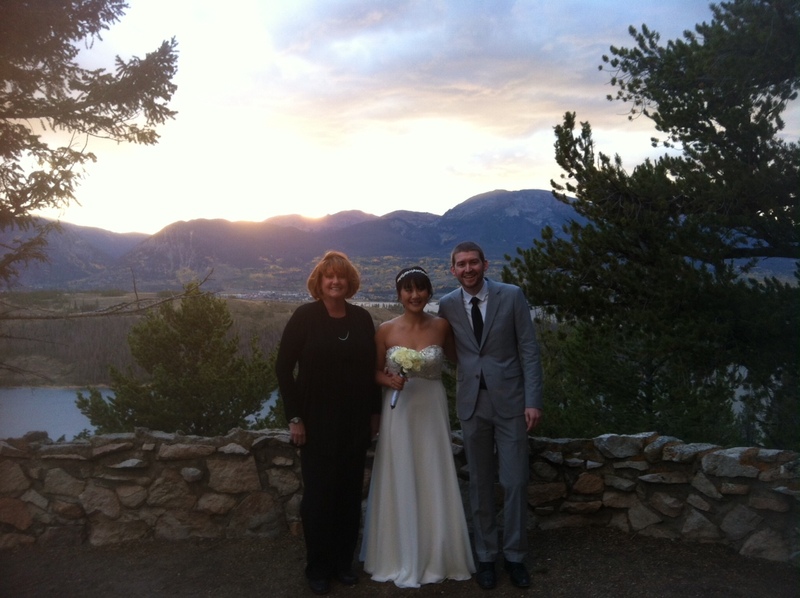 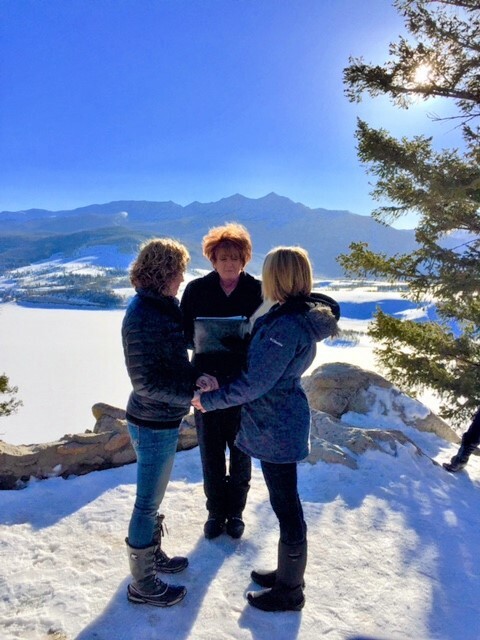 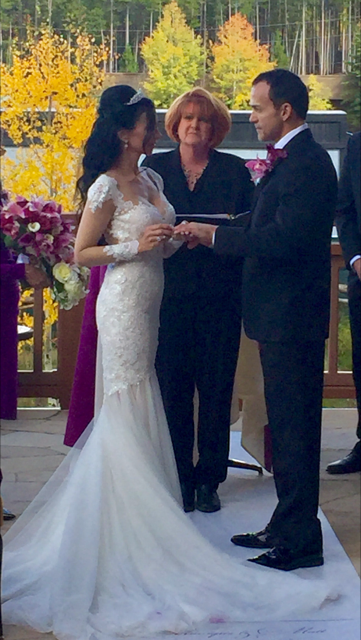 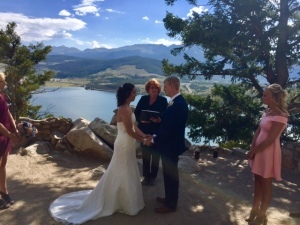 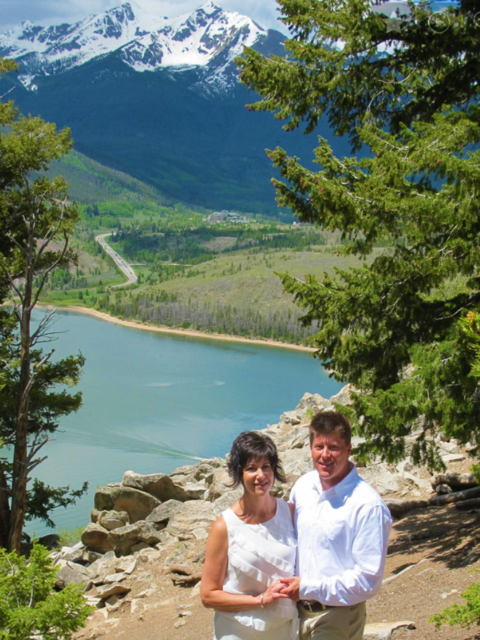 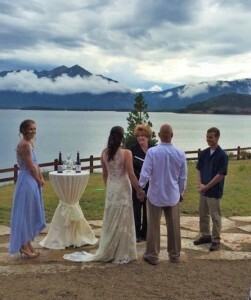 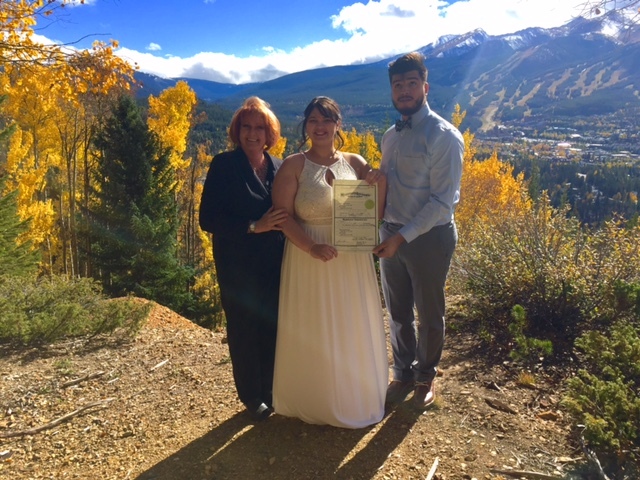 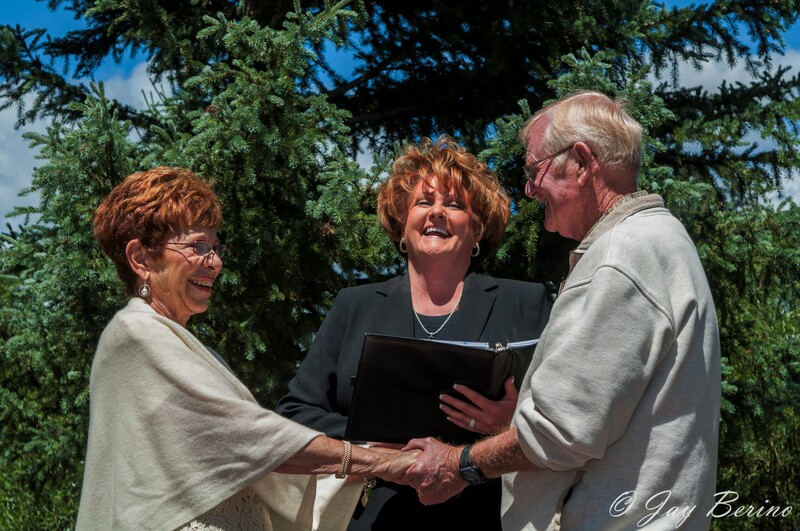 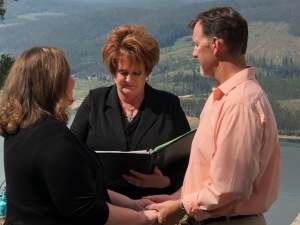 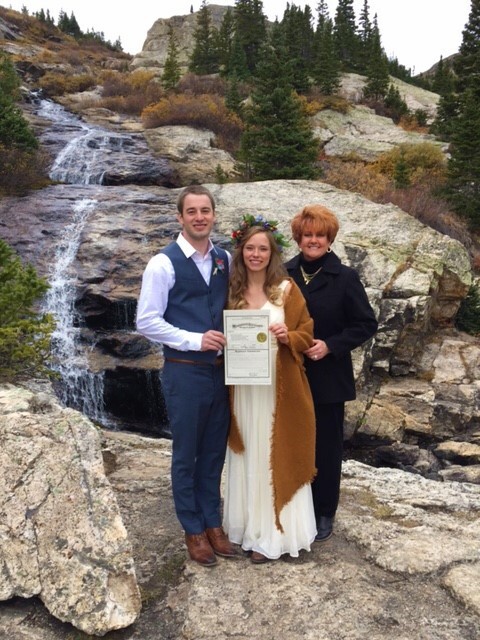 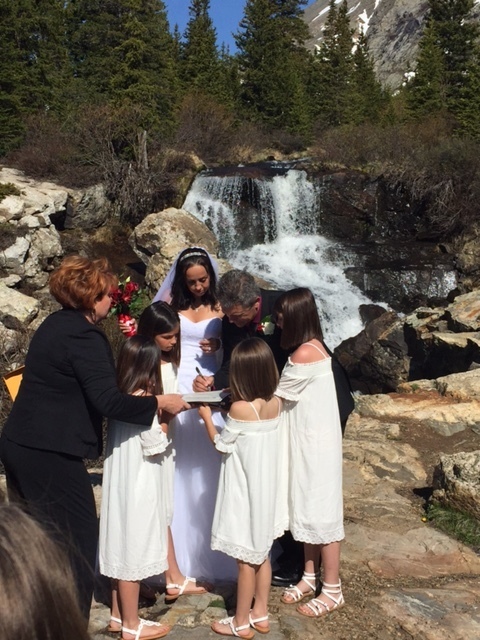 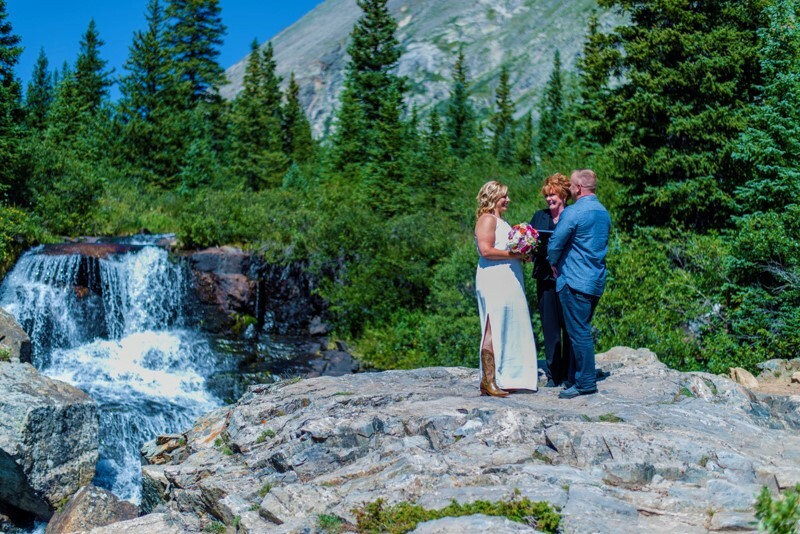 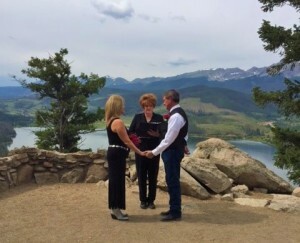 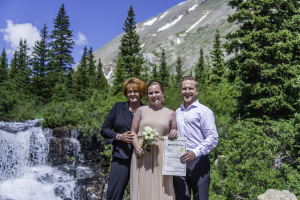 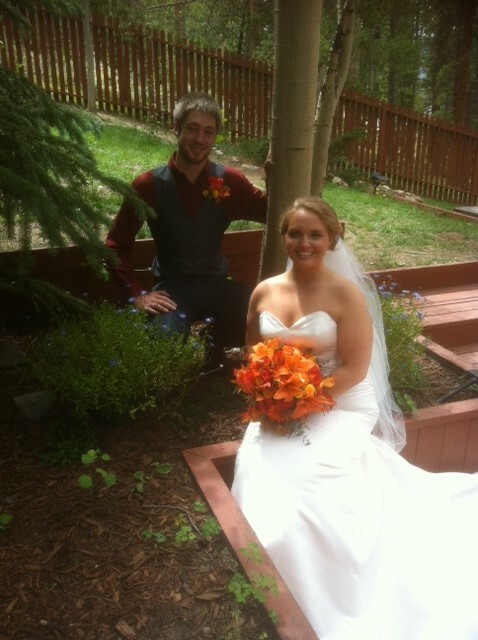 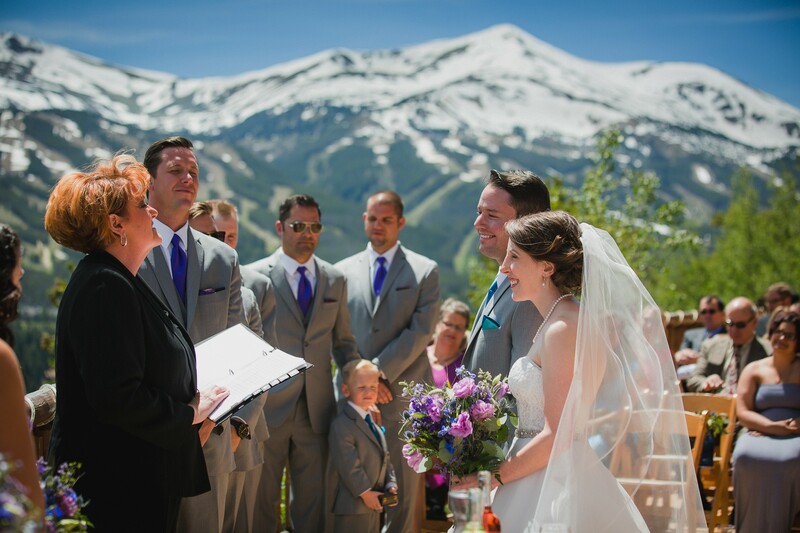 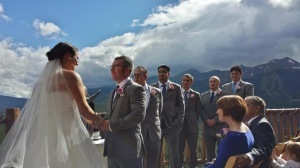 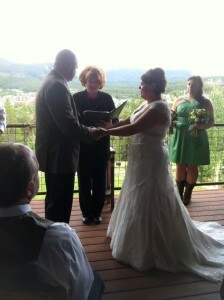 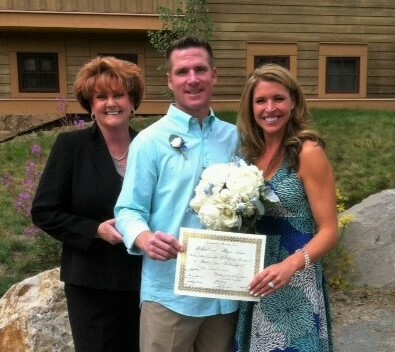 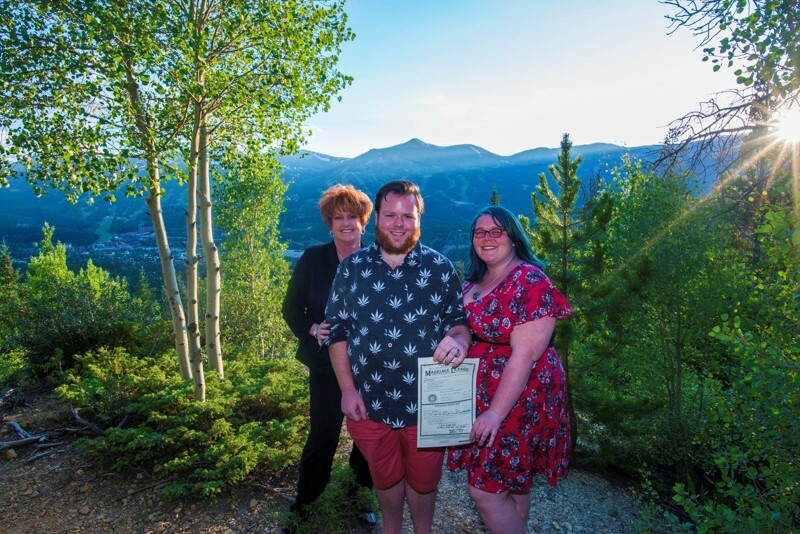 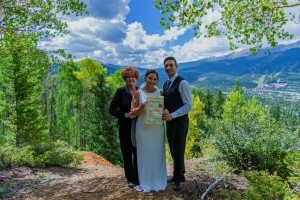 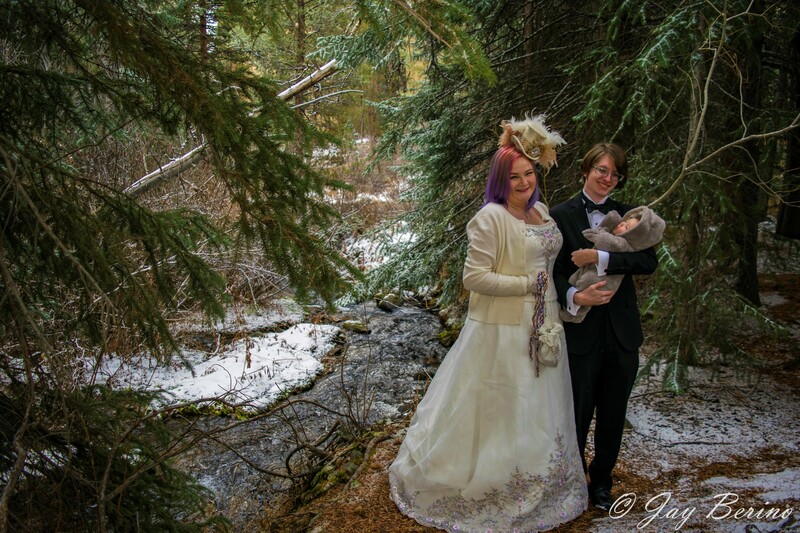 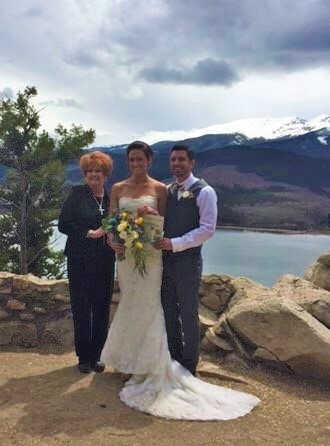 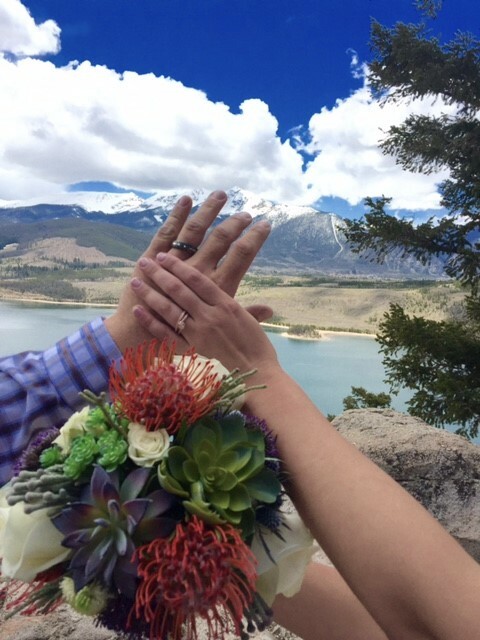 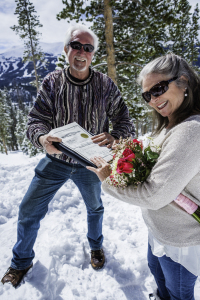 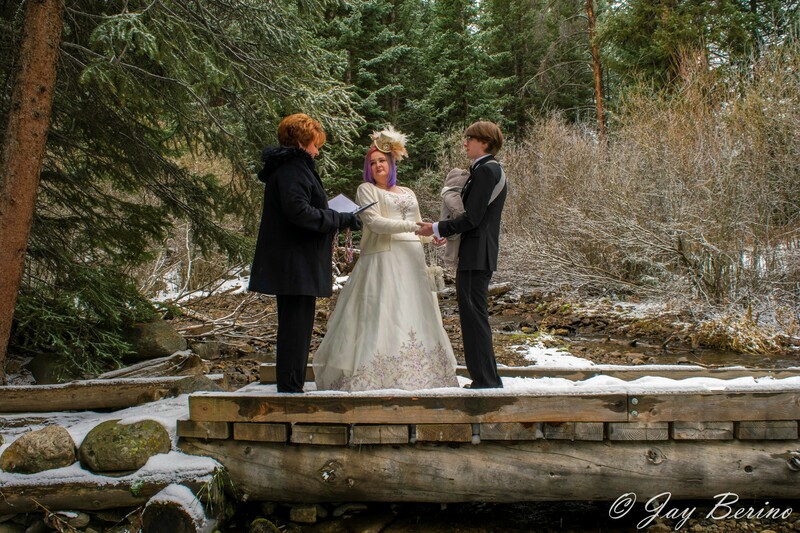 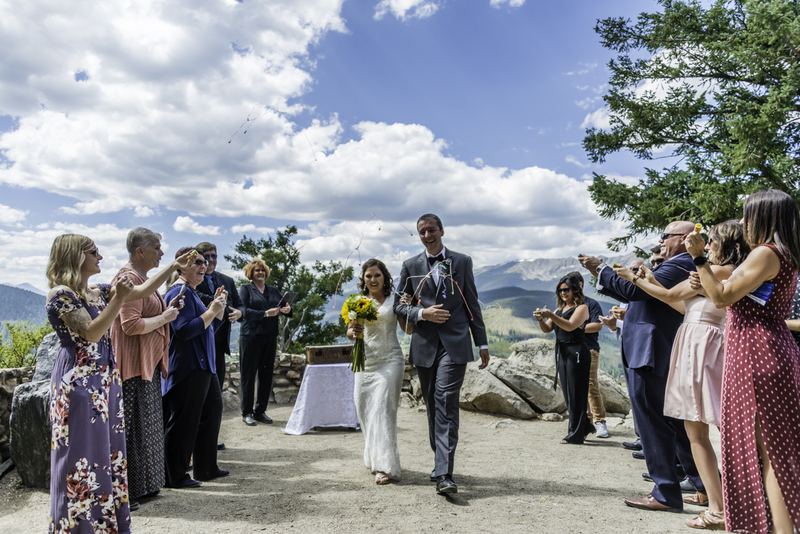 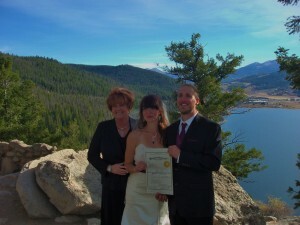 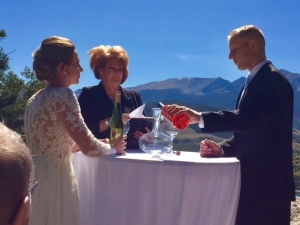 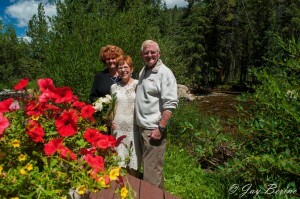 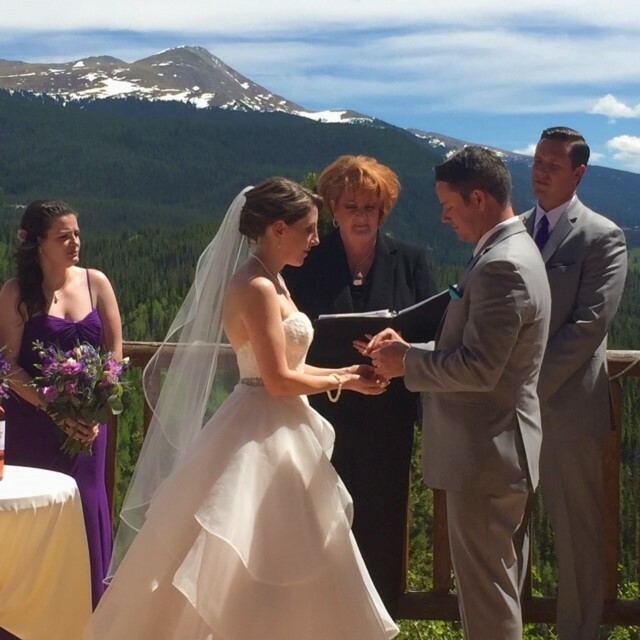 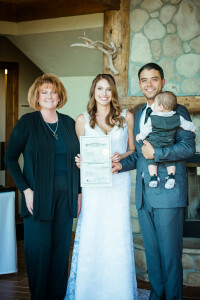 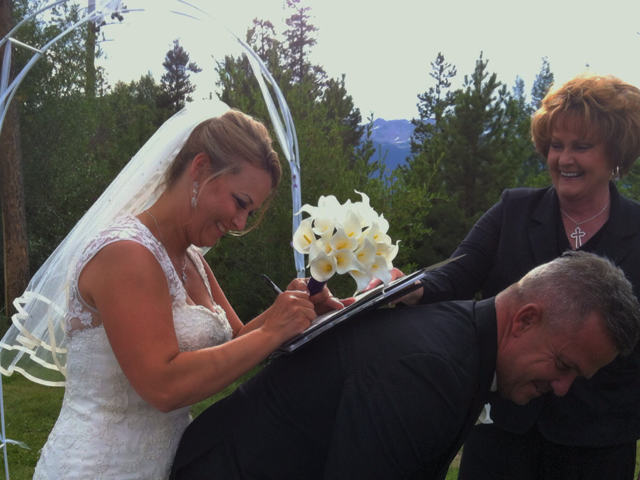 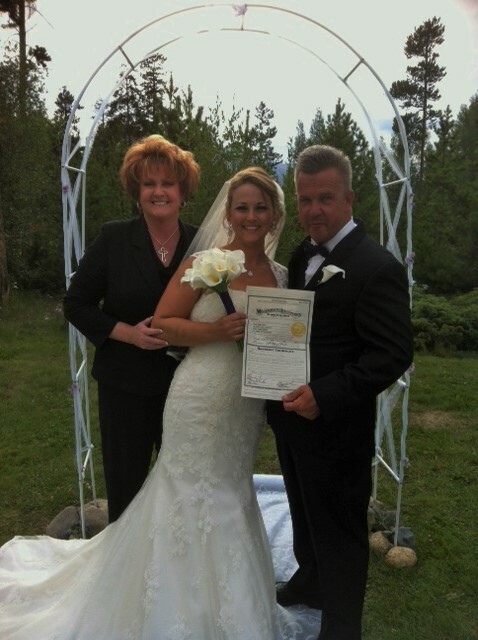 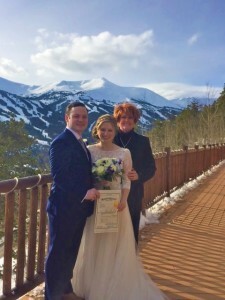 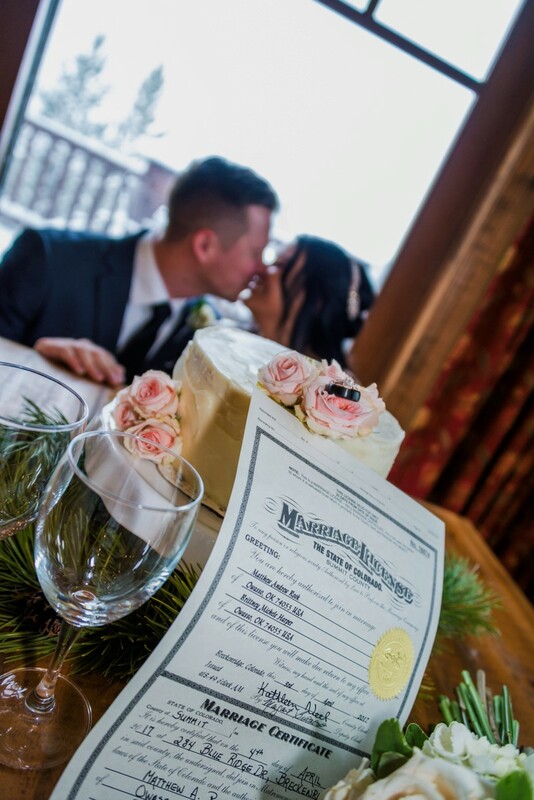 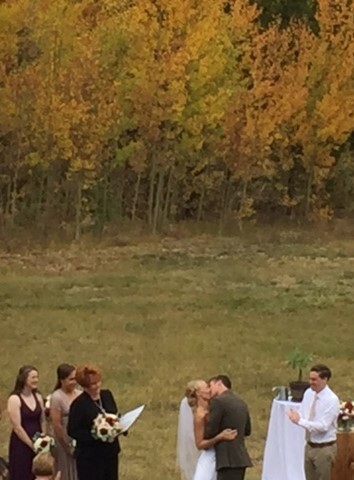 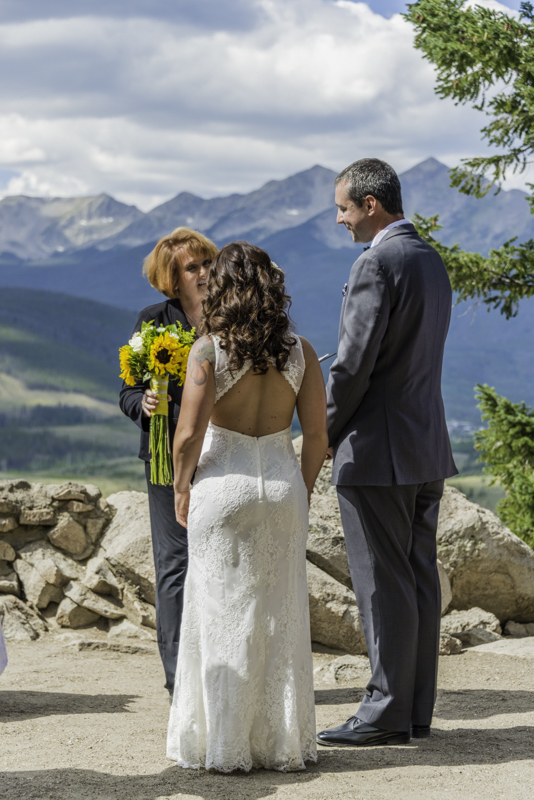 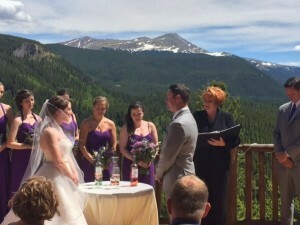 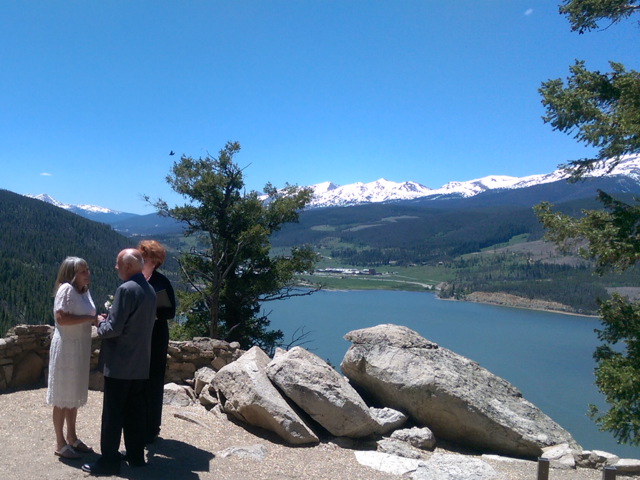 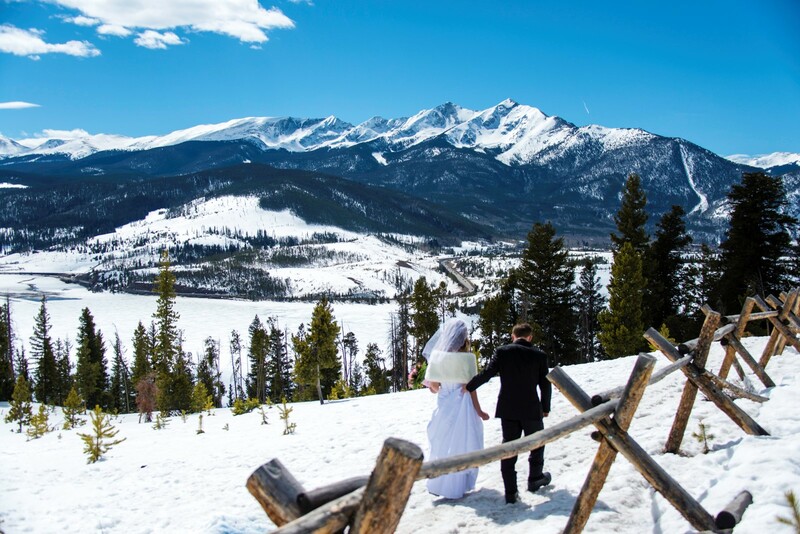 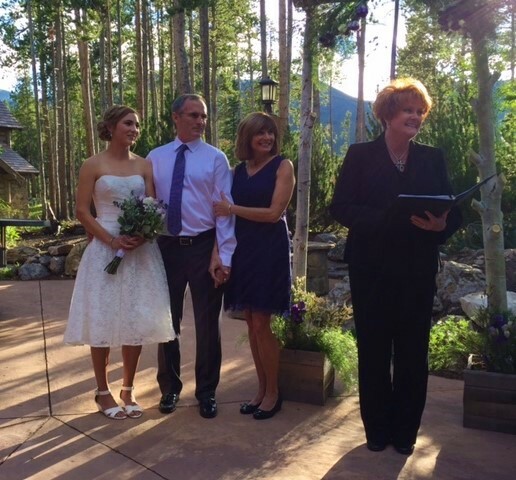 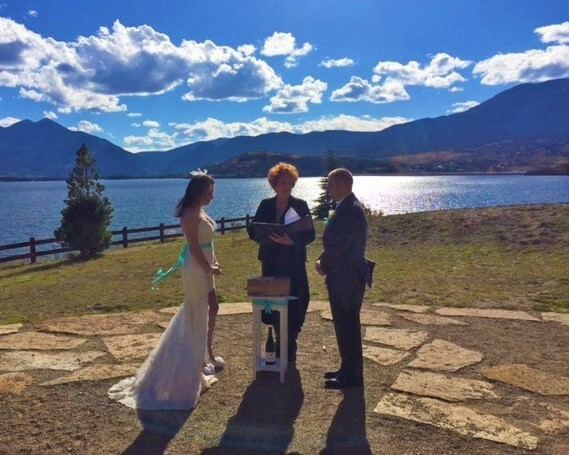 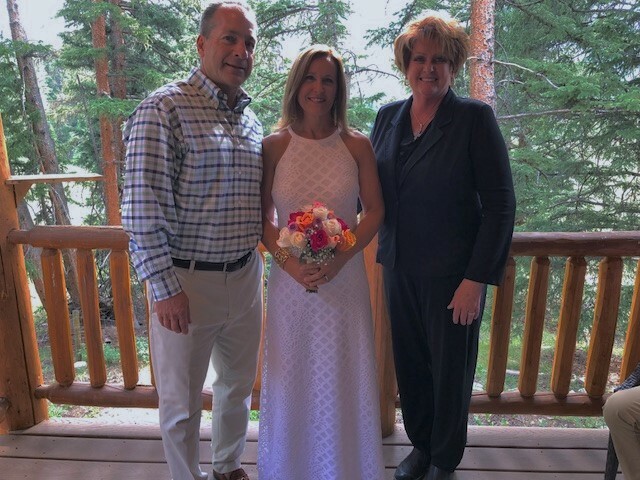 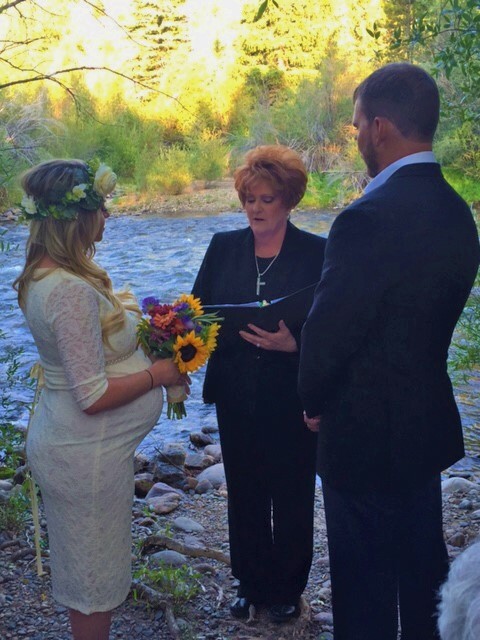 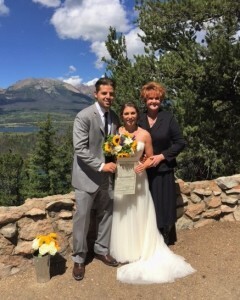 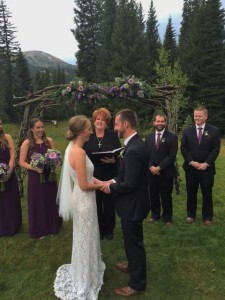 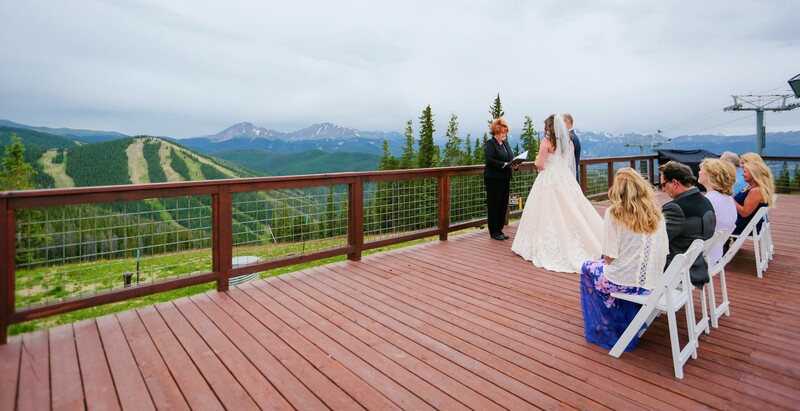 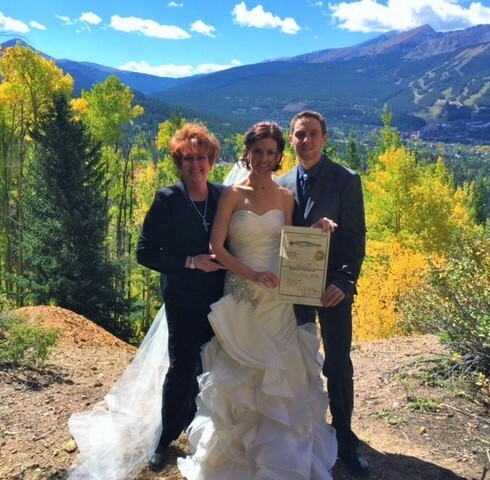 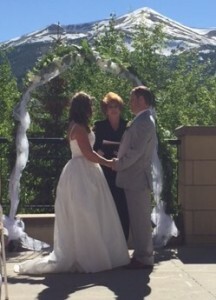 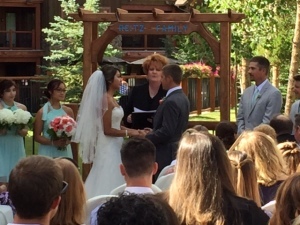 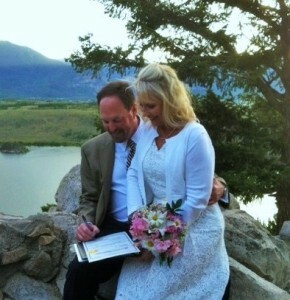 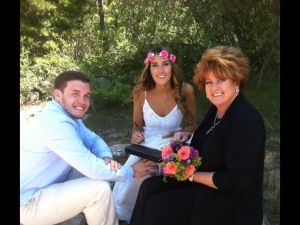 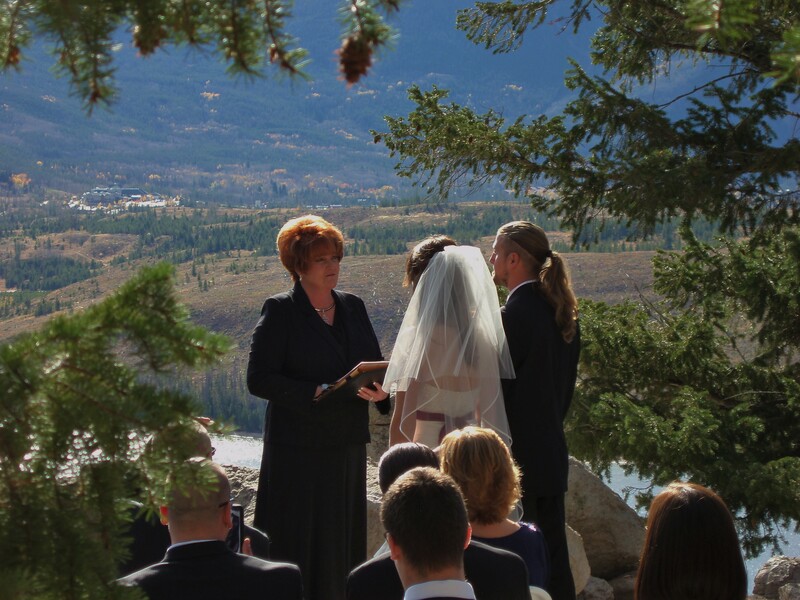 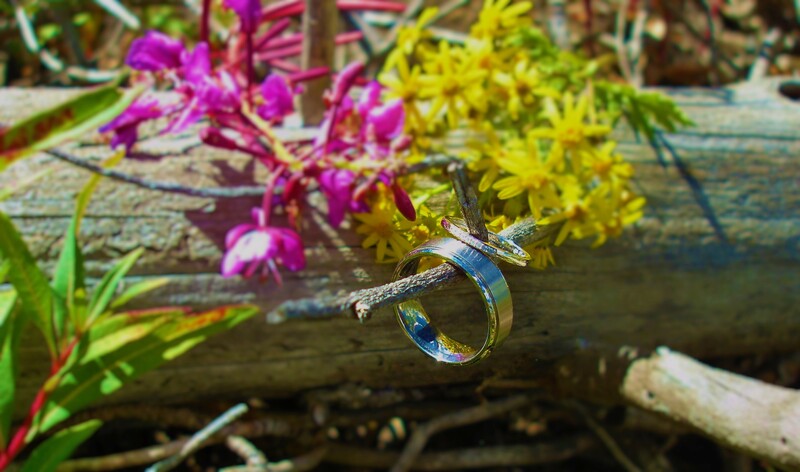 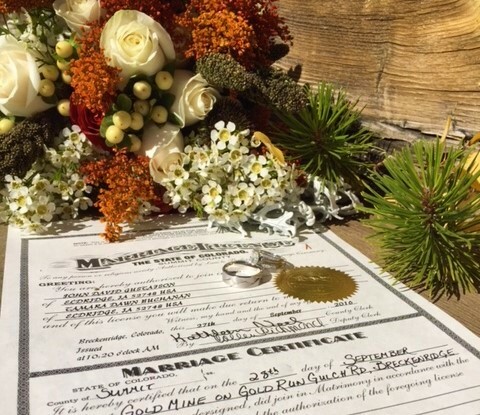 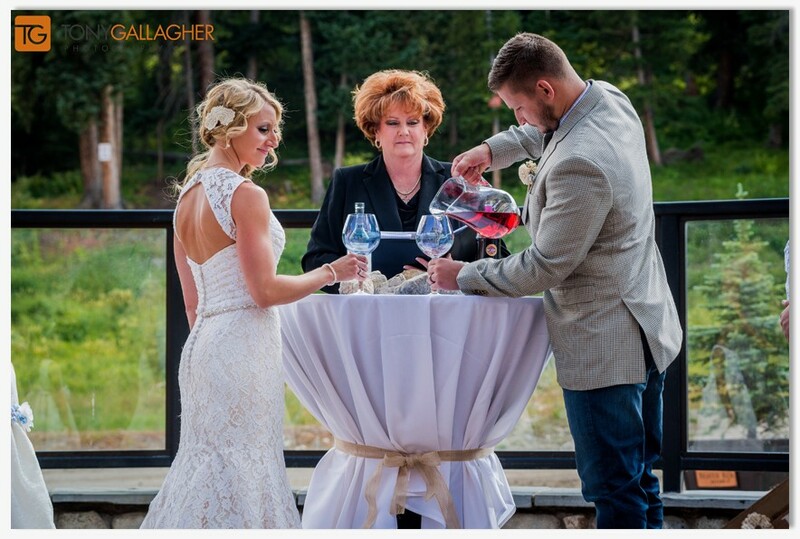 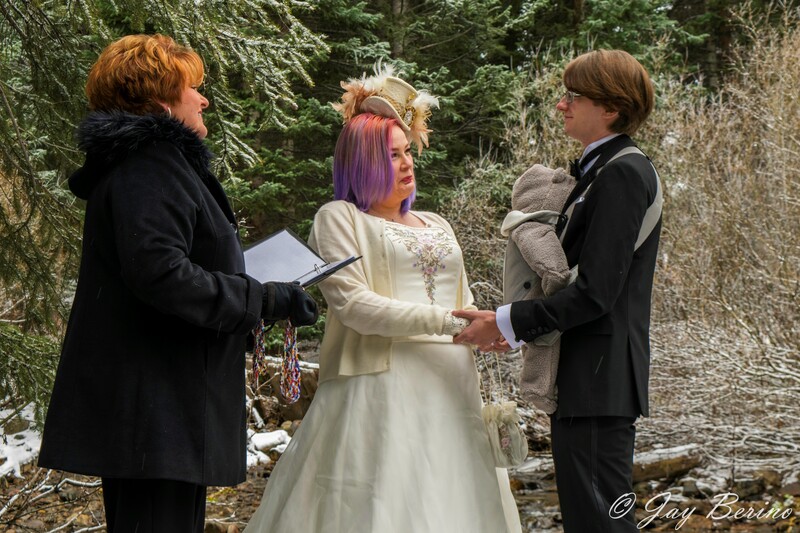 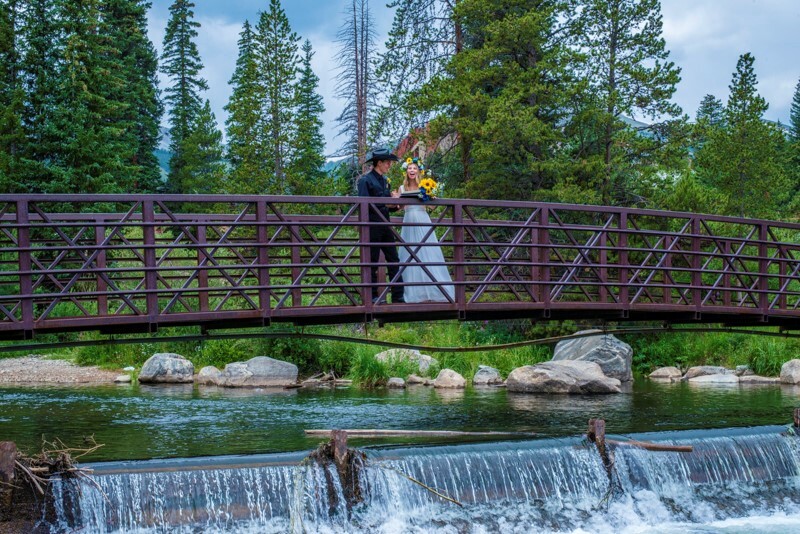 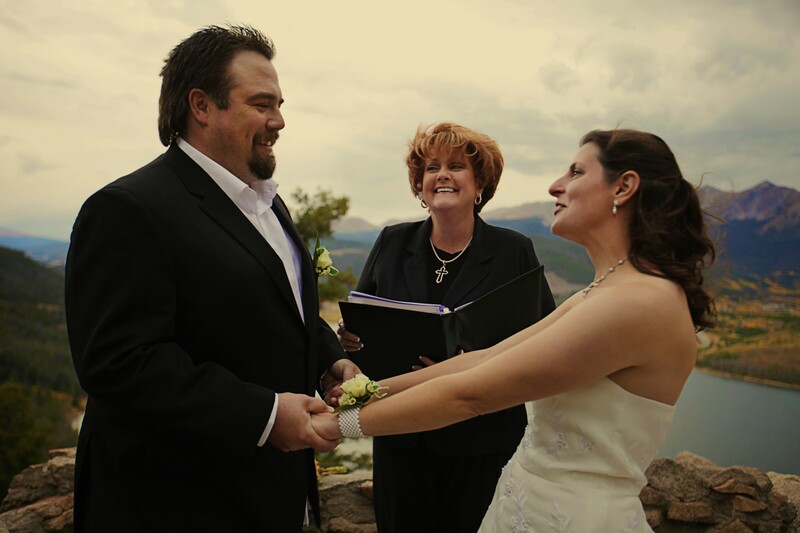 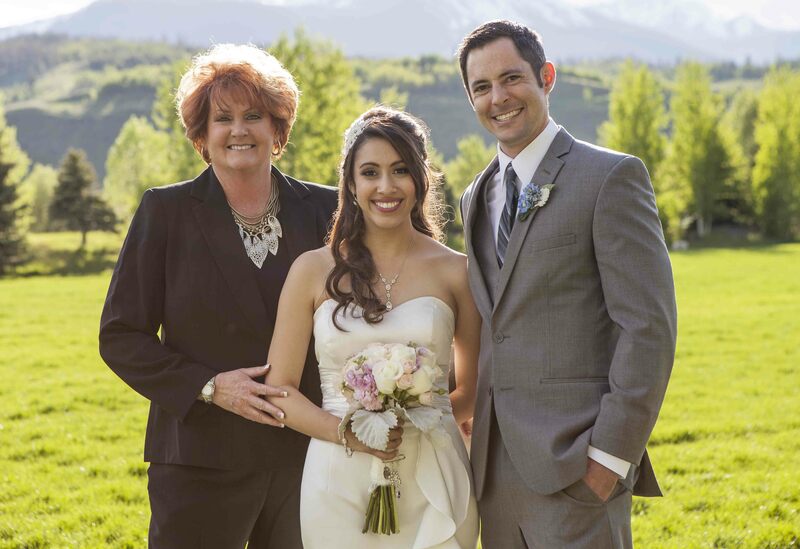 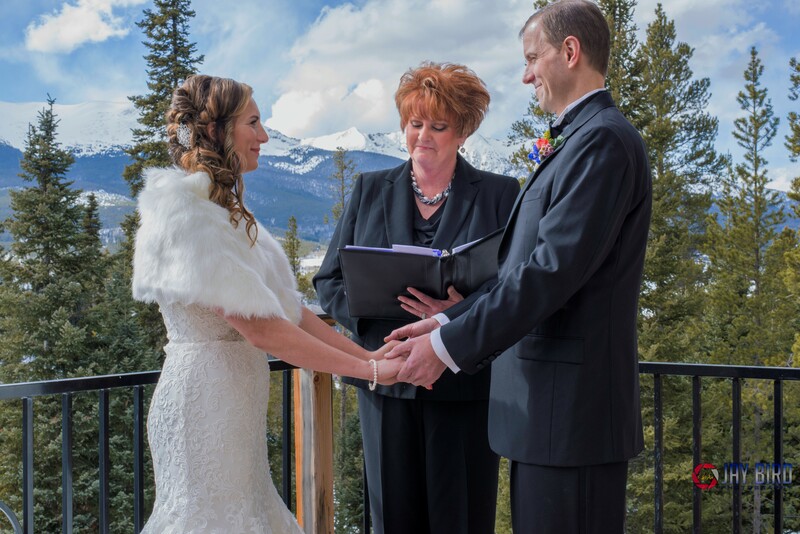 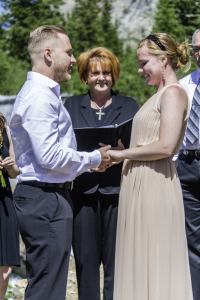 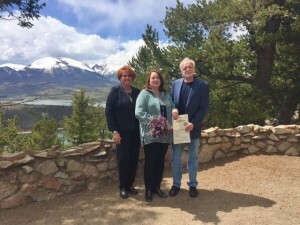 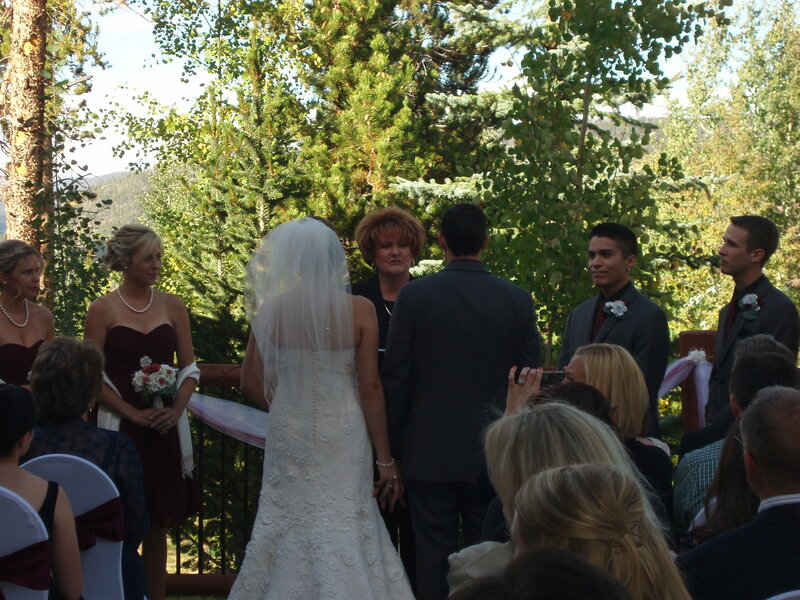 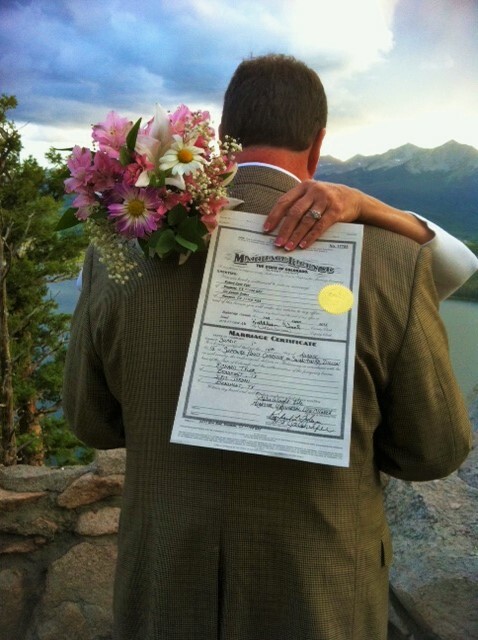 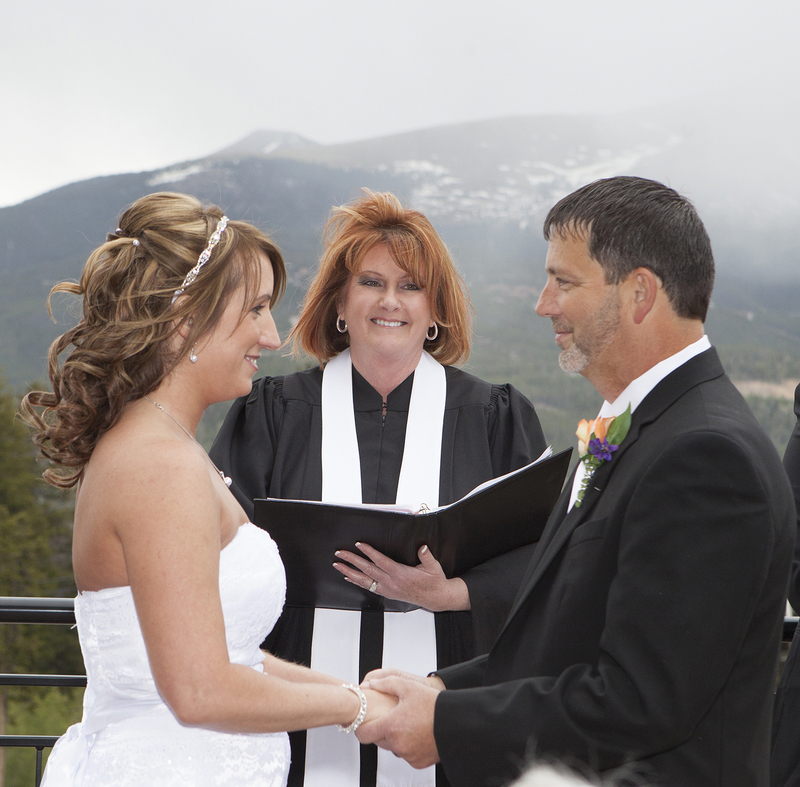 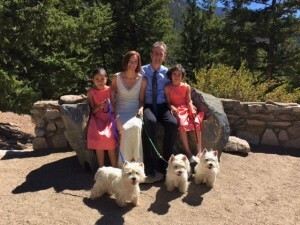 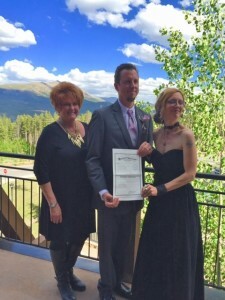 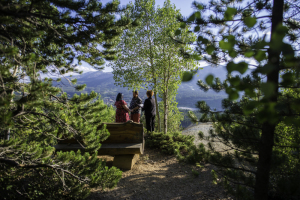 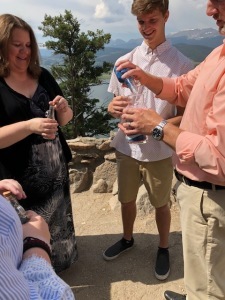 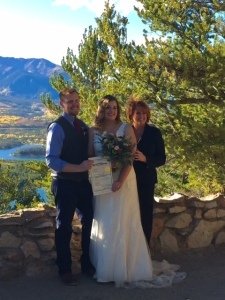 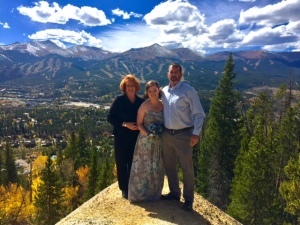 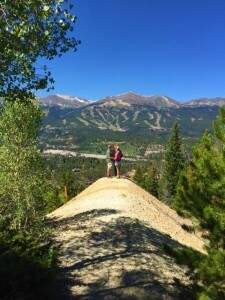 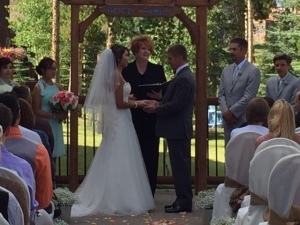 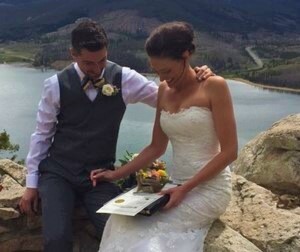 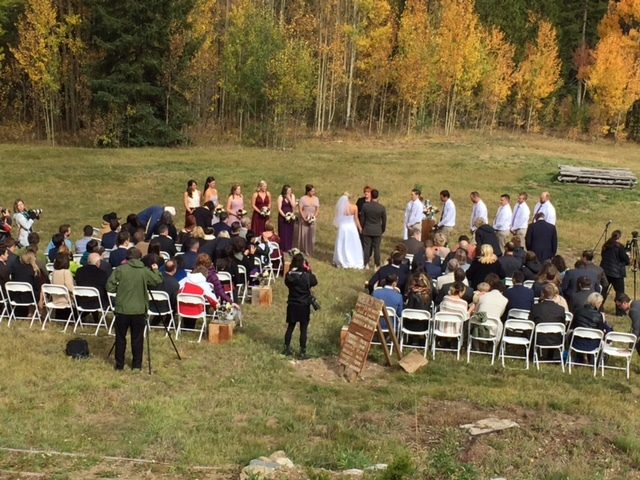 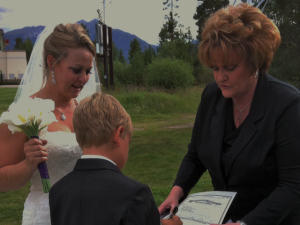 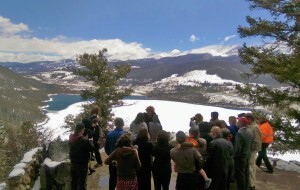 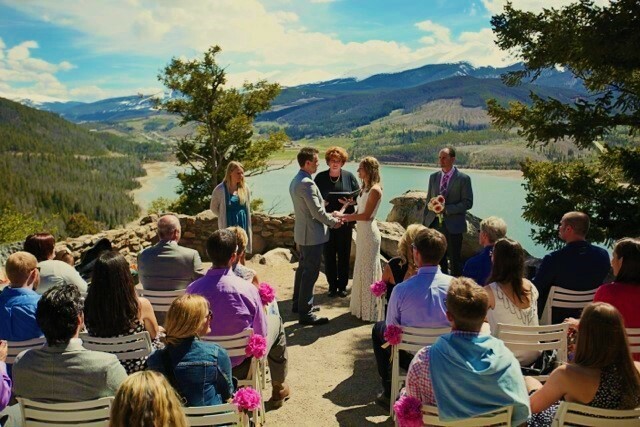 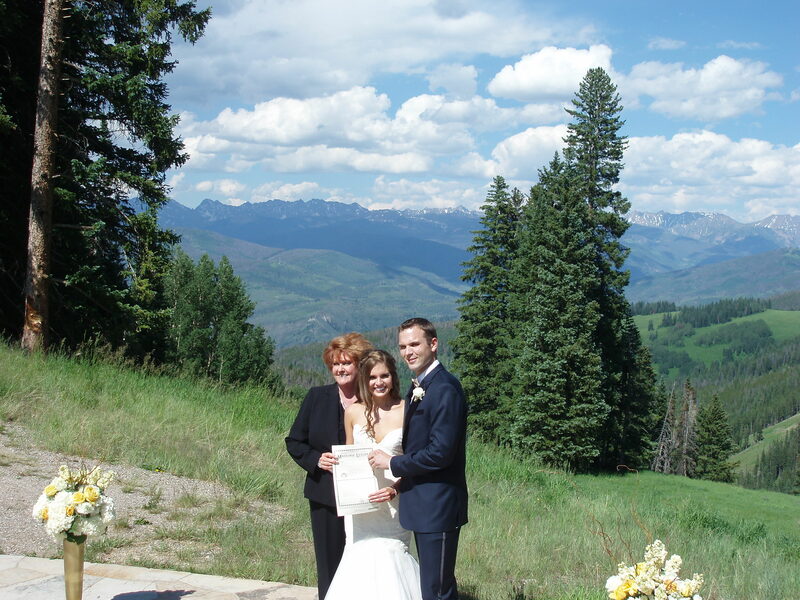 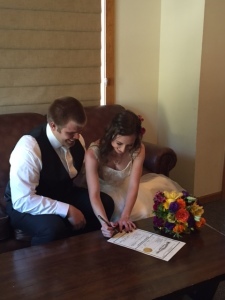 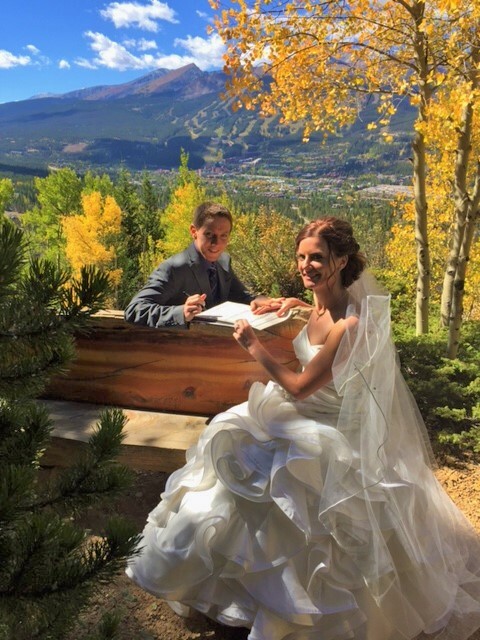 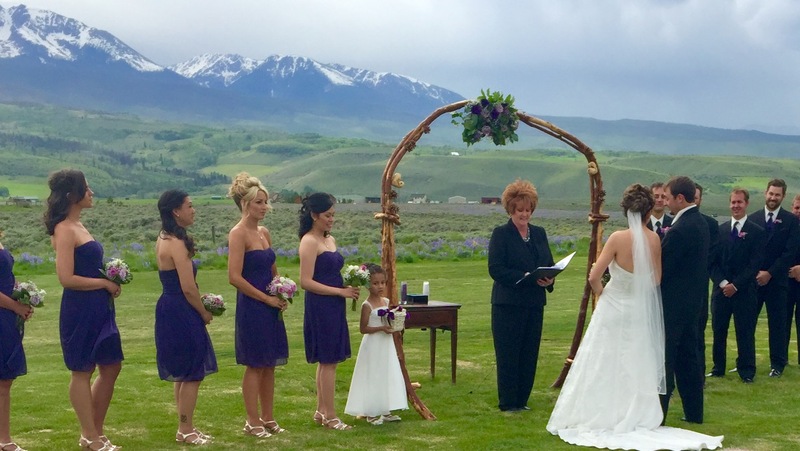 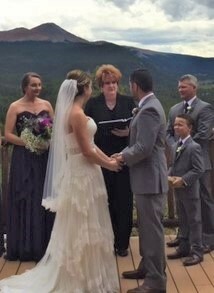 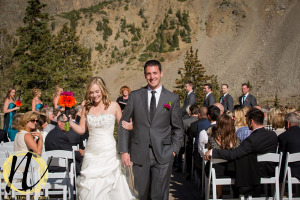 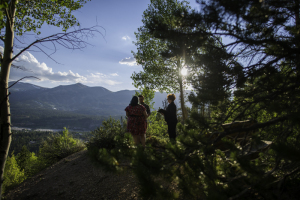 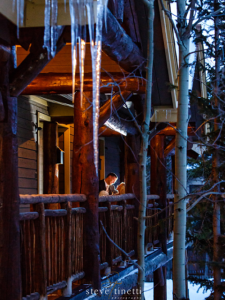 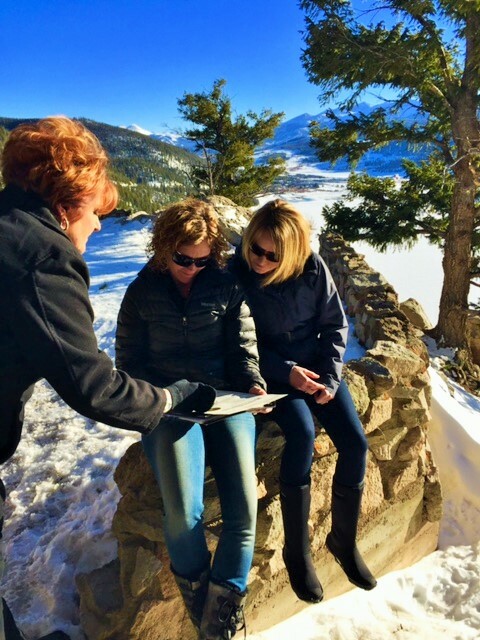 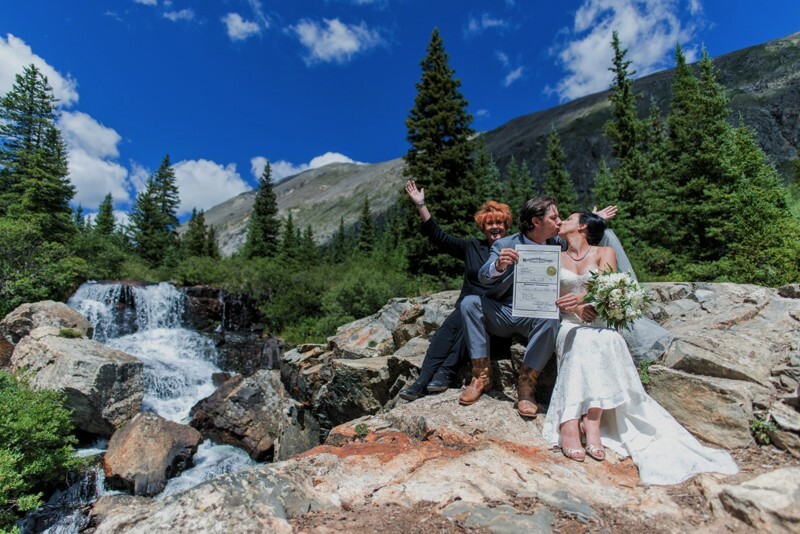 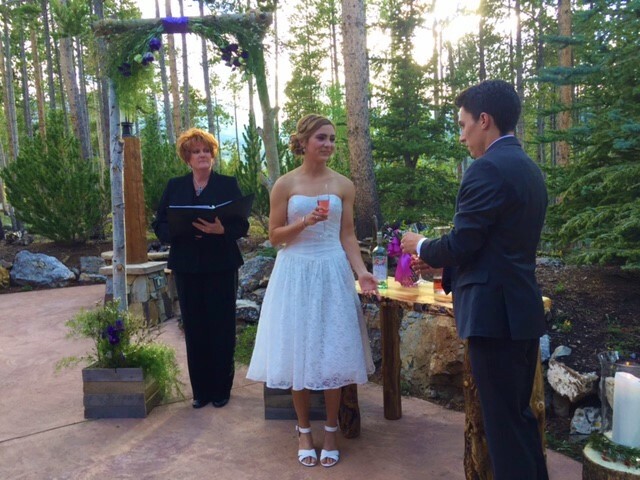 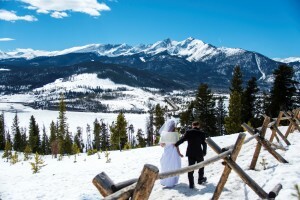 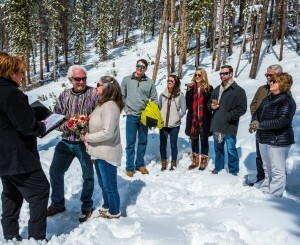 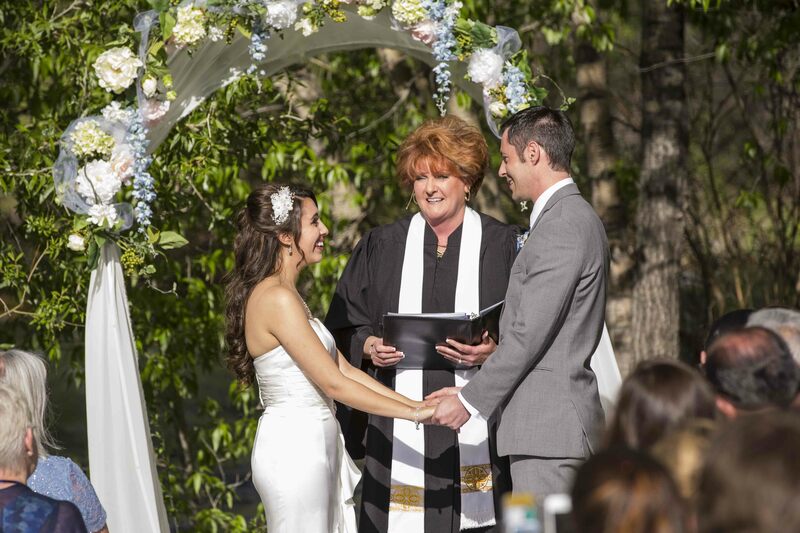 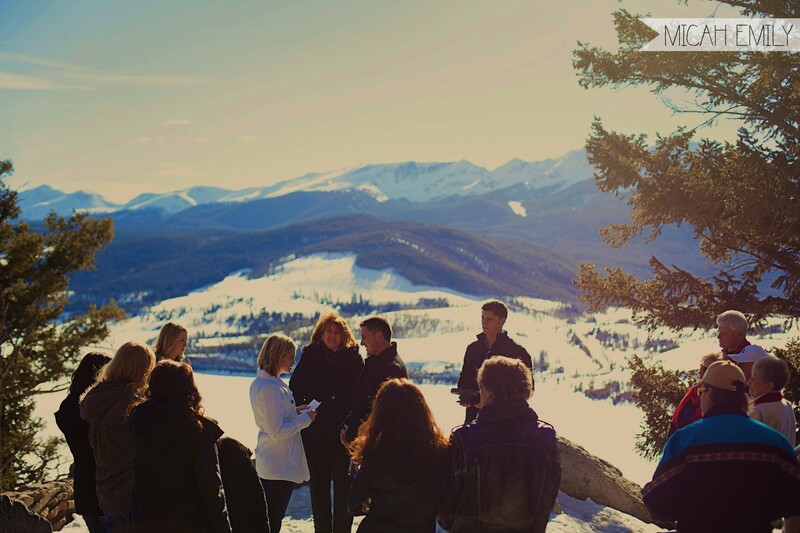 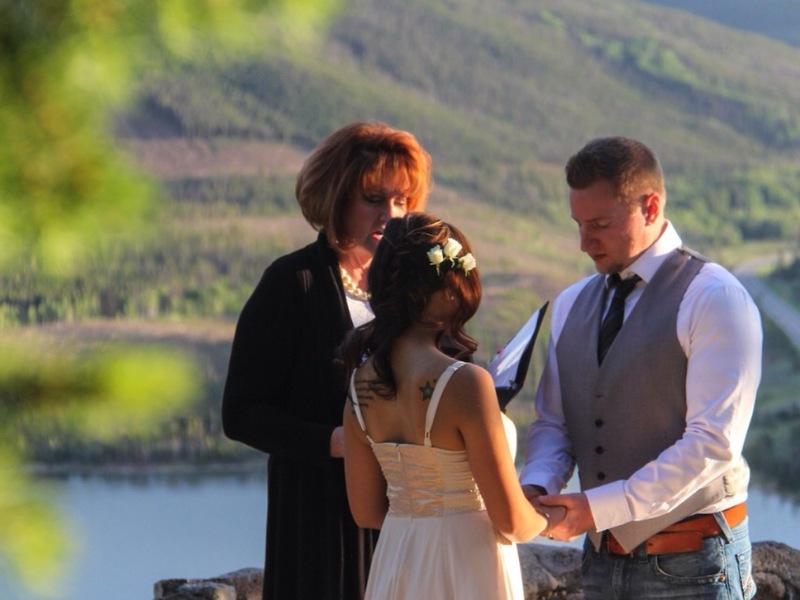 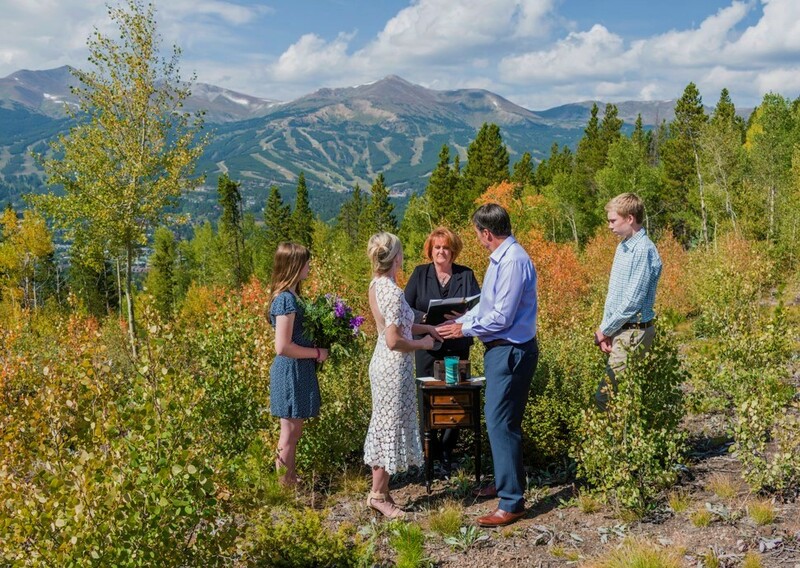 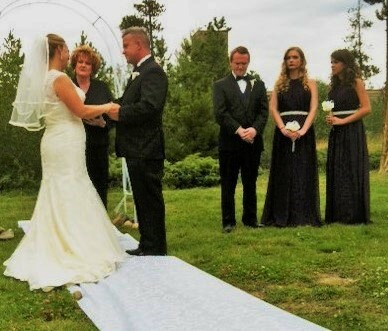 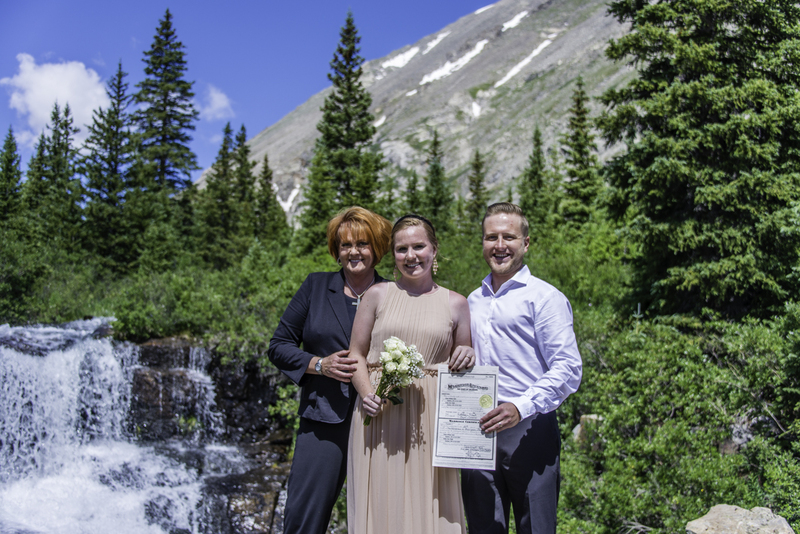 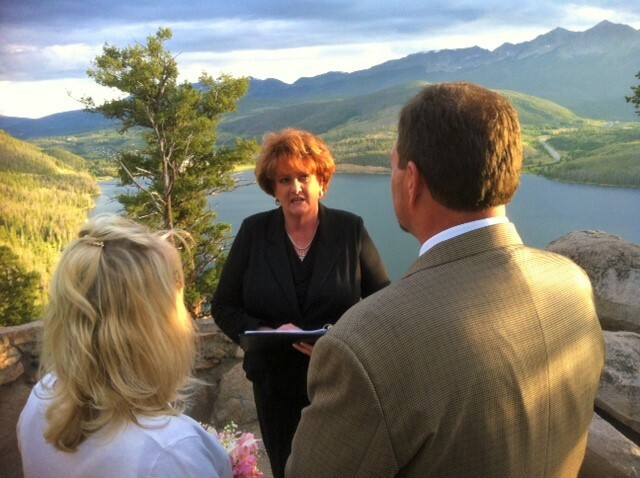 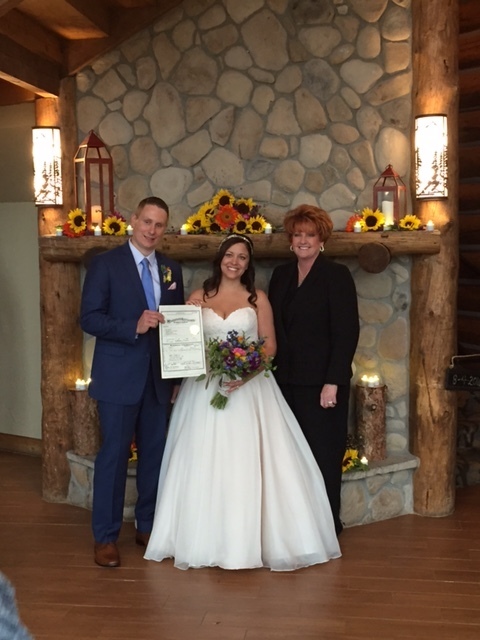 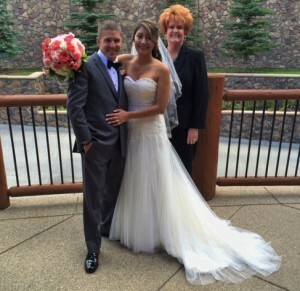 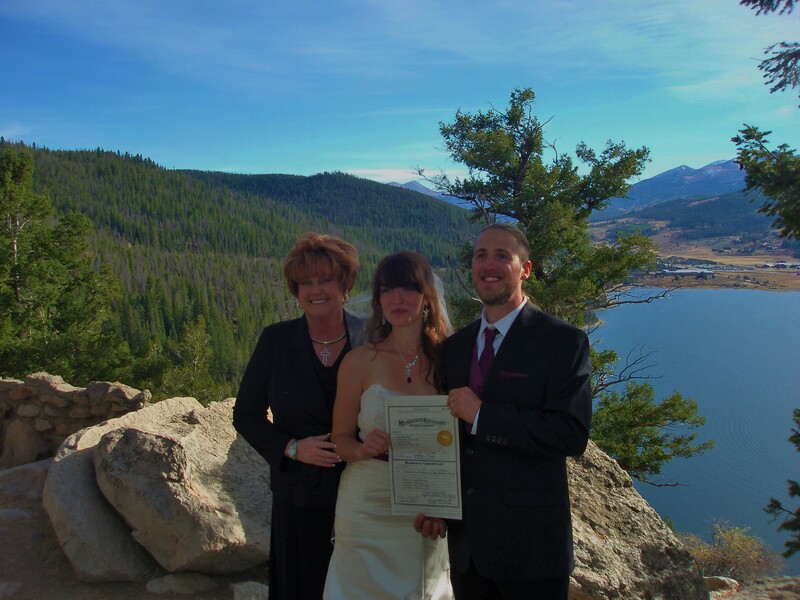 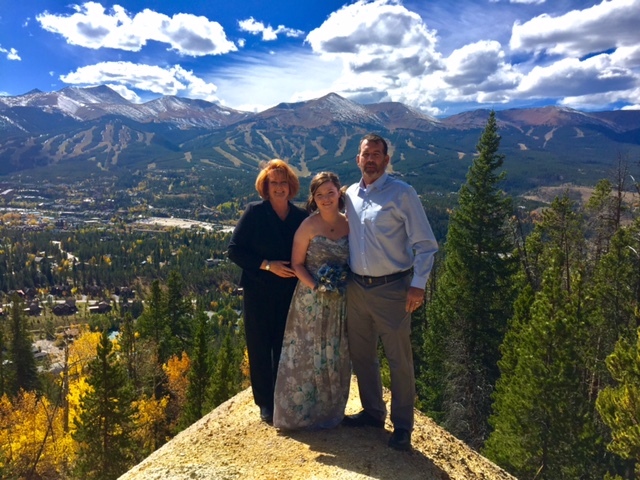 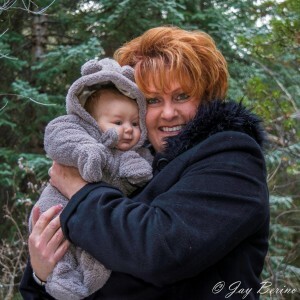 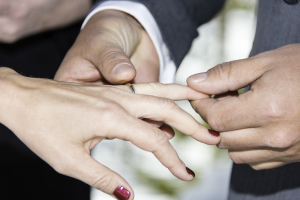 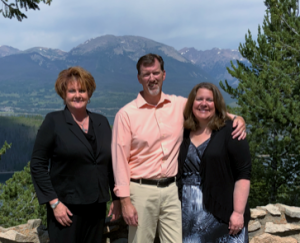 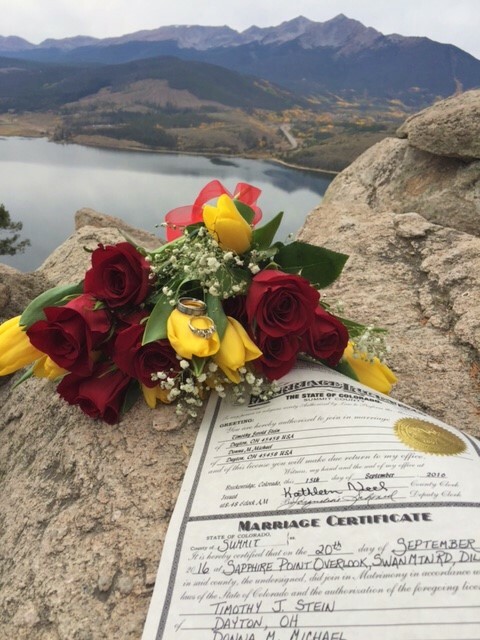 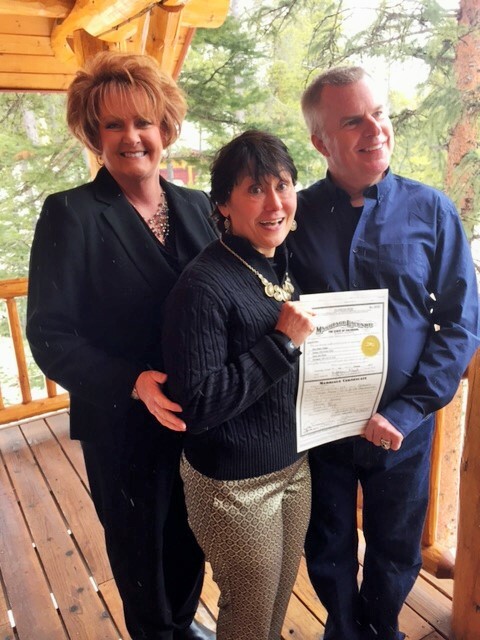 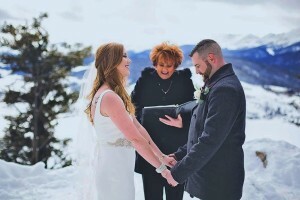 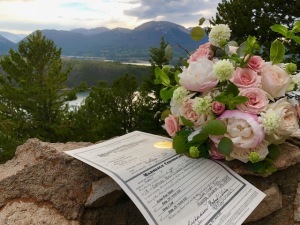 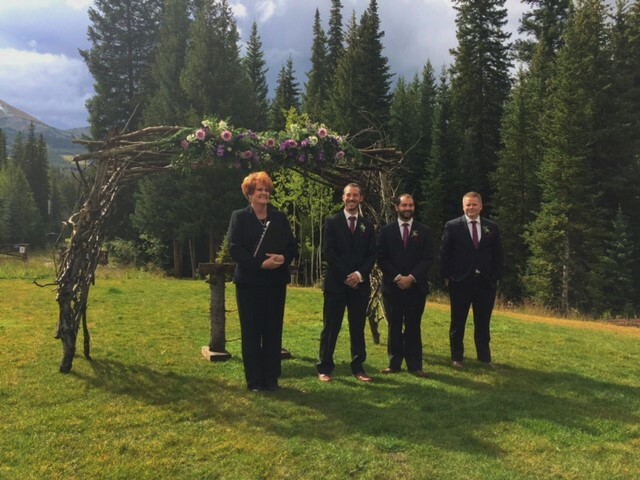 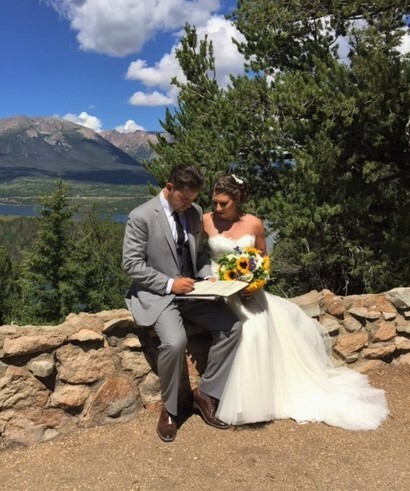 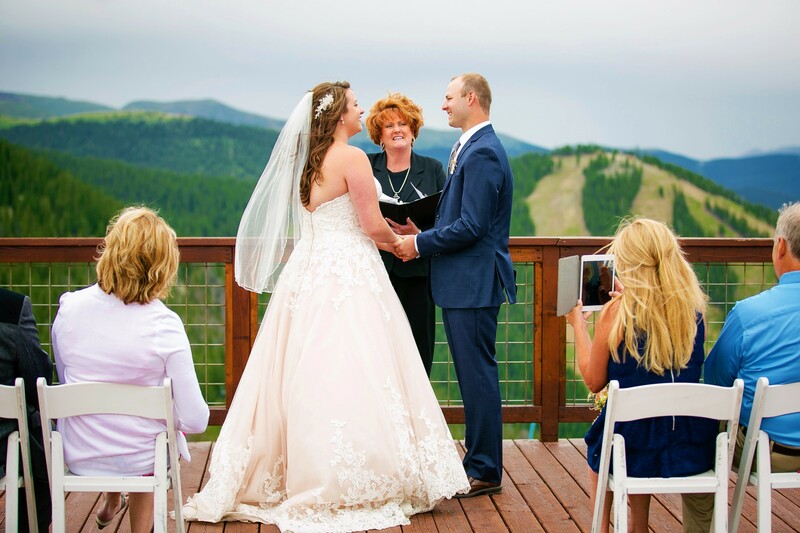 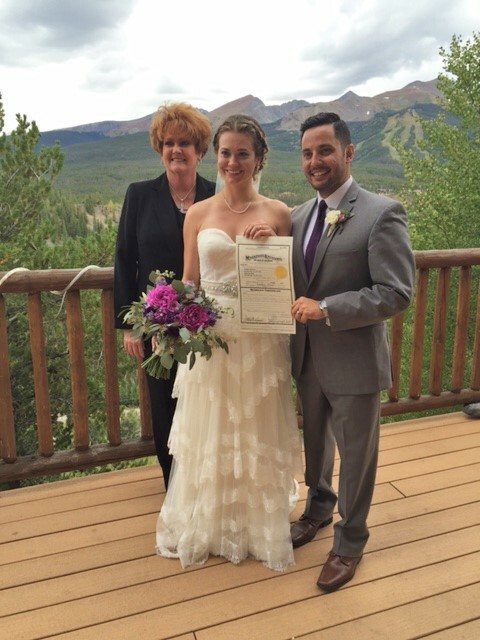 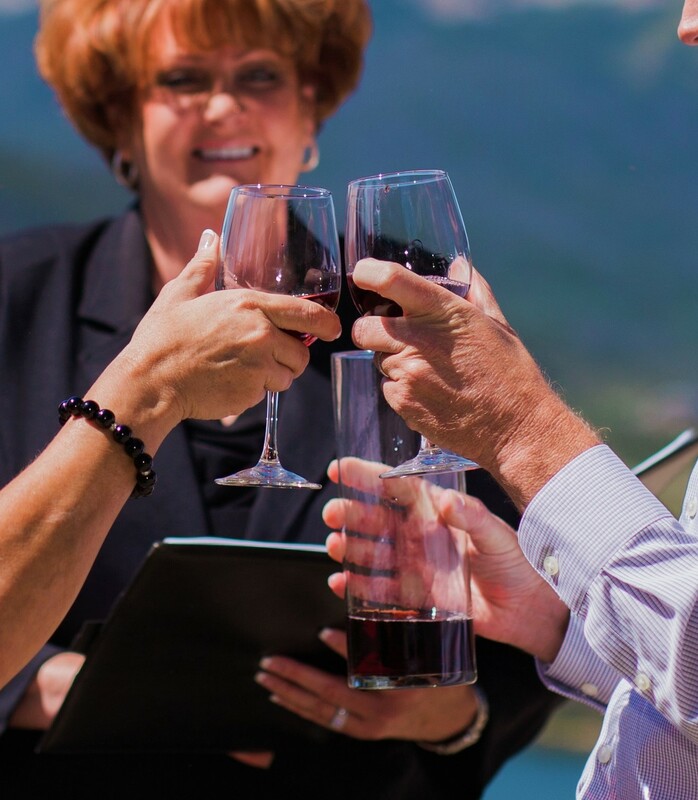 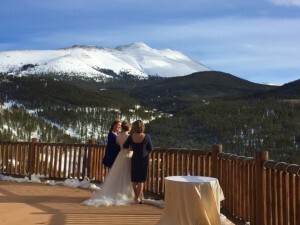 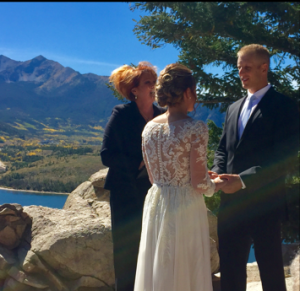 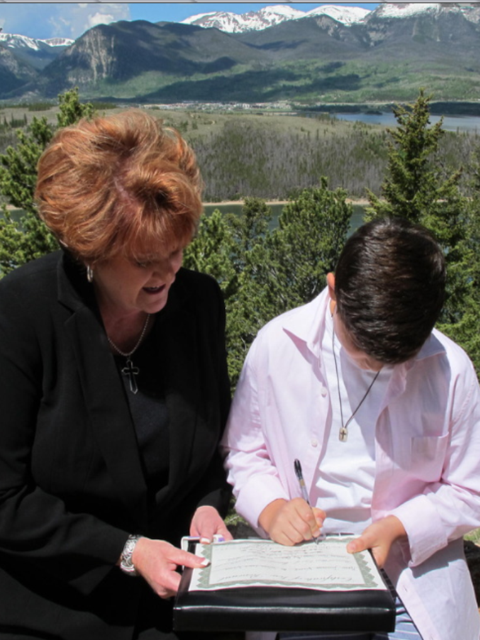 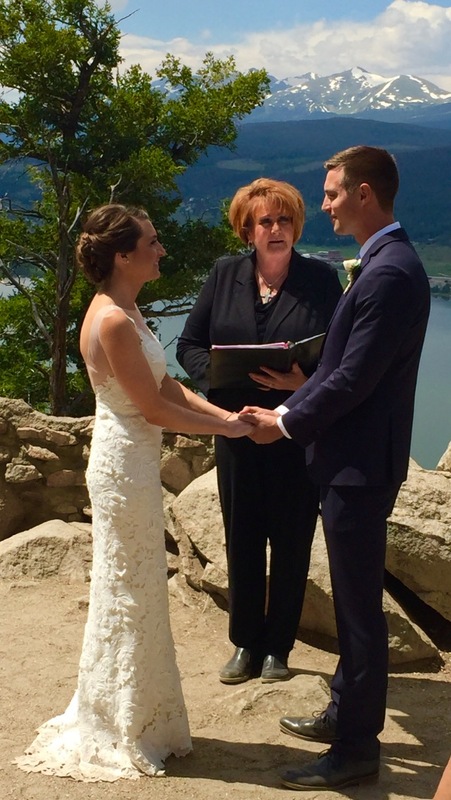 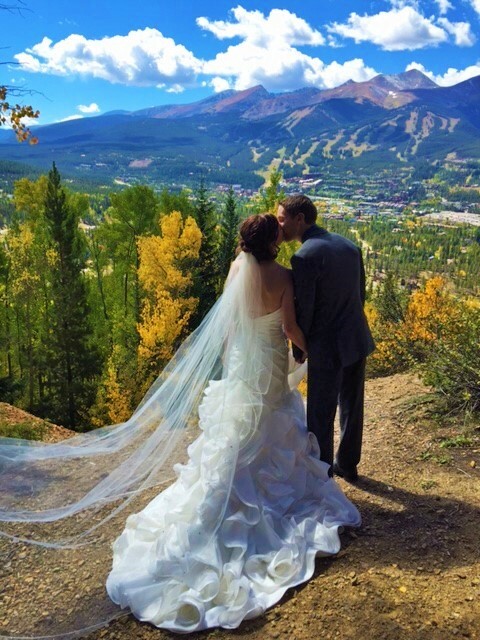 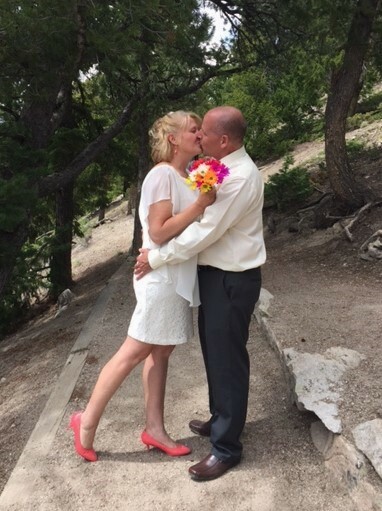 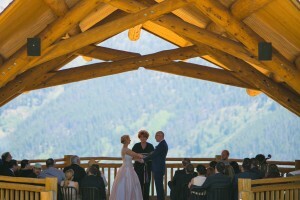 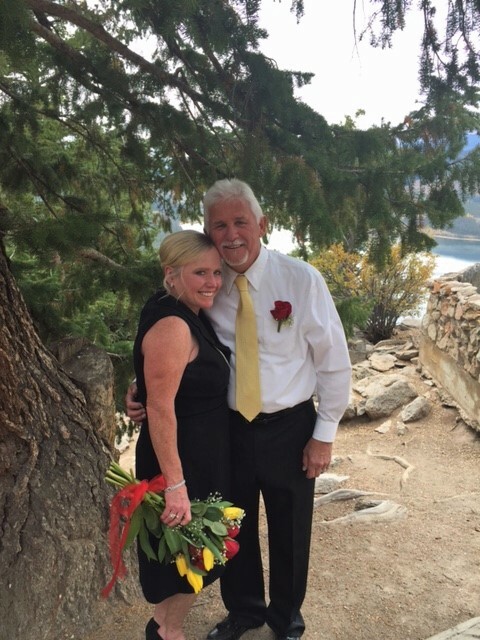 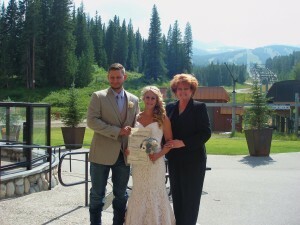 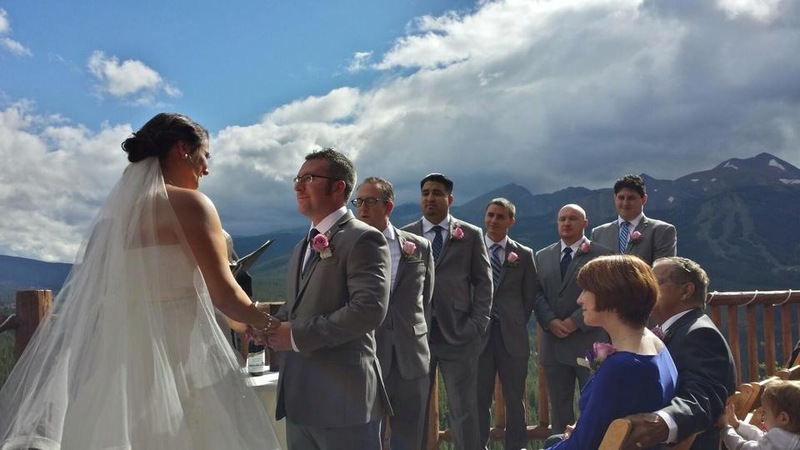 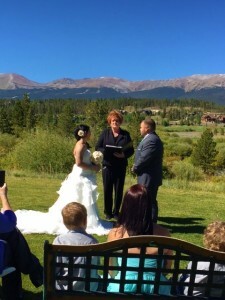 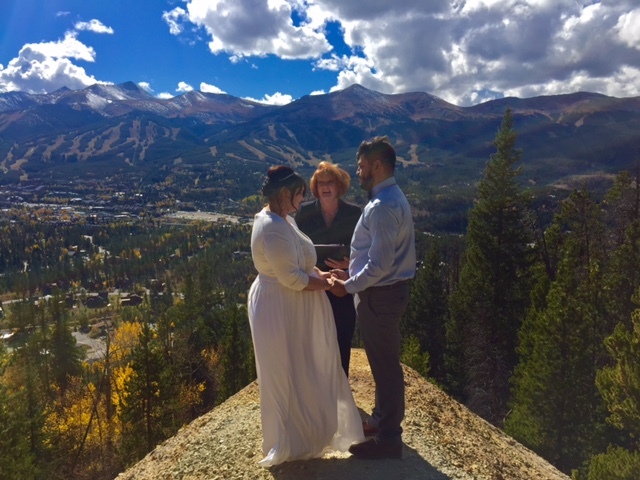 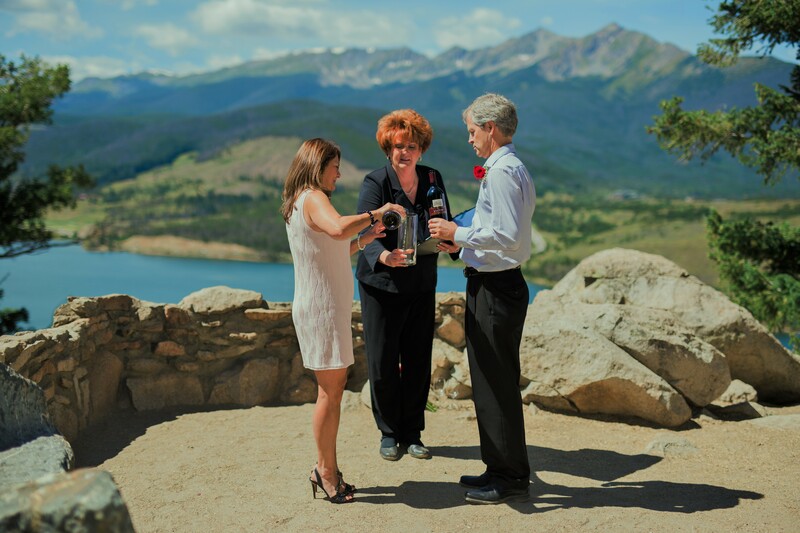 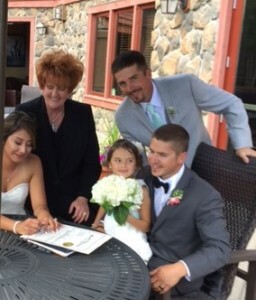 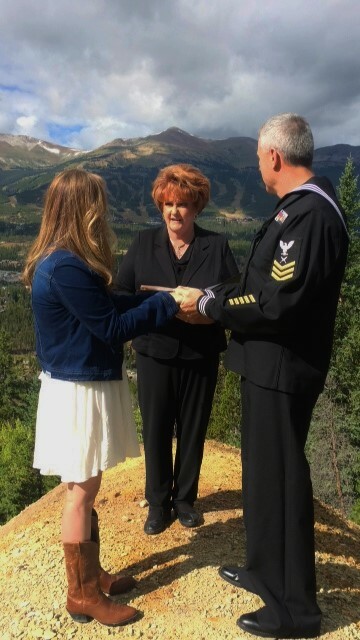 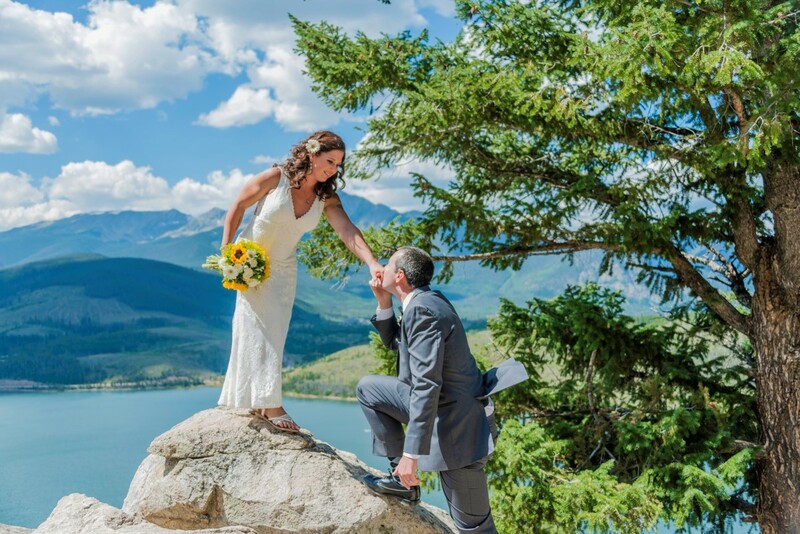 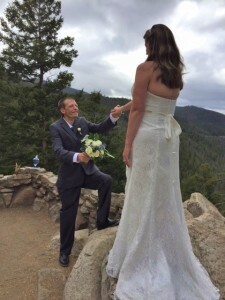 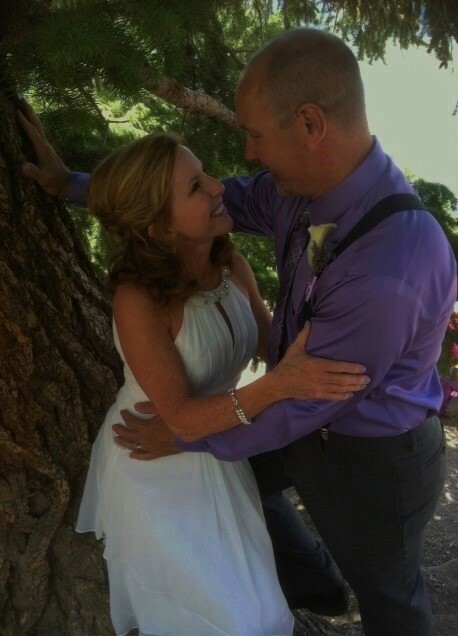 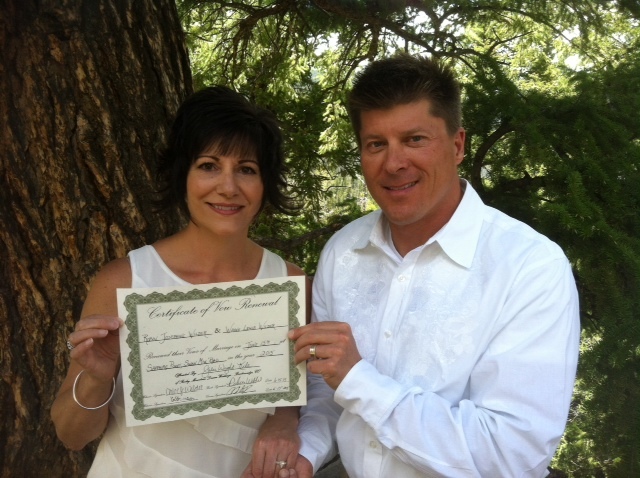 If you are considering a wedding in Summit county Colorado, Julie is the Officiant for you. Dr Julie was a great way to start our new life together! Julie’s Note: THIS IS REVIEW # 100 ON WEDDING WIRE.com !!! 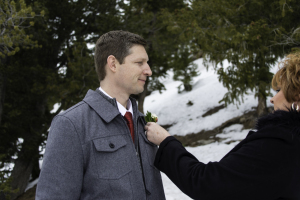 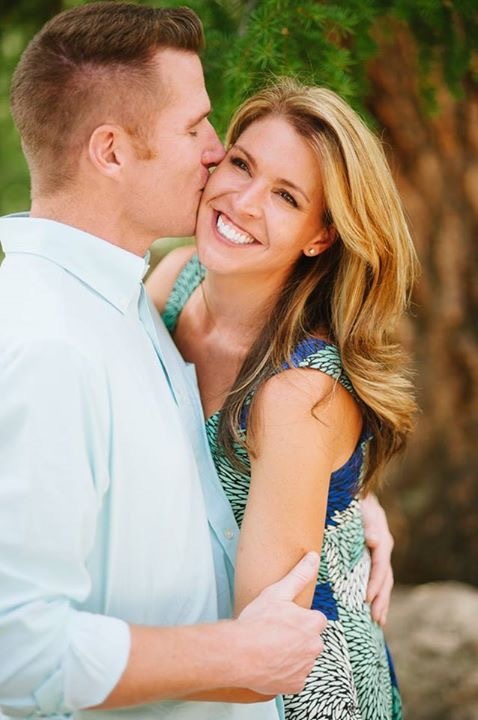 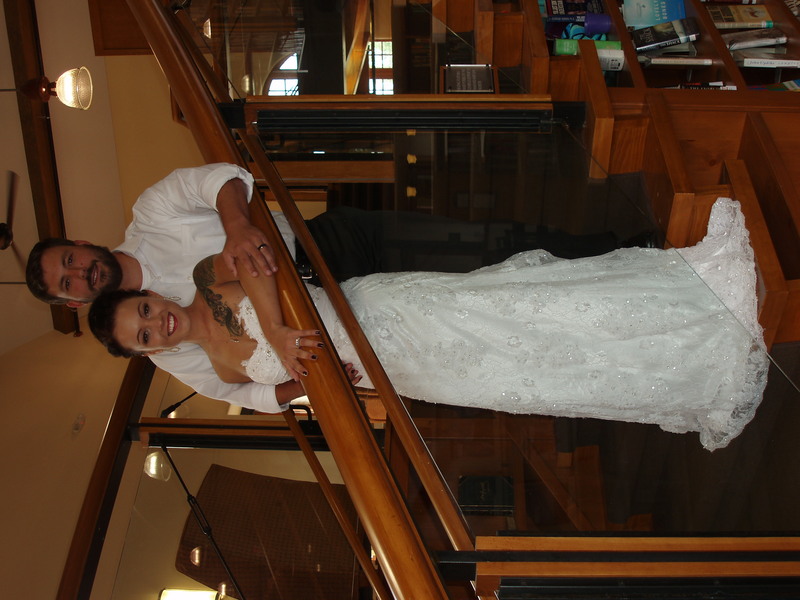 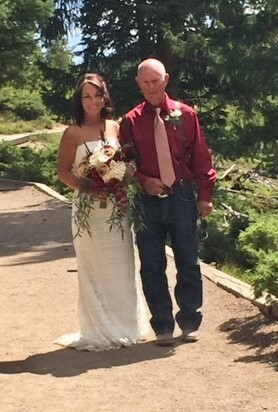 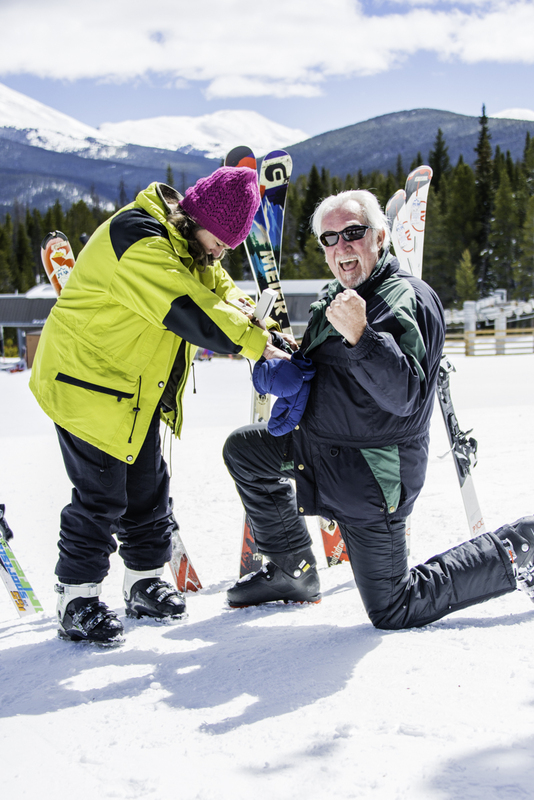 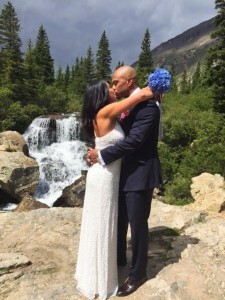 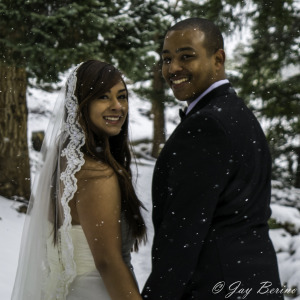 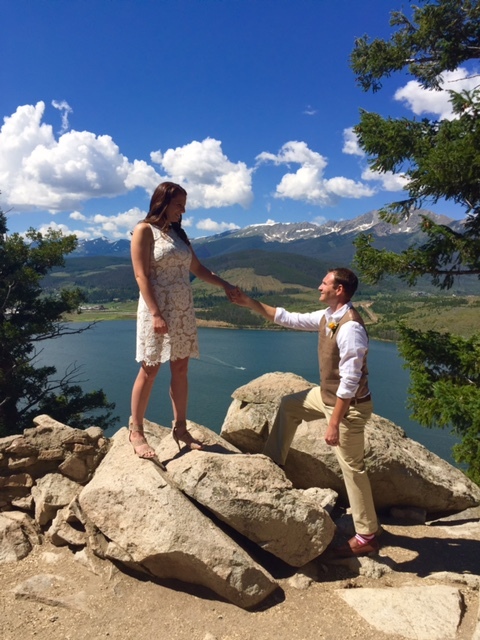 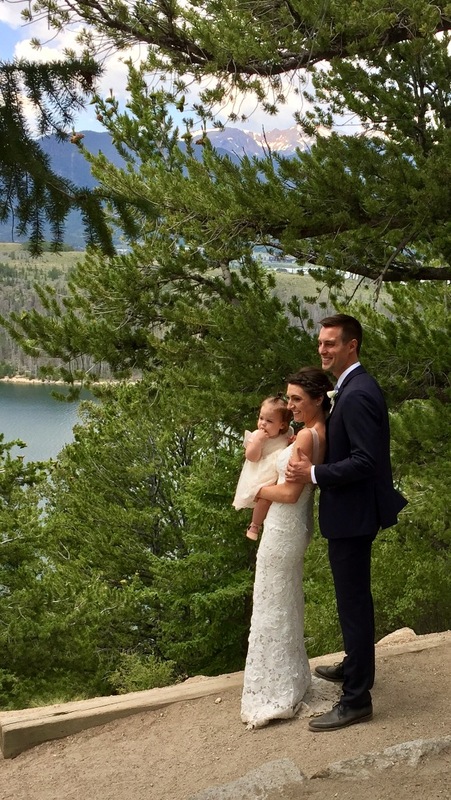 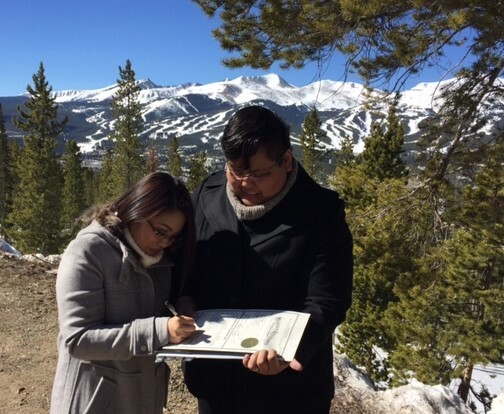 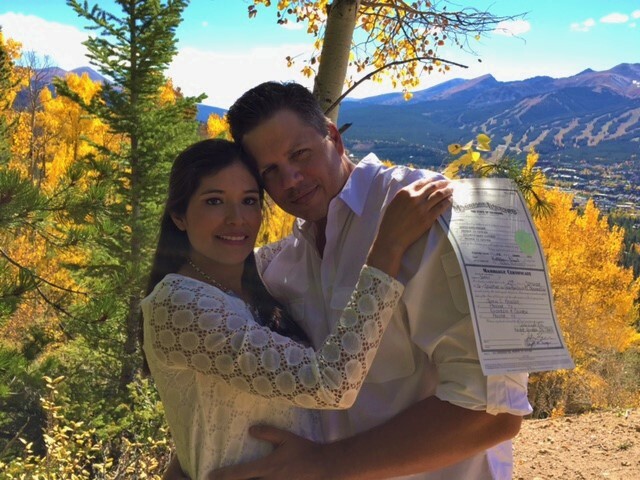 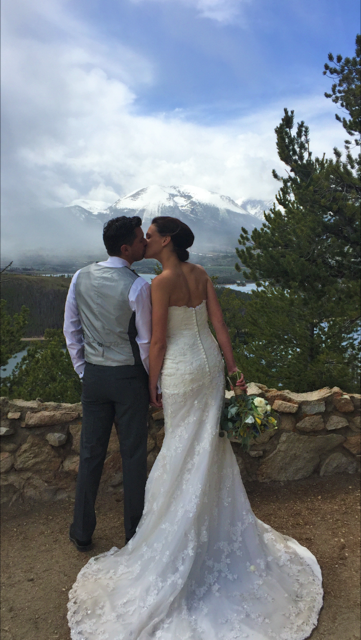 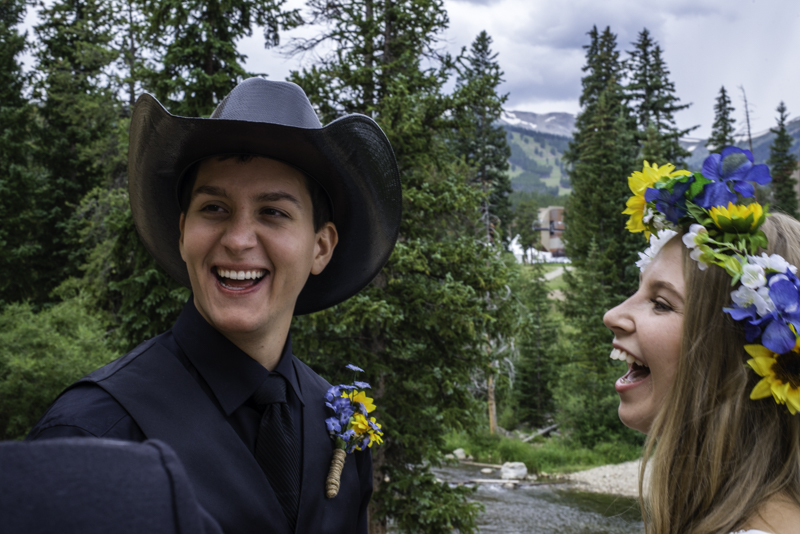 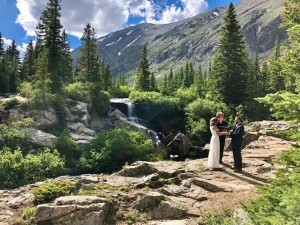 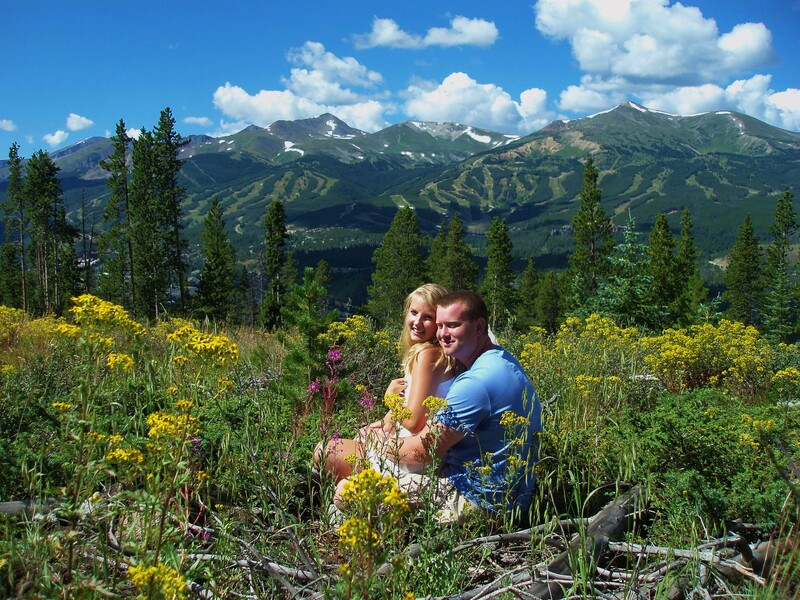 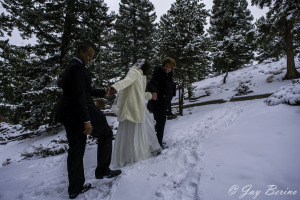 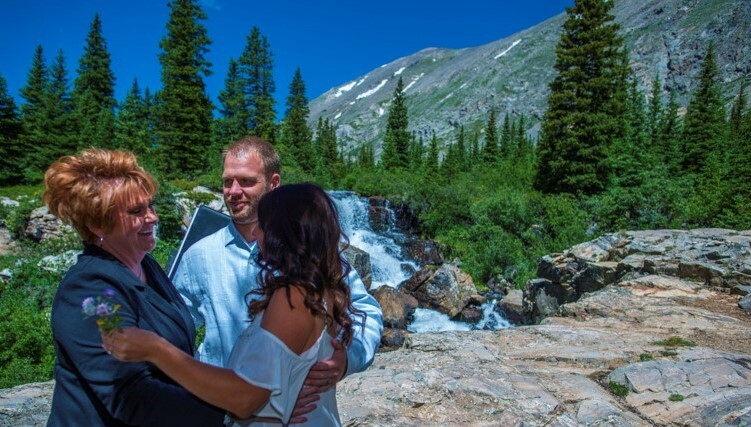 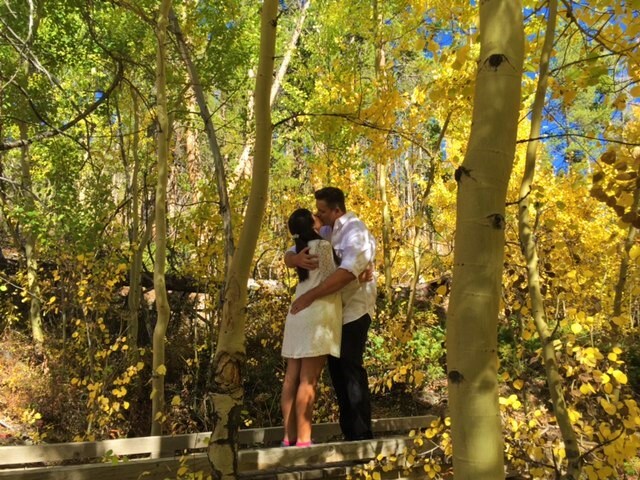 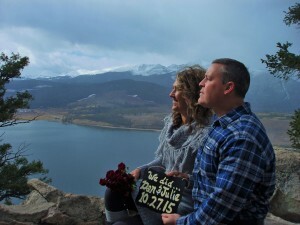 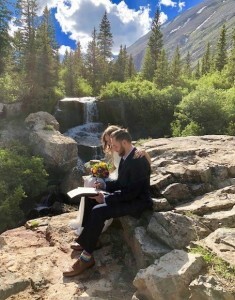 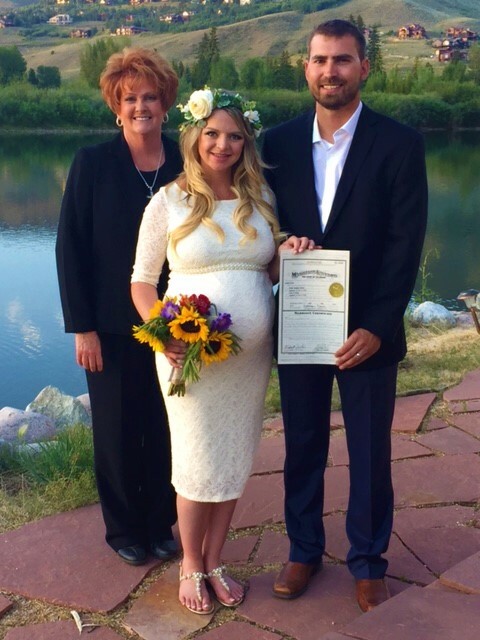 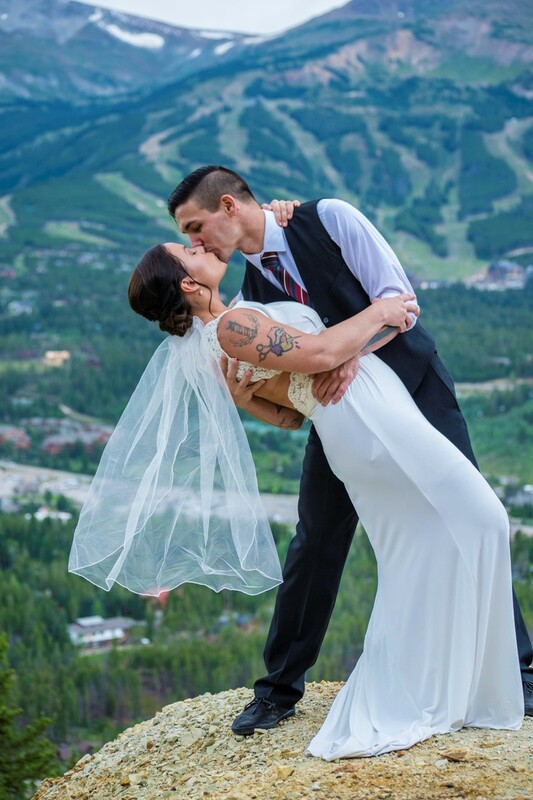 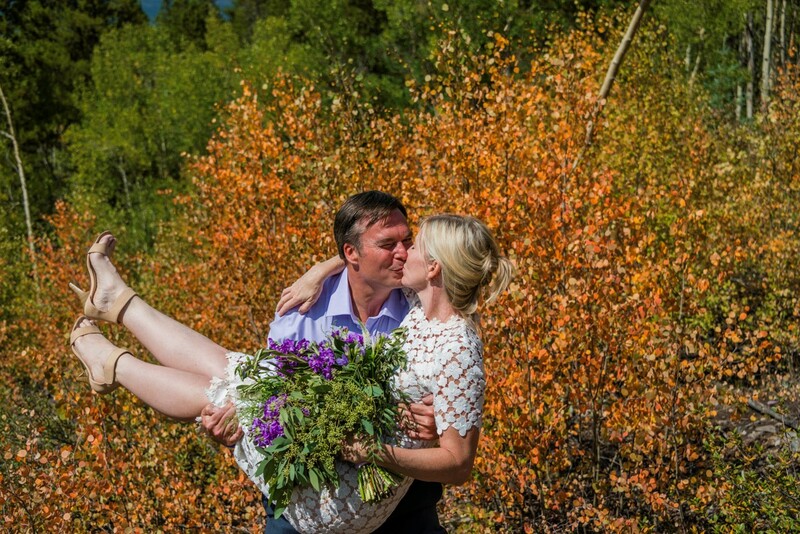 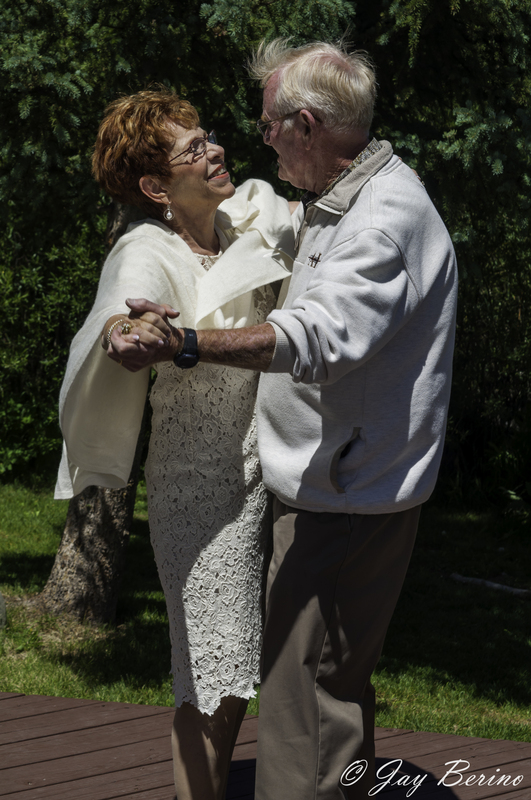 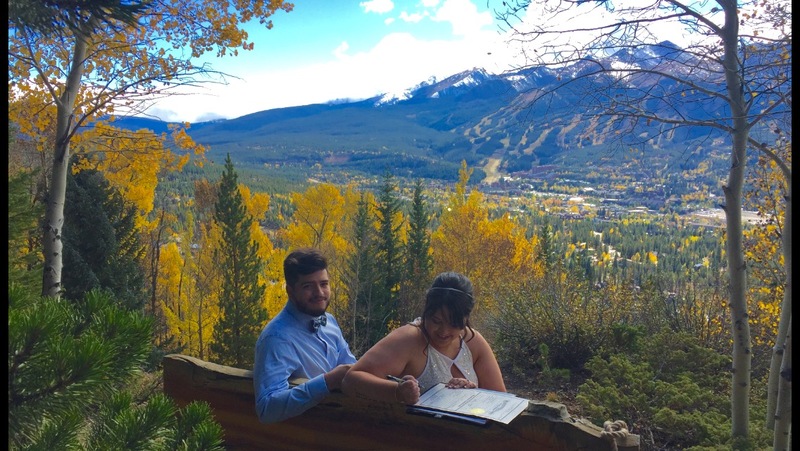 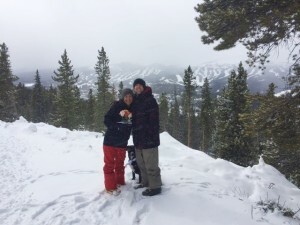 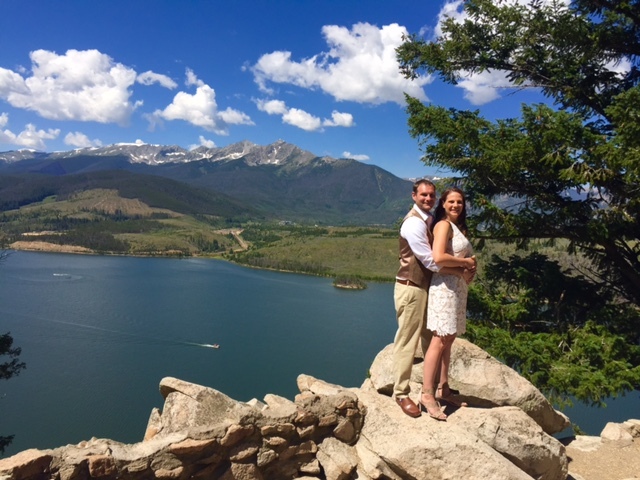 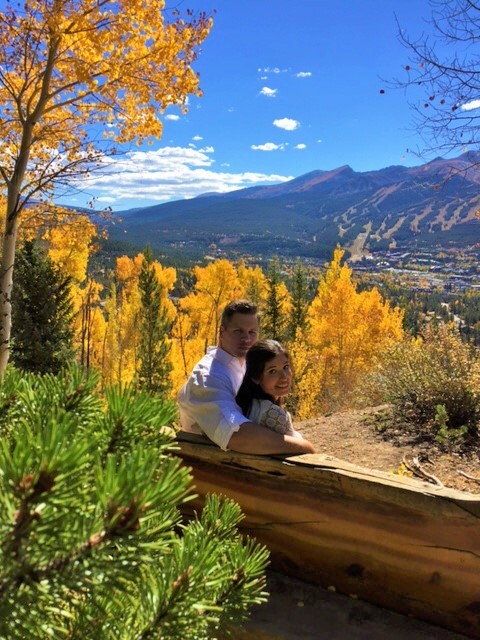 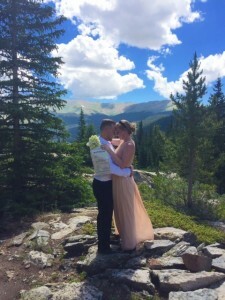 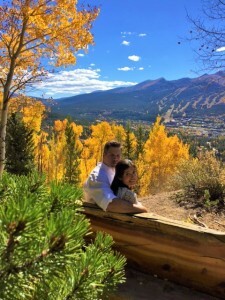 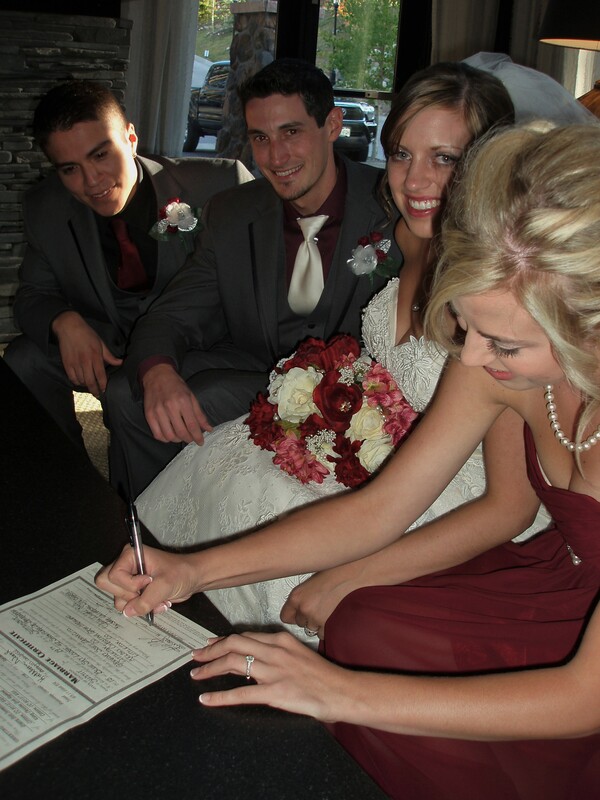 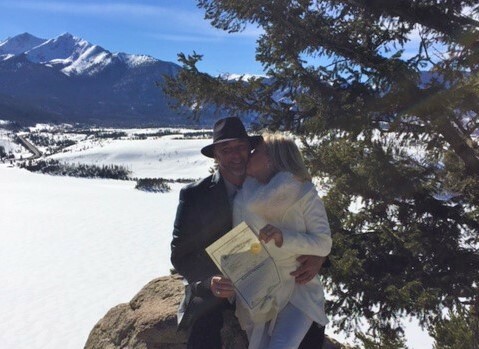 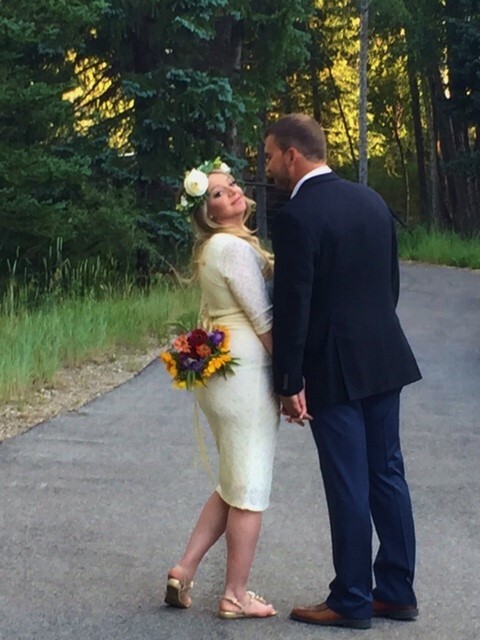 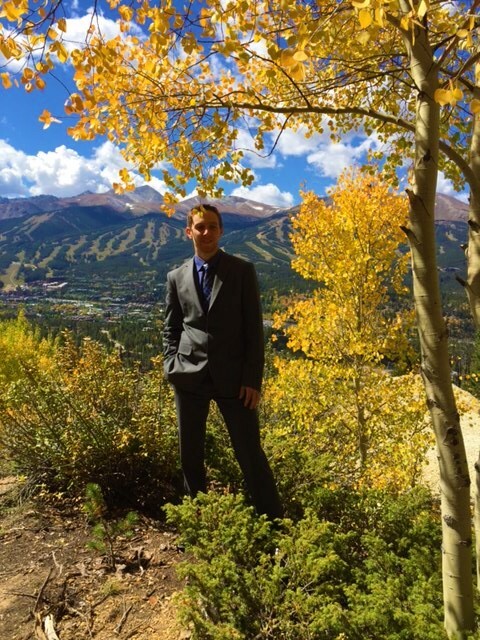 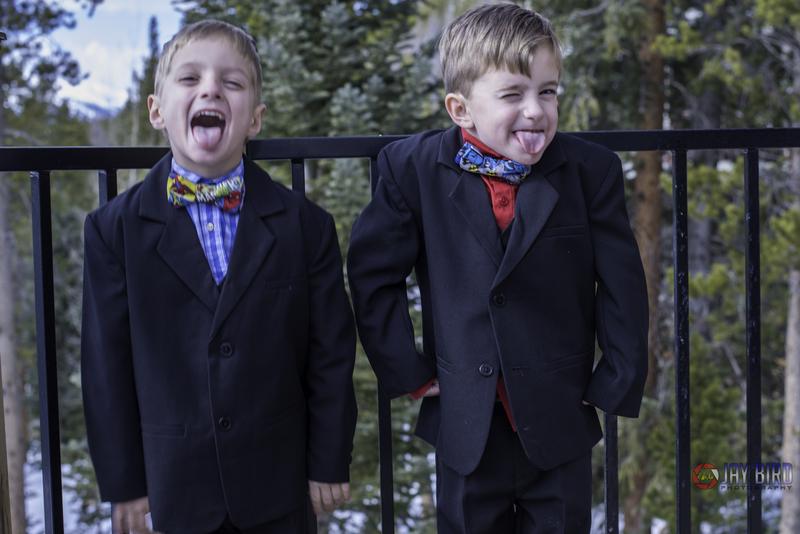 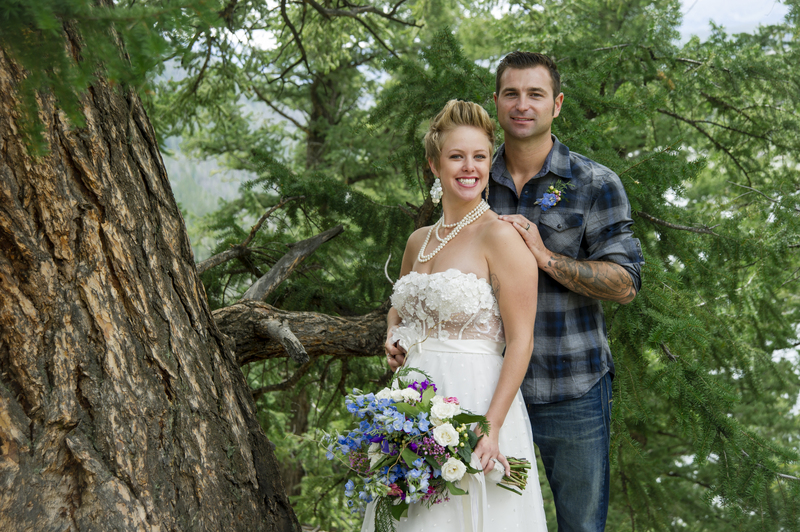 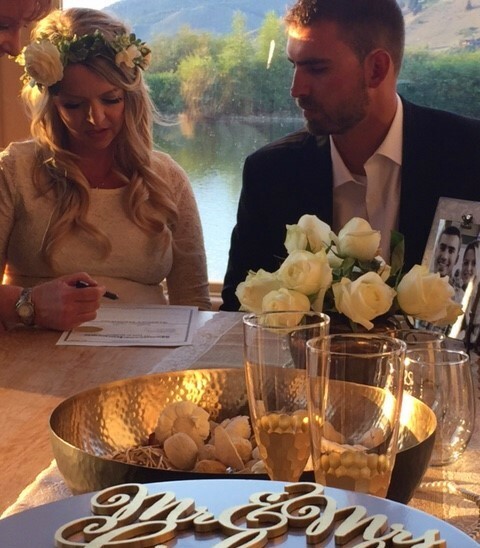 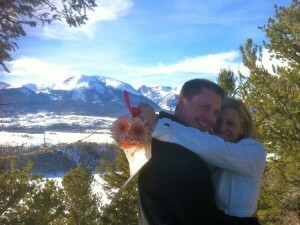 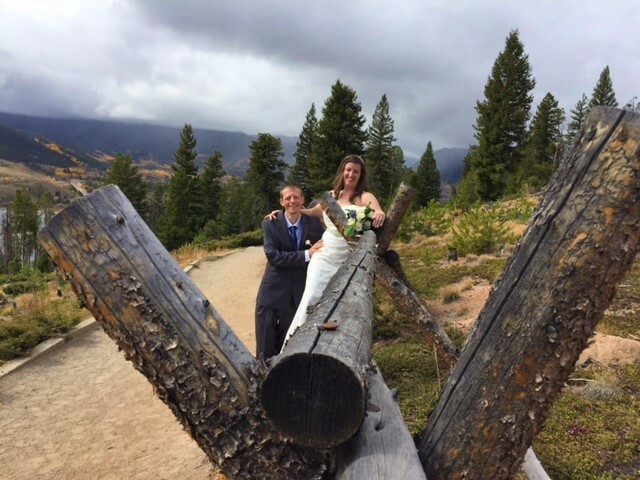 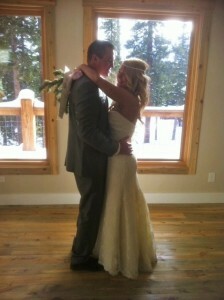 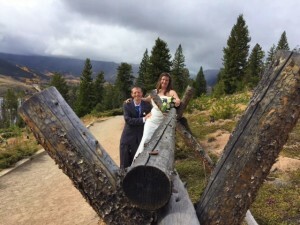 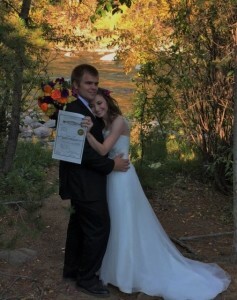 “We decided to marry in beautiful Colorado since we both love the scenery and I also have family in the area. I had a budget I was wanting to stick with, and seeing some of the prices for some elopement weddings was crazy. 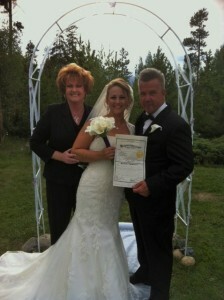 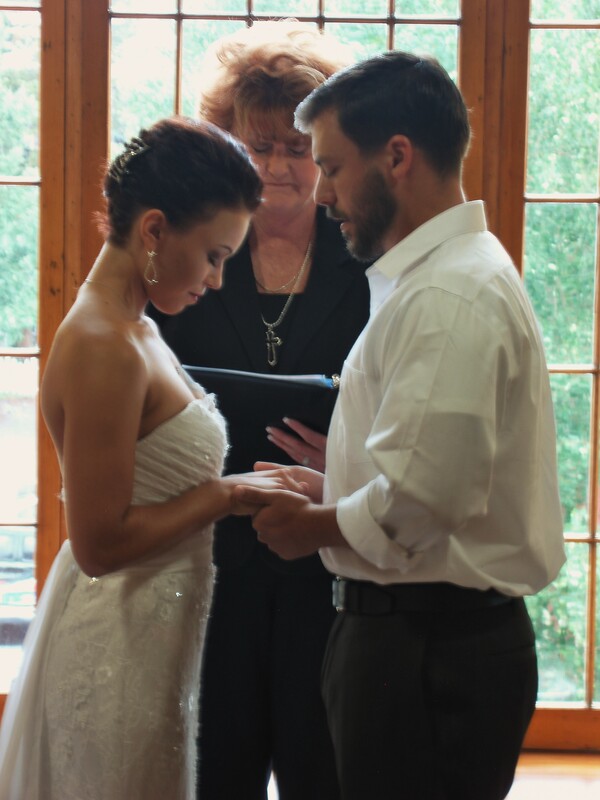 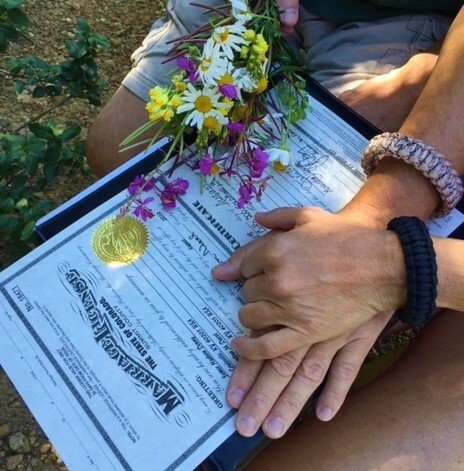 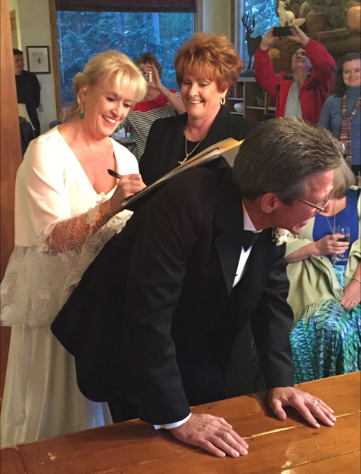 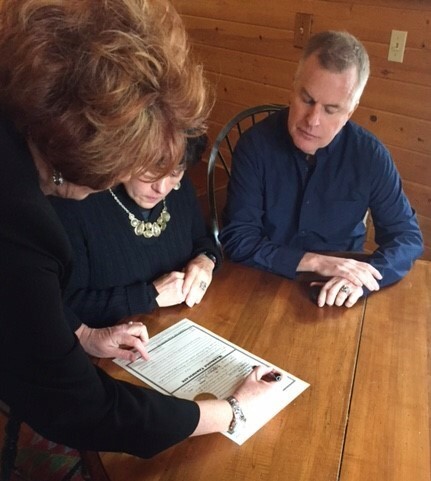 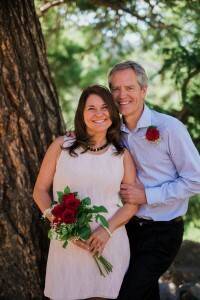 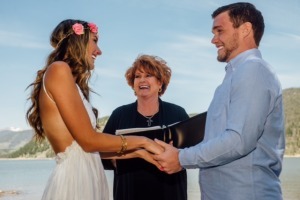 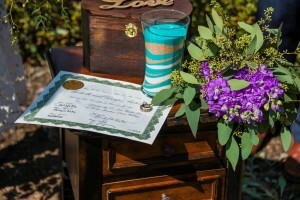 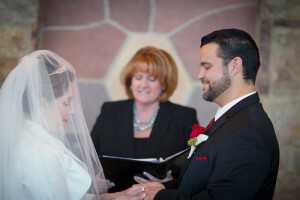 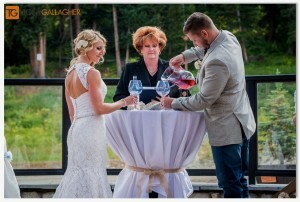 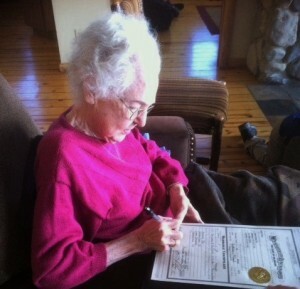 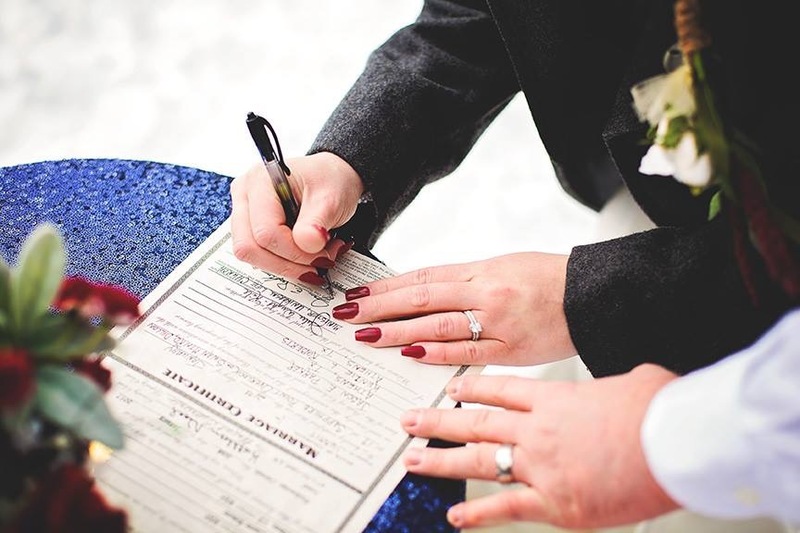 After many searches for wedding officiants I came across Julie Wright-Kile. I called her on the phone and within 10 minutes she was returning my call! 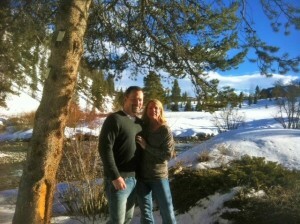 We spoke over 2 hours getting to know each other and Julie made me feel at ease. She sent a follow up email & walked us thru every step of the process. 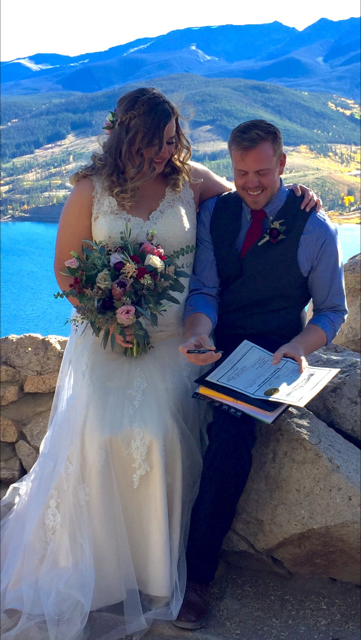 Her emails were very informative of every detail we needed to know. 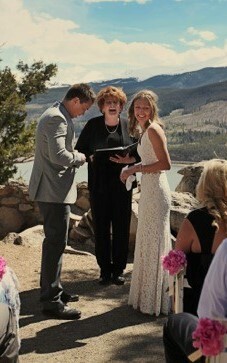 Not only was she an officiant for us, I truly feel she was our wedding coordinator as well. 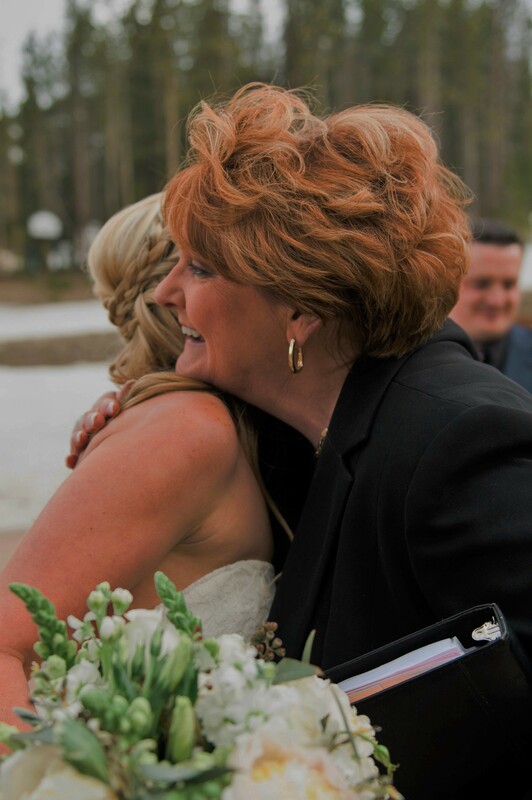 I honestly don’t think I would of been able to make the decisions I made without Julie’s guidance and helpful information. 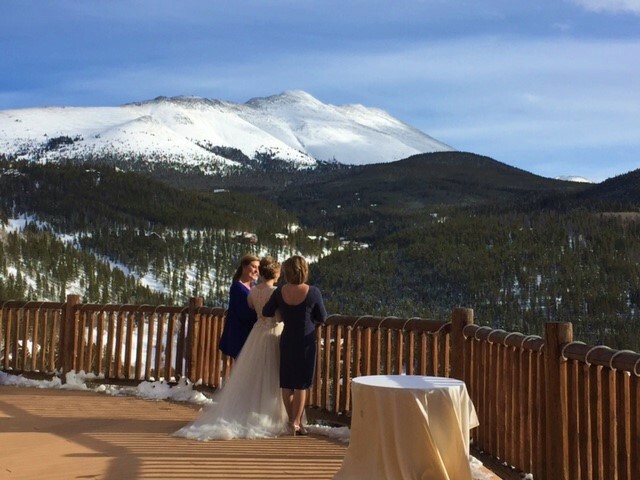 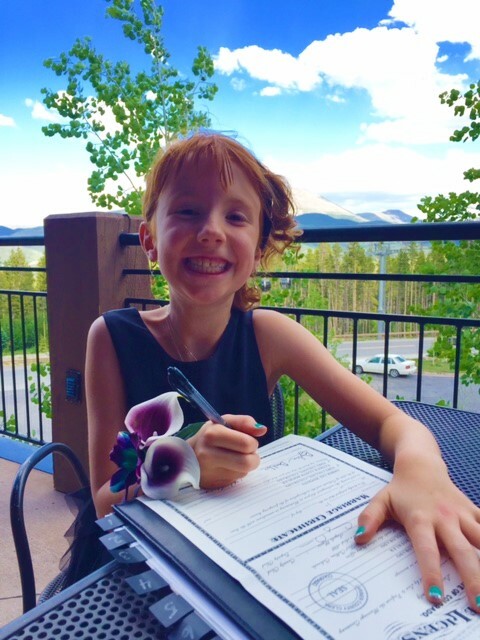 Once we made the commitment with payment and contract, Julie sent us information for local photographers in the Breckenridge area that would be within our budget. 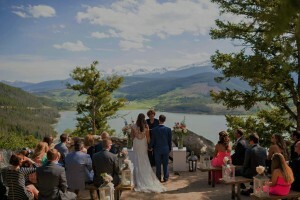 She also sent recommended hair stylists, location places of nice scenery for the wedding, wedding cake bakers, and much more. 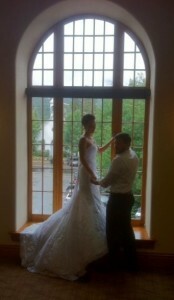 On the day of our ceremony at Sapphire Point everything fell into place. 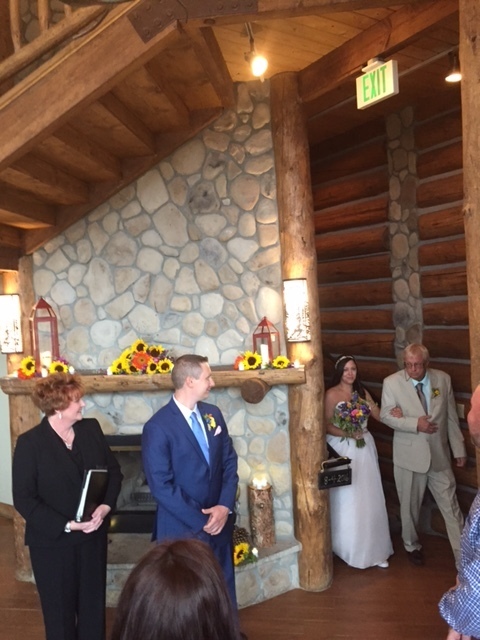 Julie did an exceptional job with the ceremony. 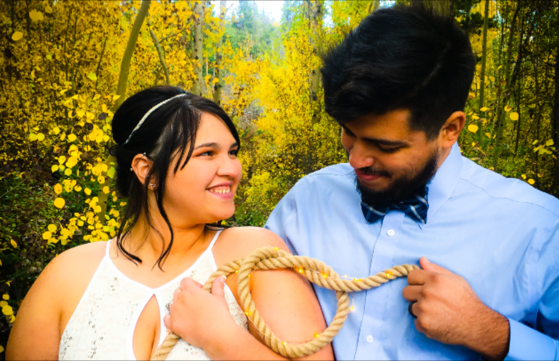 It was much more than just a few words, it was very detailed and we absolutely loved it. It was a very heart felt ceremony and turned out to be better than I had ever imagined. 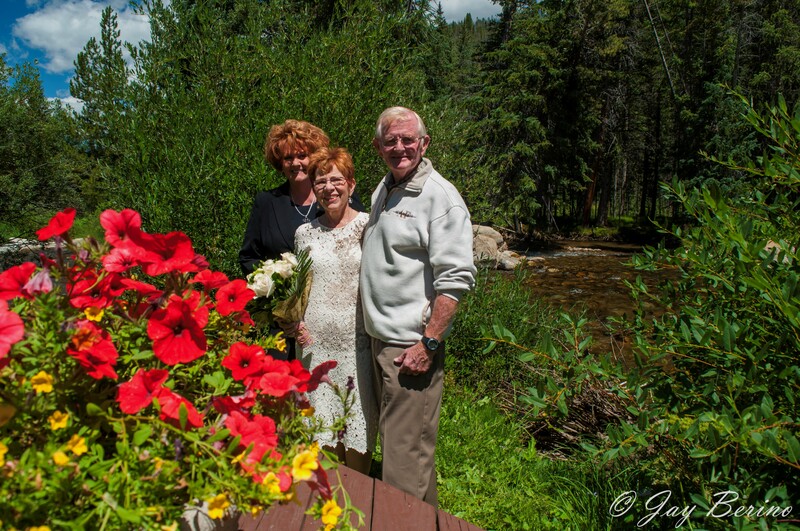 “I cannot say enough good things about Julie! 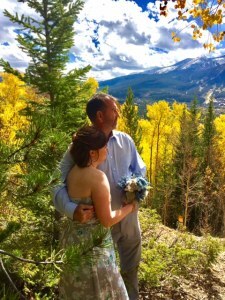 Between her impeccable attention to detail and her all-inclusive website, she made planning a wedding from afar seem like a walk in the park! Every single service we sought out came directly from Julie’s mouth, and I cannot put into words how perfect our special day turned out. She was very thorough and more than accommodating to my OCD tendencies. 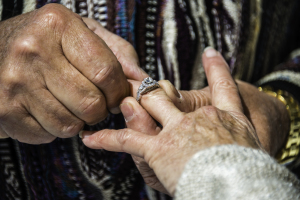 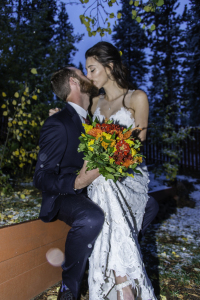 Despite having never met her before the day of my wedding, I felt like we had known one another for years; she made me feel very at ease with not a worry in the world. 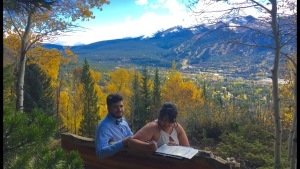 Julie got to know us and what we wanted (which was amazing, because sometimes WE didn’t know what we wanted), and she was able to help us select our date (she even monitored the weather to make sure we’d have a beautiful, sunny wedding day), our location (it was GORGEOUS! 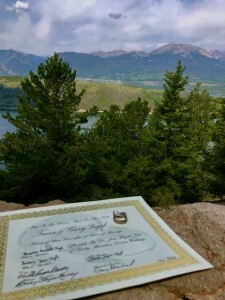 ), our ceremony details (such a beautiful ceremony, and Julie wrote the most meaningful vows especially for us), she suggested local vendors for us, helped us create a back-up plan in case of inclement weather, and walked us through the process of getting our marriage license (SUPER easy in Summit County; we did it an hour before our ceremony and we even got to pick up our certificate later that same day!). 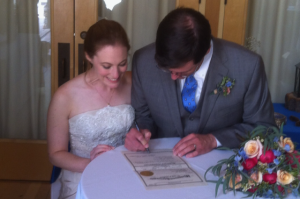 She even followed up after the wedding to help me with my name-change process. “Wow, what an incredibly beautiful and special day. It was a perfect day to cherish for forever. 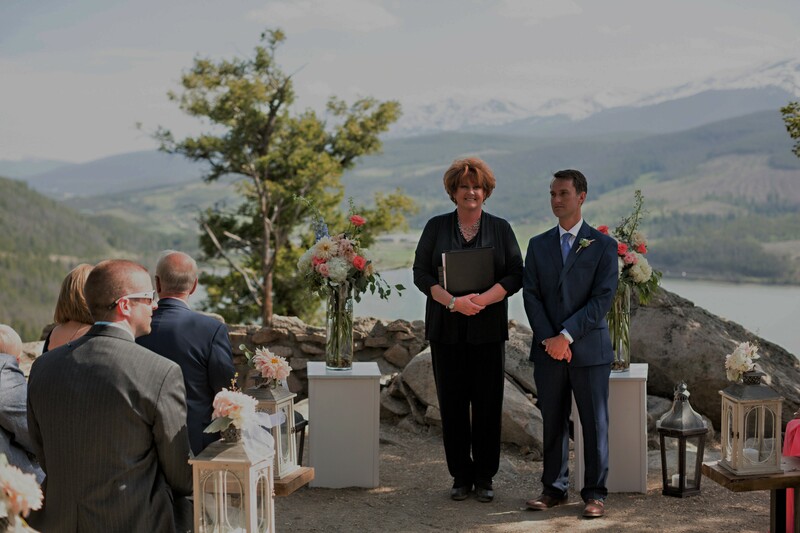 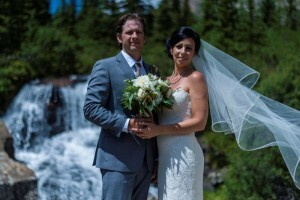 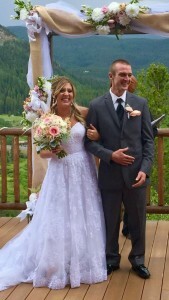 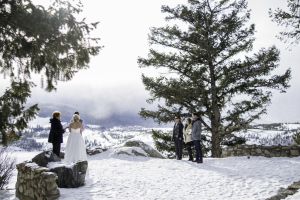 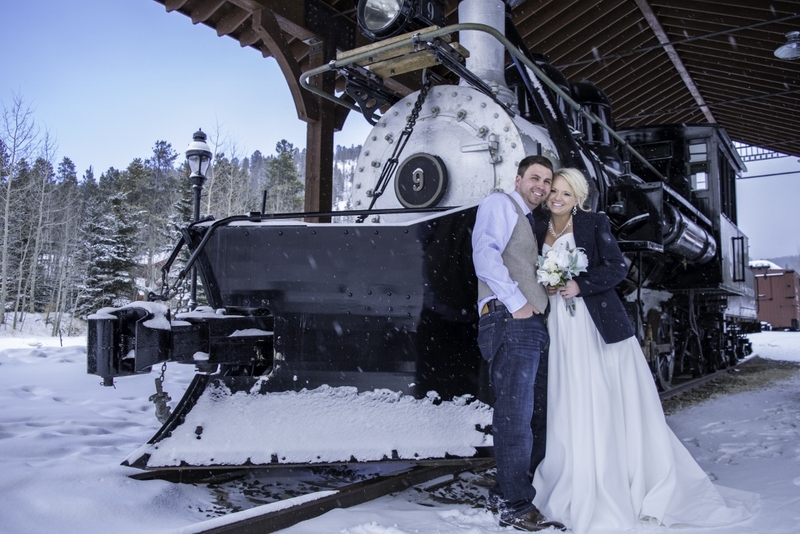 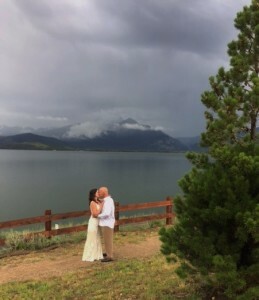 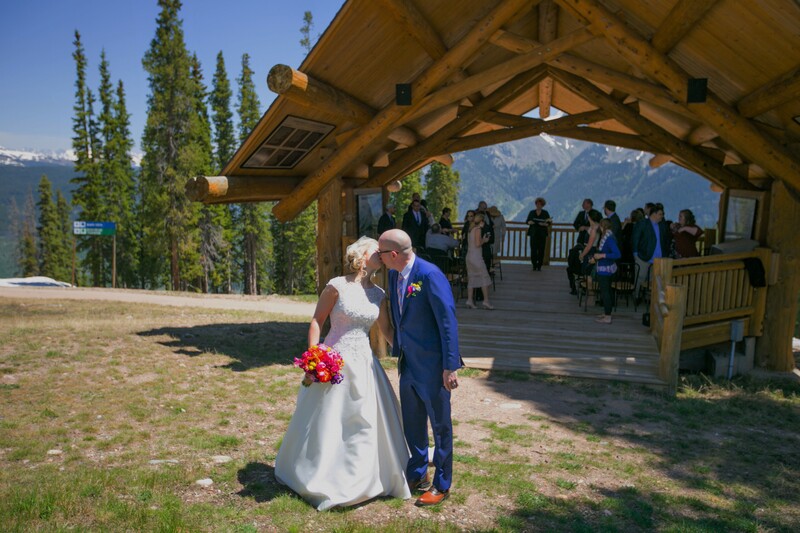 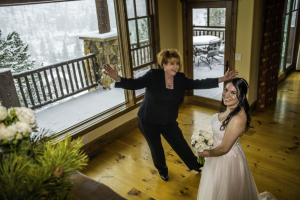 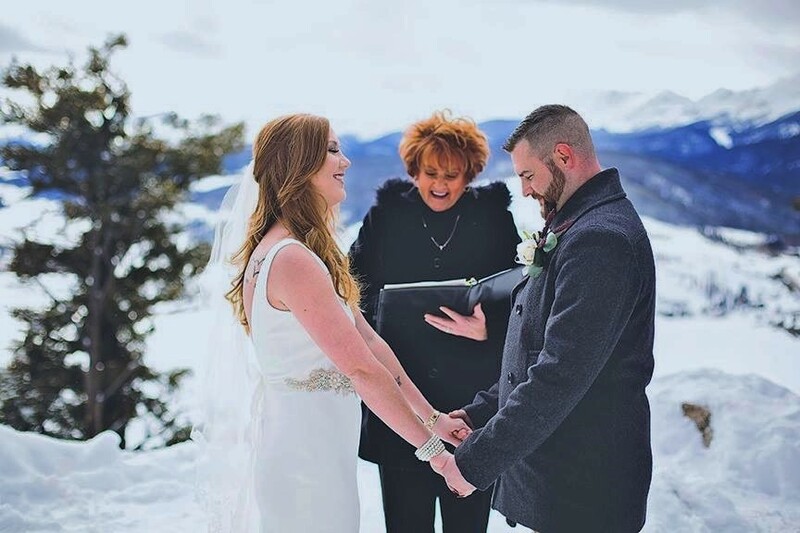 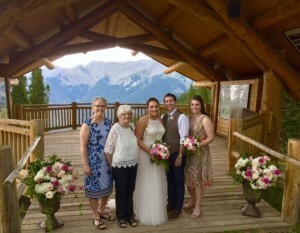 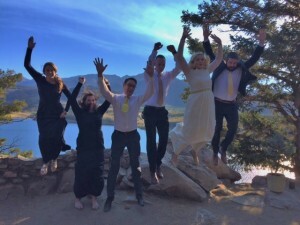 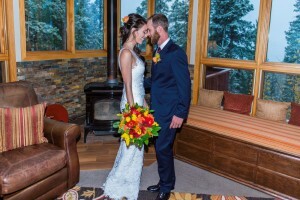 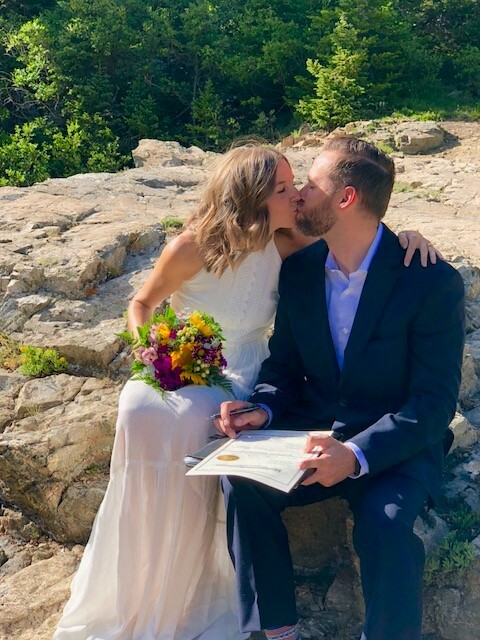 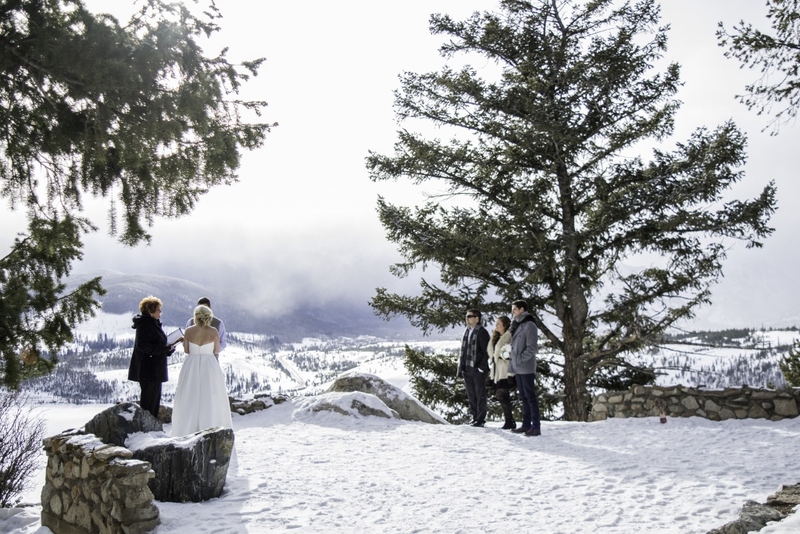 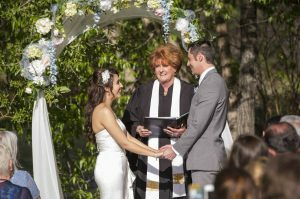 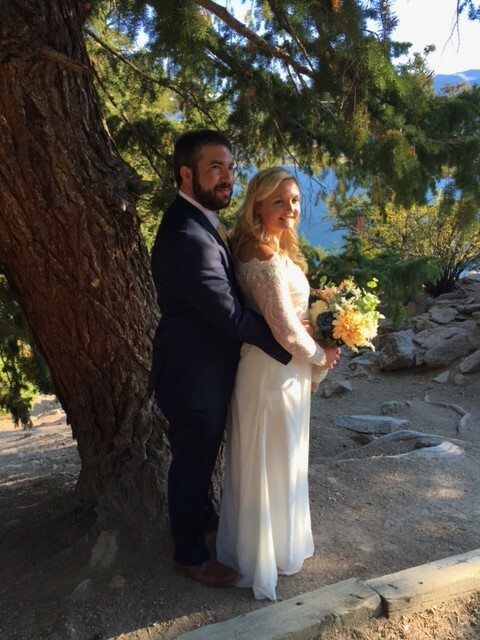 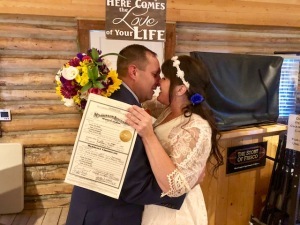 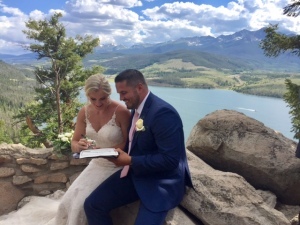 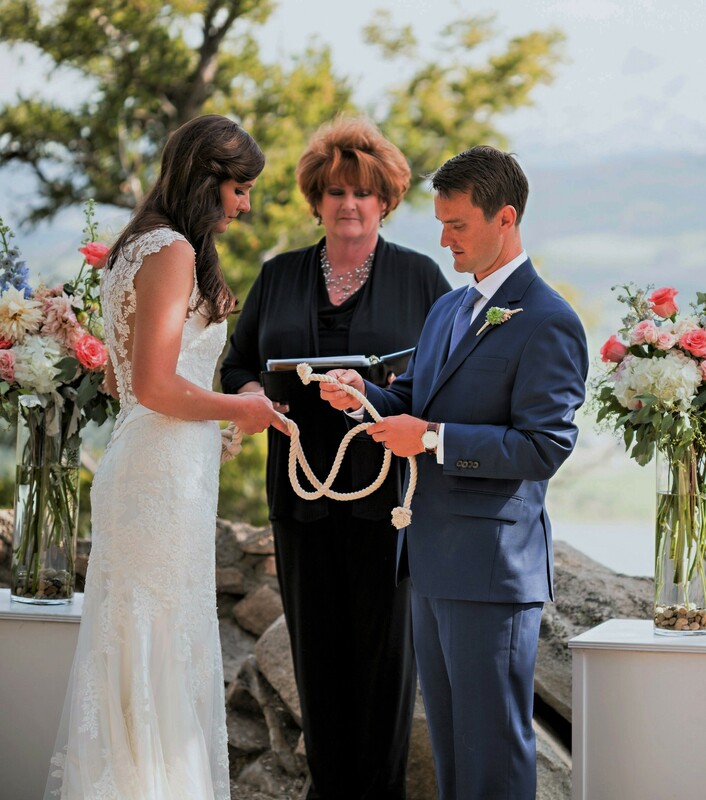 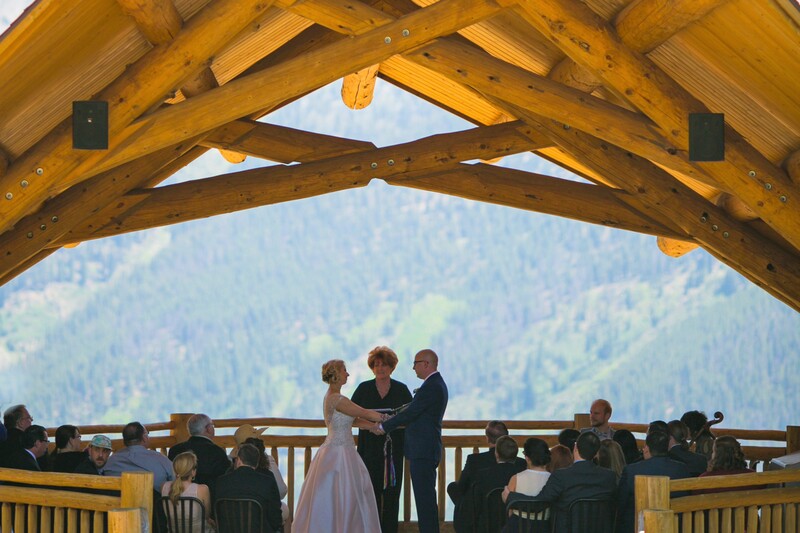 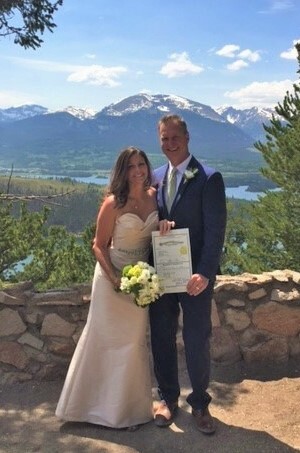 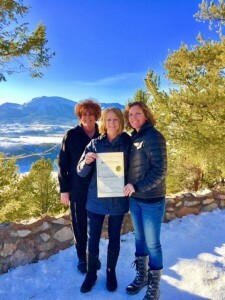 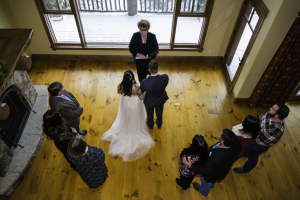 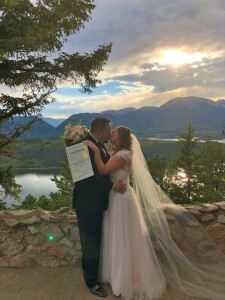 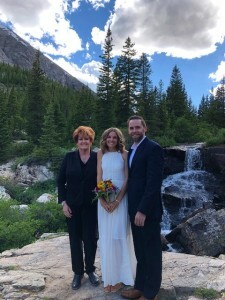 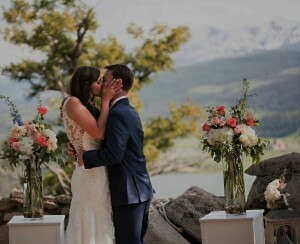 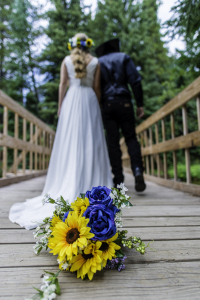 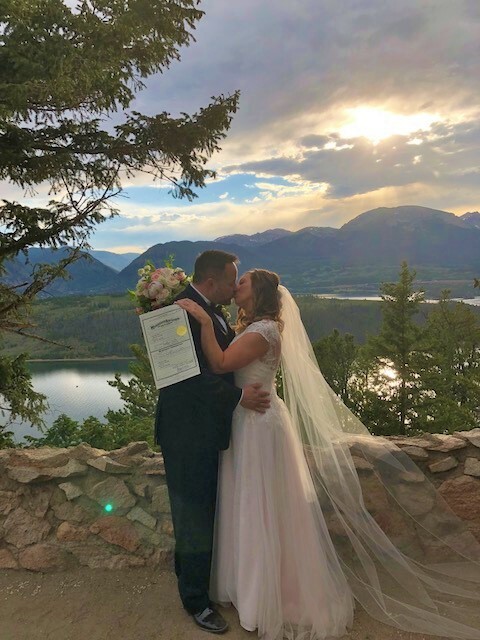 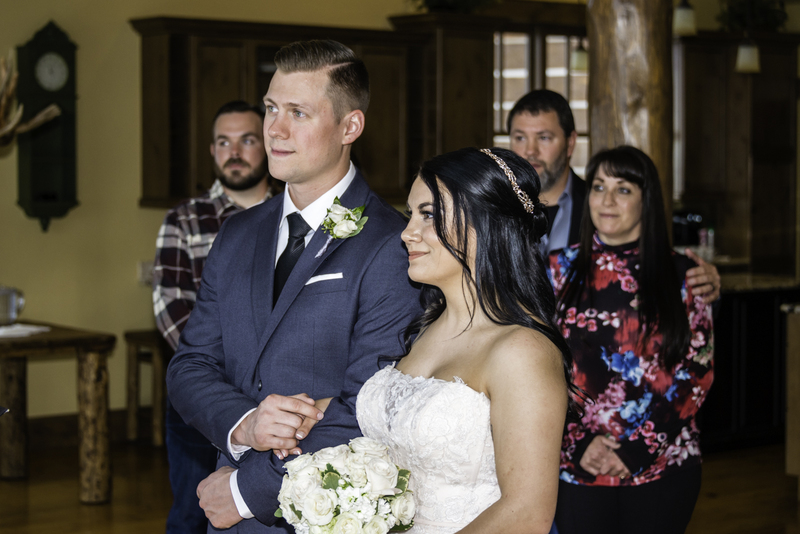 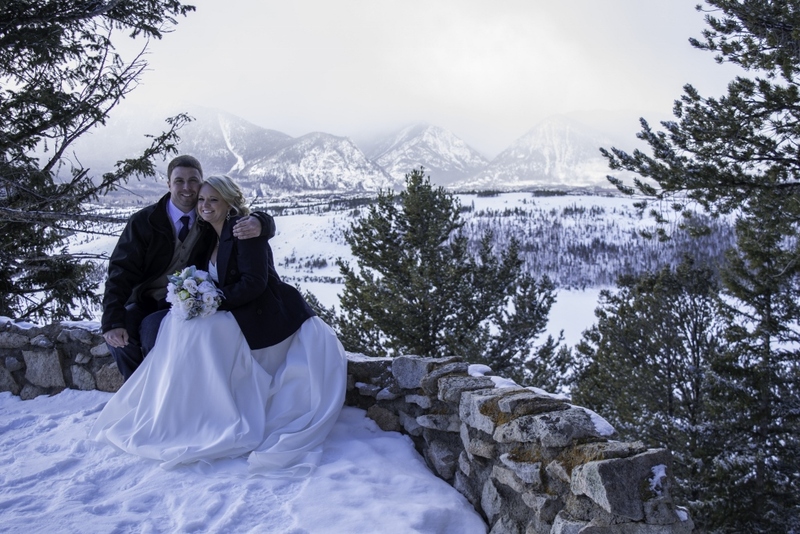 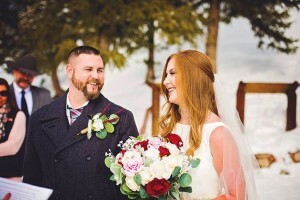 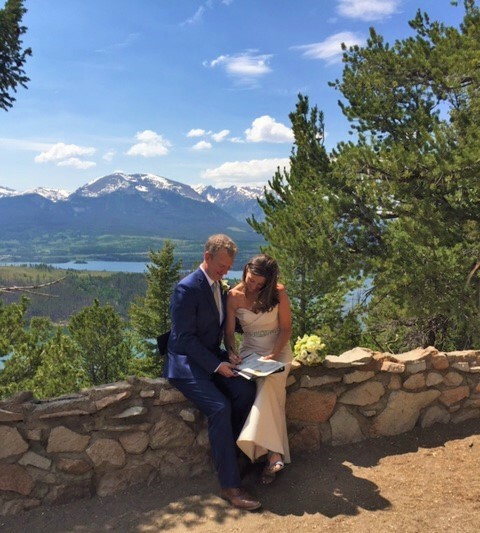 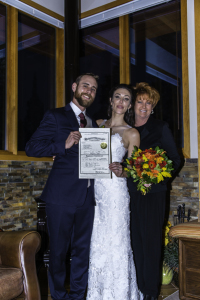 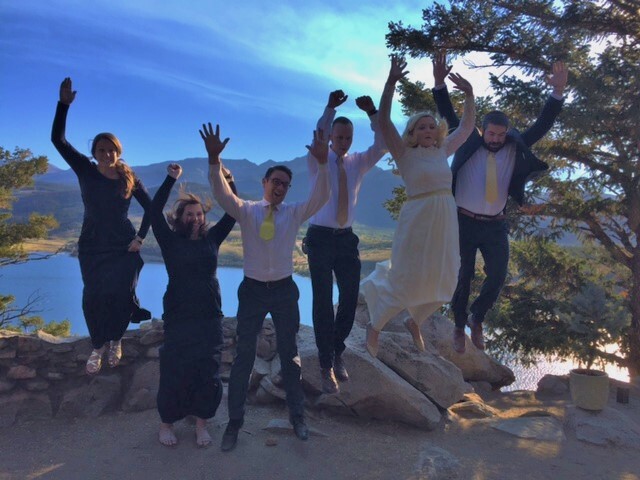 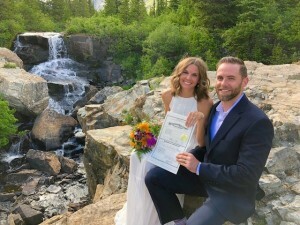 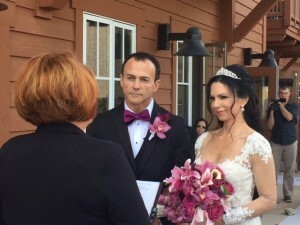 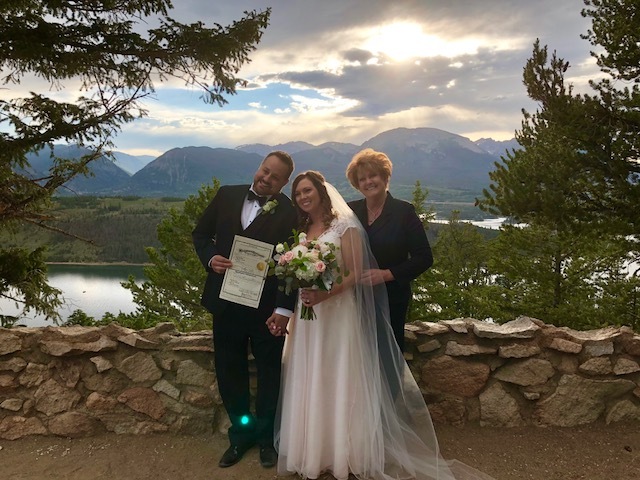 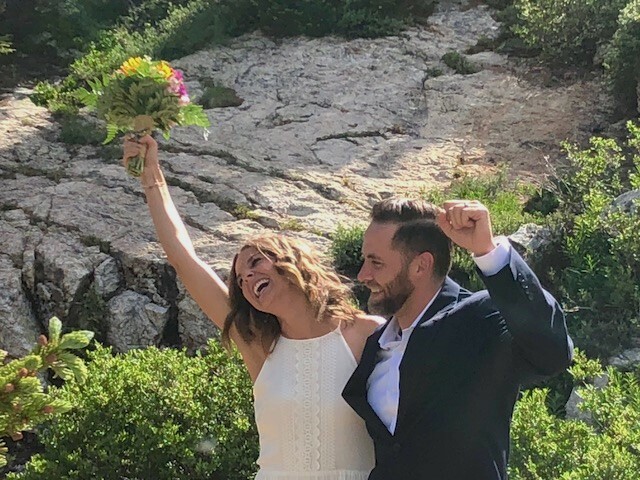 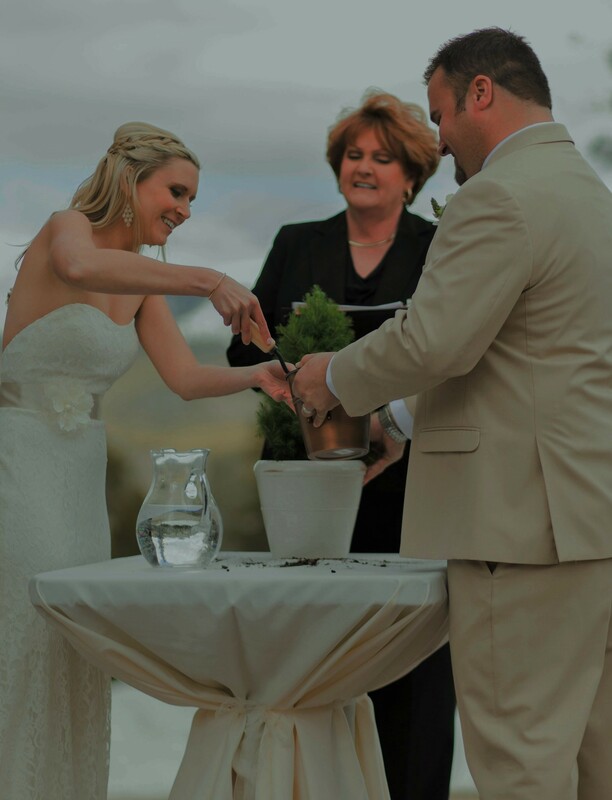 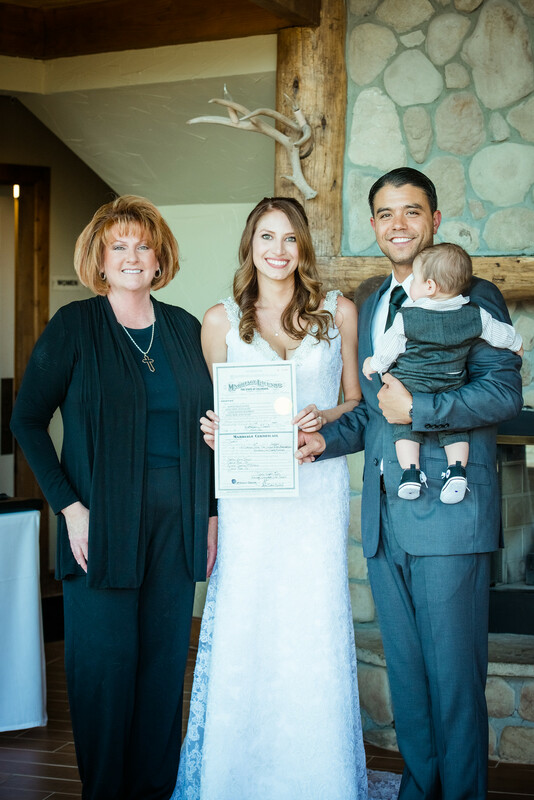 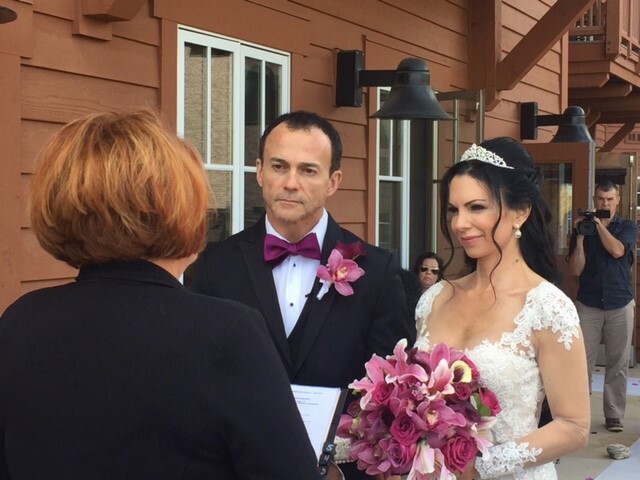 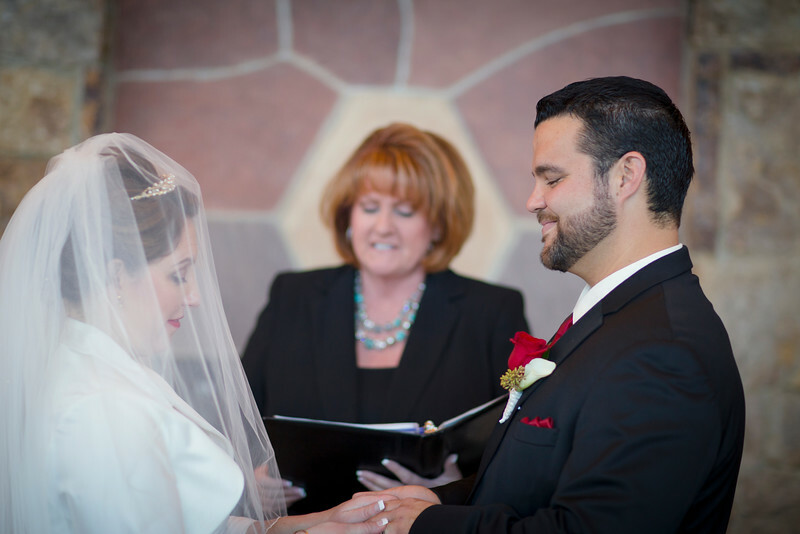 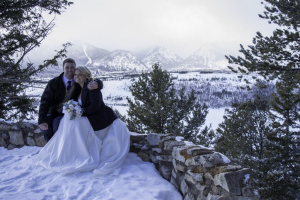 We believe the largest factor contributing to our incredibly perfect day was because of Dr. Julie Wright-Kile and hiring her services with Rocky Mountain Dream Weddings. 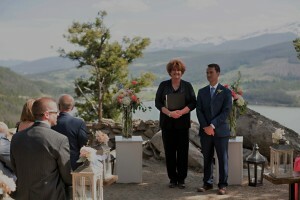 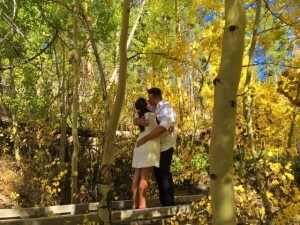 After getting engaged, we knew we wanted a special, yet small and intimate wedding in Colorado. 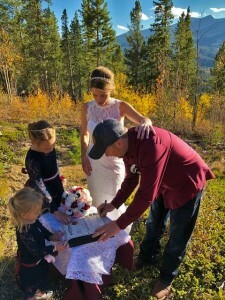 Being from Texas, we were extremely nervous being out of state and not sure who to choose for our forever family promise. We came across several options, but after our first contact with Julie we immediately felt connected to her and knew she was the PERFECT person for this special occasion in our lives. 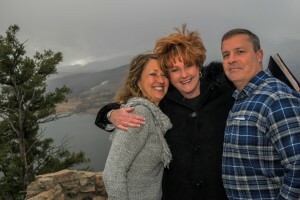 Julie is a relational person and values connection and getting to know you. 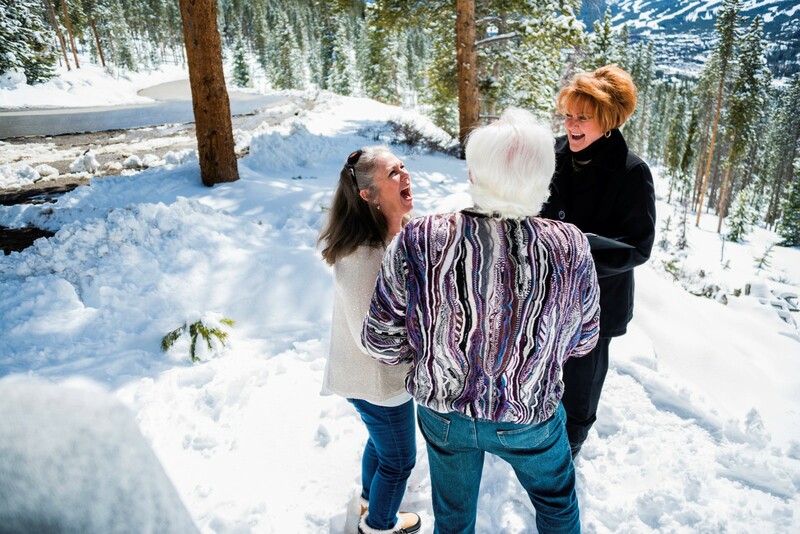 Before your ceremony, you feel as if you’ve been friends for a lifetime. 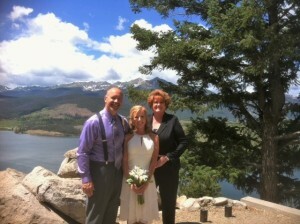 Julie made the both of us feel comfortable and at ease from our first phone call!! 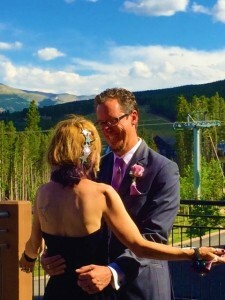 We still believe that was the BEST decision we made, other than finding one another (of course)! 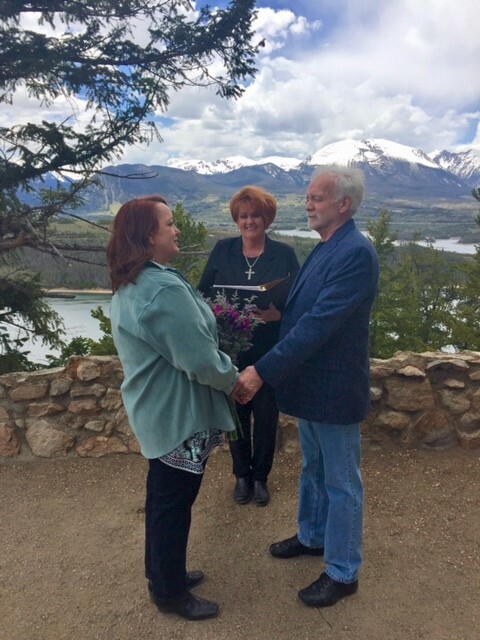 Julie was a phenomenal officiant for our ceremony, and now has become a special part of our lives and a real friend. 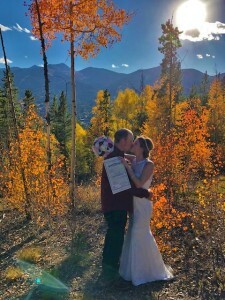 Whether getting married out of state or nearby, you never know what glitches could arise; however, with Julie’s expertise, knowledge, experience, and professionalism, she was able to guide us in the right direction to have a stunningly gorgeous day we will never forget and always cherish!! She provided incredibly spot on and invaluable advice in regards to every detail you may want to incorporate. 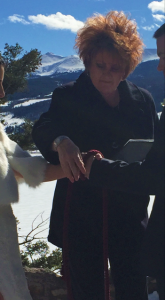 Truly, there was nothing she did not think of, and we were forever grateful for these pieces of advice and guidance. 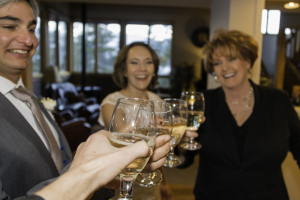 Even further, she is timely in her responses and makes it easy to review any and all communication you’ve had with one another. 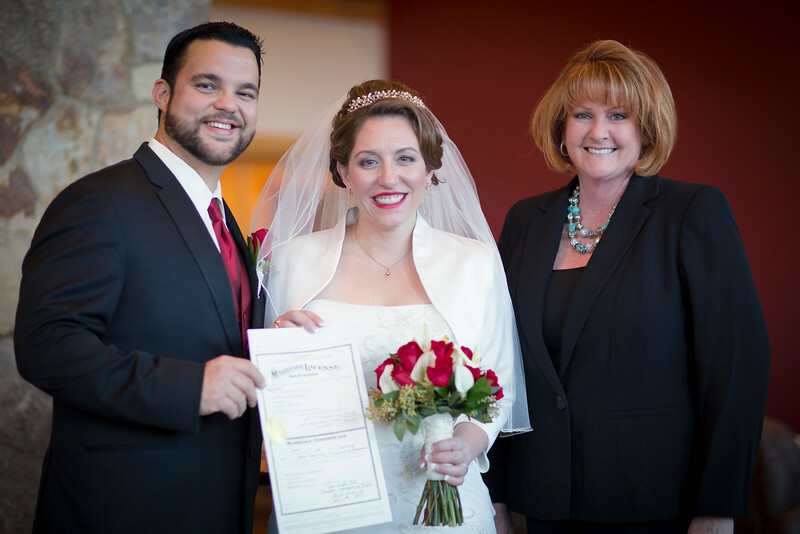 Julie provided us with invaluable knowledge to make sure we would have an experience we desired for our Forever Family Promise. I love how willing she was to incorporate our young twin boys into the ceremony. She listened to our hopes and desires and helped to piece together a ceremony that was respectful of all our wishes and desires. 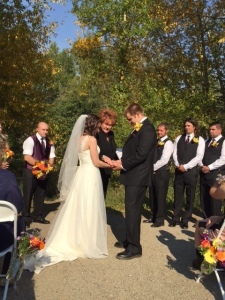 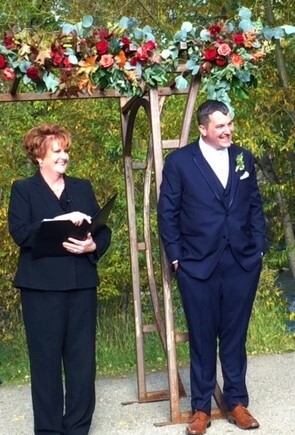 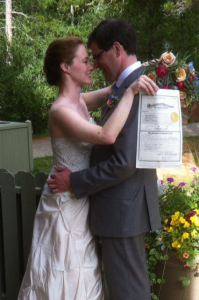 Julie provided a warmth to our ceremony, was a true professional, and provided us the most heartfelt wedding! 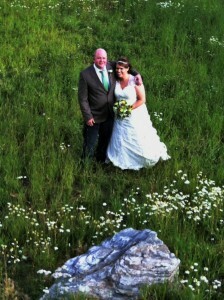 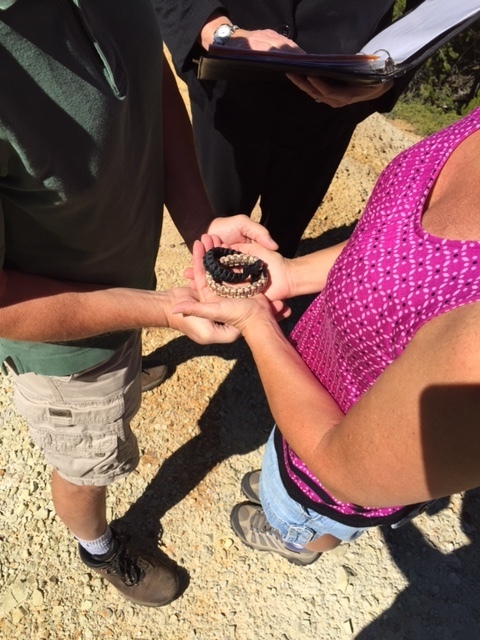 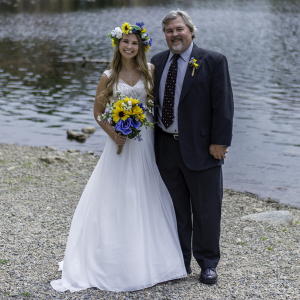 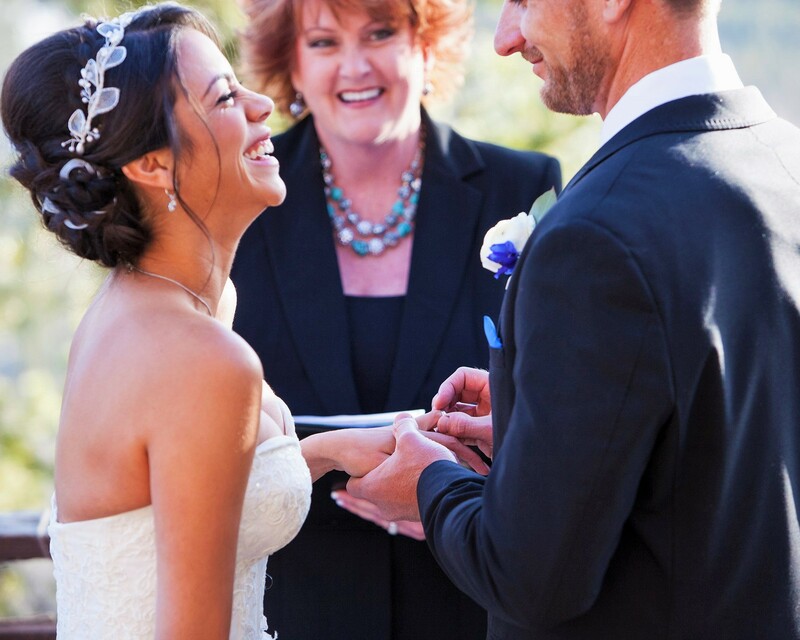 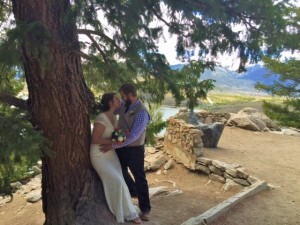 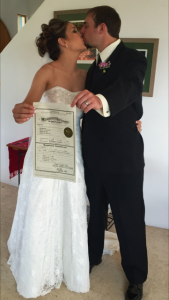 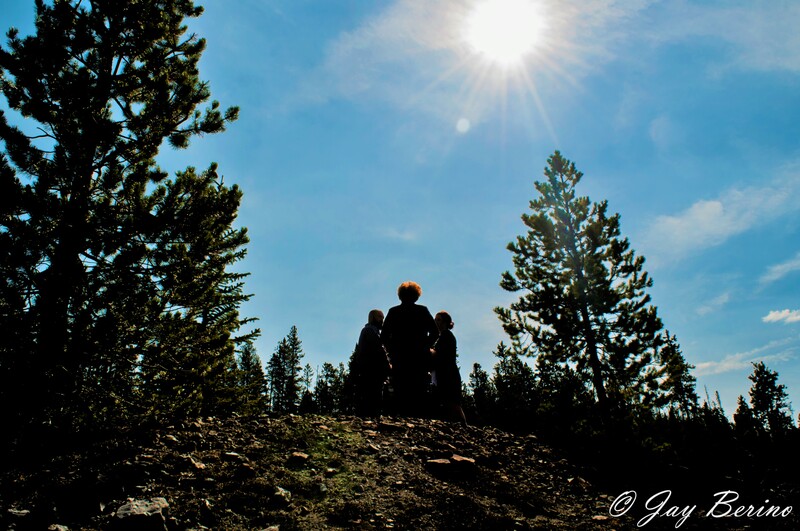 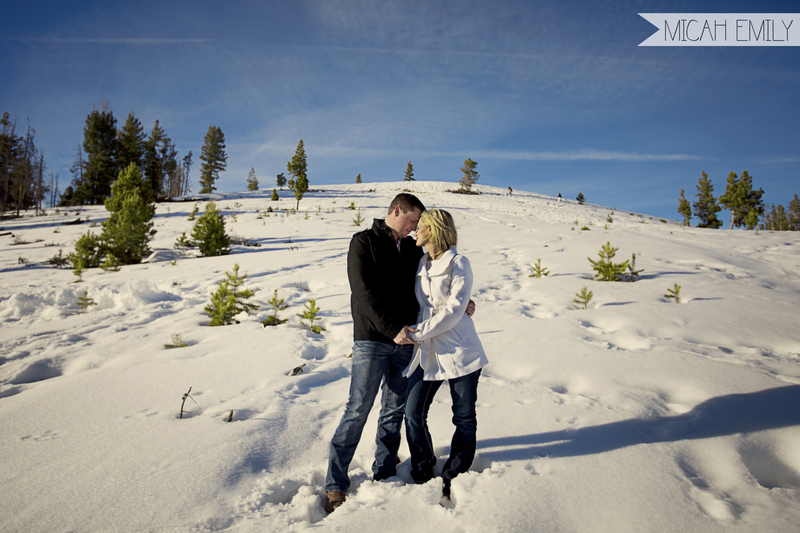 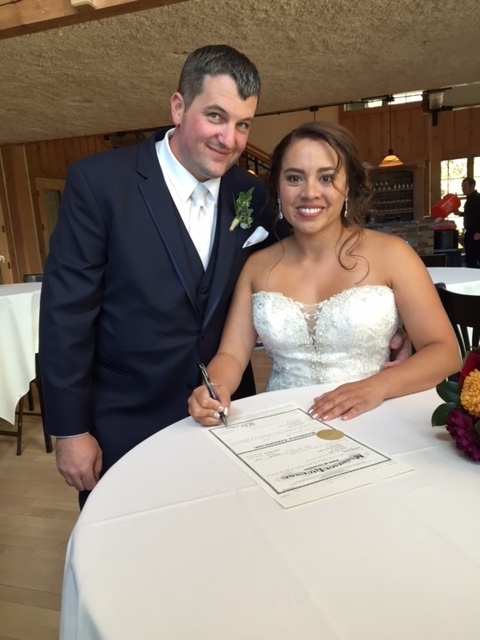 “Julie was really the person who made our elopement a special, magical event. 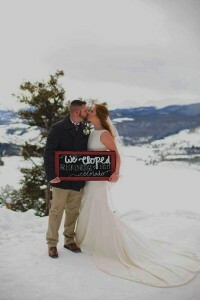 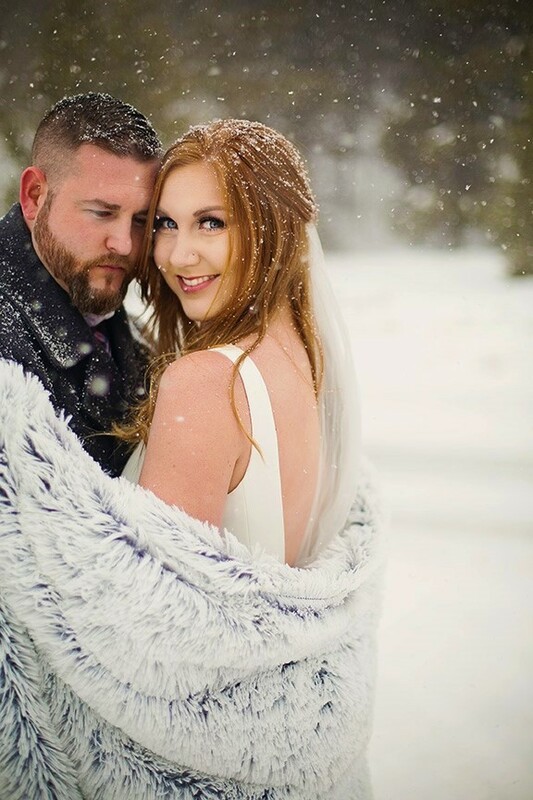 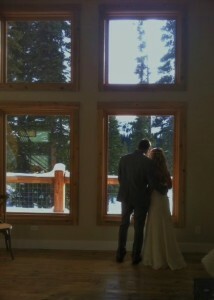 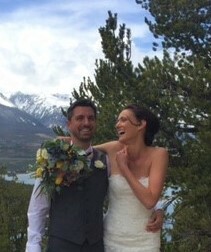 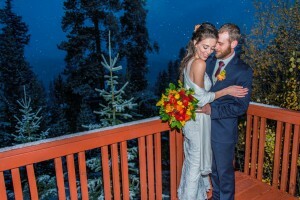 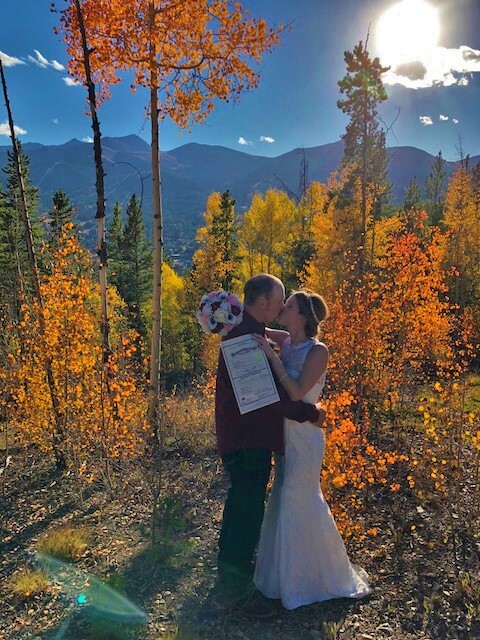 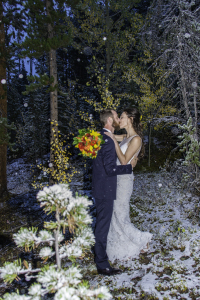 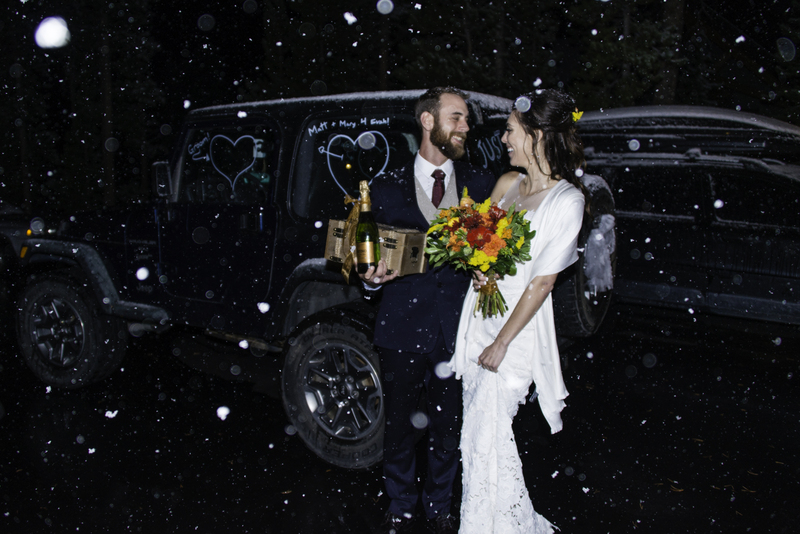 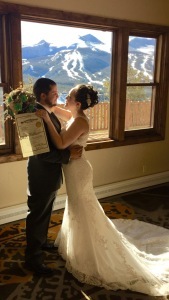 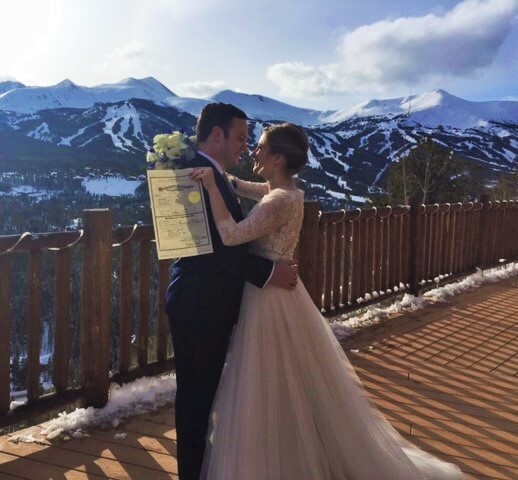 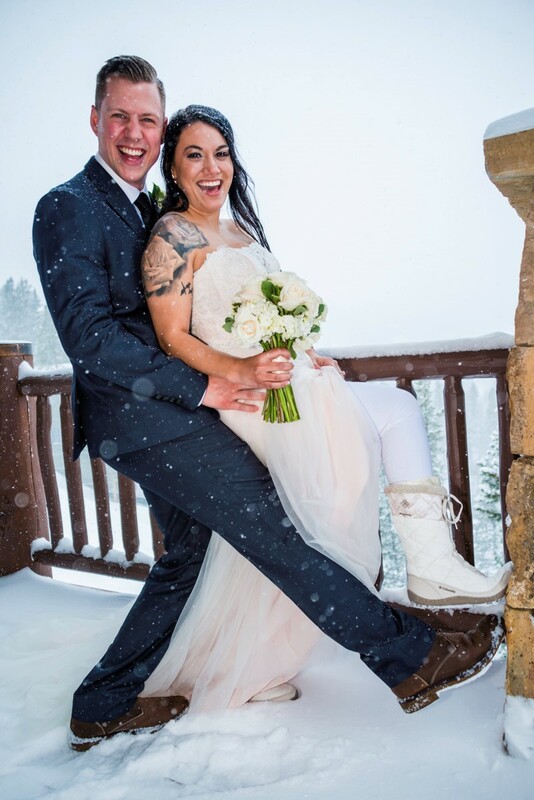 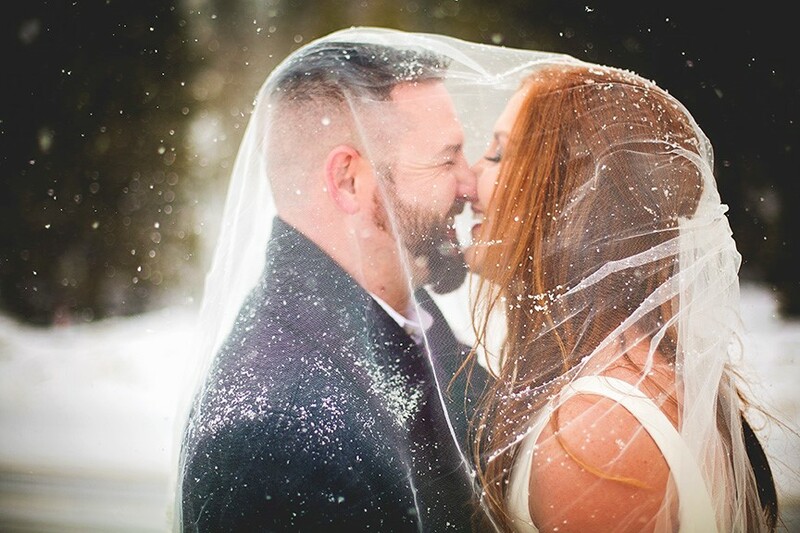 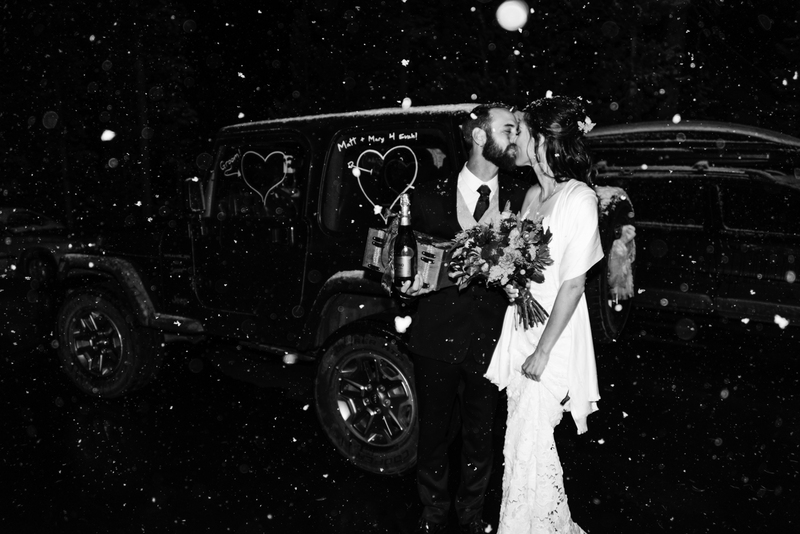 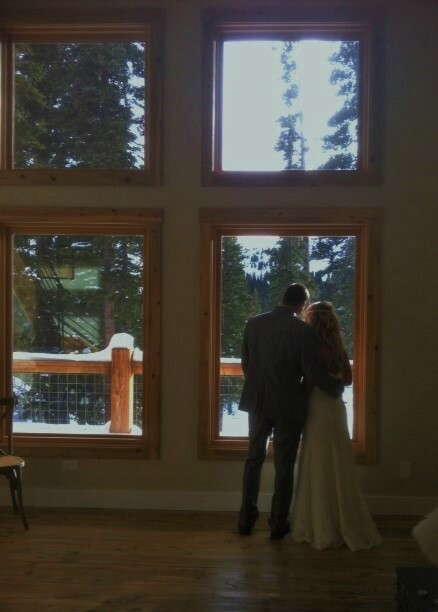 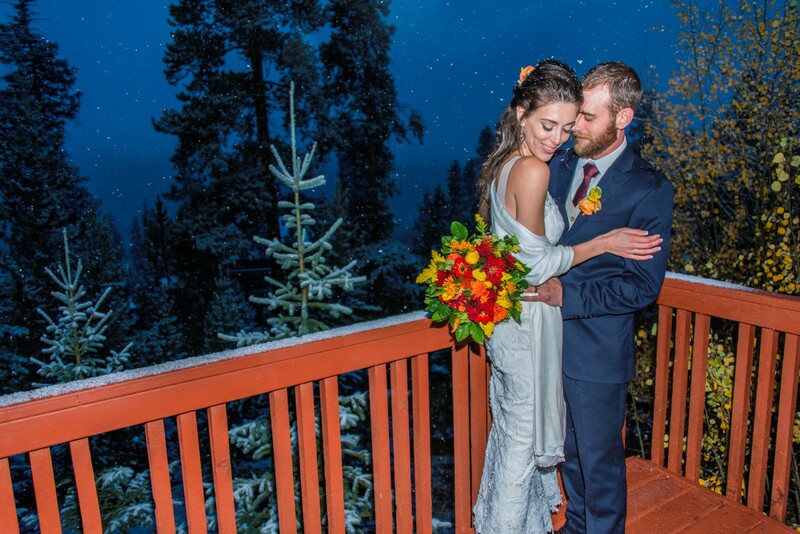 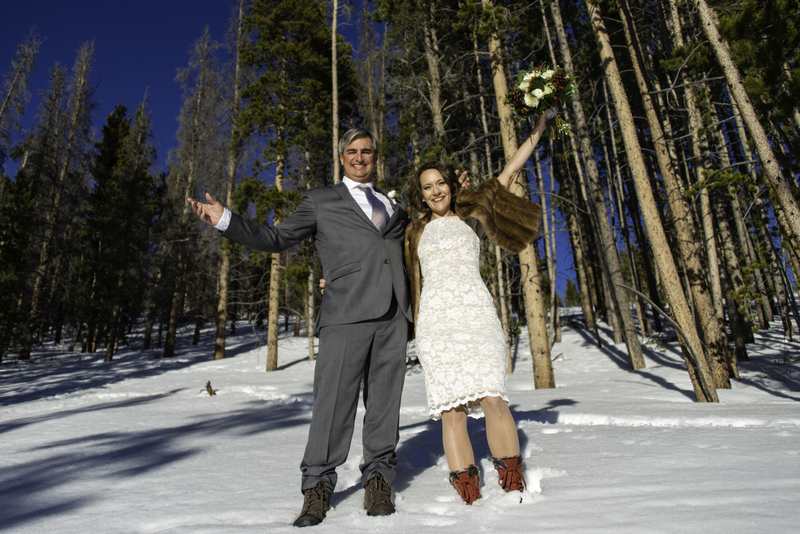 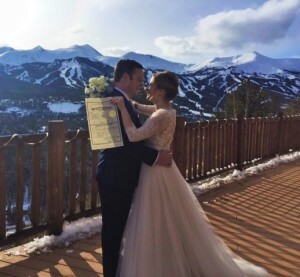 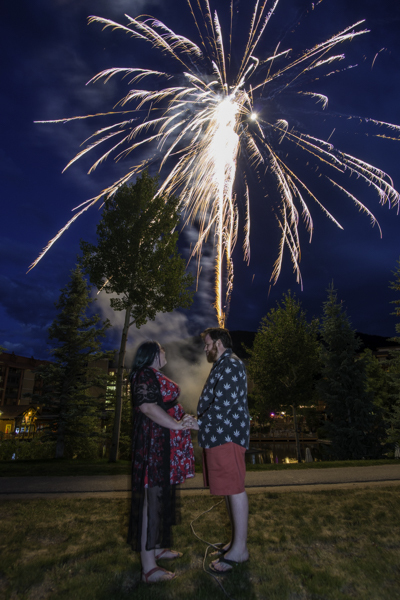 We don’t live in Breckenridge but decided to get married there because we wanted snow on our wedding day (the anniversary of when we officially started dating). 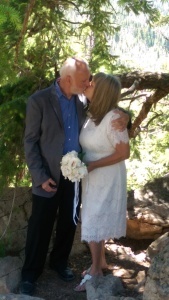 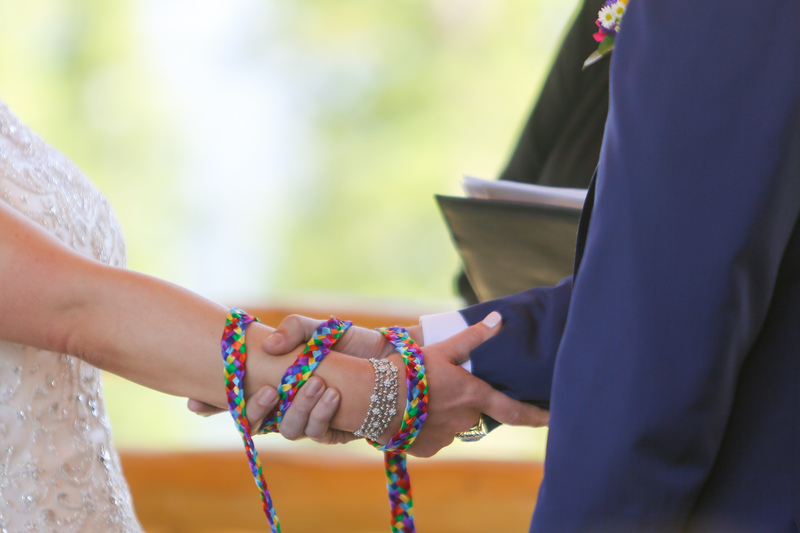 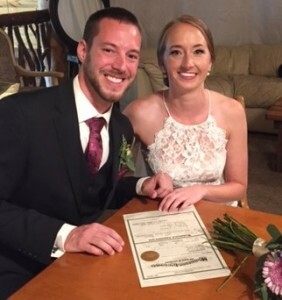 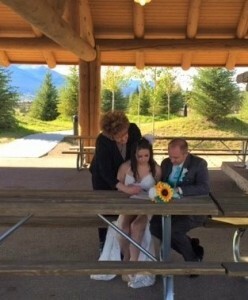 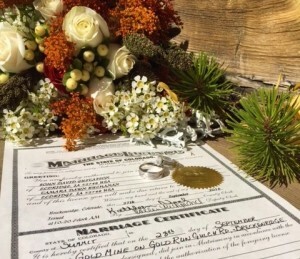 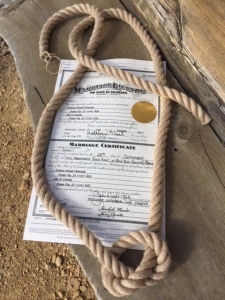 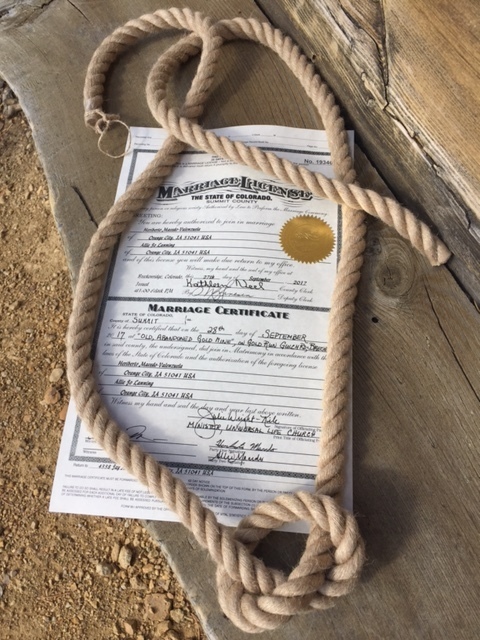 She wrote detailed, clear email communications regarding our ceremony elements, including the hand fasting we requested, and was respectful of our wish to have a non-religious ceremony. 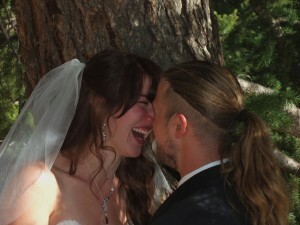 She wrote a BEAUTIFUL reading regarding our relationship that we could tell was custom-designed for us. Additionally, Julie helped us choose our venue – my husband wanted to be outdoors among the trees and near water, and she knew the perfect spot. This involved a lot of emails and attached photos, and she was so patient. I had scheduled a babysitter to watch our 11 week old son during our wedding, but the babysitter said she was running late, then cancelled after I asked Julie and our photographer to wait for us an extra half-hour. 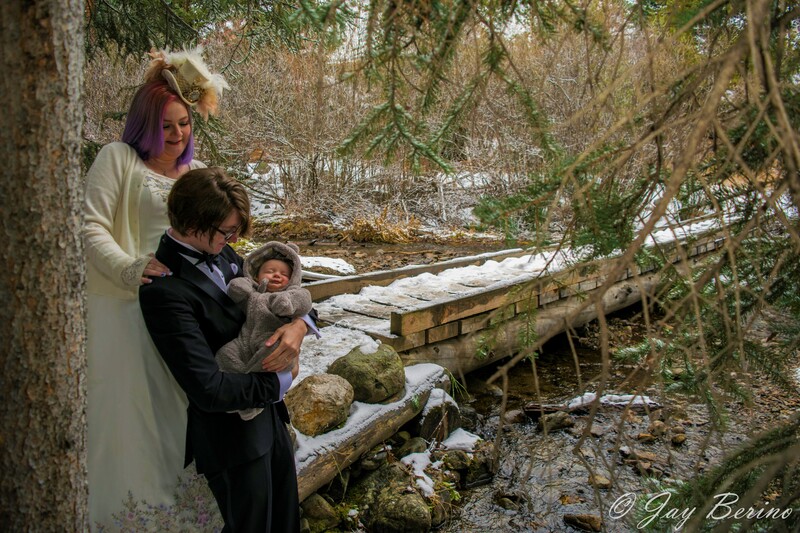 We wound up dressing our son in a teddy bear snowsuit and taking him with us as we got married (teddy bears are the perfect accompaniment to a tuxedo, in case you were wondering), and Julie not only handled this curveball with utter grace, she also cooed over and loved on our son while we took photos outside. 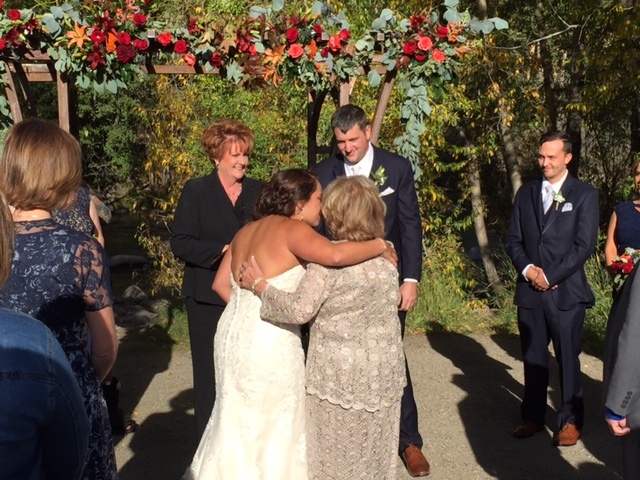 She assured us that she’d had children at wedding ceremonies before and I was really touched by how she interacted with all of us. 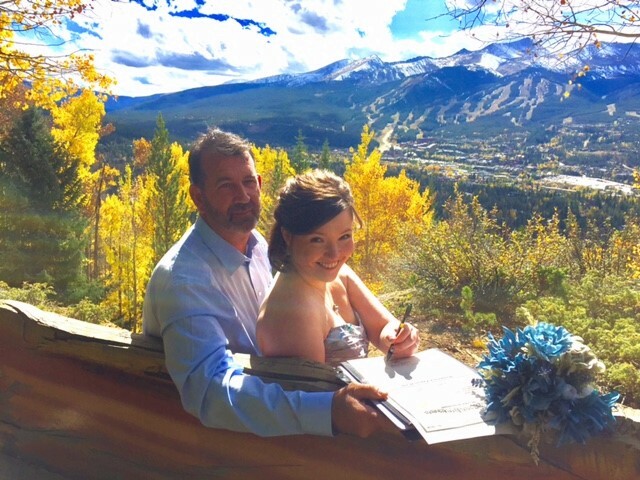 We opted, based on Julie’s advice, to get our marriage license at the courthouse in Breckenridge and as she promised it was fast and simple. Right after our wedding she actually hand-delivered our completed license to the courthouse and we picked up all our certified copies the next day! Everything was so simple. 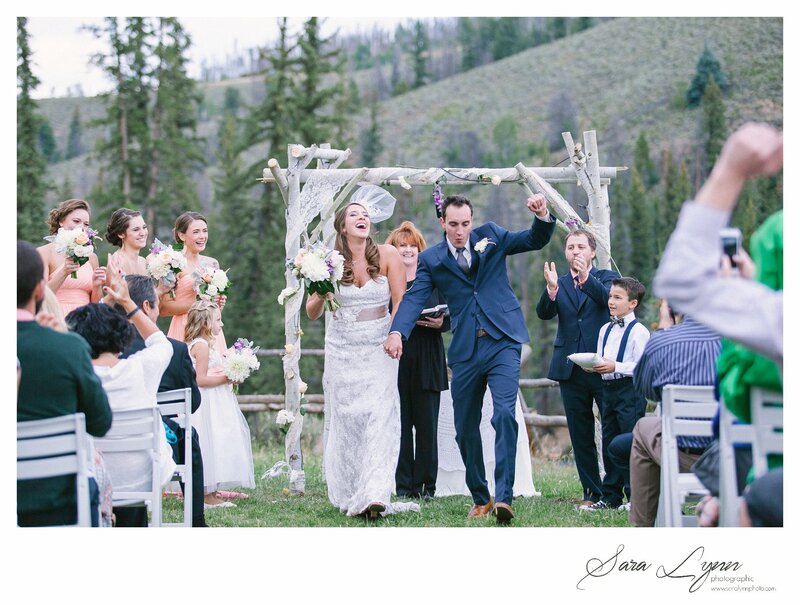 “Jen and I dreamed of a small wedding in the mountains but had very little idea of how to complete such a task. 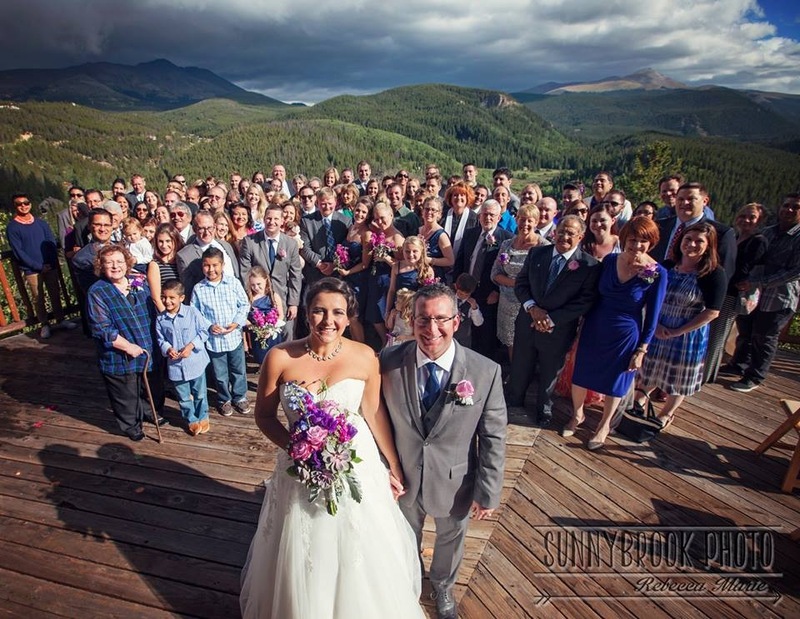 We “Googled” a few places and of all the best reviews online,”Julie” was the common theme. Jen contacted Julie and she guided us through the entire process. Not only did she tell us “what” needed to be done, she told us “why” and “how” to complete each task. 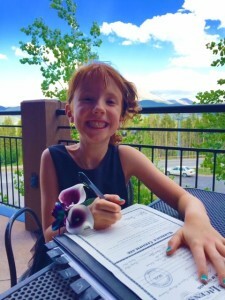 One of the most comforting characteristics was that Julie communicates very well. 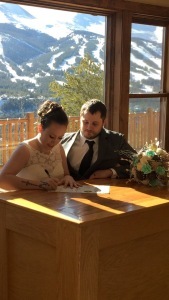 Emails and calls were returned immediately. Jen is from IL and I am from TX and we live in NE. 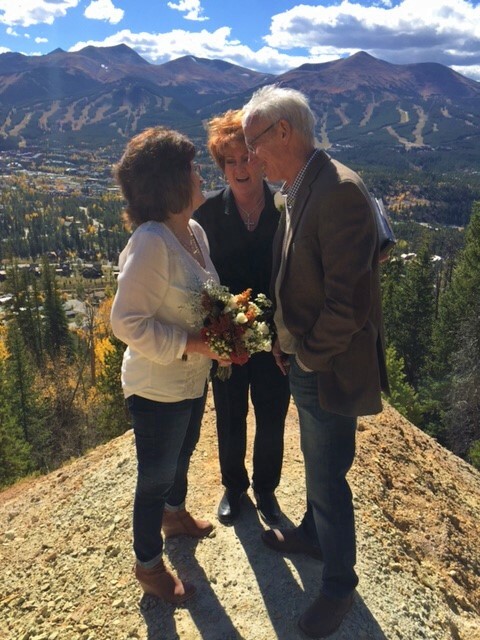 We were coming from various parts of the country and Julie’s communication made a stressful planning process extremely pleasurable. 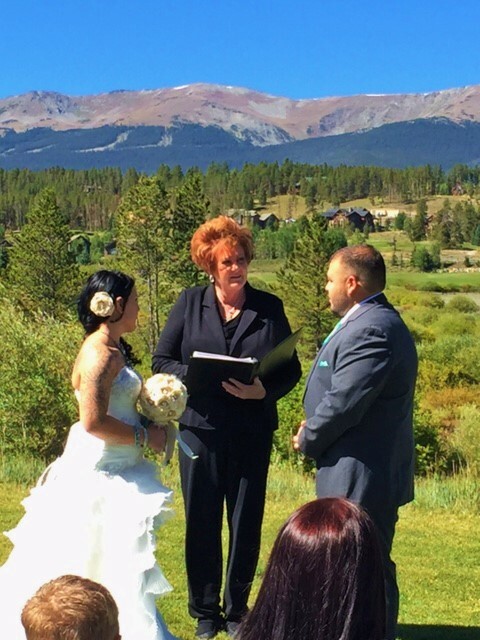 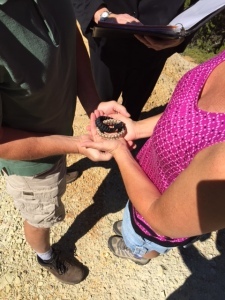 Julie is more than an officiant, she’s our new friend. 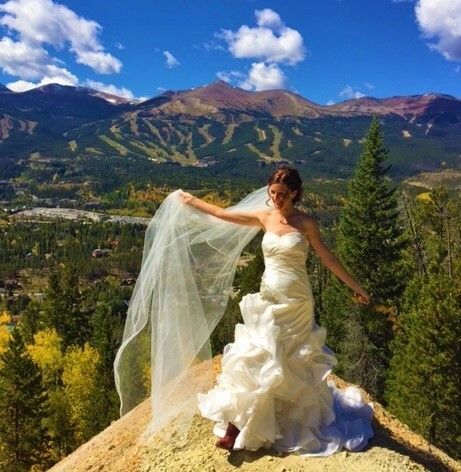 She helped with lodging, event planning, family accommodations, and how to deal with hardships that may (and will) occur with any wedding. Along with the wedding preparations, Julie had every potential issue accounted for. 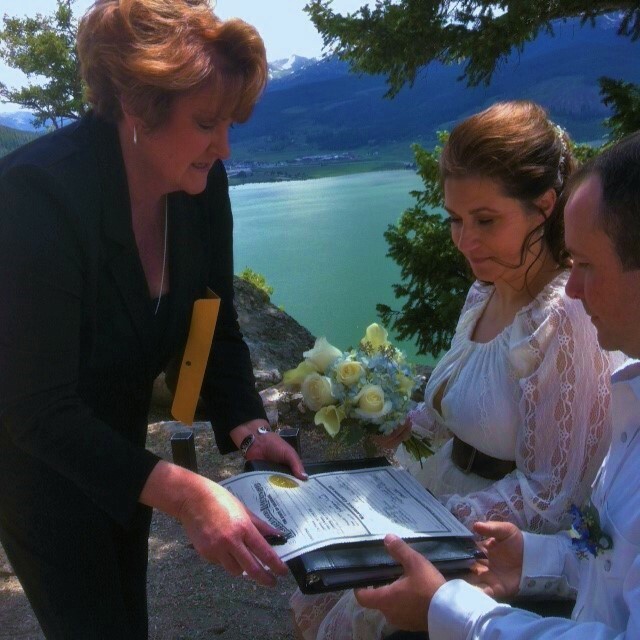 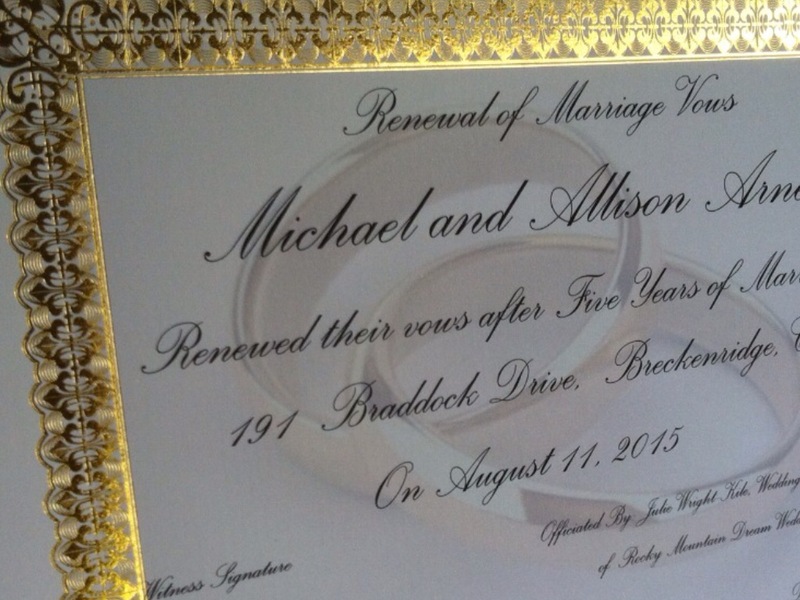 For example, when Julie arrived, she asked me, “Matt, do you have your vows?” I replied, yes and she continued with showing me that she had printed off a second copy if I had forgotten. 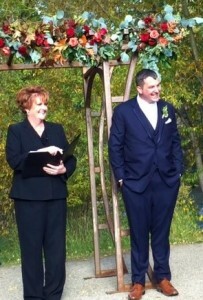 Unsurprisingly, we were nervous. As I stood waiting for Jen to arrive, Julie comforted me and guided with all the instructions of events. Julie was our coach and coached us through the entire thing! 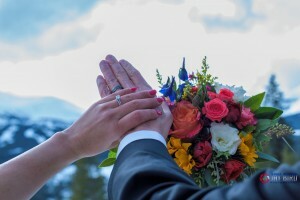 If you are reading this, you understand the importance of your wedding day. Julie is the best. 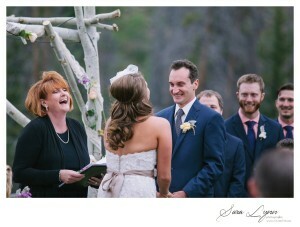 You can easily sense that the “love” among couples fuels her passion to be apart of the event. I often referred to her as our wedding planner because she did WAY more than an ordinary officiant. Her prices are competitive and we would have paid TRIPLE (or MORE) for the service we received. 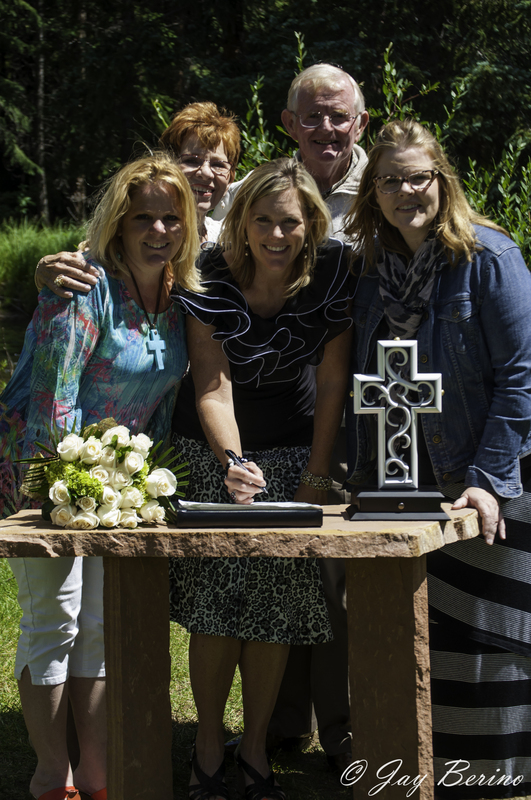 We profoundly respect Julie and advocate her services to couples wanting a first class event. 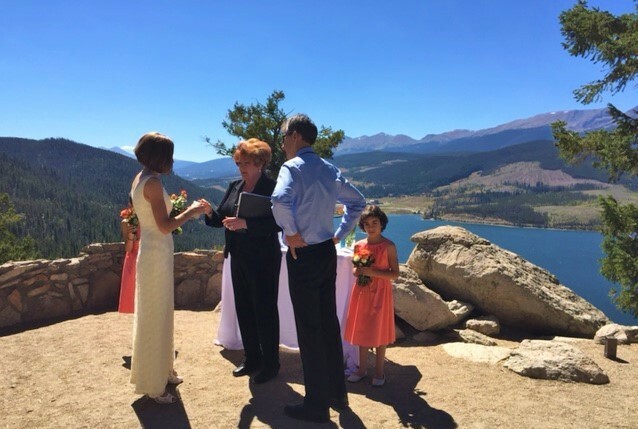 My advice is that you will “get” what you “put” into your planning. 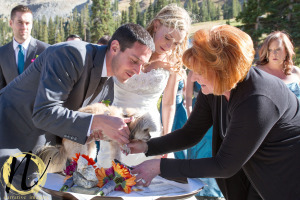 If you do what Julie requests, your wedding will be flawless! credit to our photographer for 2/5 of these pics! 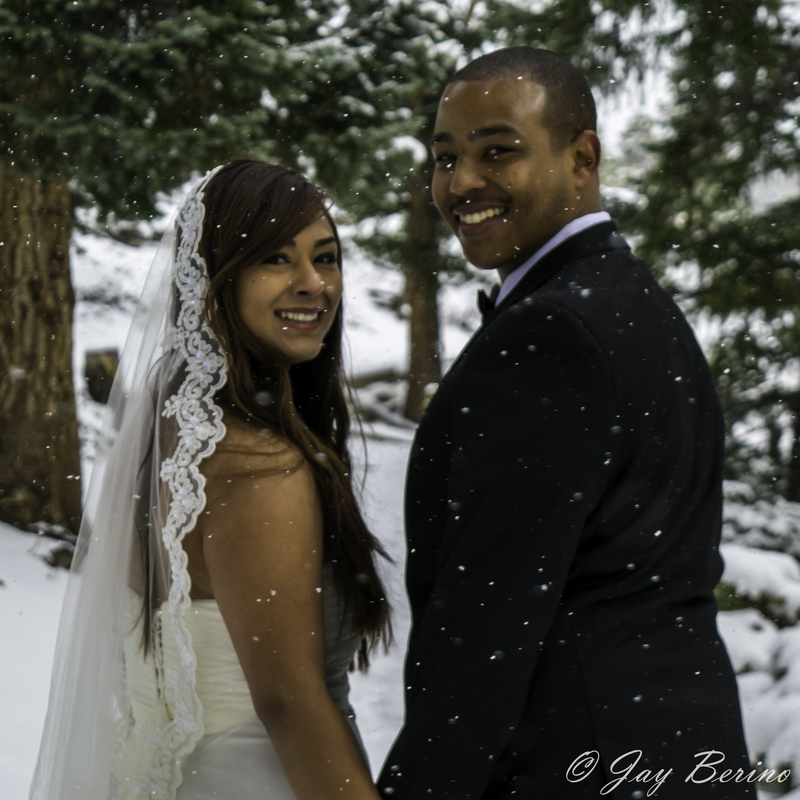 – Ria & Jay 1-17-15 from Singapore! 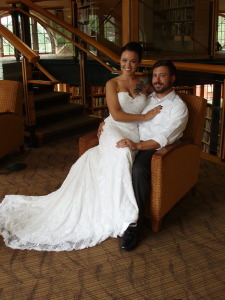 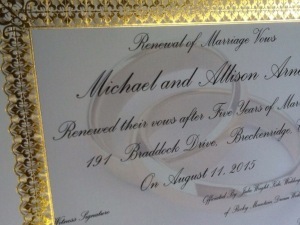 We cannot begin to thank you for all that you did at our wedding! 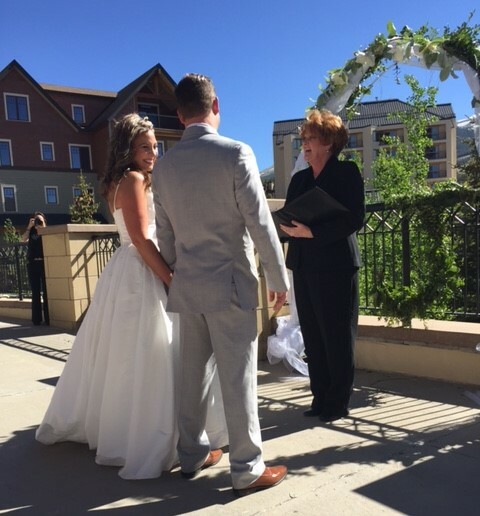 You helped make our day absolutely perfect! 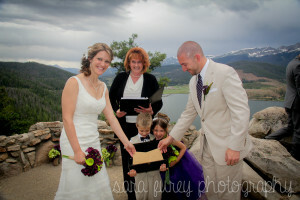 Not only were you organized and detailed but you were so much fun! I can’t imagine having anyone else marry us. We loved having both you and your husband at the wedding and I hope we can stay in touch. Attached are a couple photos but I will send more when I can. 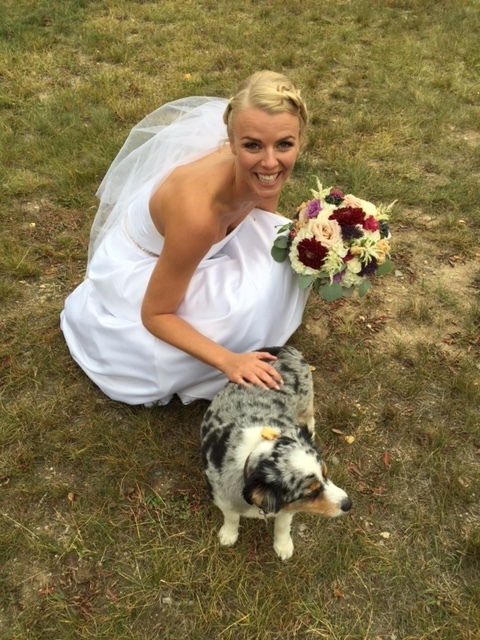 “Julie Wright-Kile was amazing! 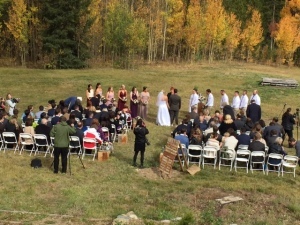 Our wedding was held in Julie’s backyard and everything was perfect. I was able to text, call, or email her whenever I had a question or concern. I also don’t live in Breckenridge so she helped me find a makeup artist and a photographer. 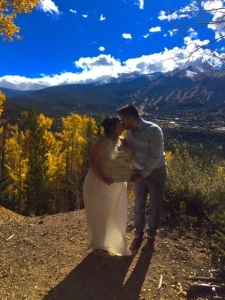 Everything fell into place and I couldn’t be happier! 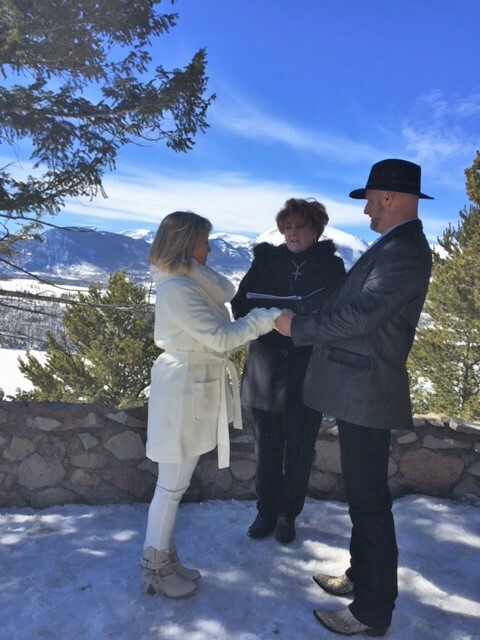 Nobby & I want to thank you for doing such a fantastic job officiating our wedding ceremony. 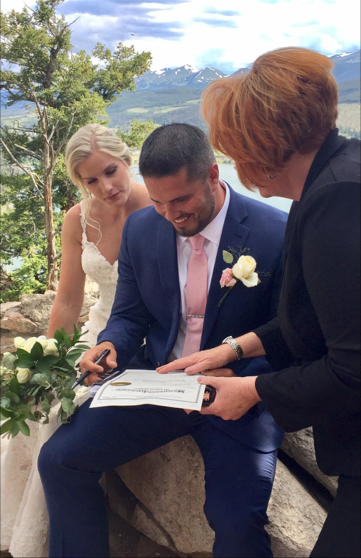 It was lovely and we could not have chosen a better, professional, kind person to have helped make our day stress free and memorable. You answered all of our questions and gave great advice to us. 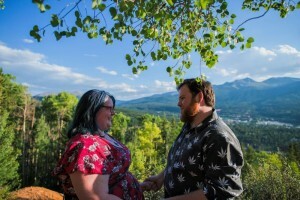 We both feel like we have known you for years. 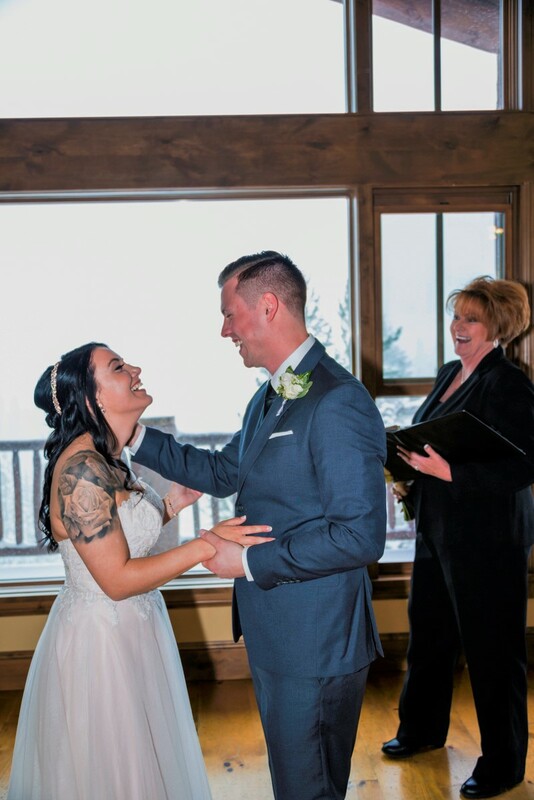 Our Wedding was exactly how we wanted it. 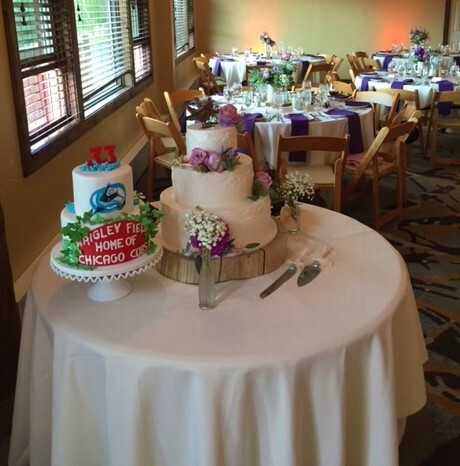 We will highly recommend you to anyone! 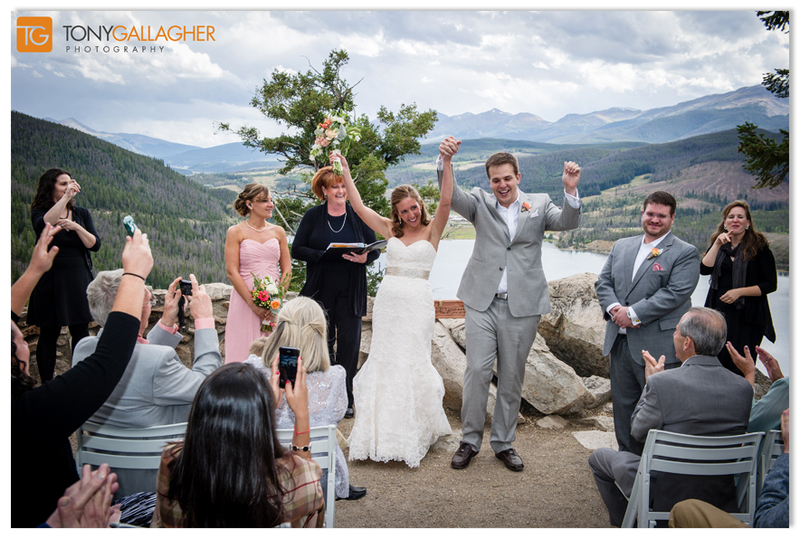 “Julie made the whole process easy and fun. 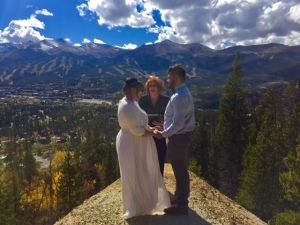 We spoke over the phone and then she sent me an email with a “Personal Love History” questionnaire and asked details of what I wanted for the ceremony. 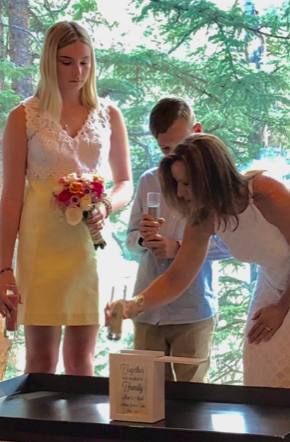 We had a Buddhist ceremony, so quite specific, but Julie researched what we wanted and really took the time to listen to what I wanted and how we wanted the ceremony to run.